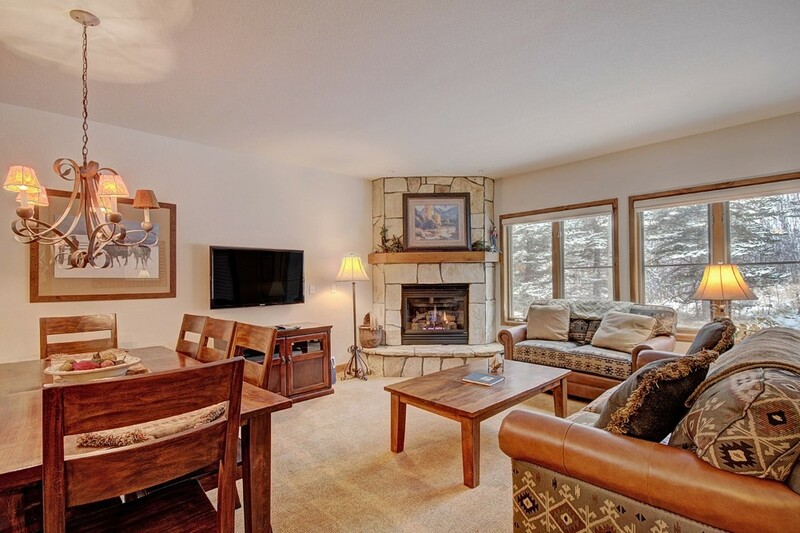 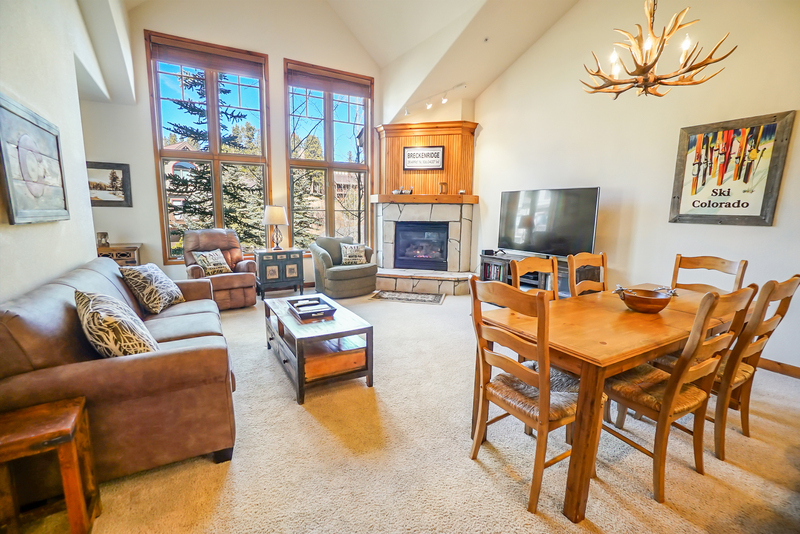 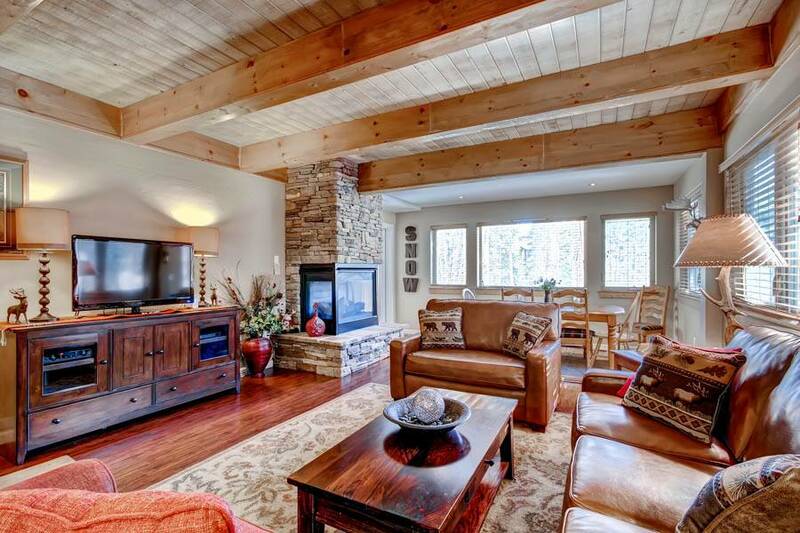 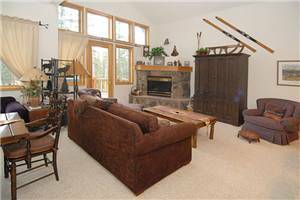 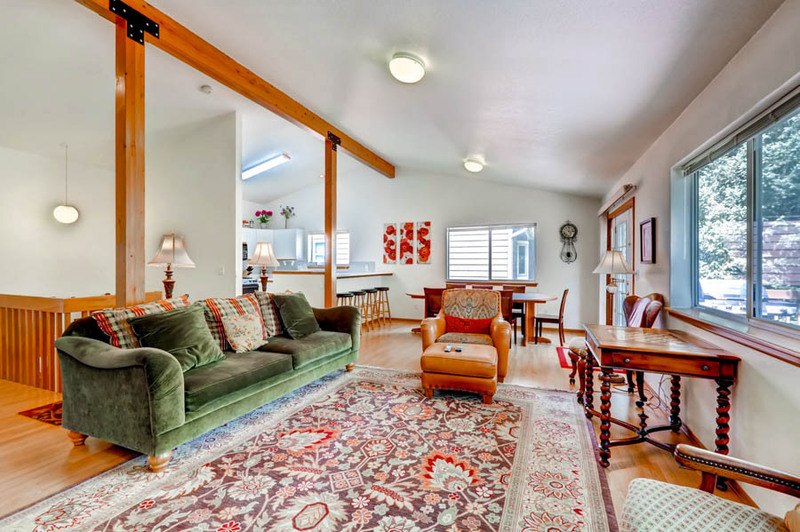 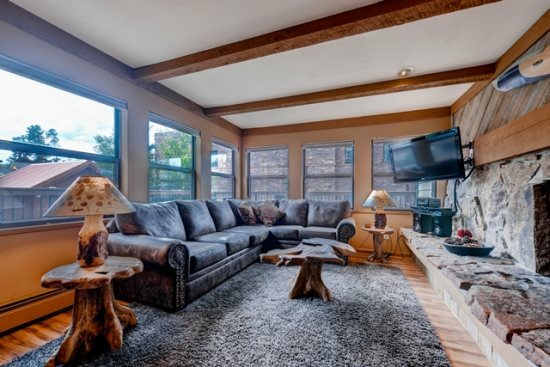 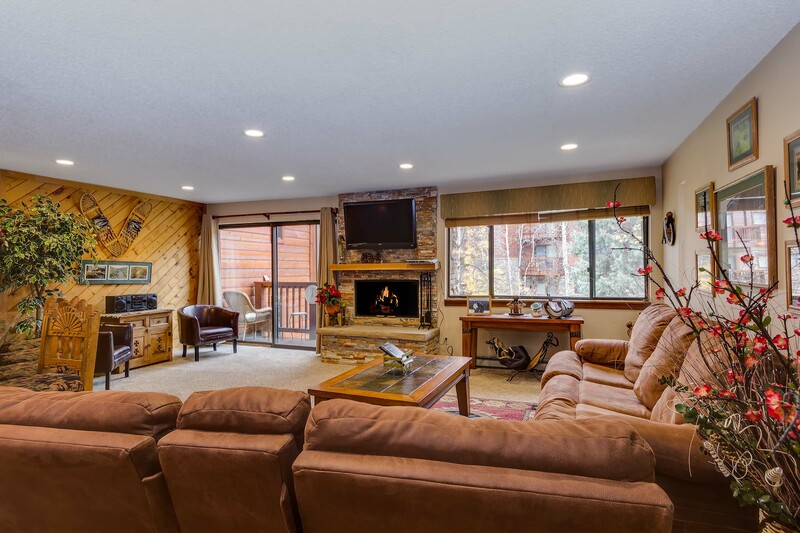 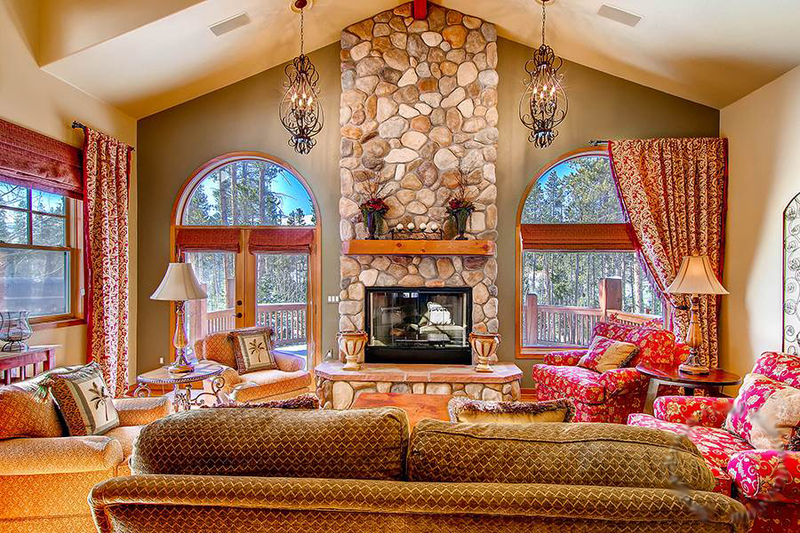 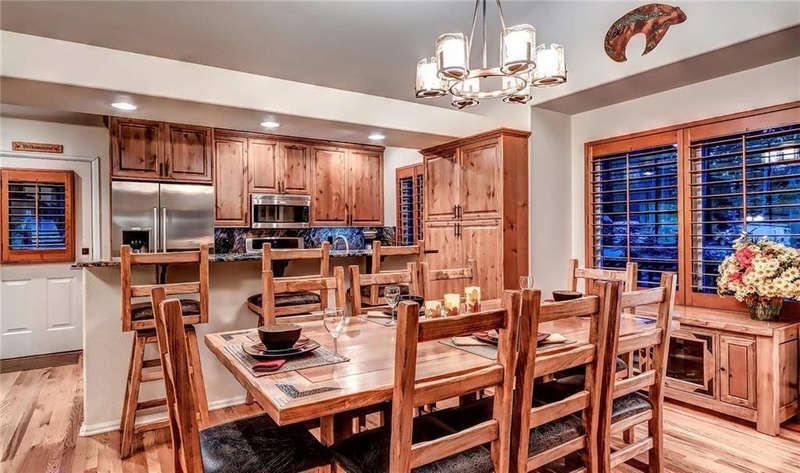 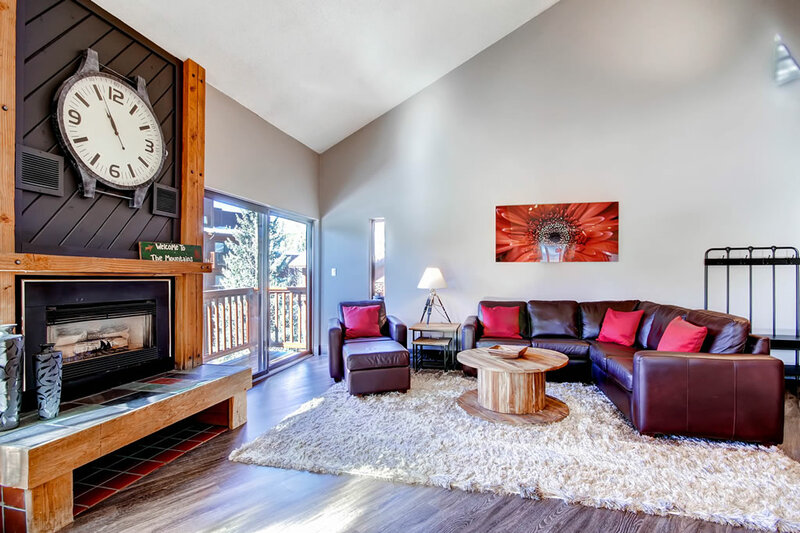 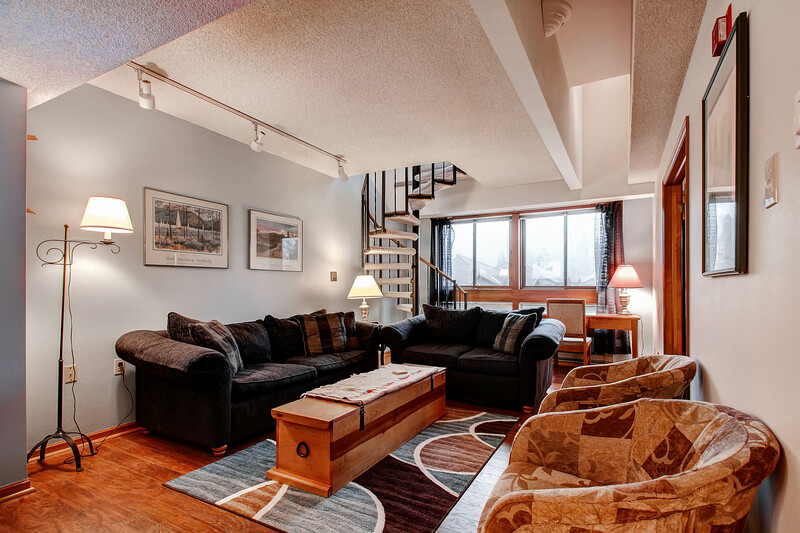 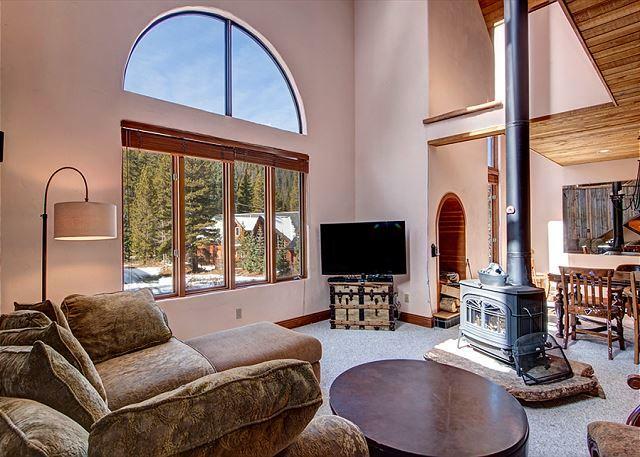 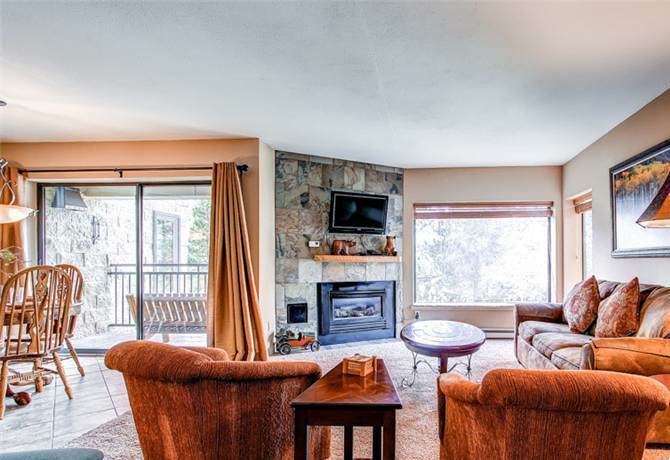 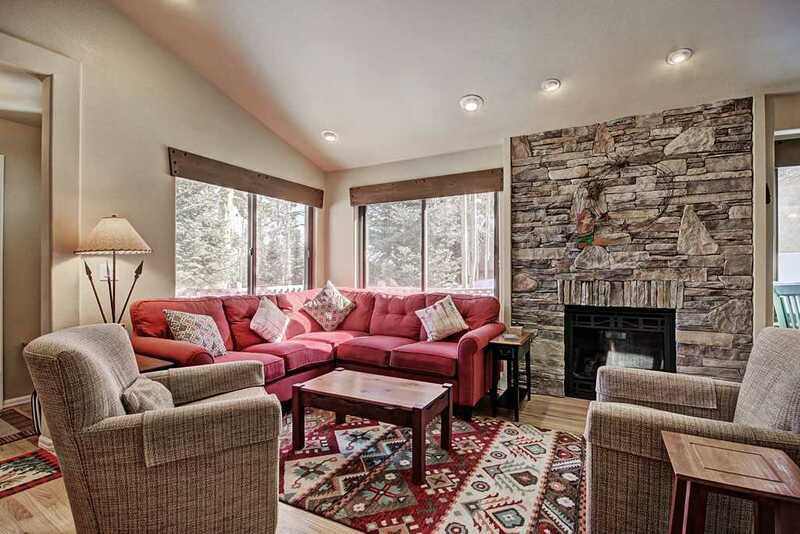 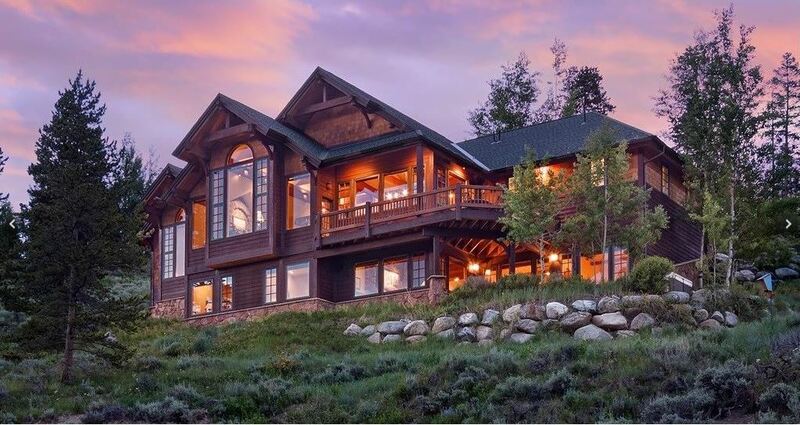 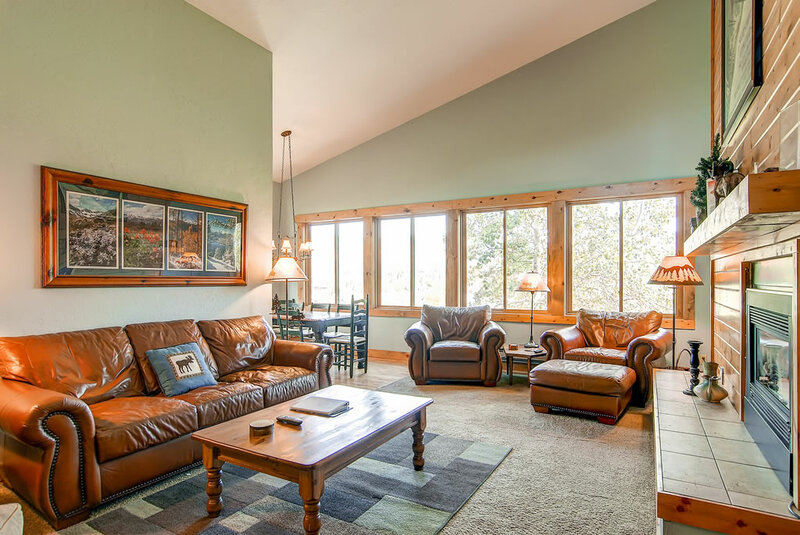 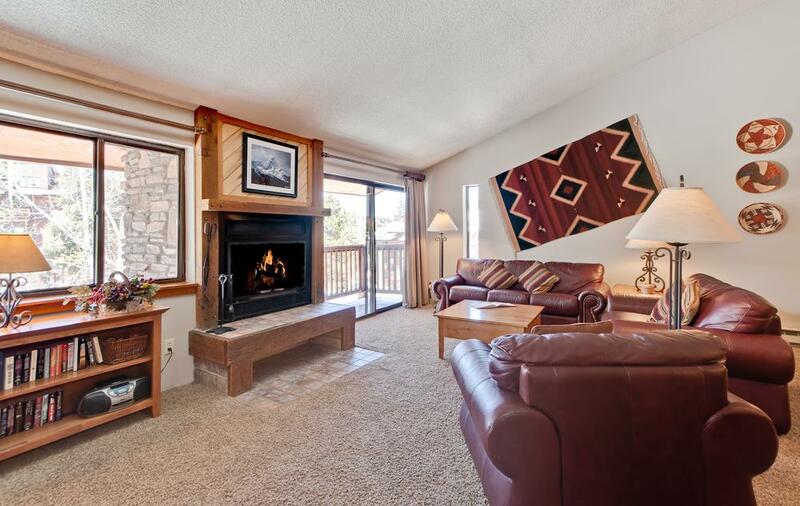 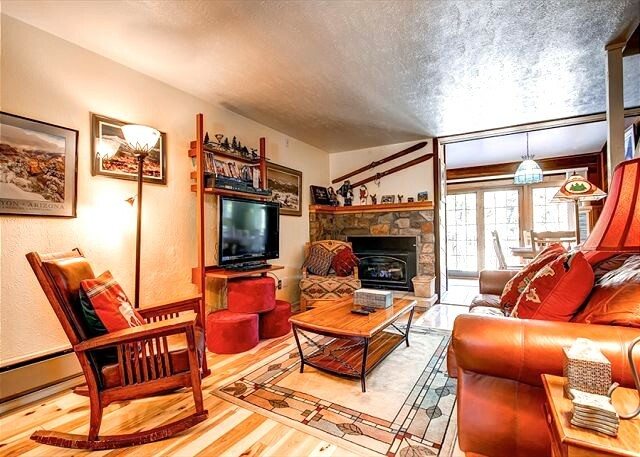 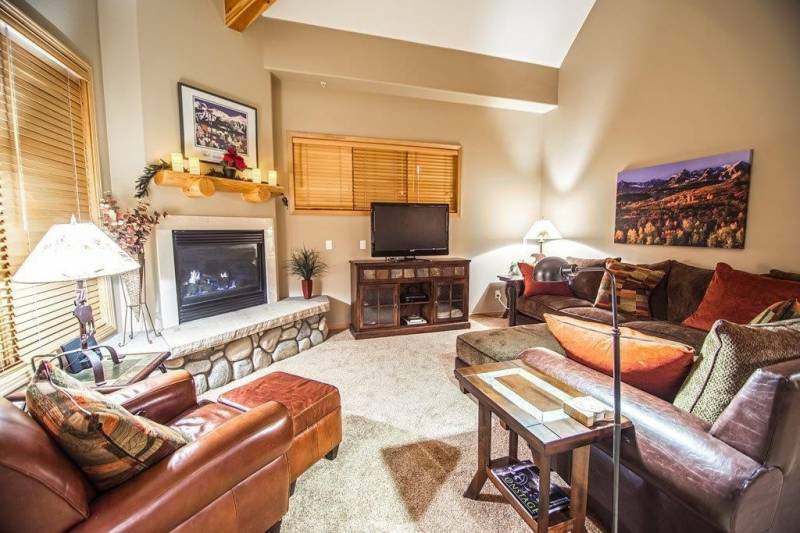 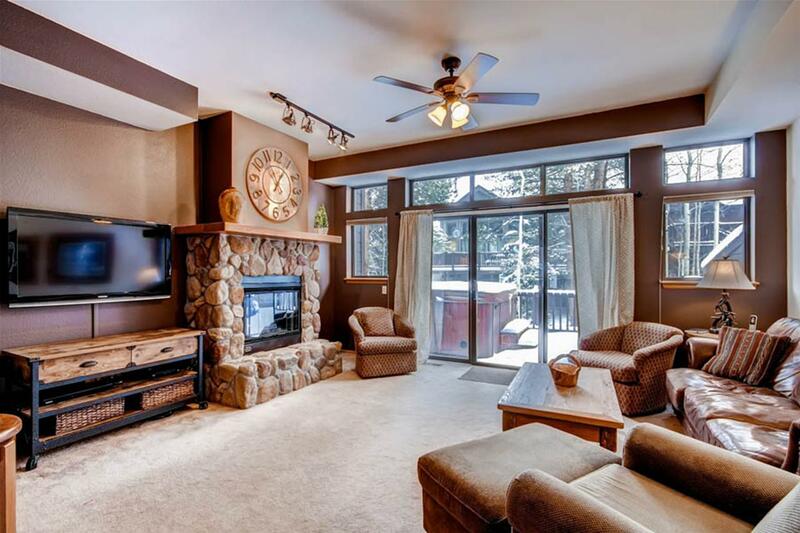 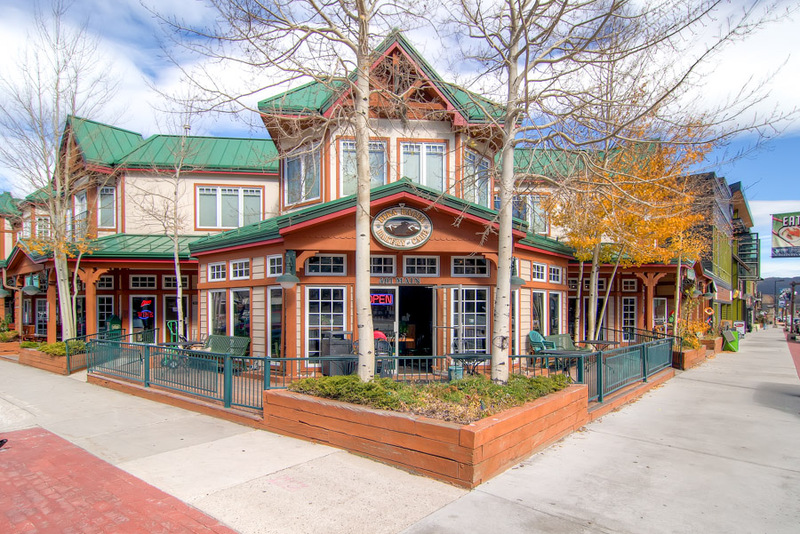 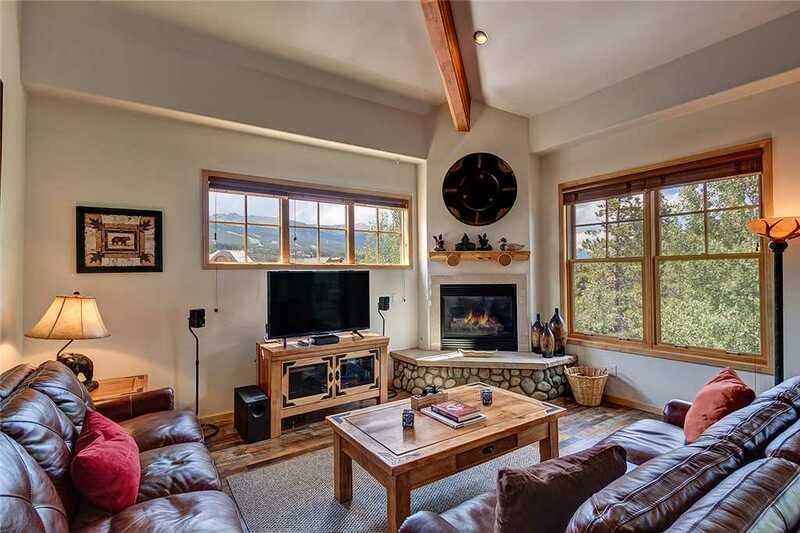 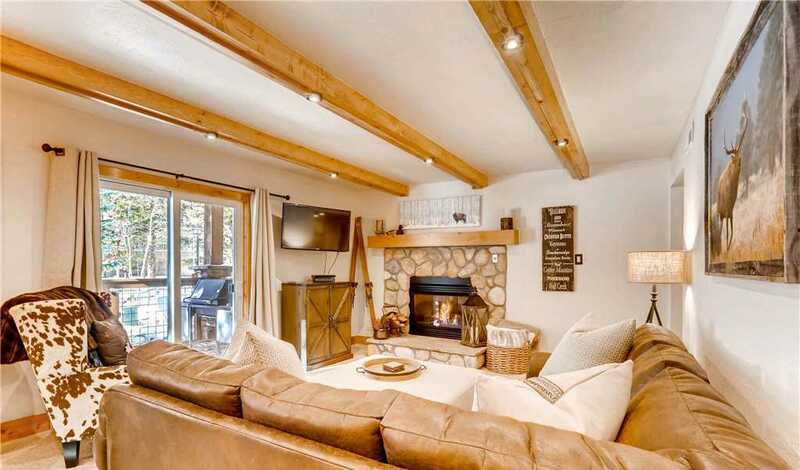 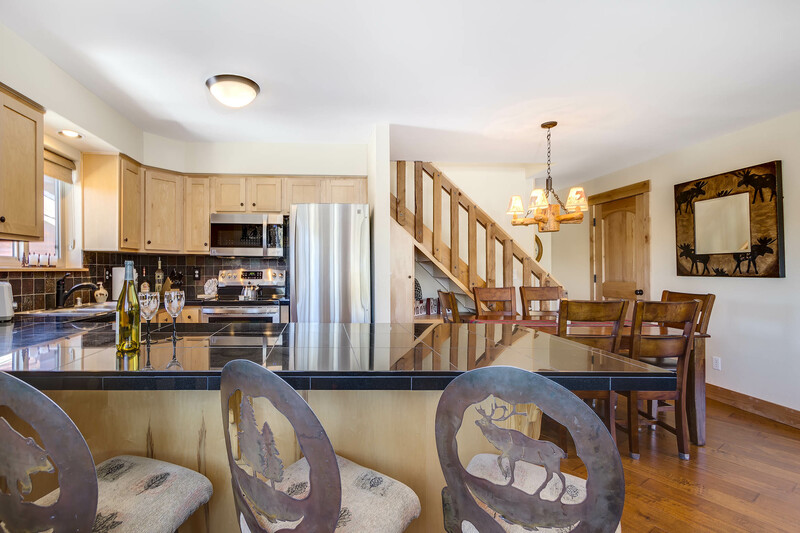 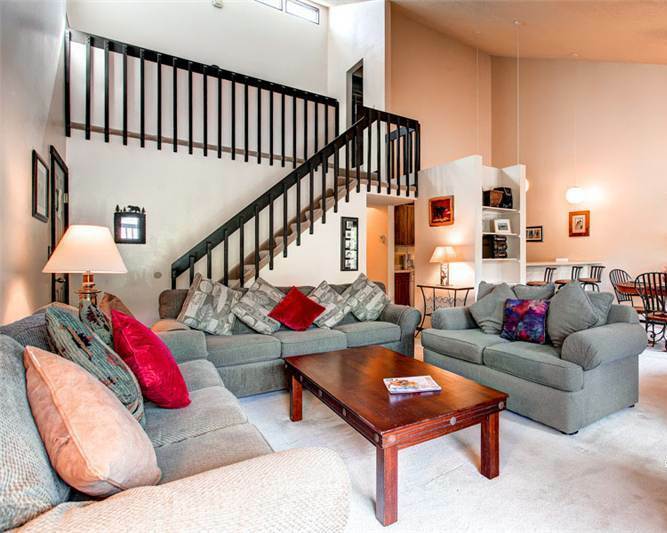 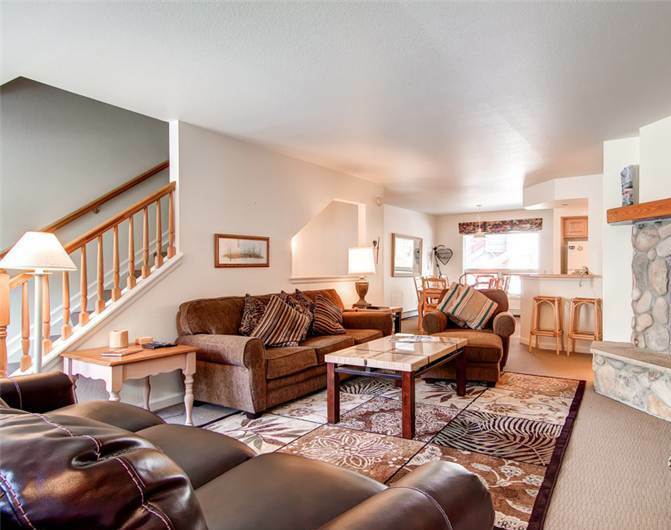 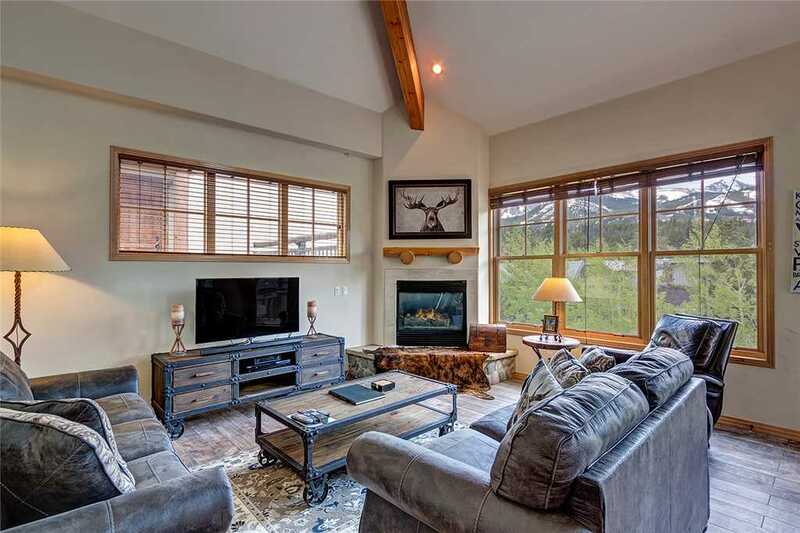 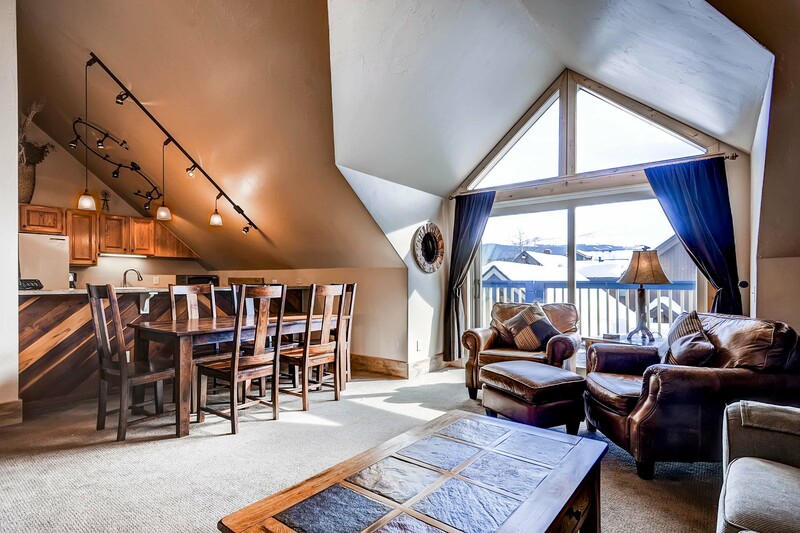 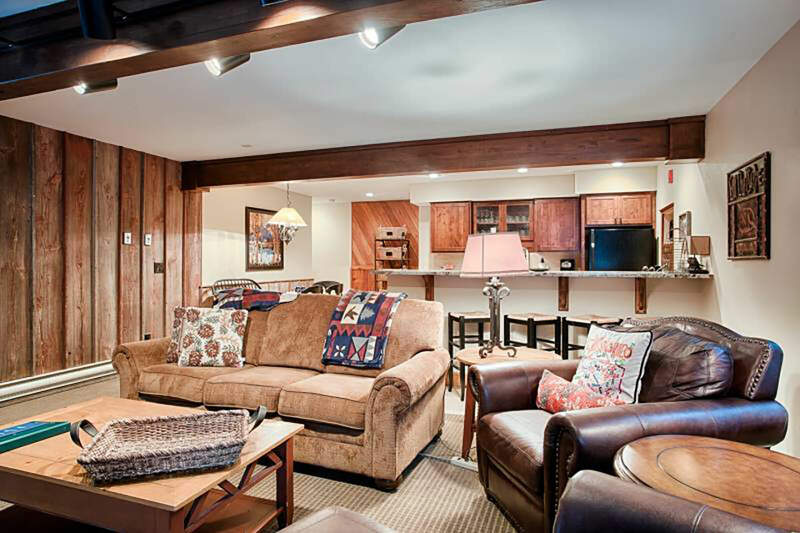 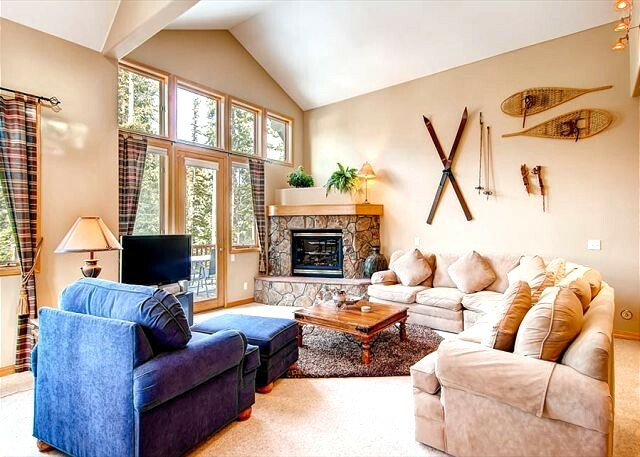 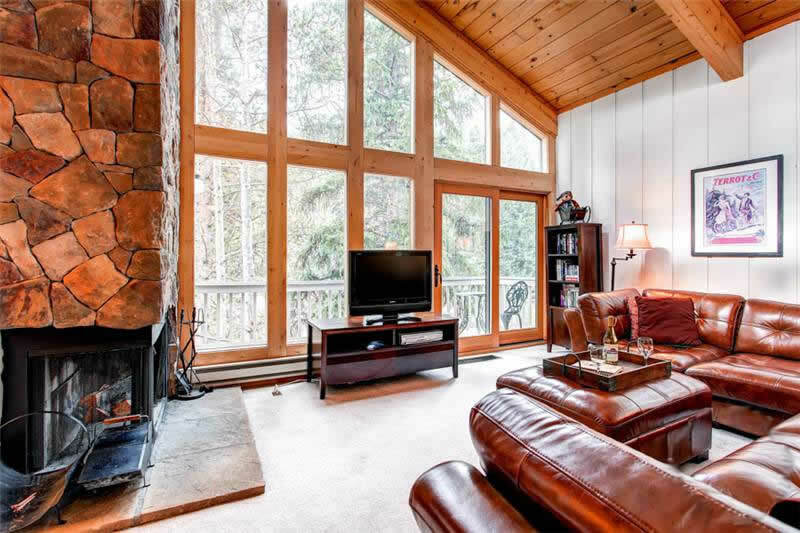 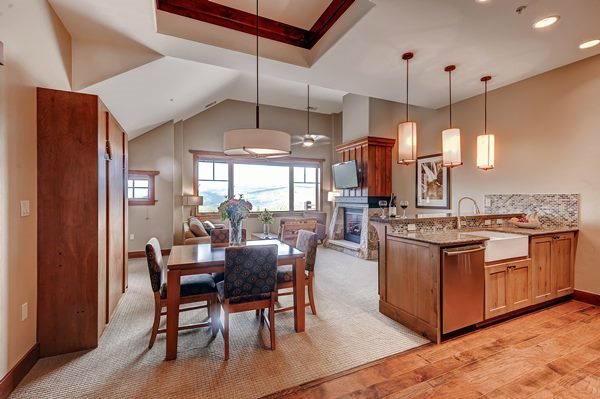 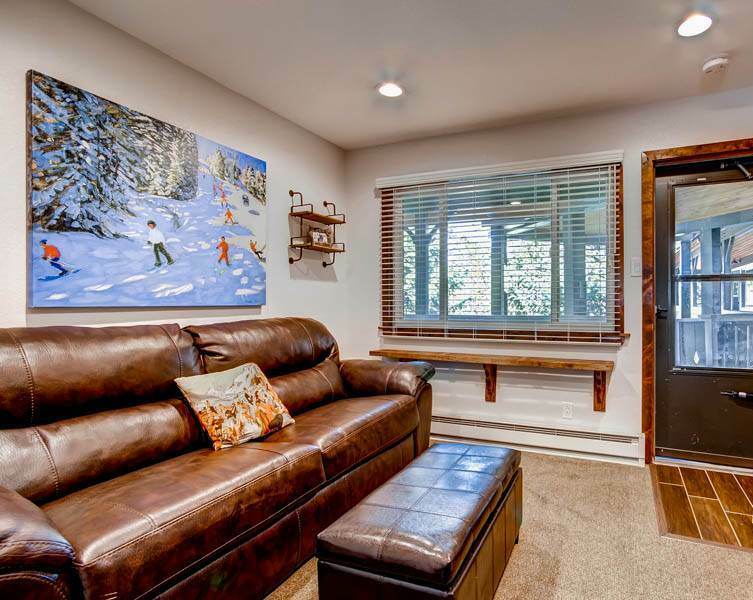 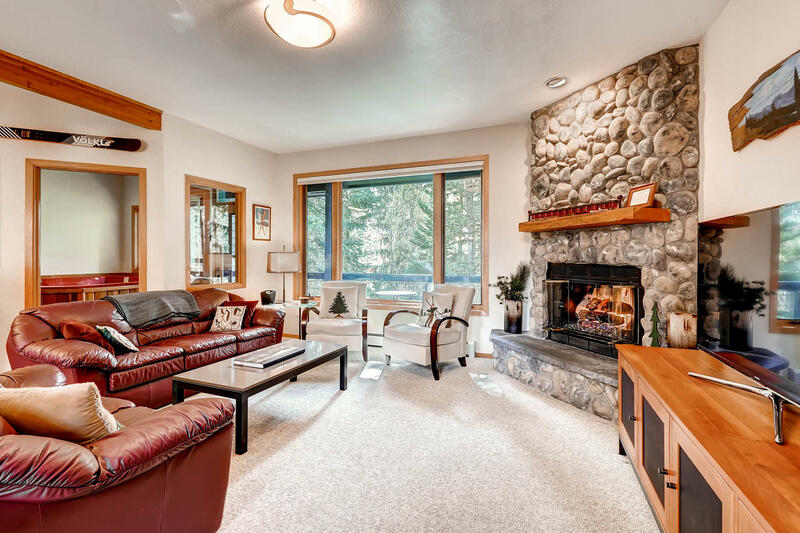 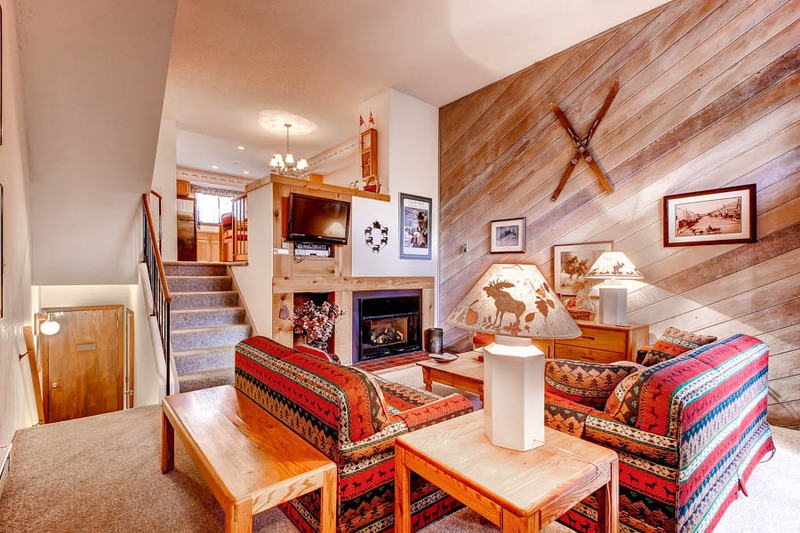 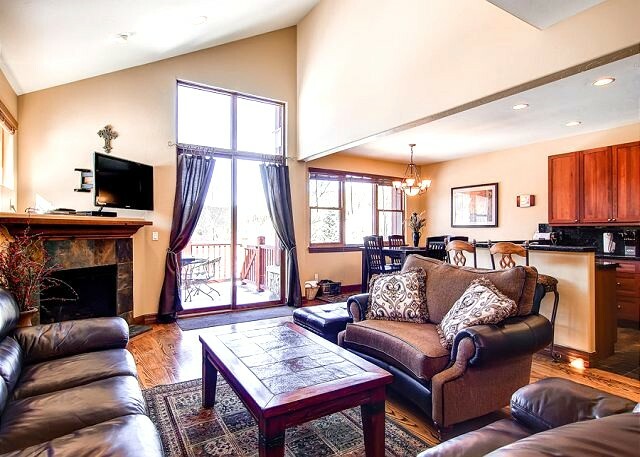 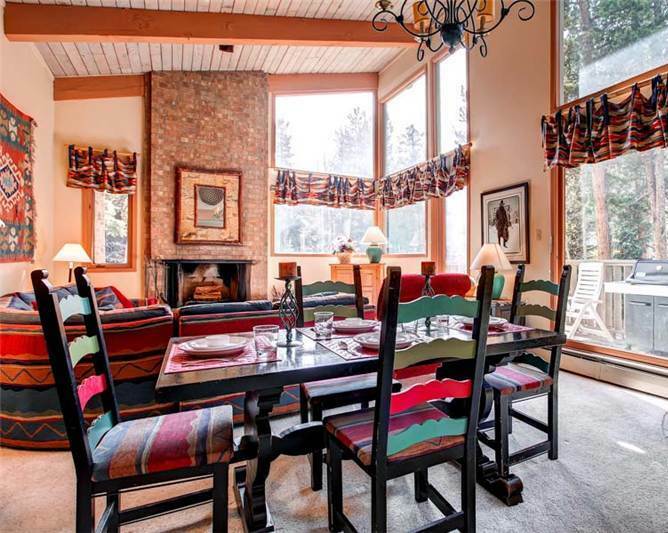 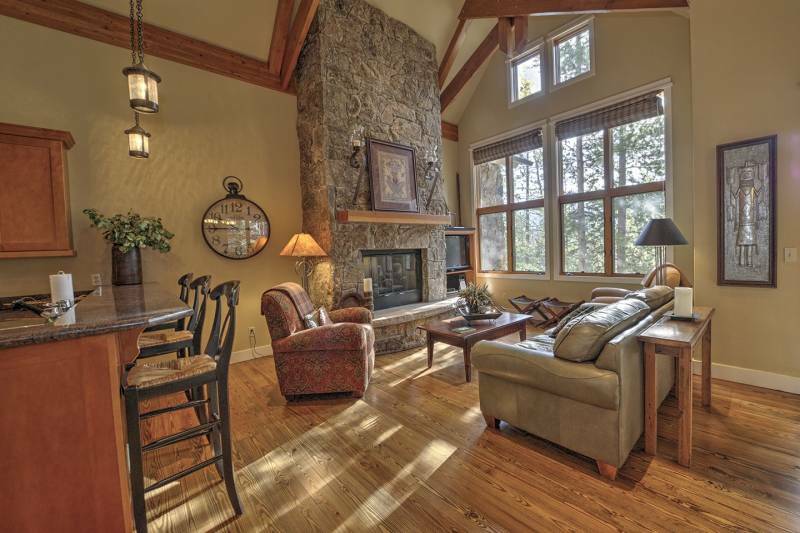 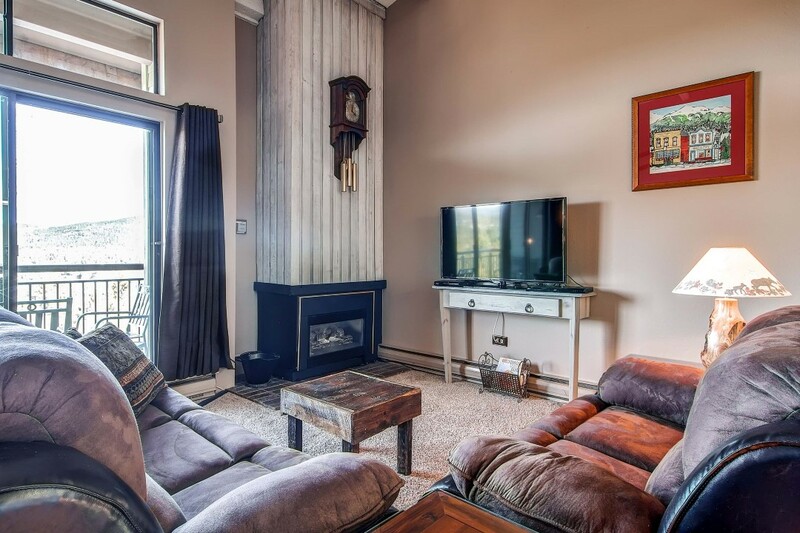 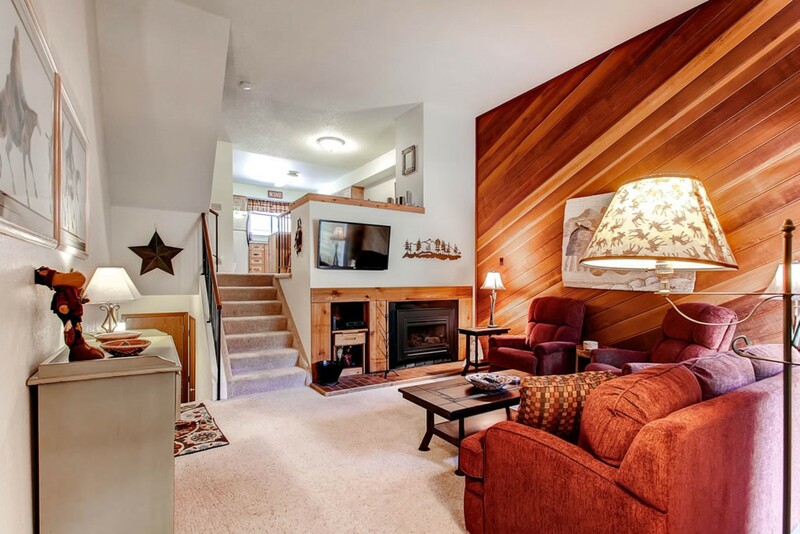 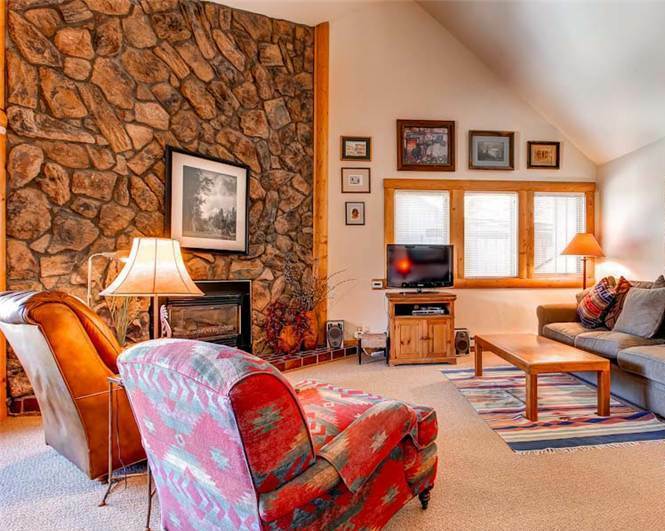 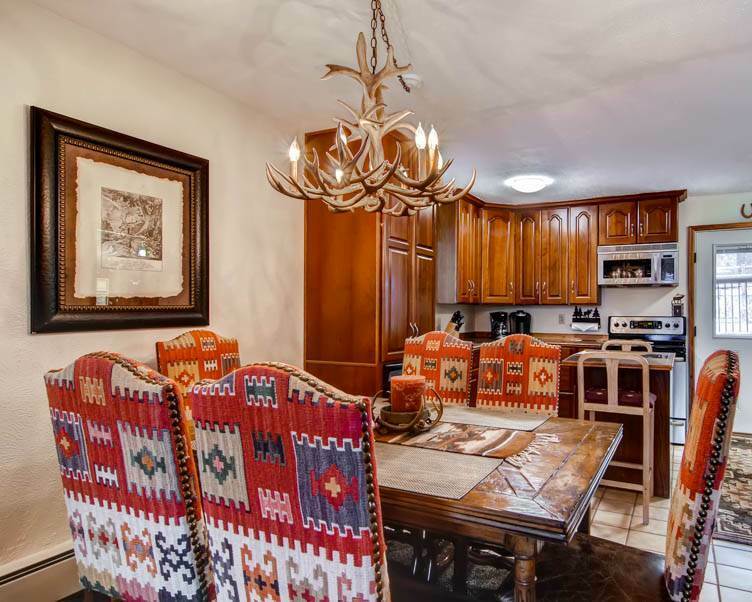 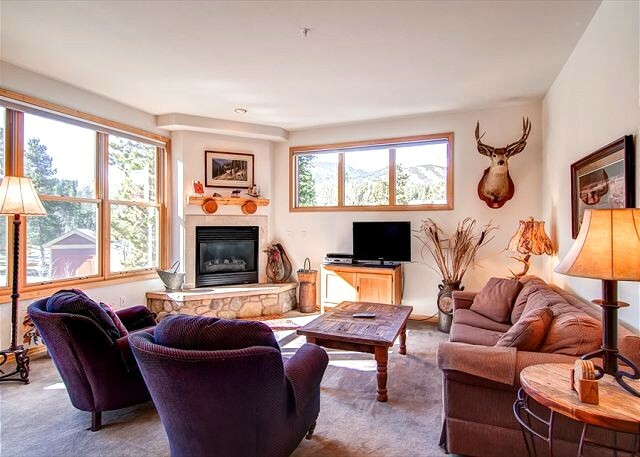 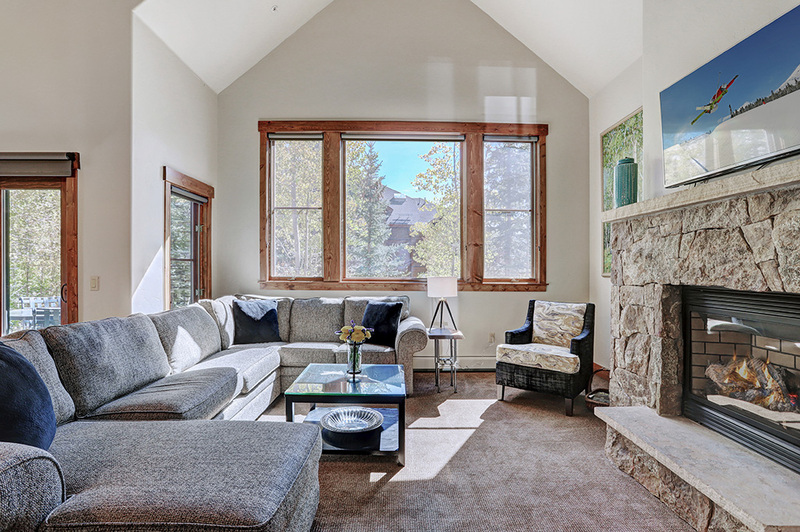 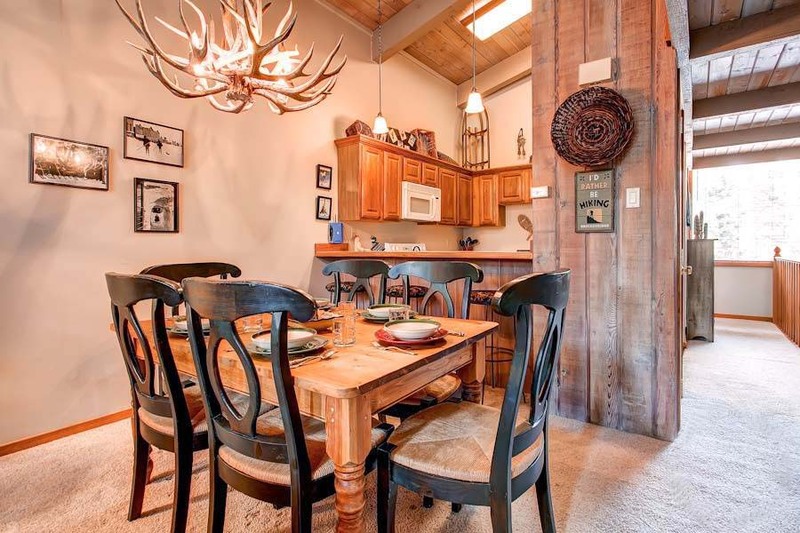 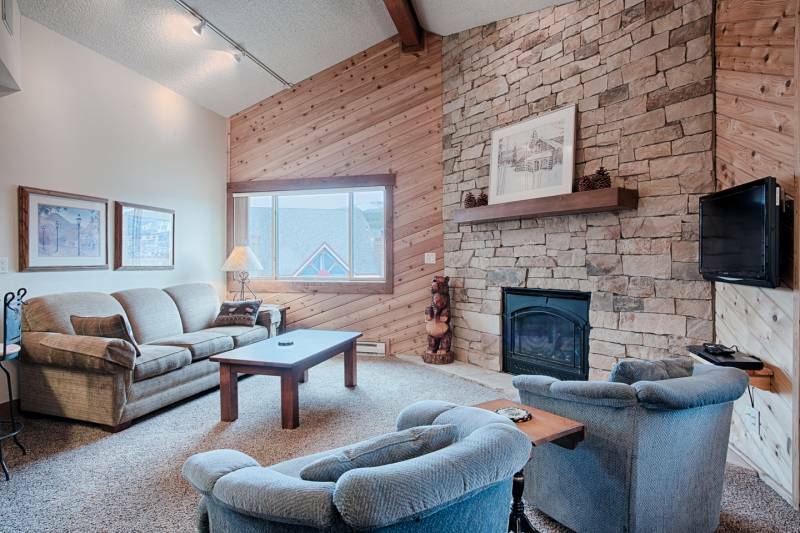 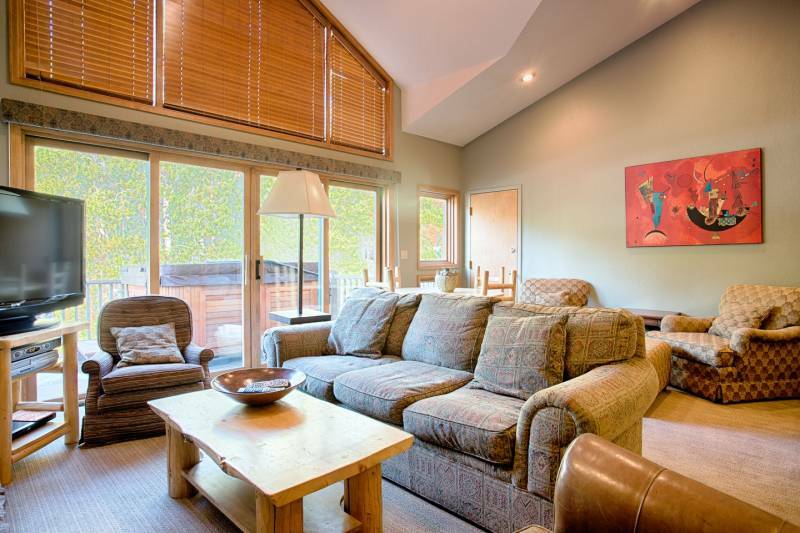 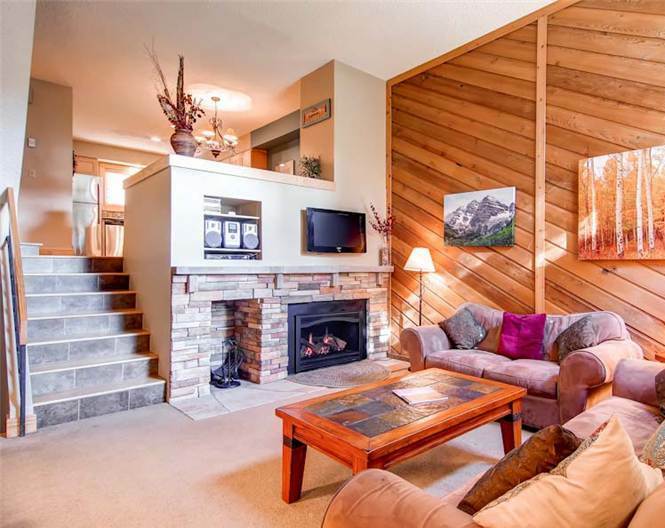 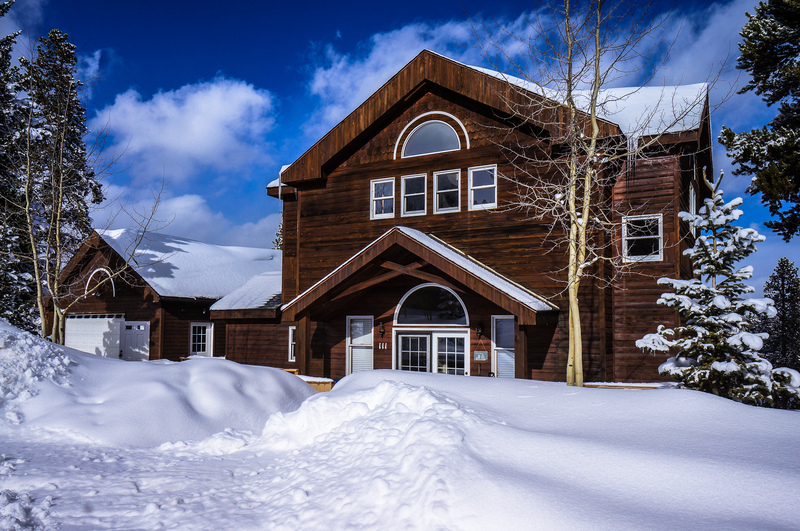 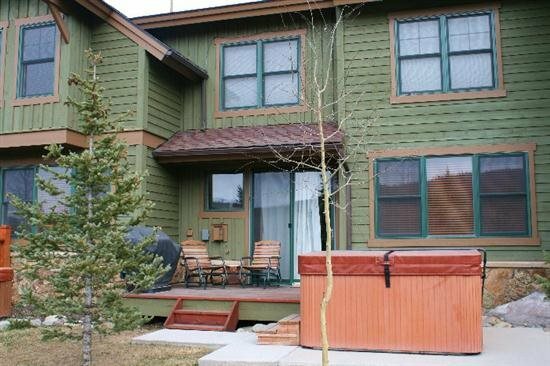 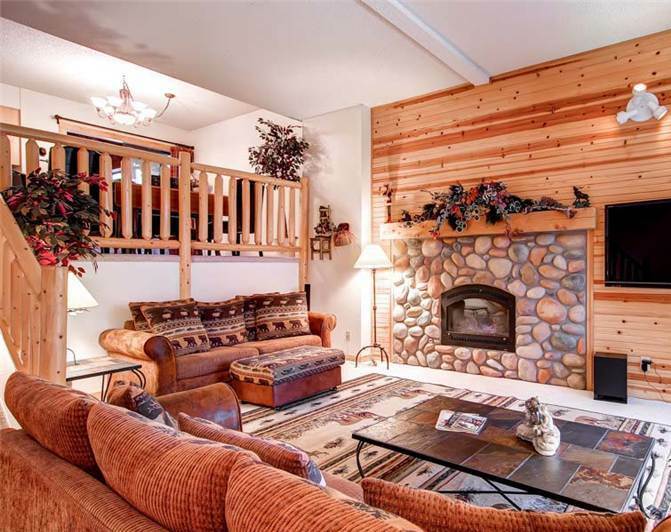 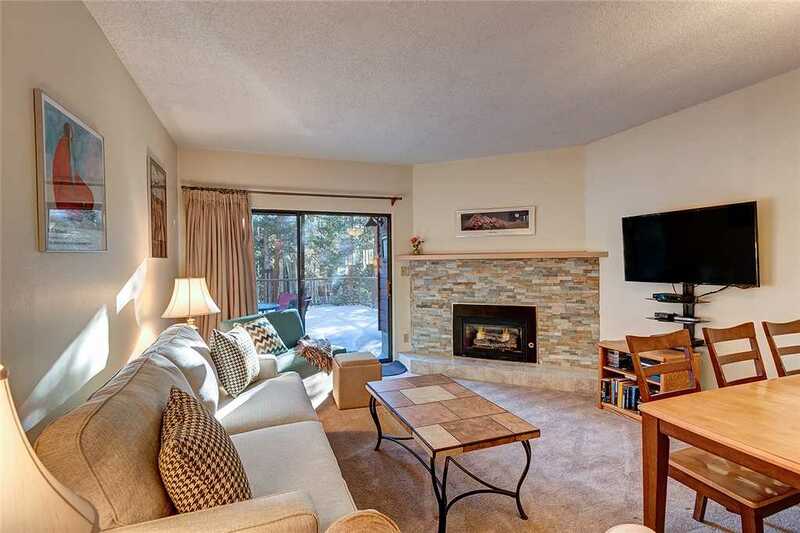 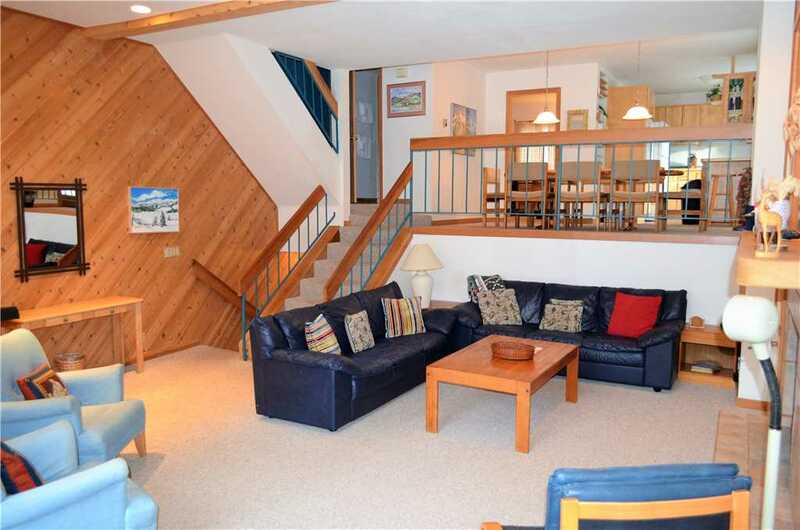 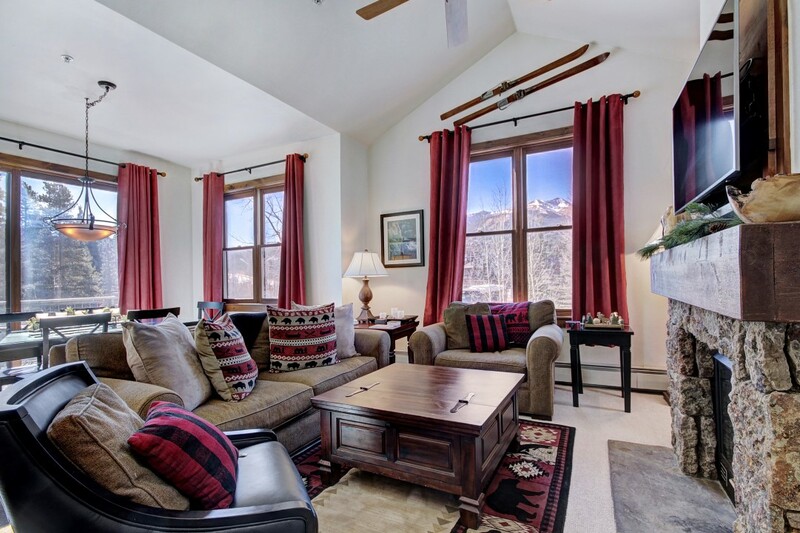 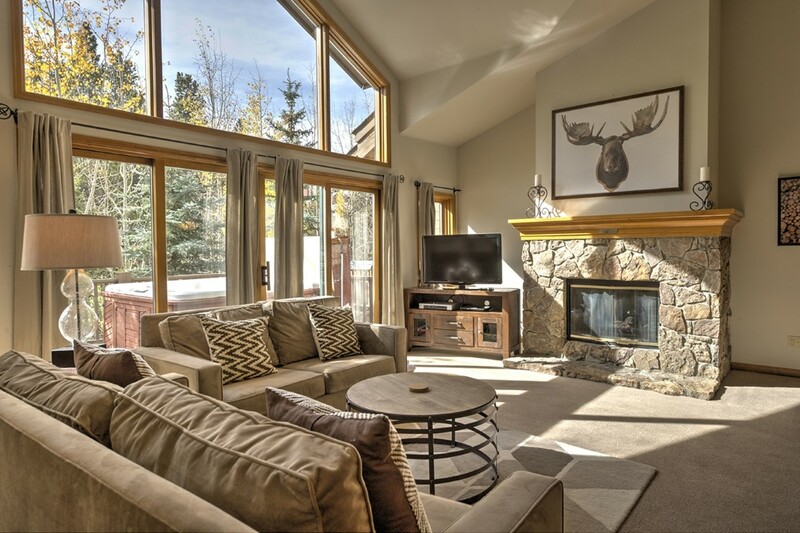 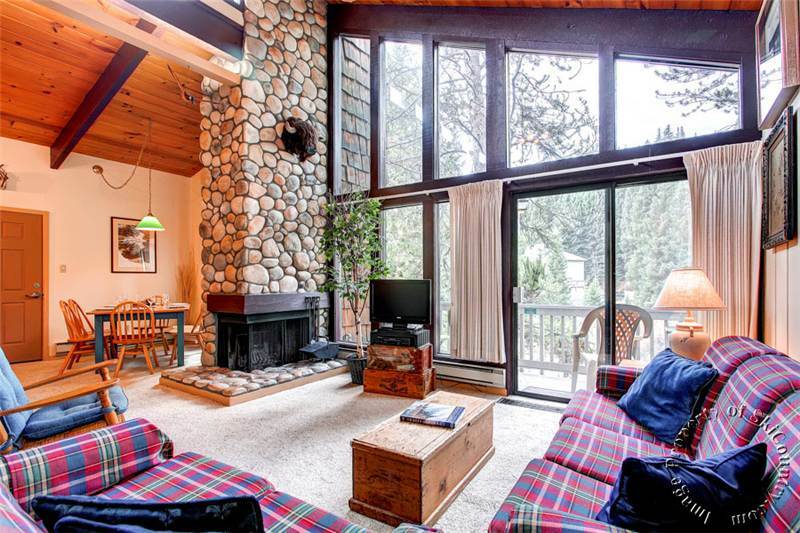 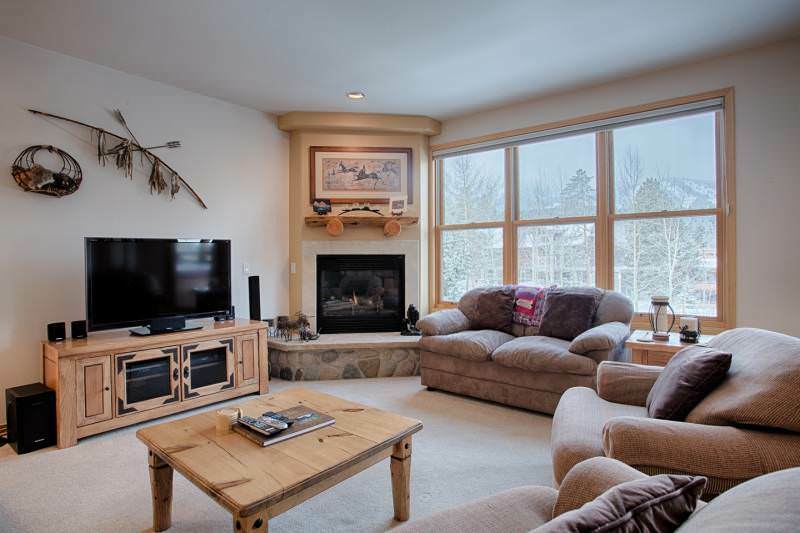 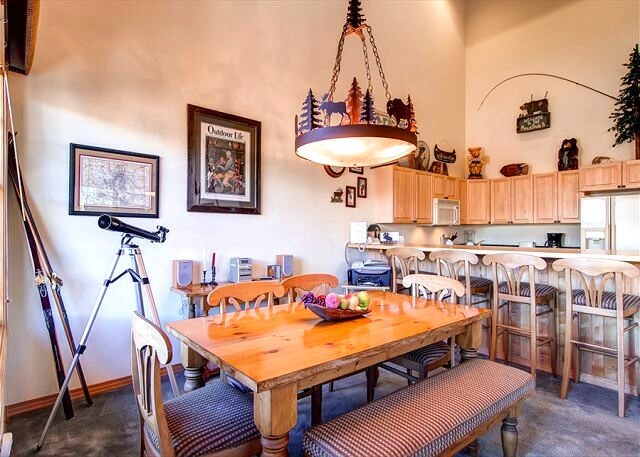 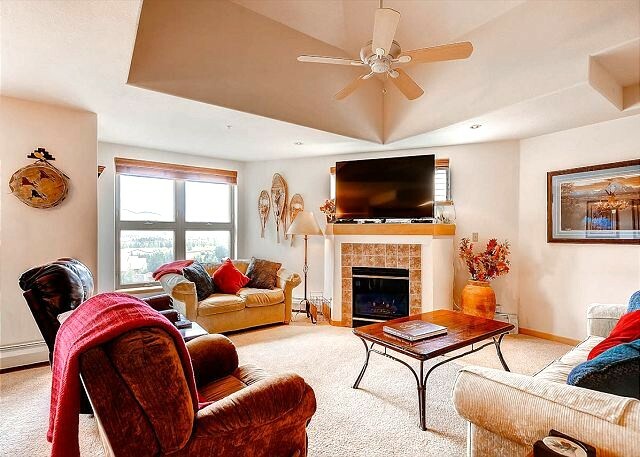 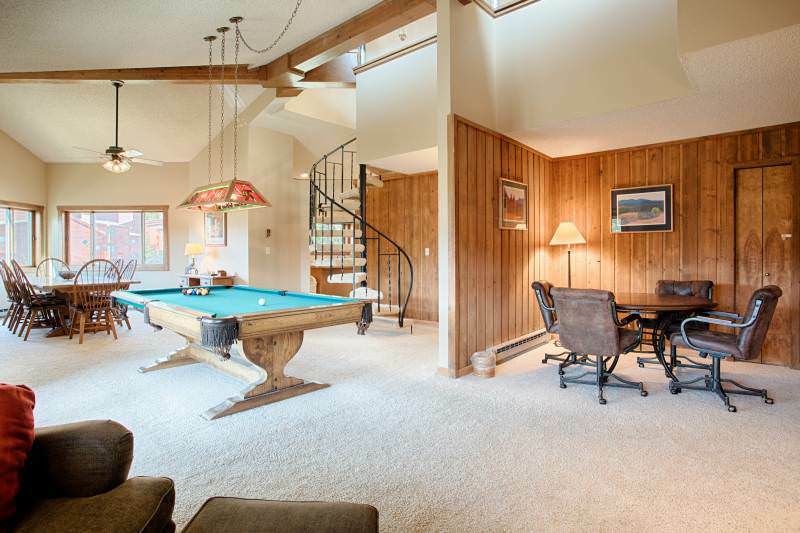 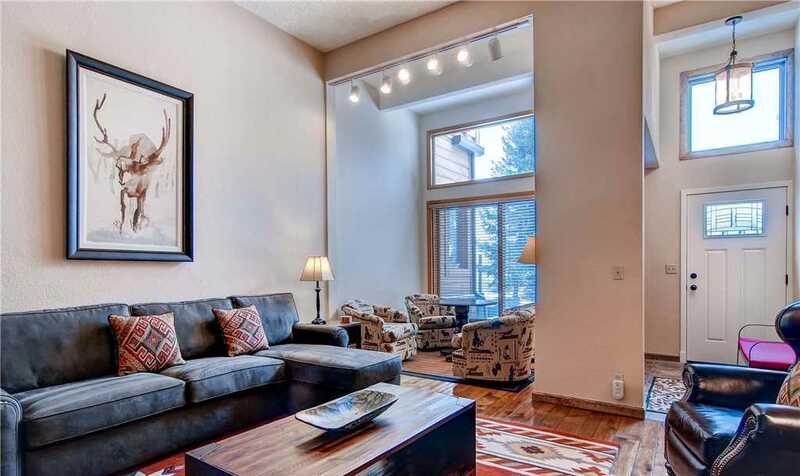 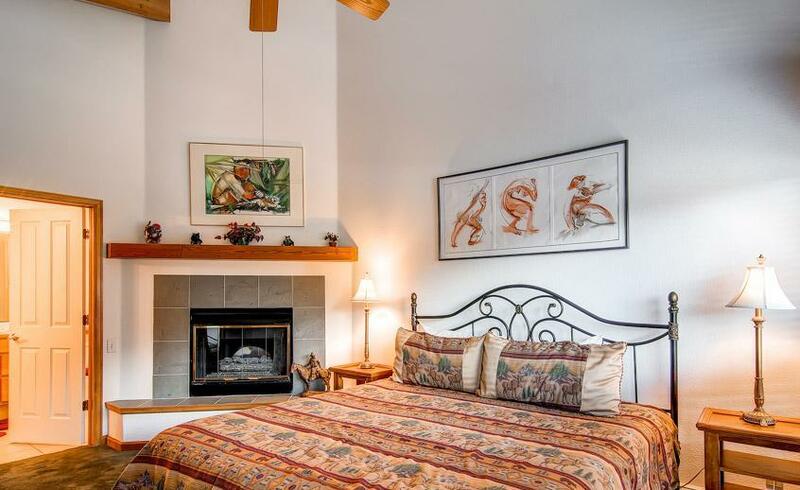 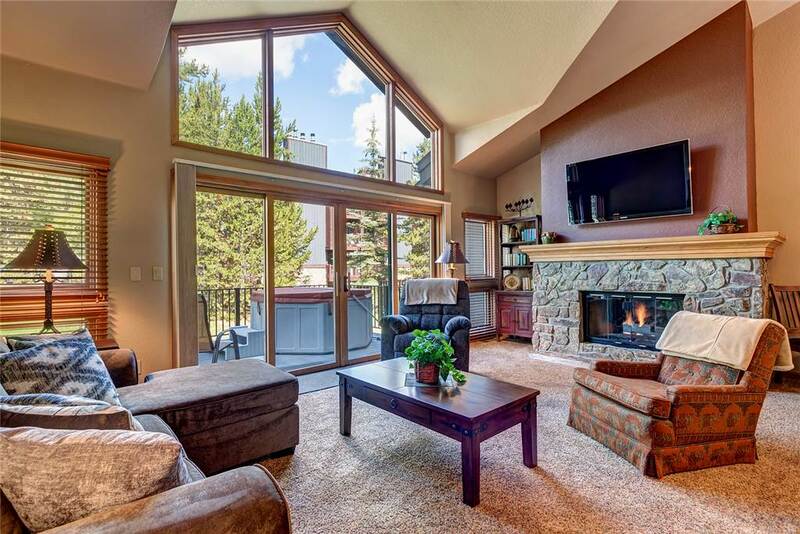 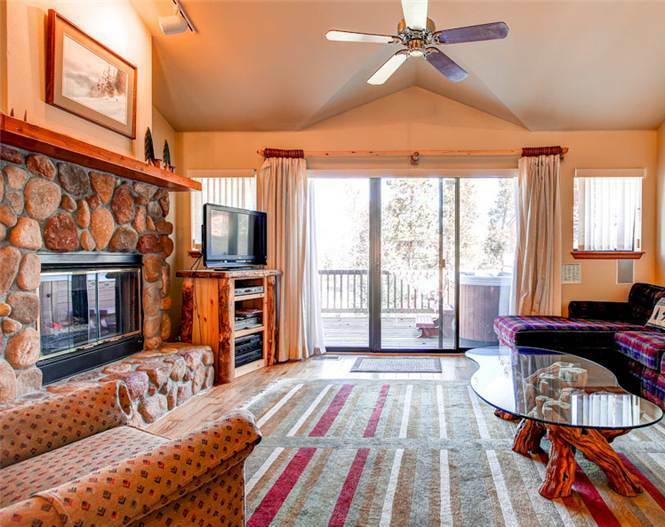 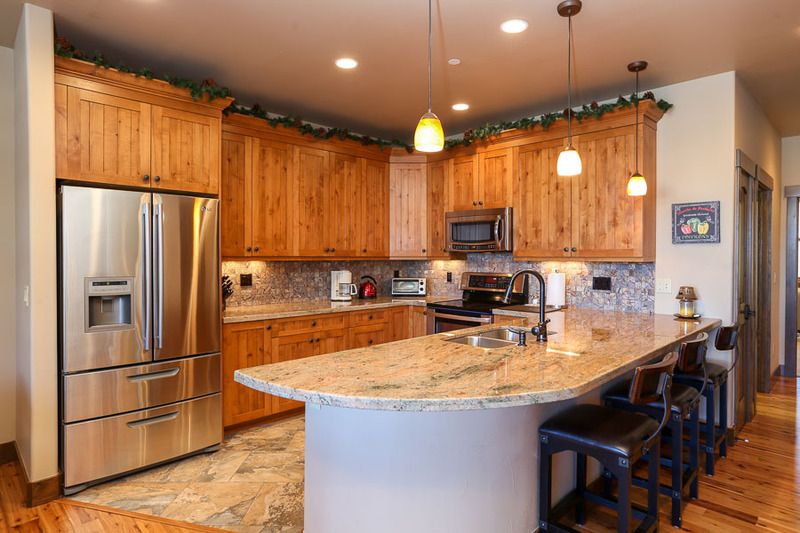 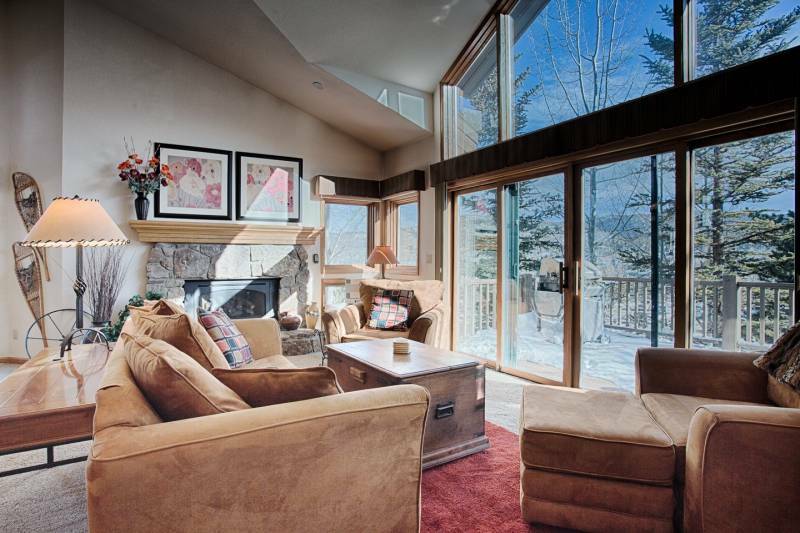 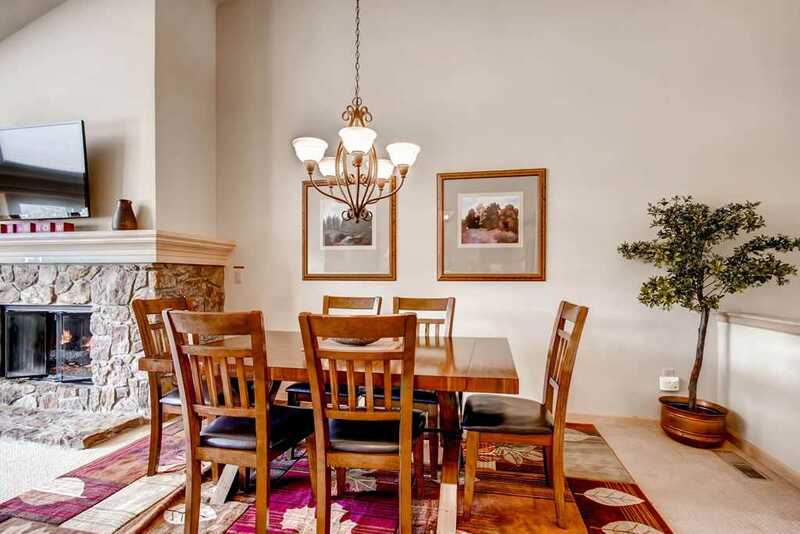 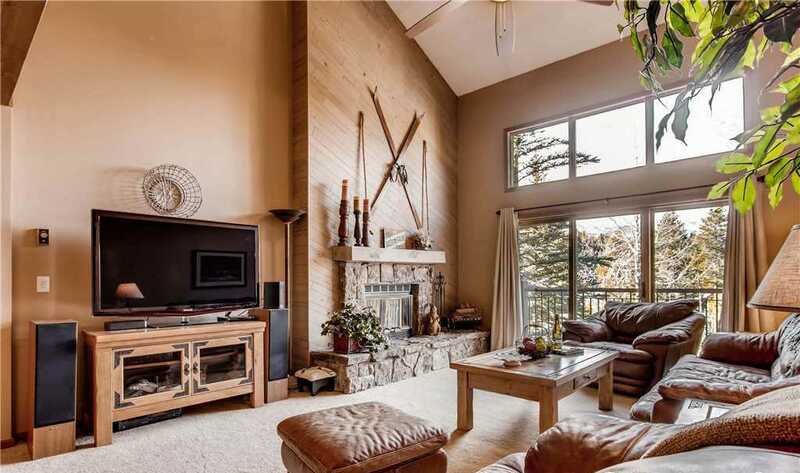 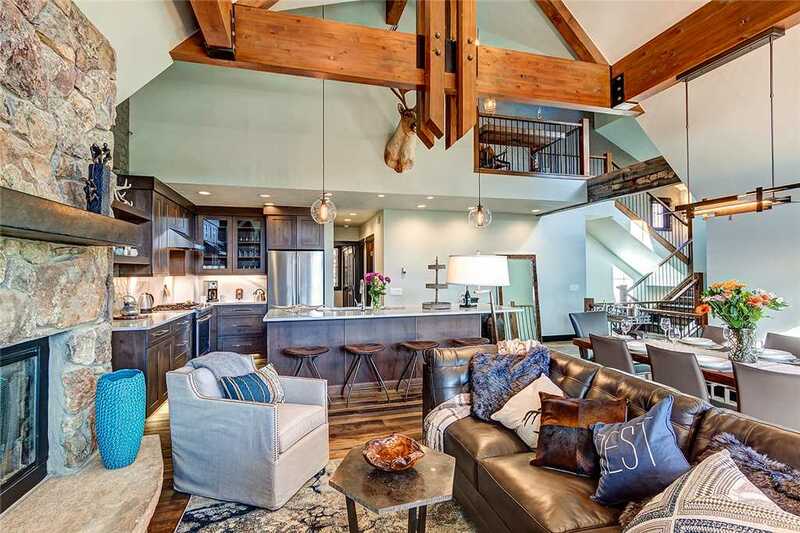 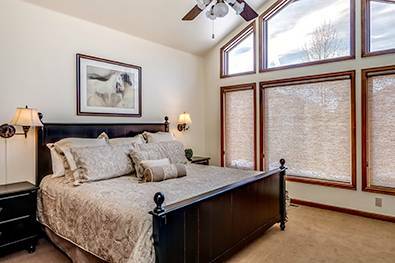 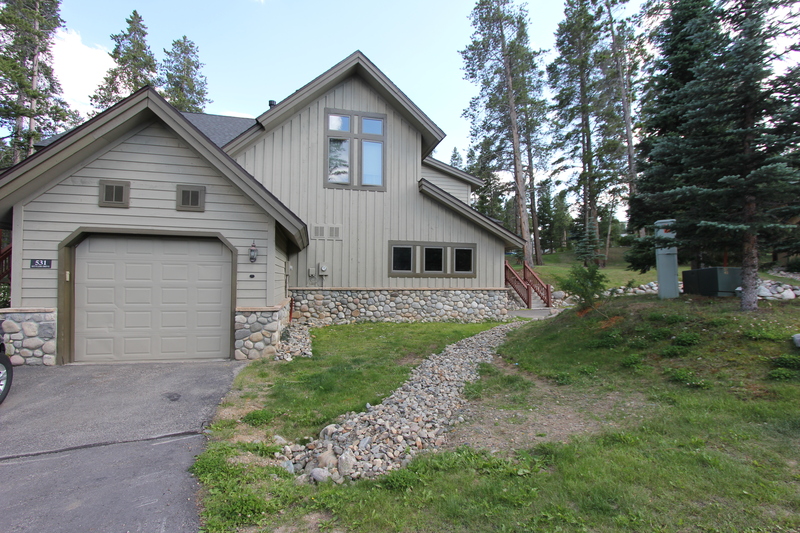 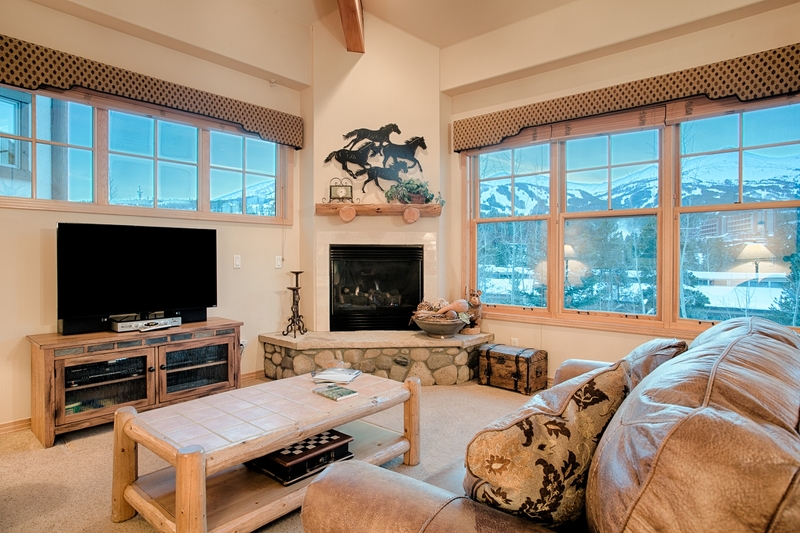 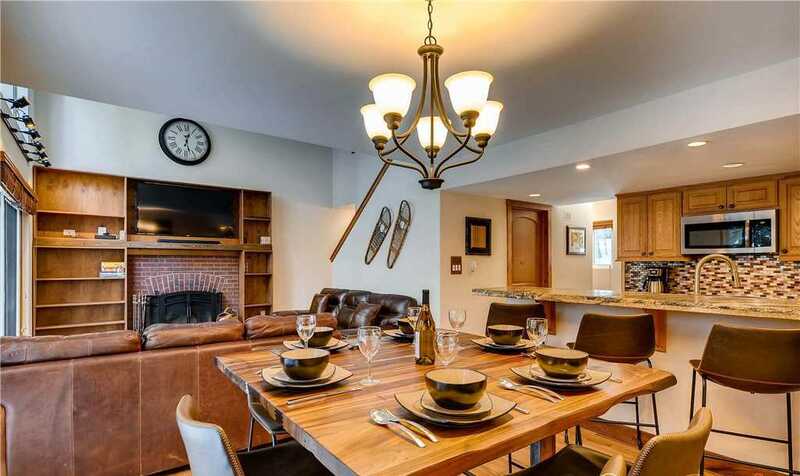 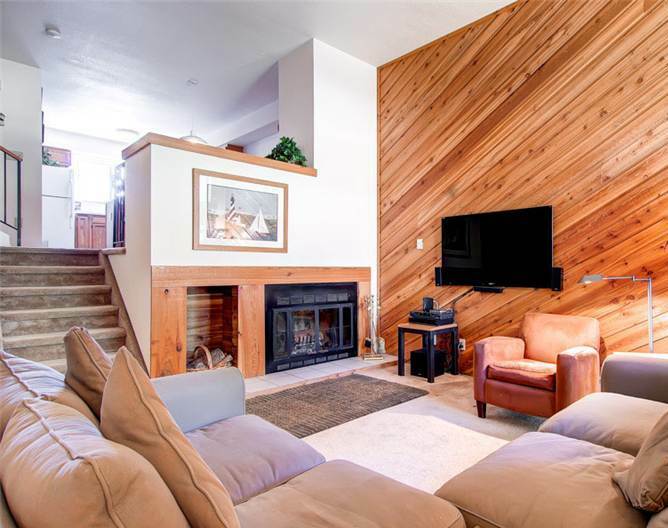 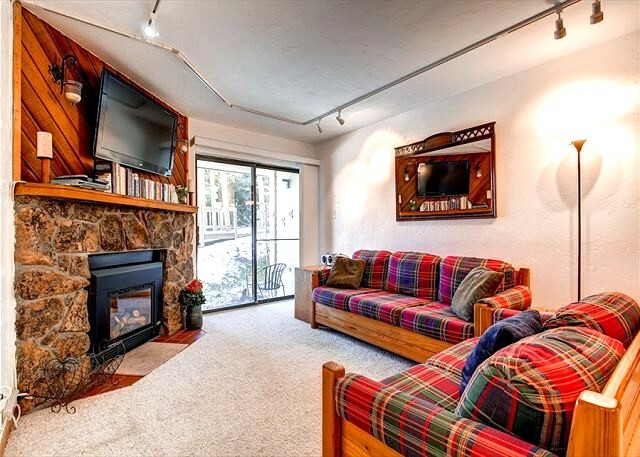 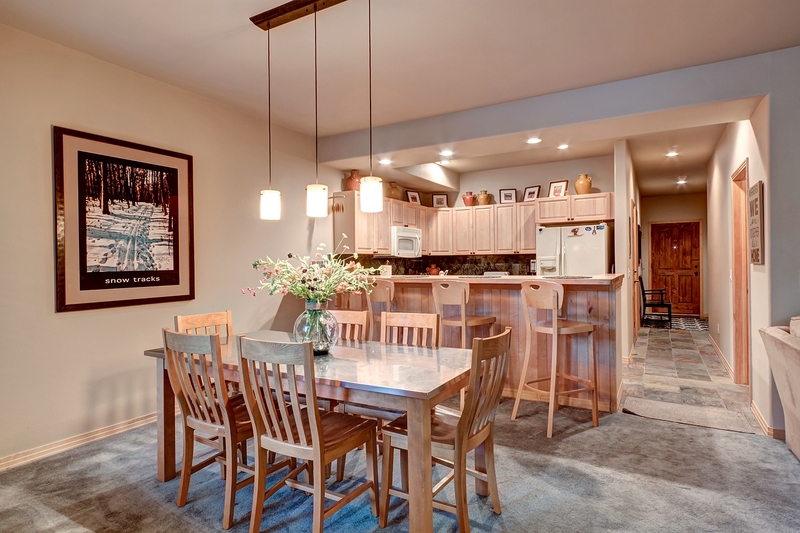 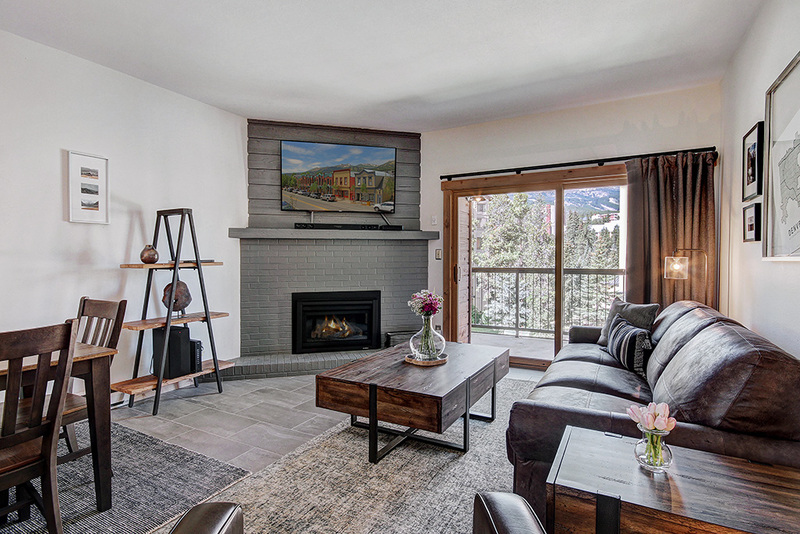 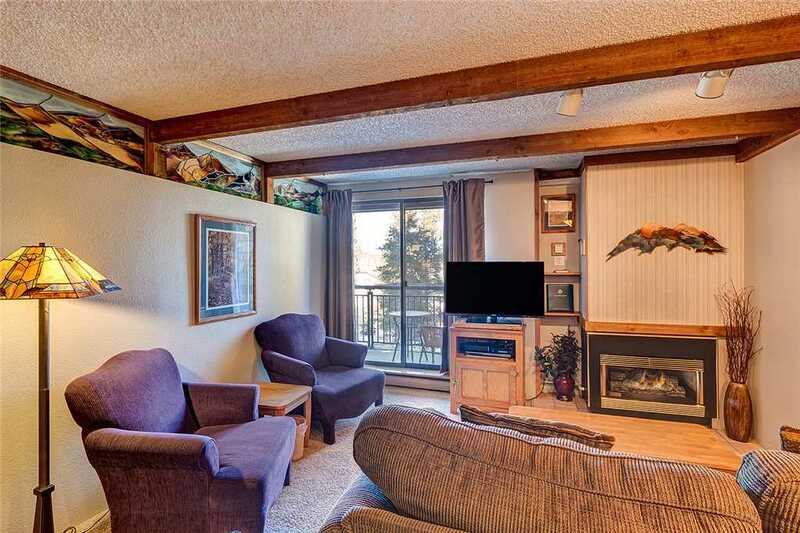 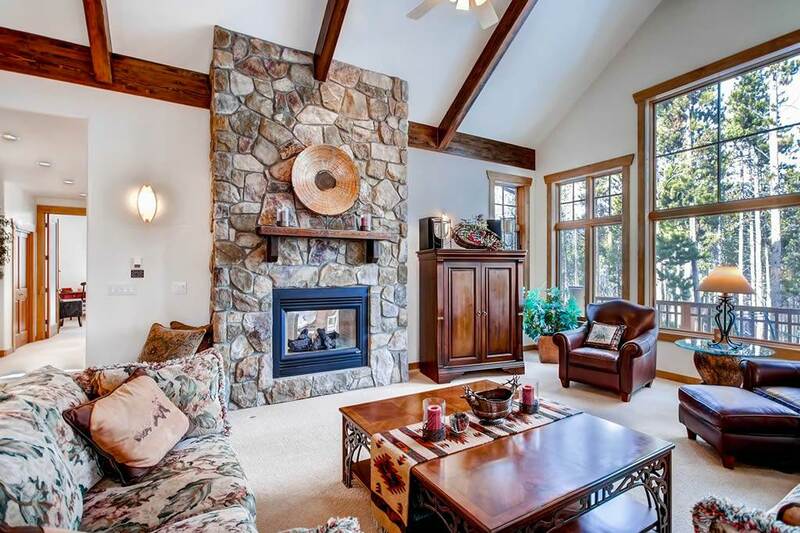 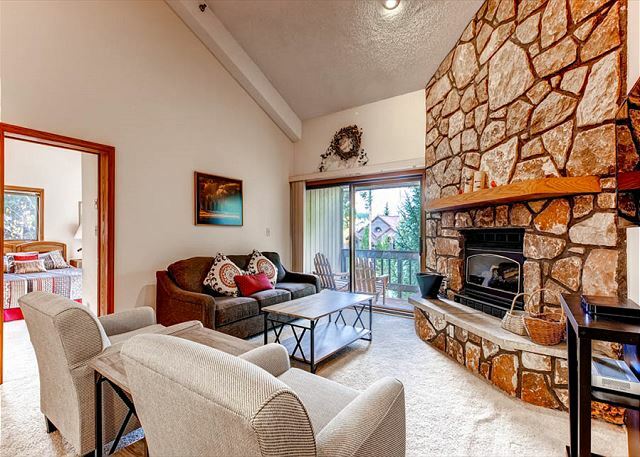 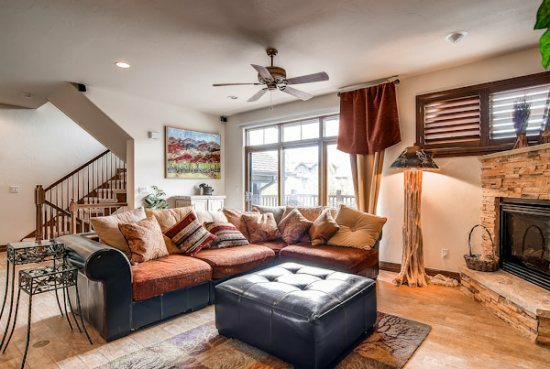 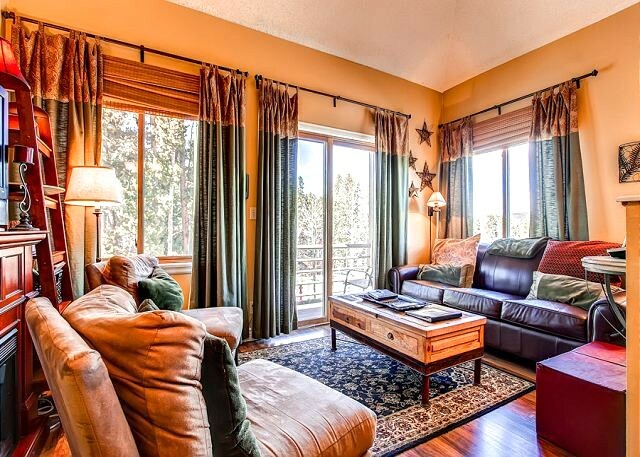 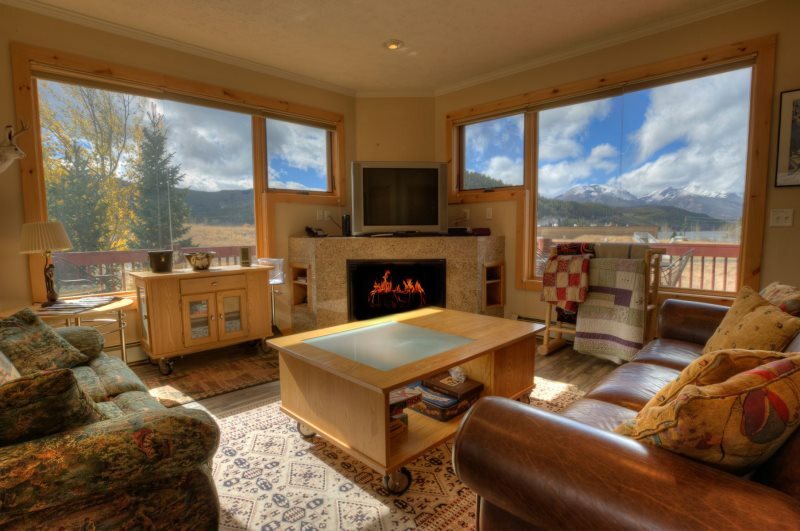 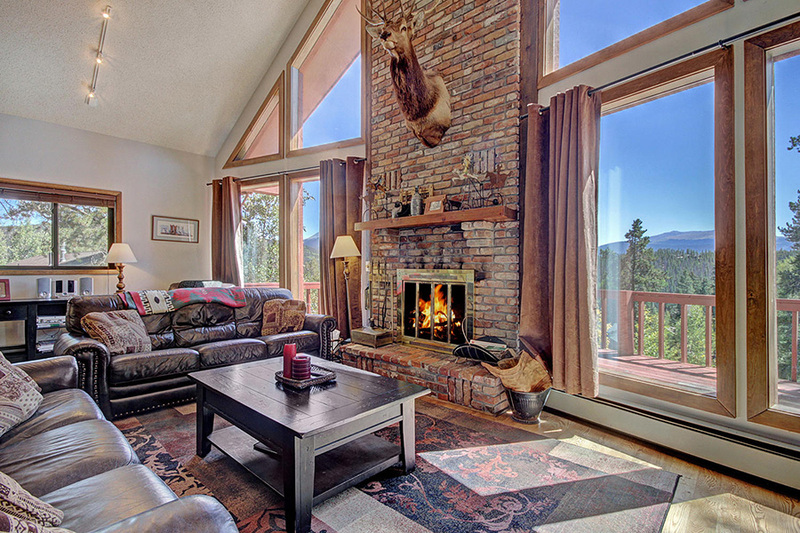 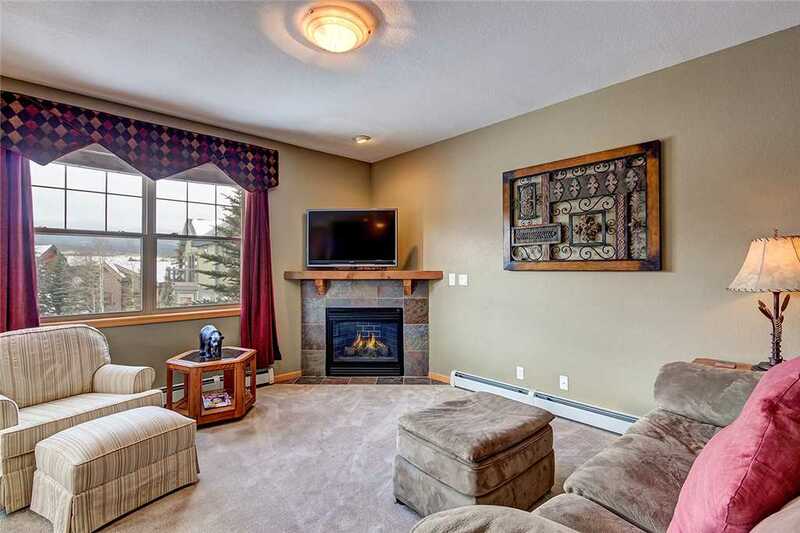 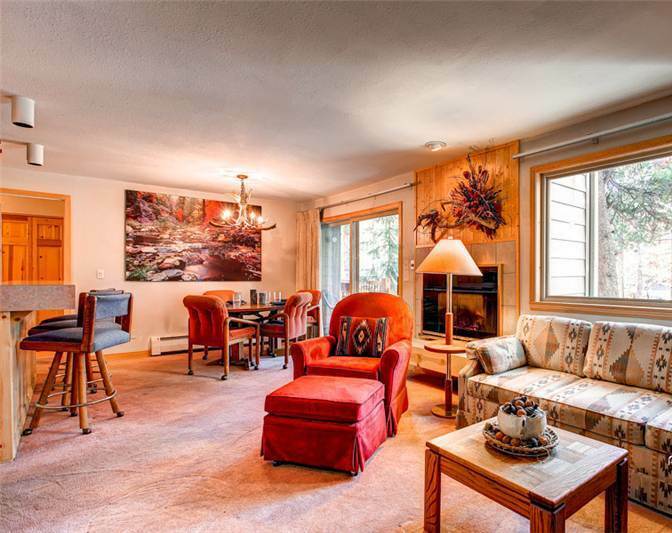 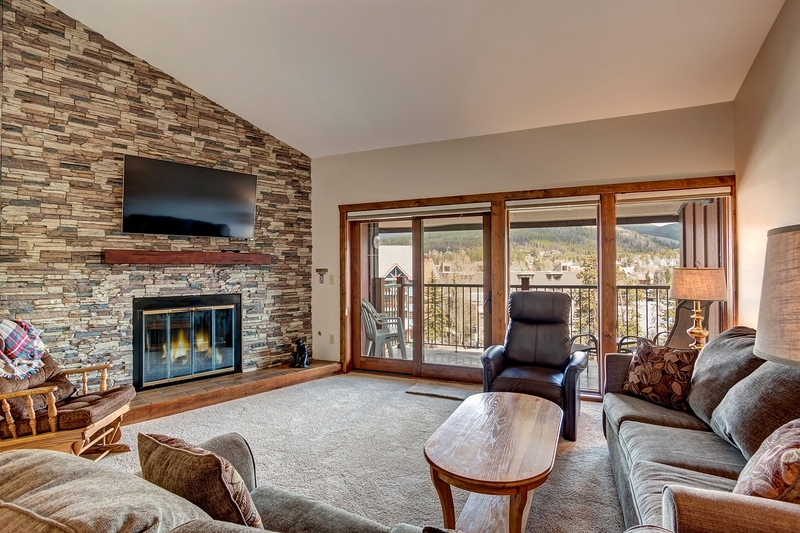 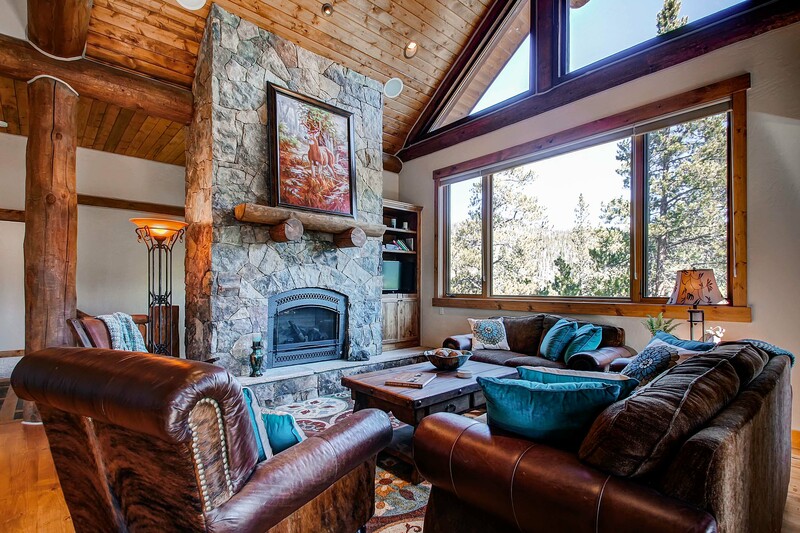 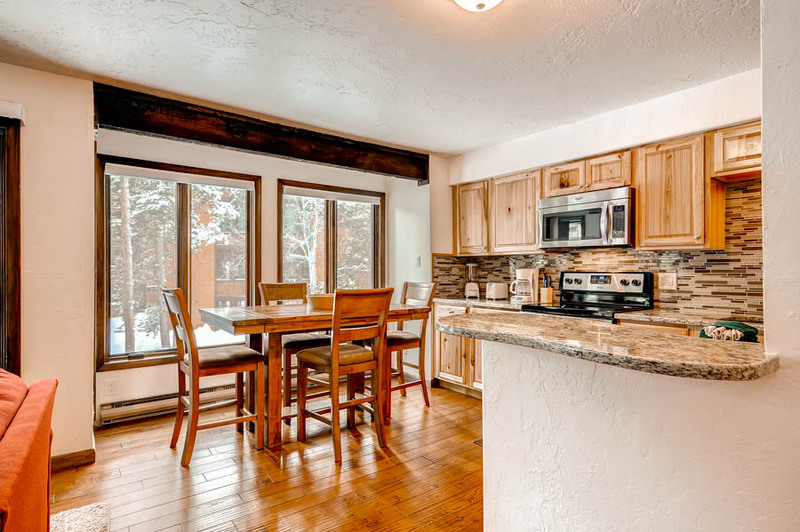 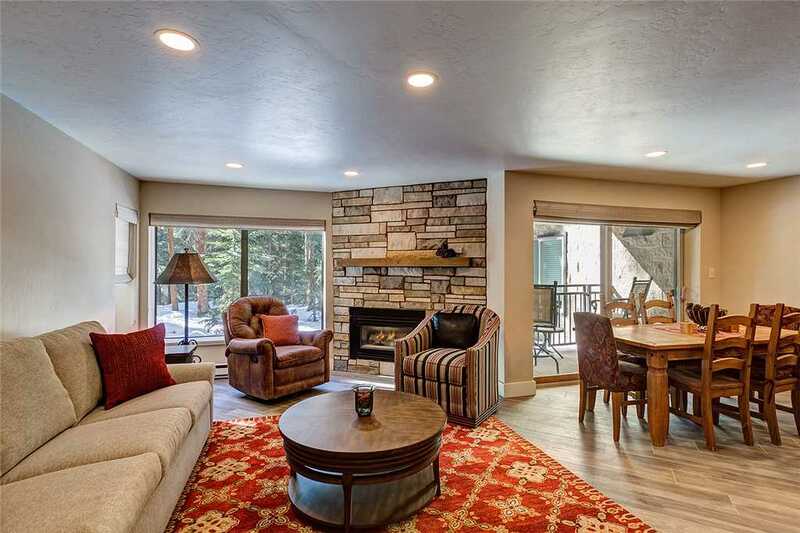 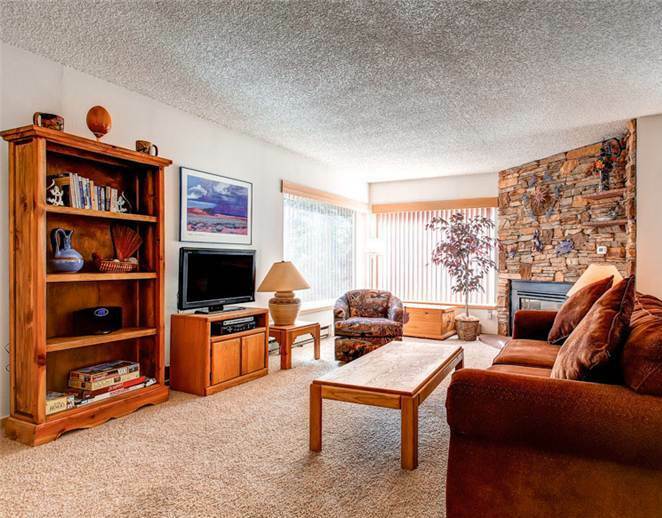 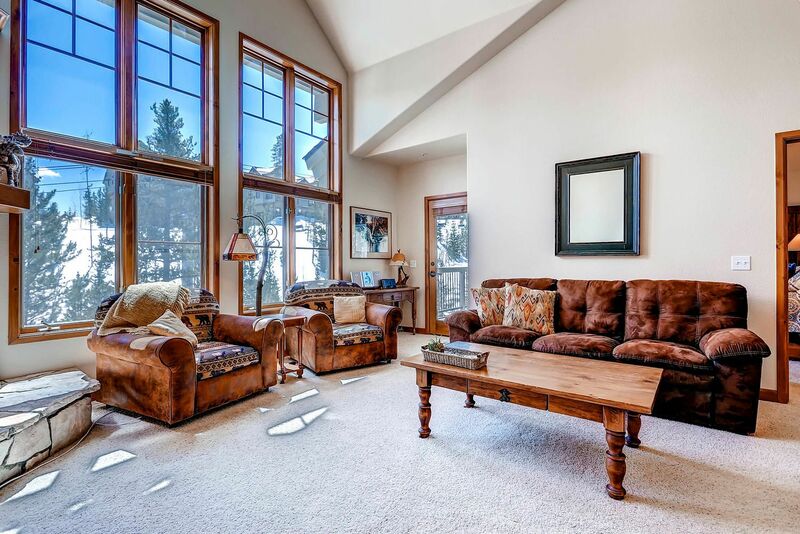 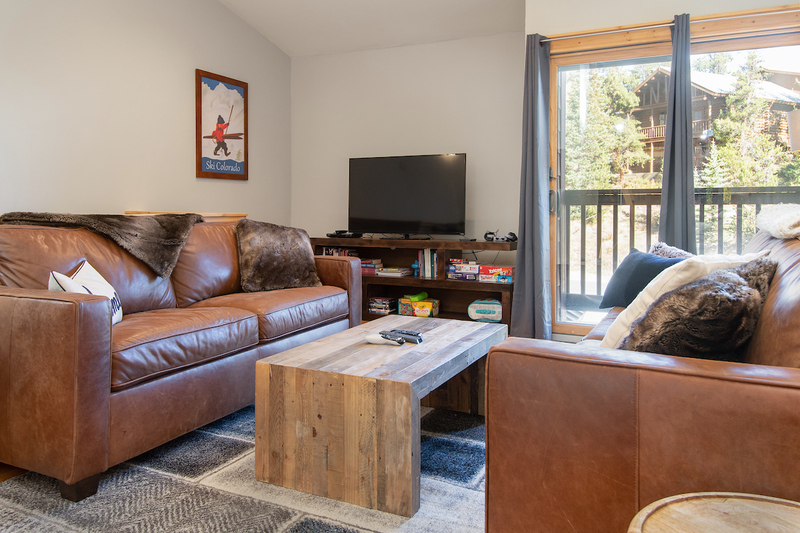 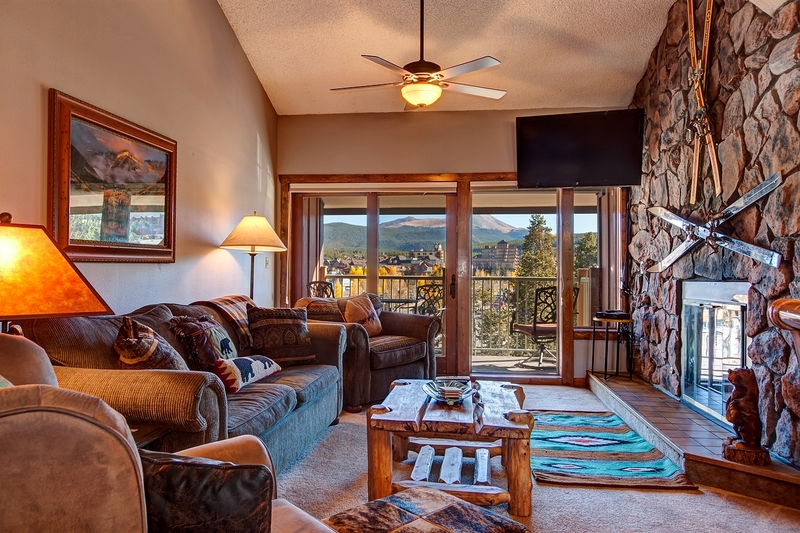 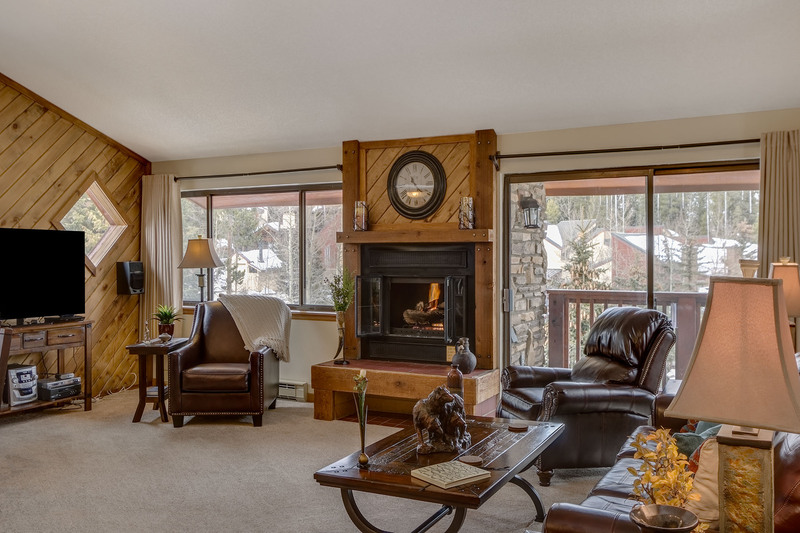 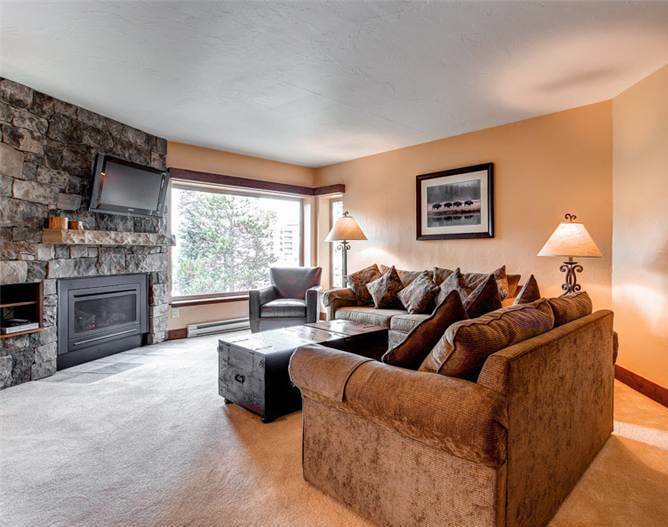 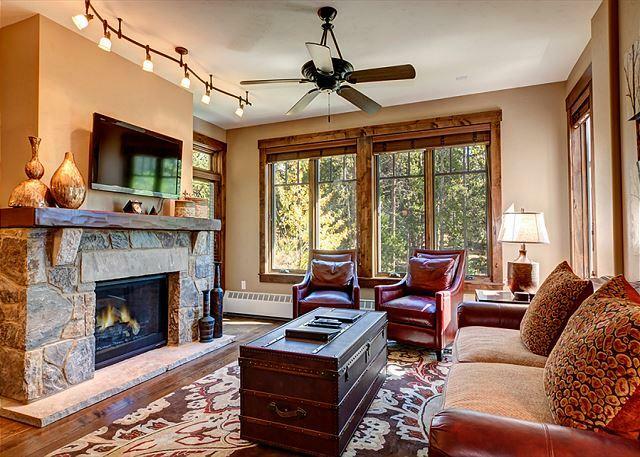 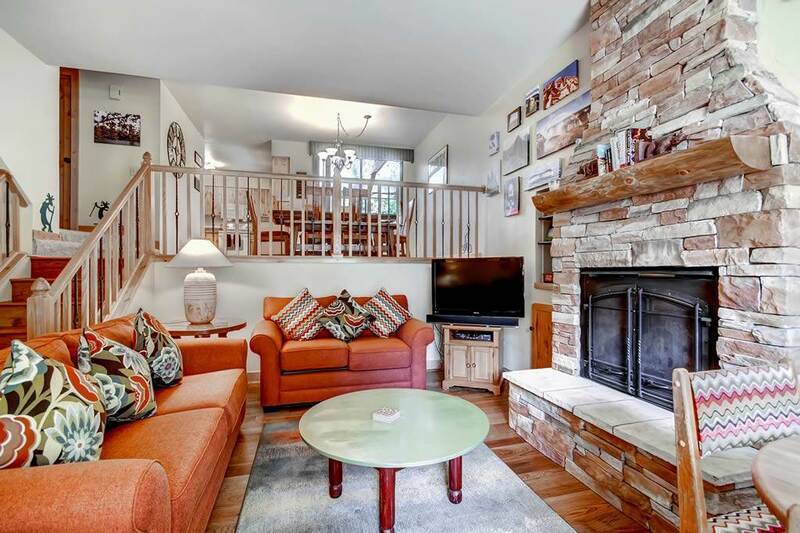 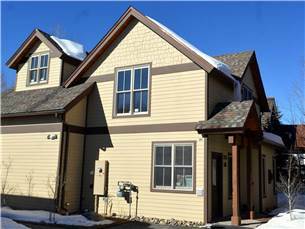 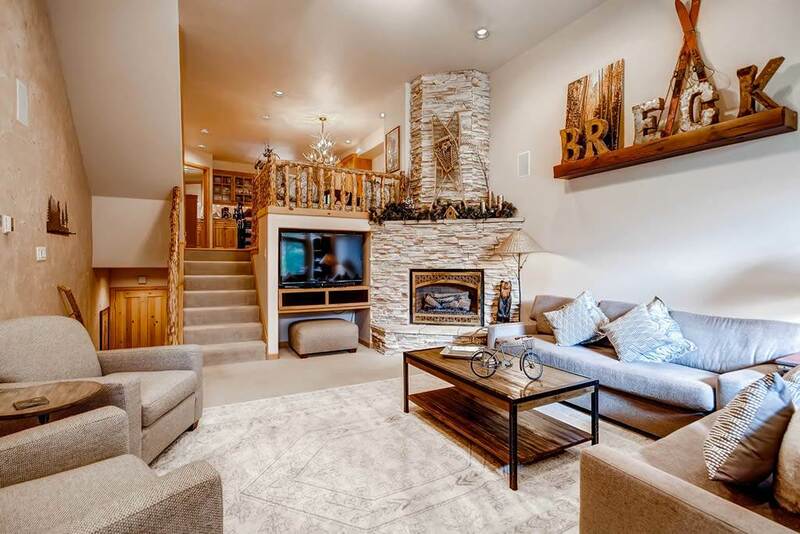 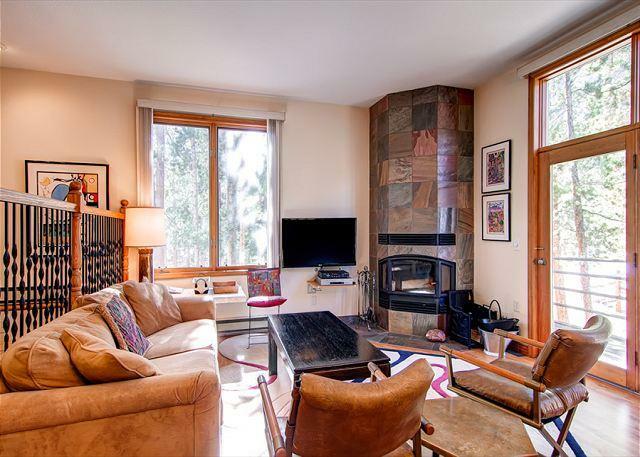 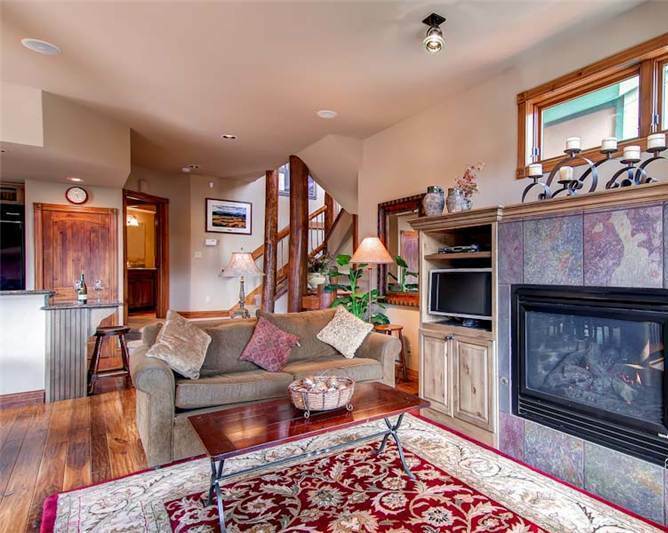 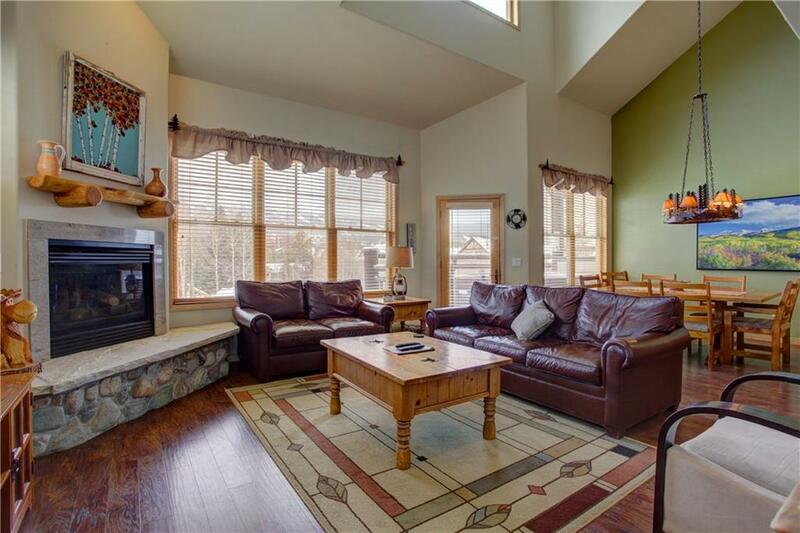 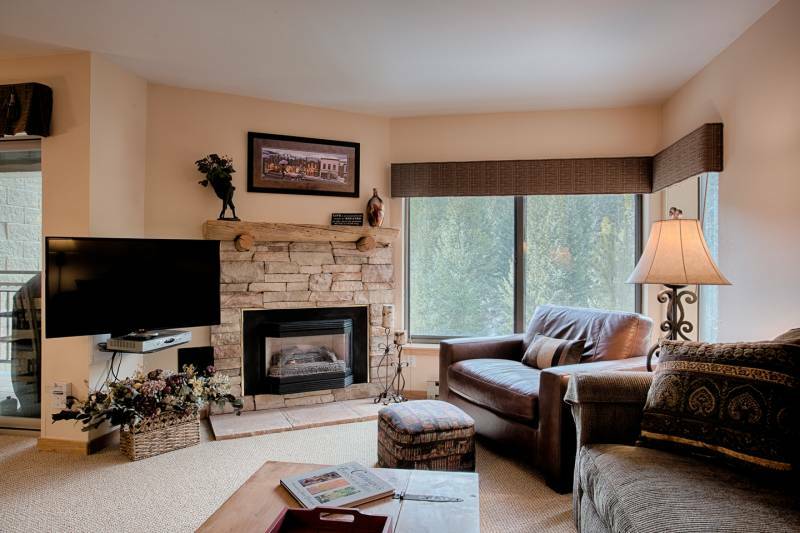 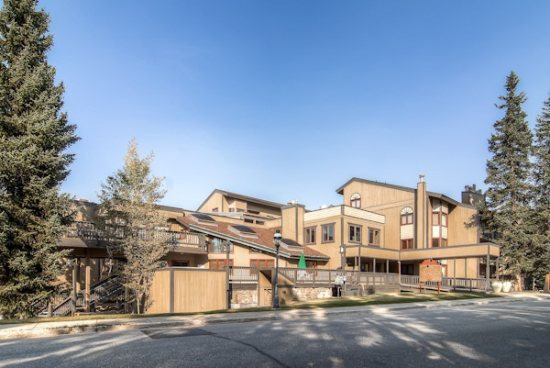 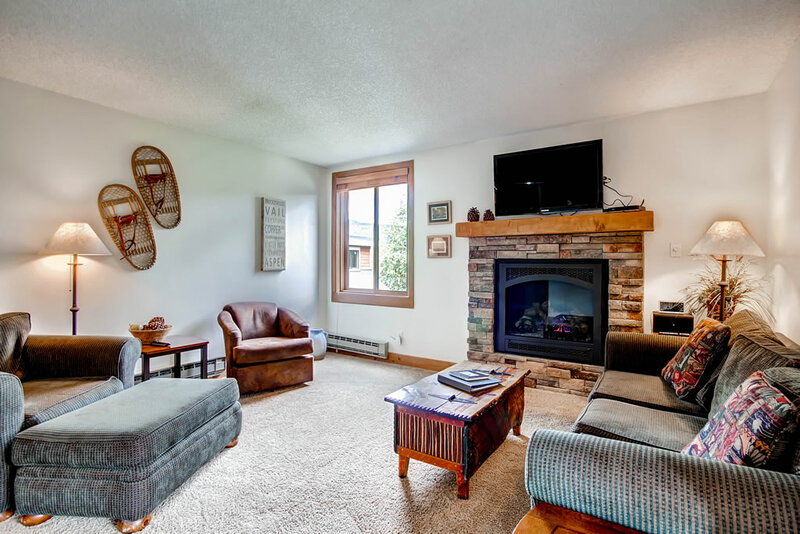 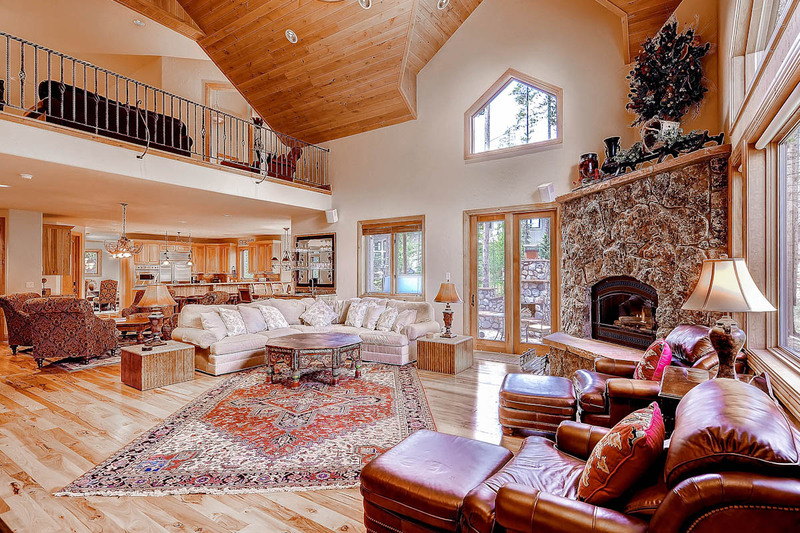 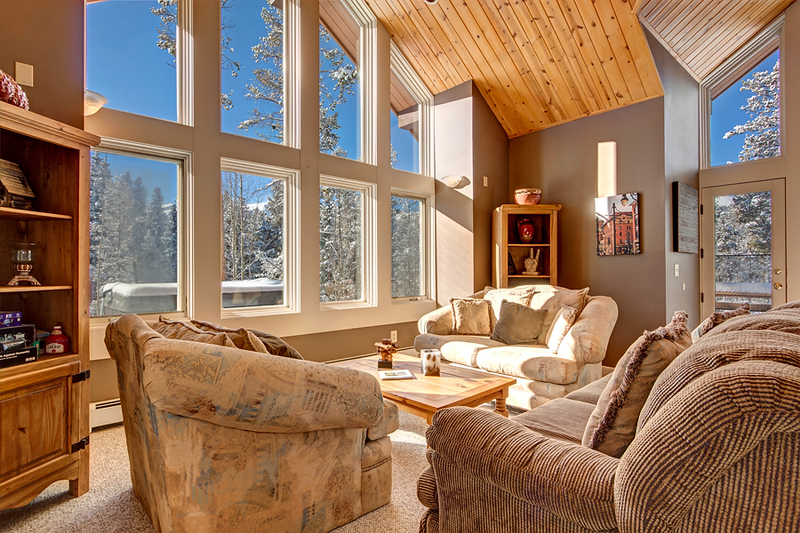 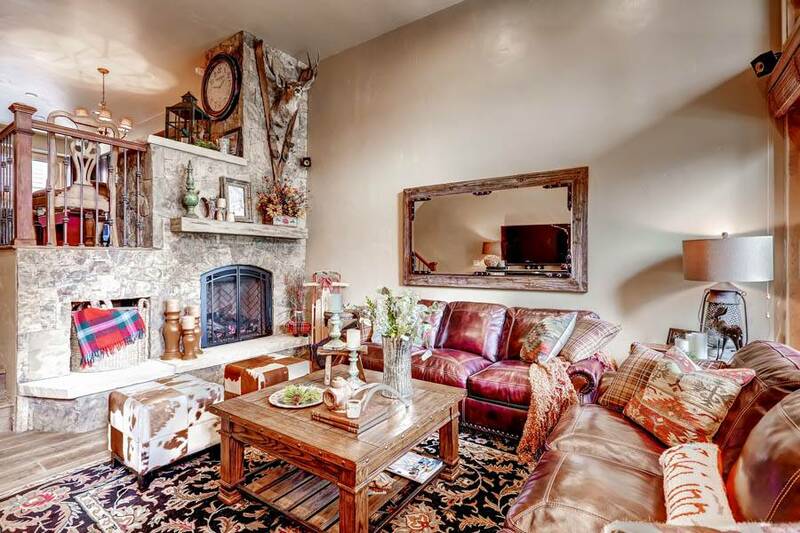 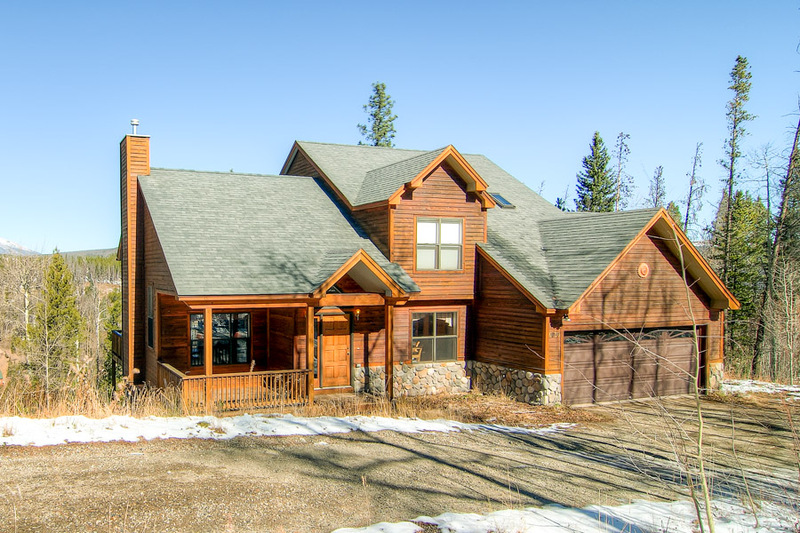 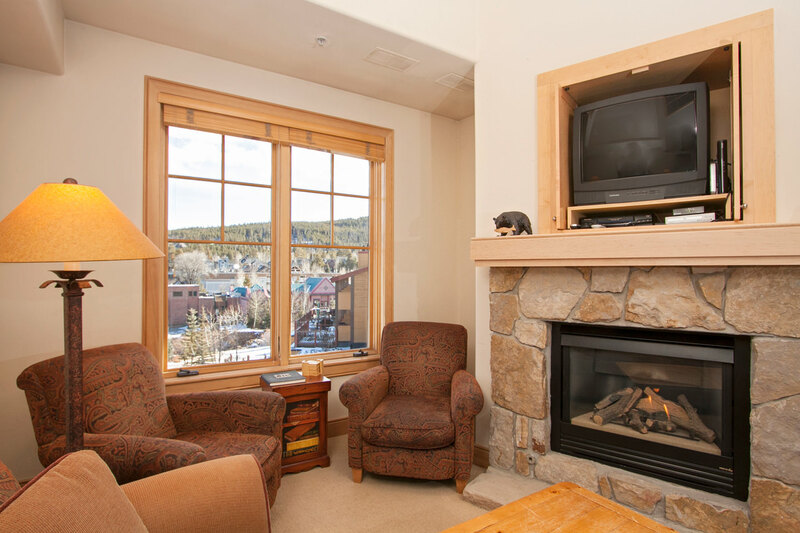 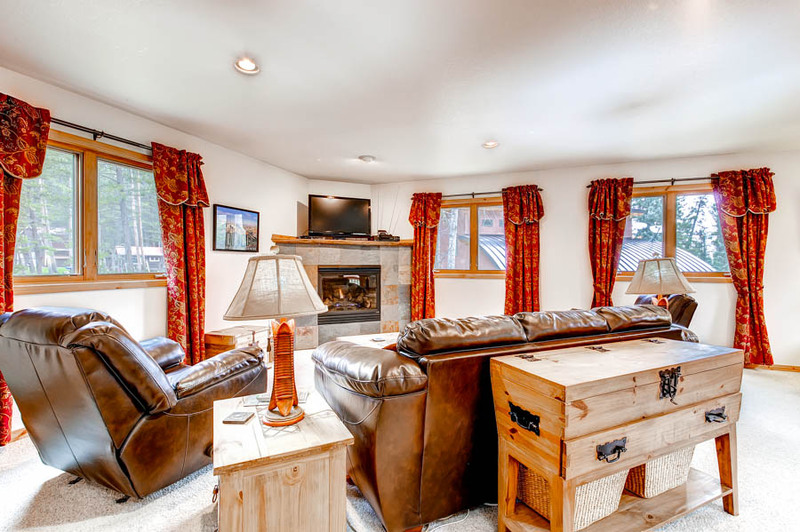 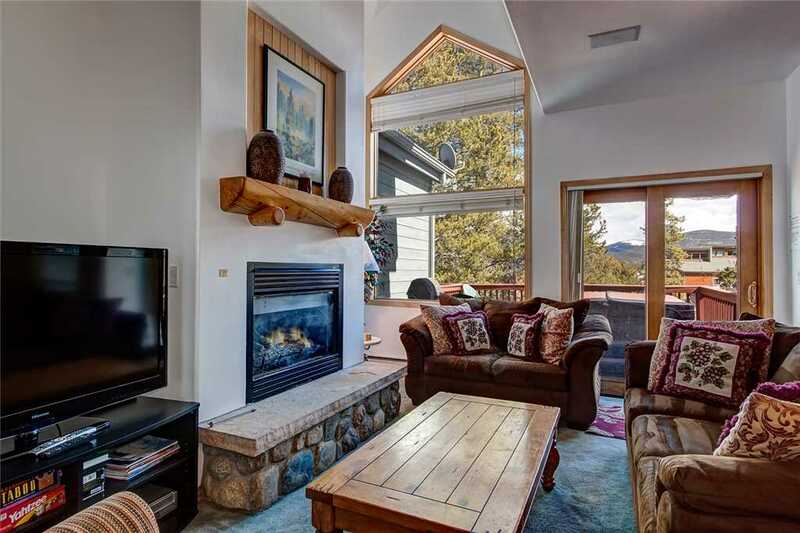 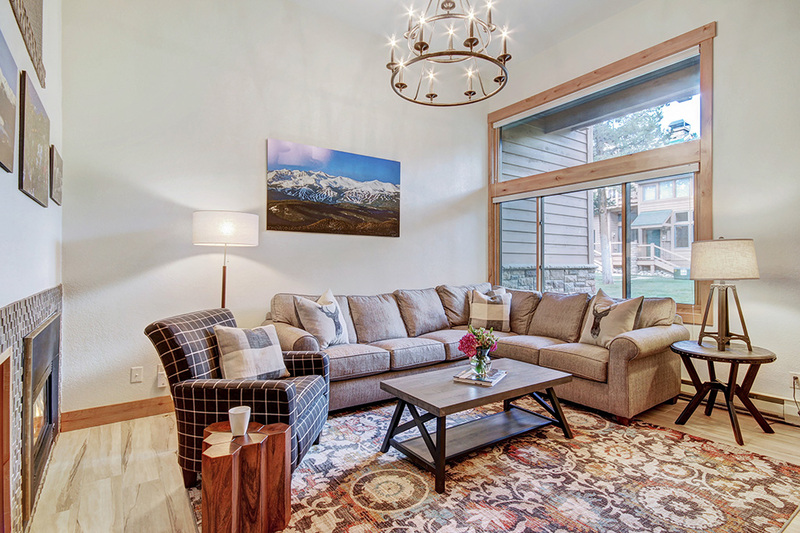 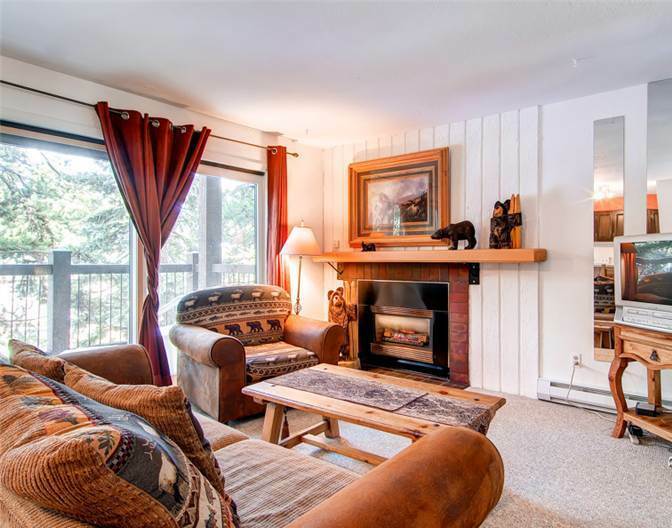 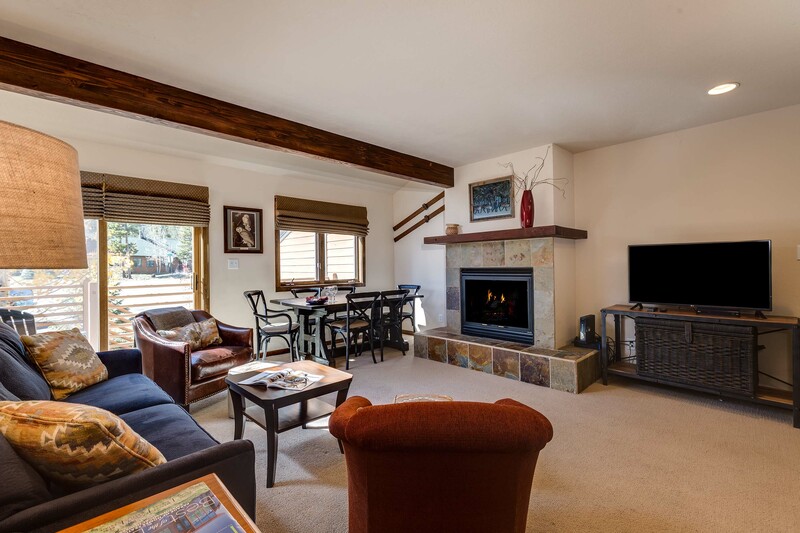 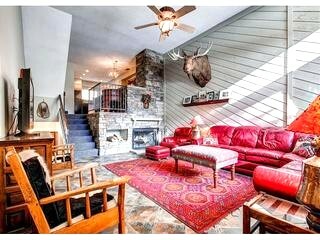 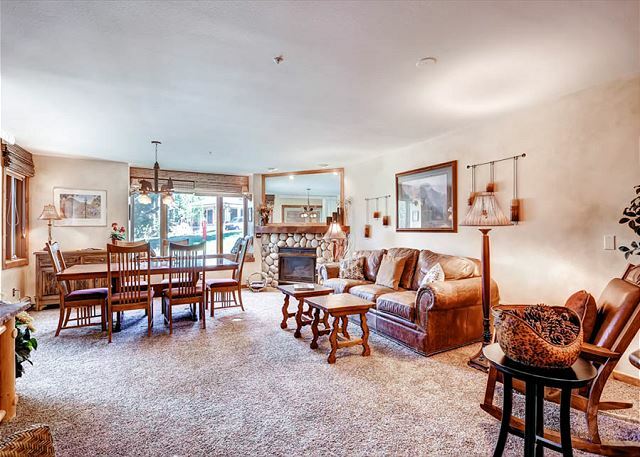 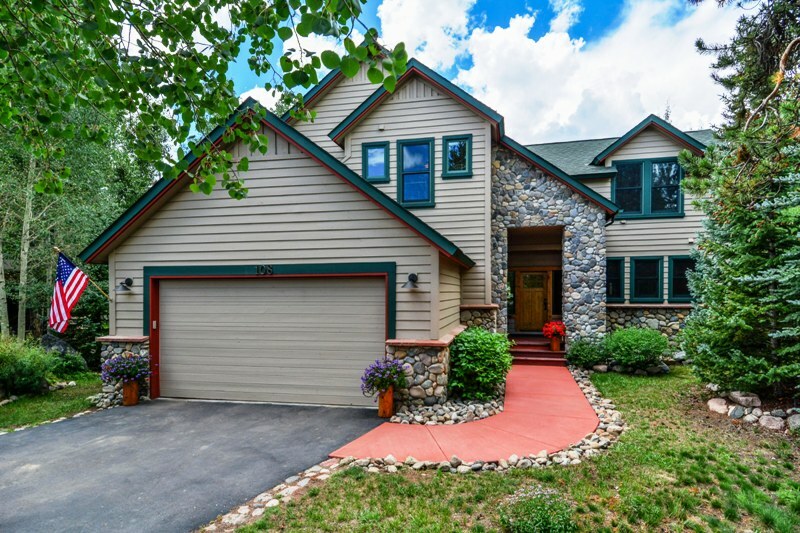 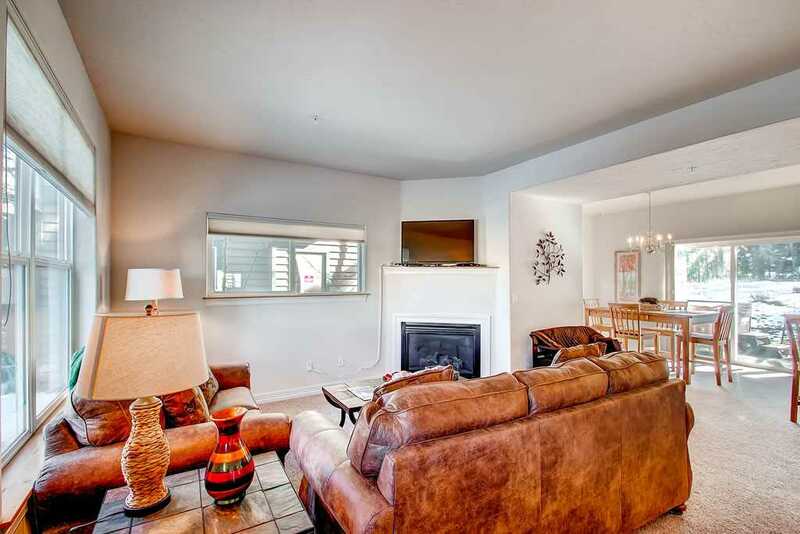 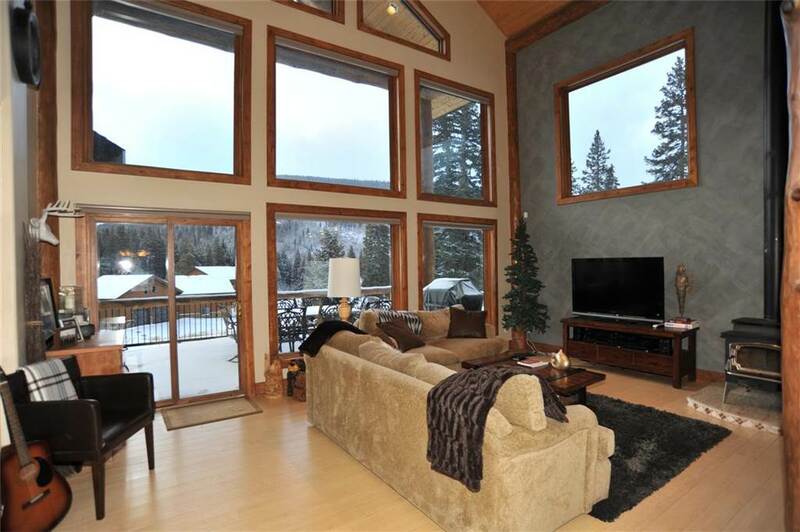 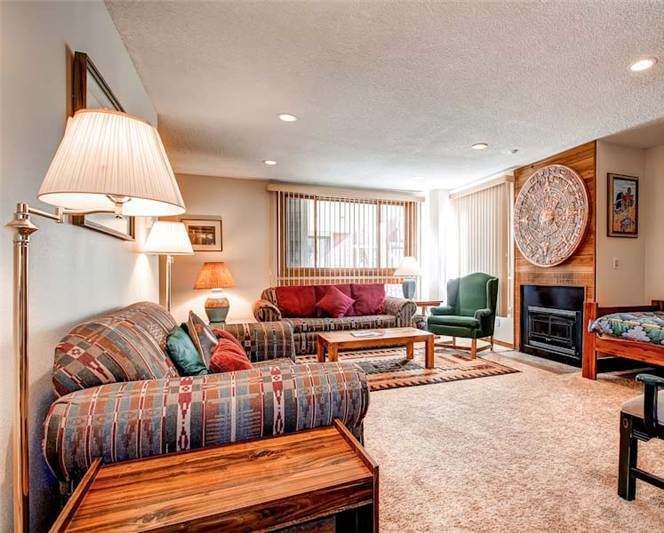 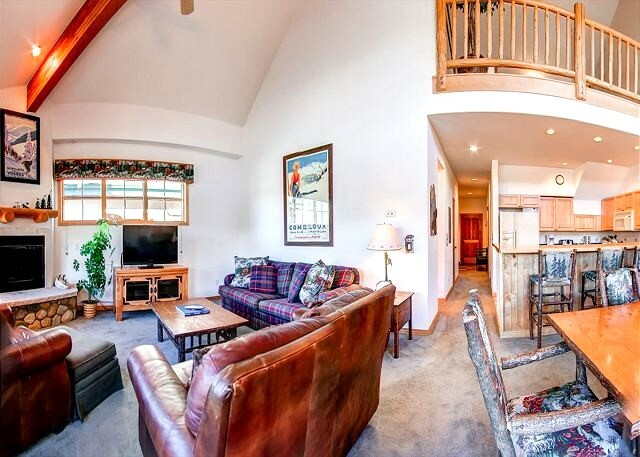 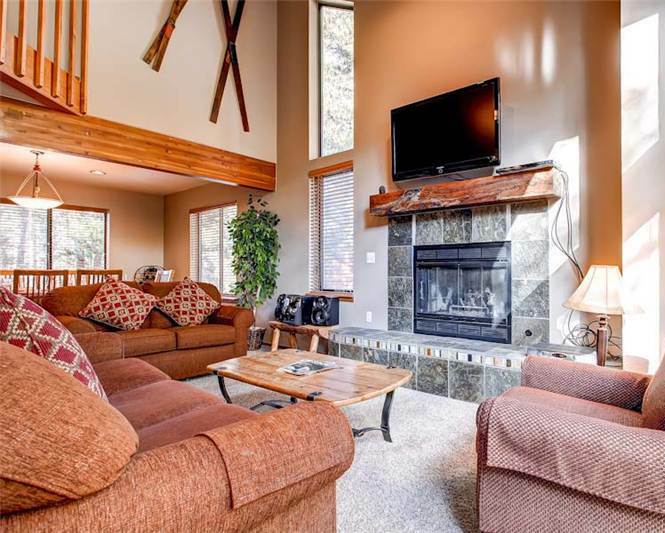 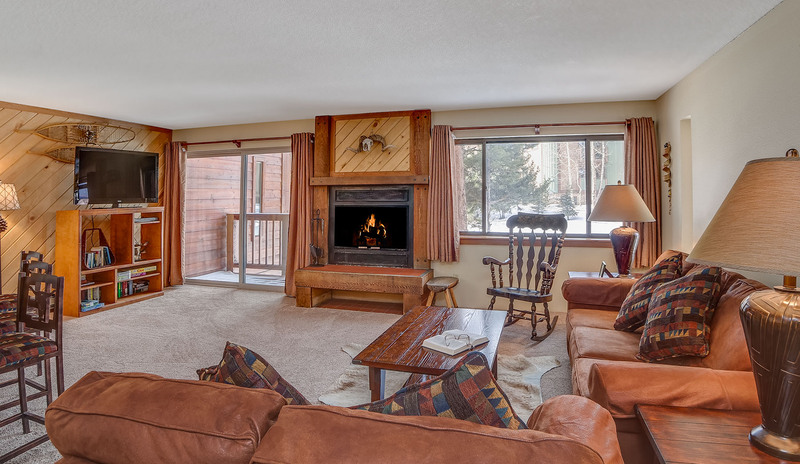 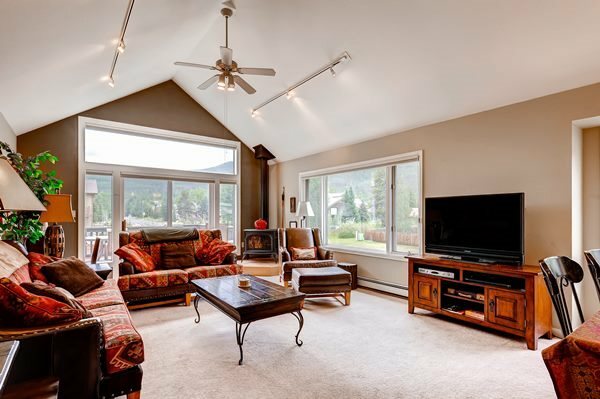 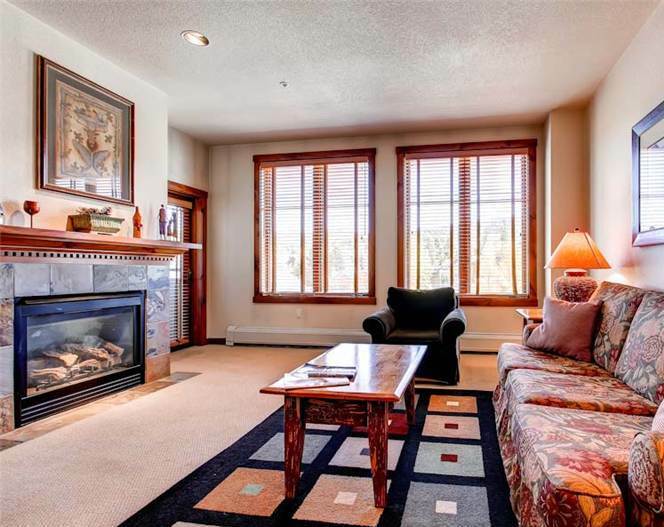 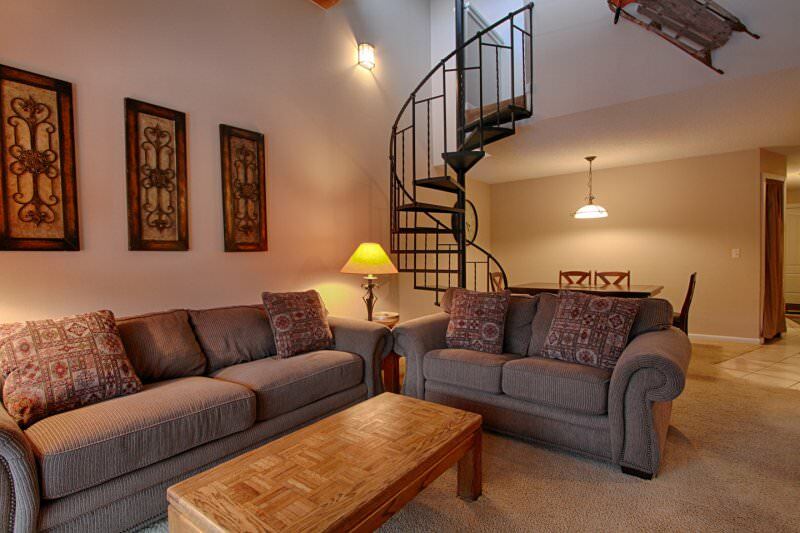 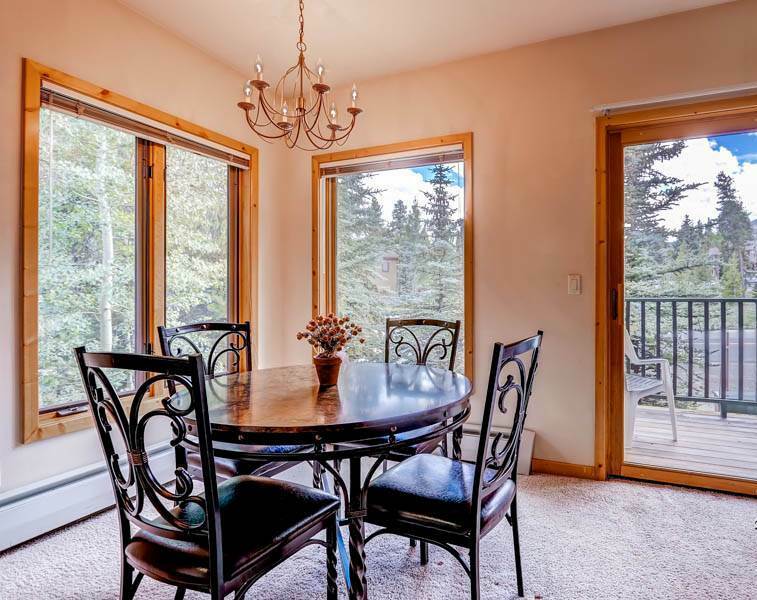 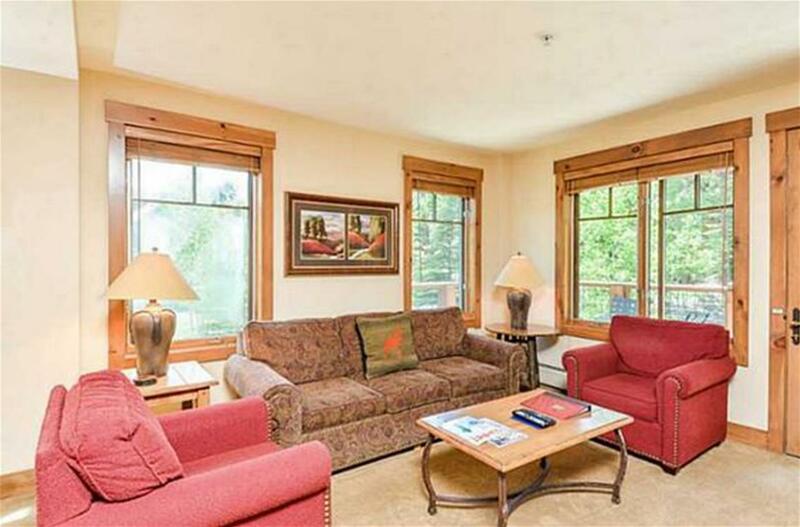 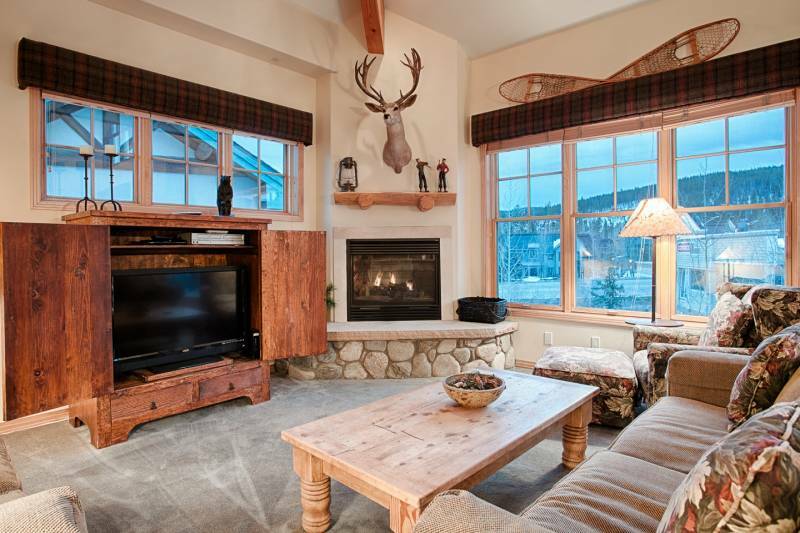 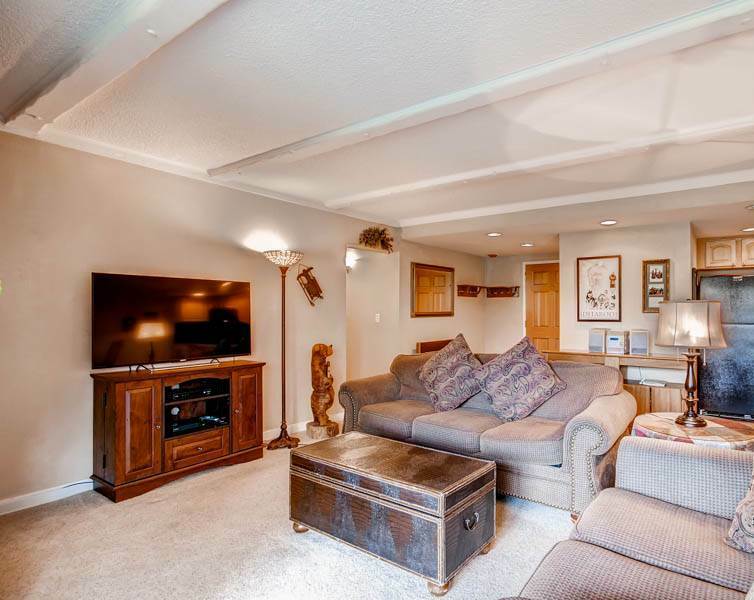 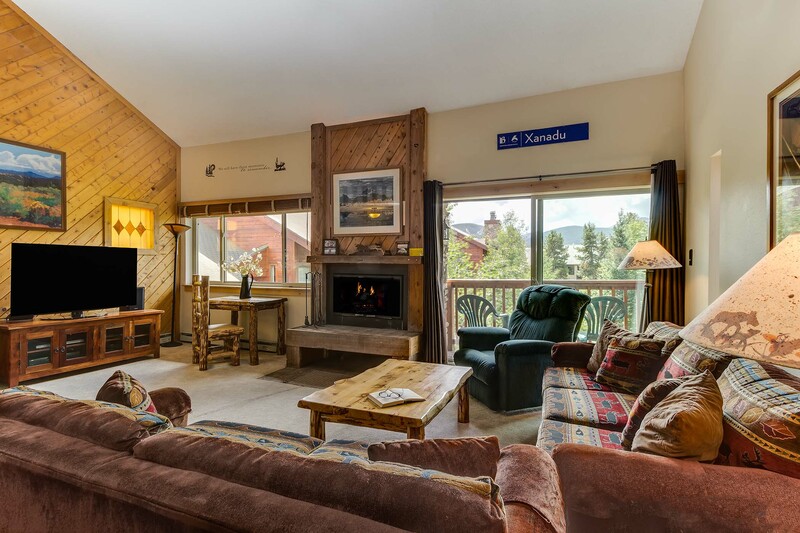 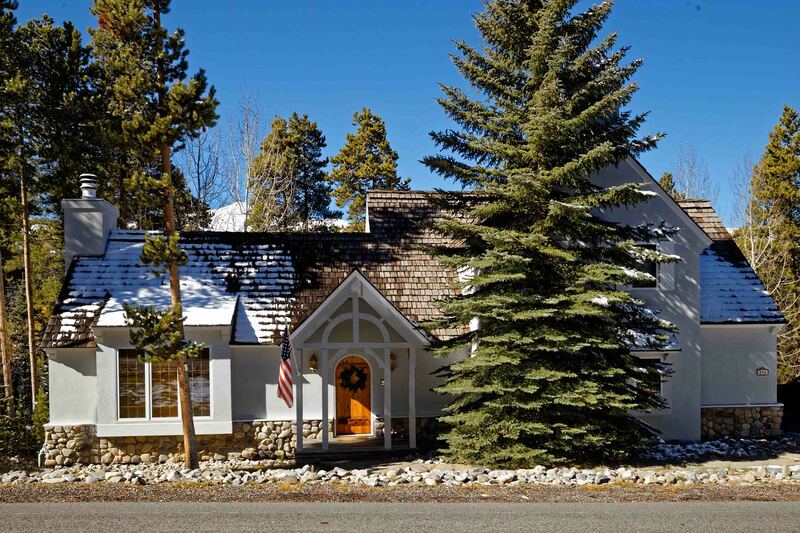 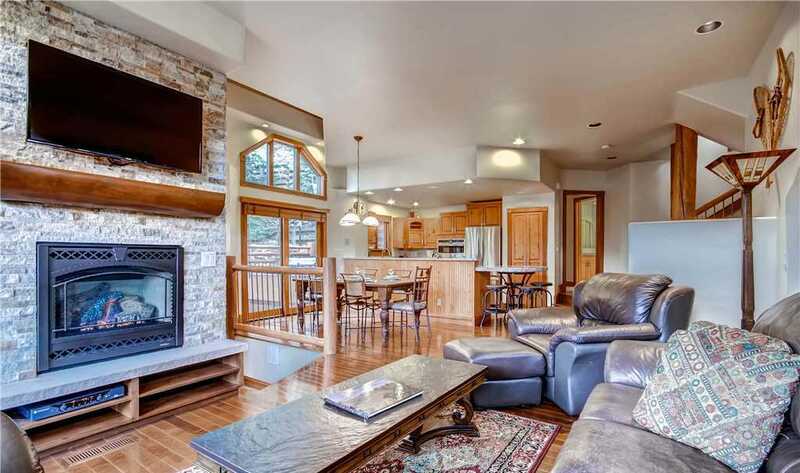 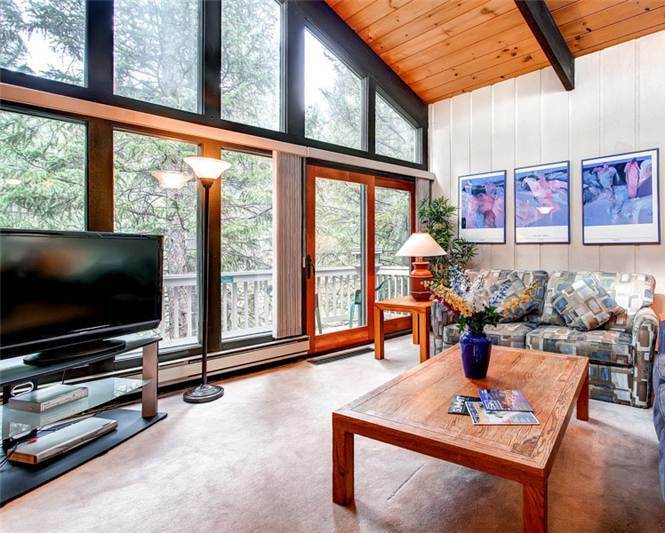 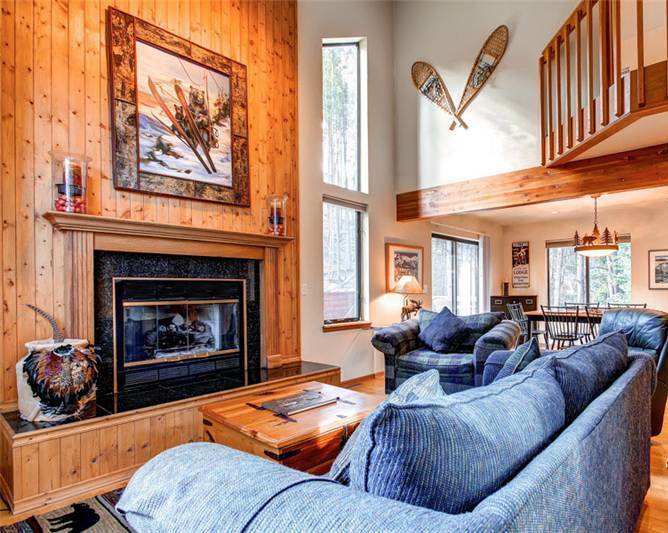 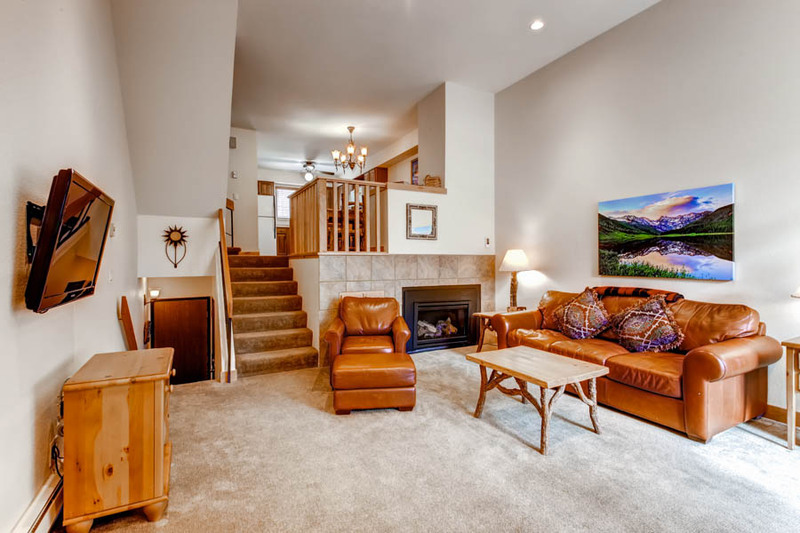 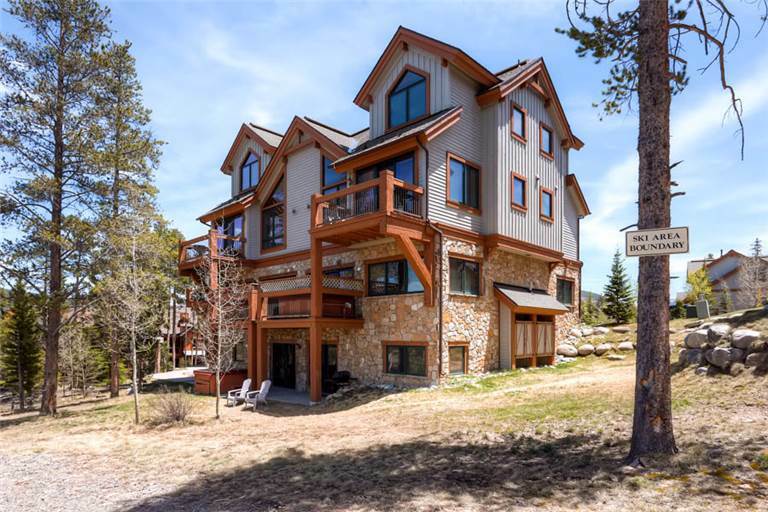 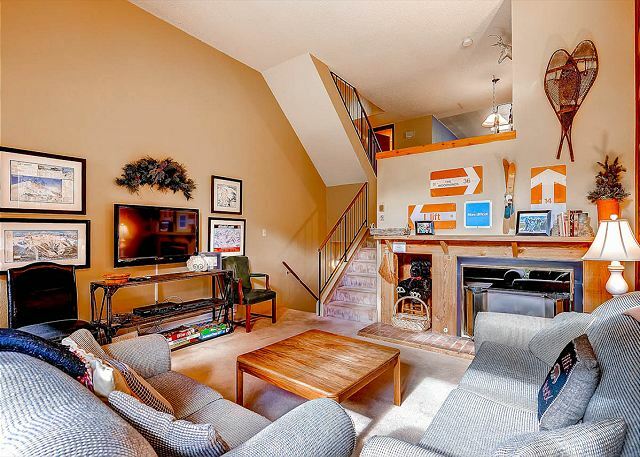 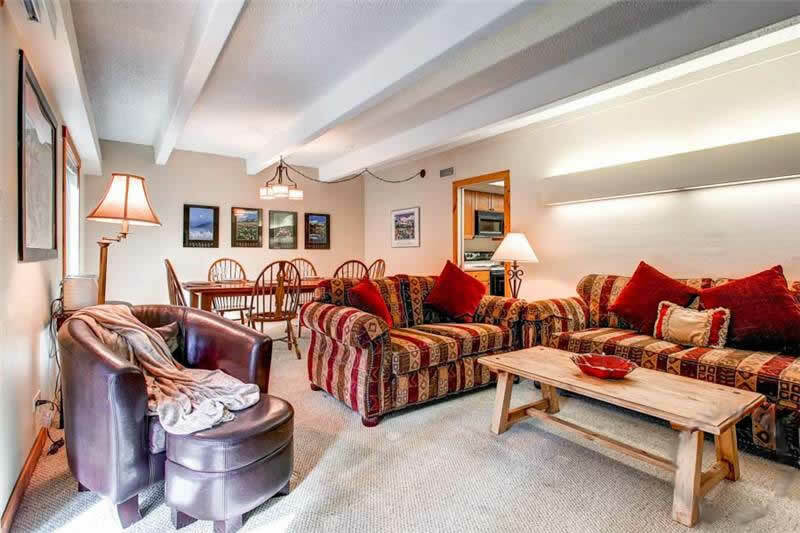 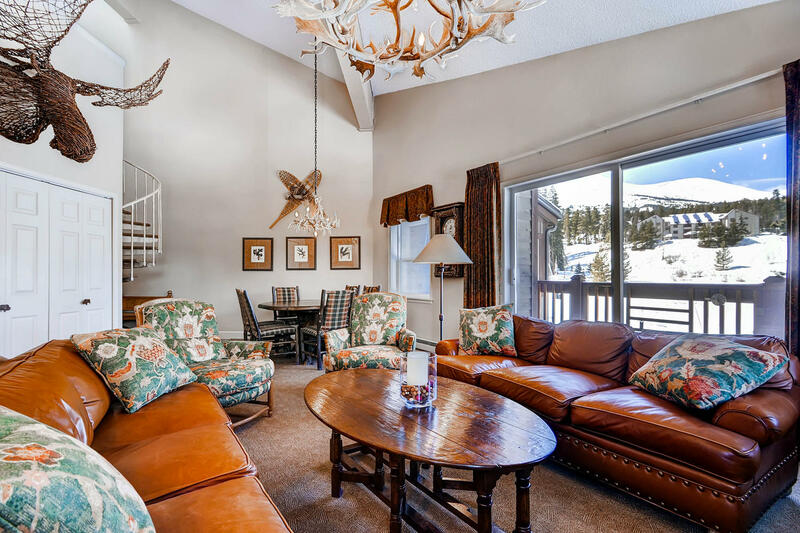 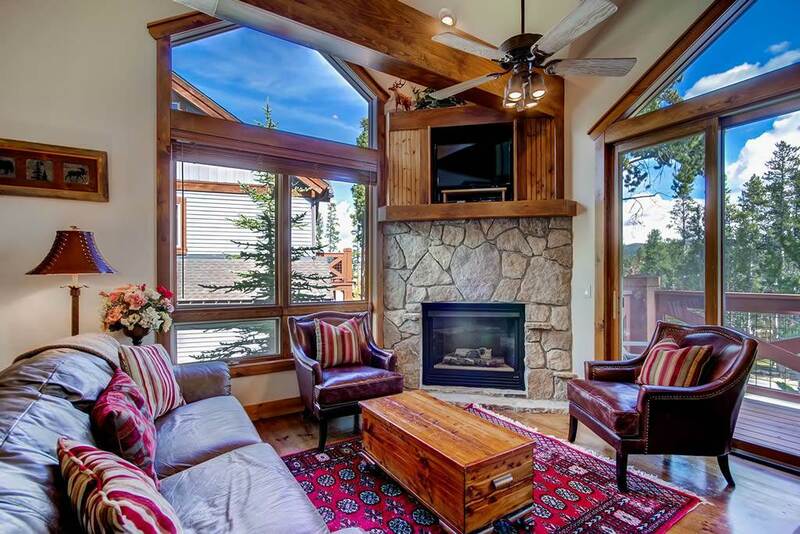 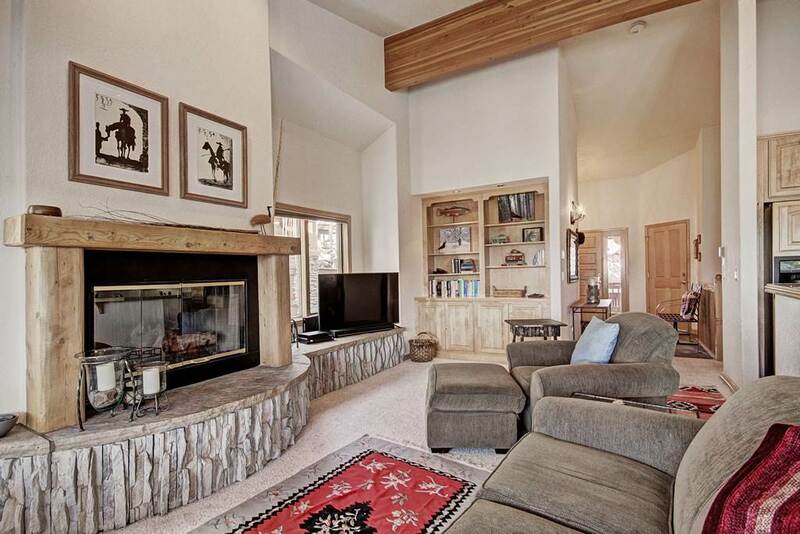 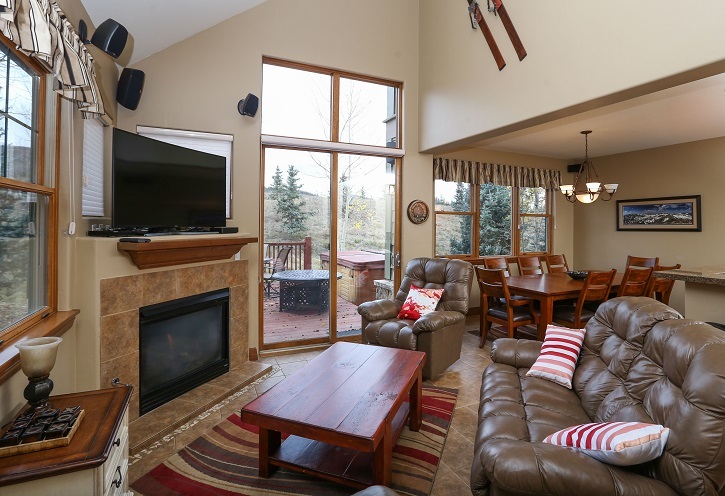 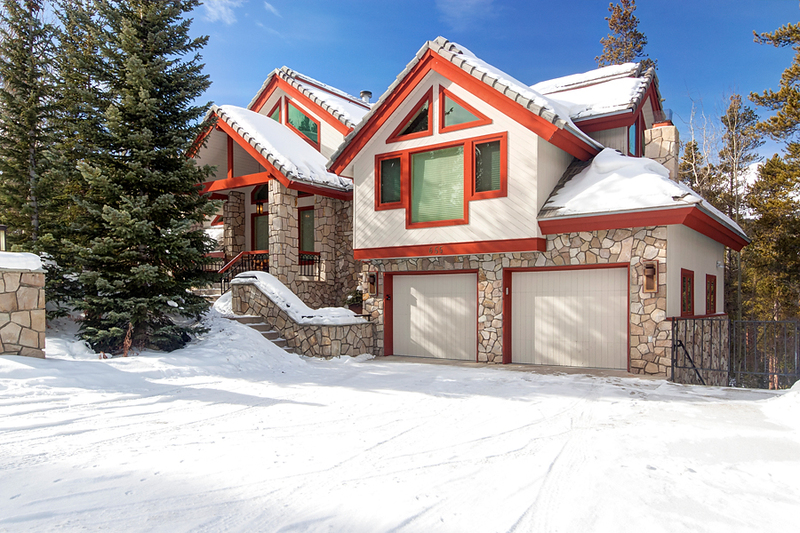 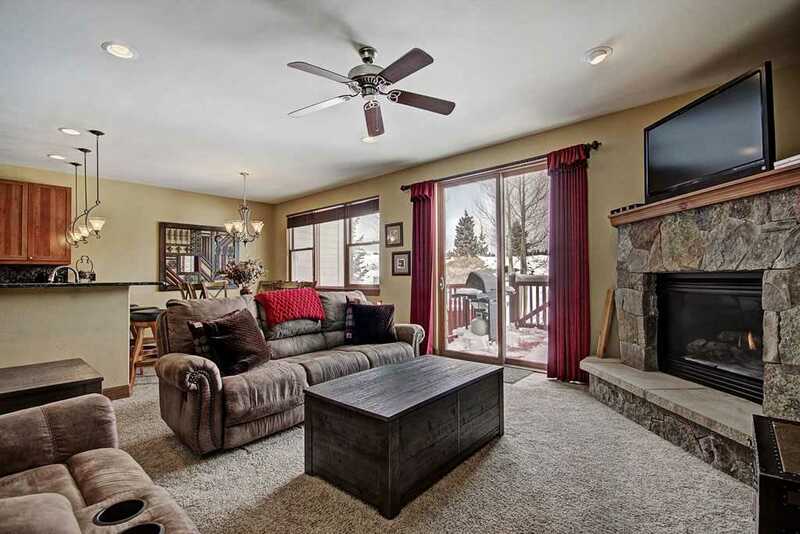 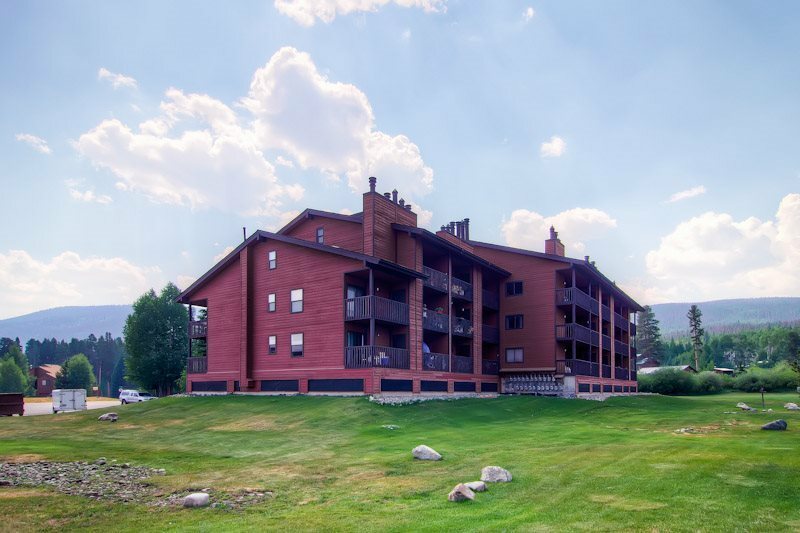 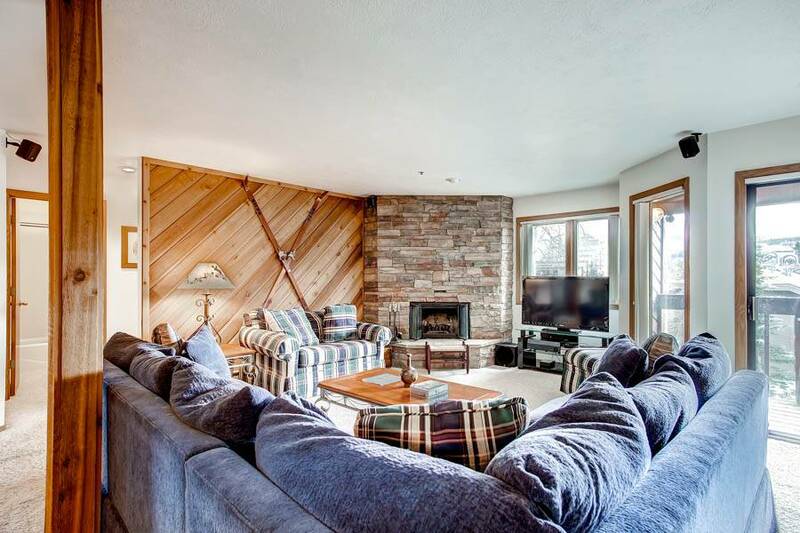 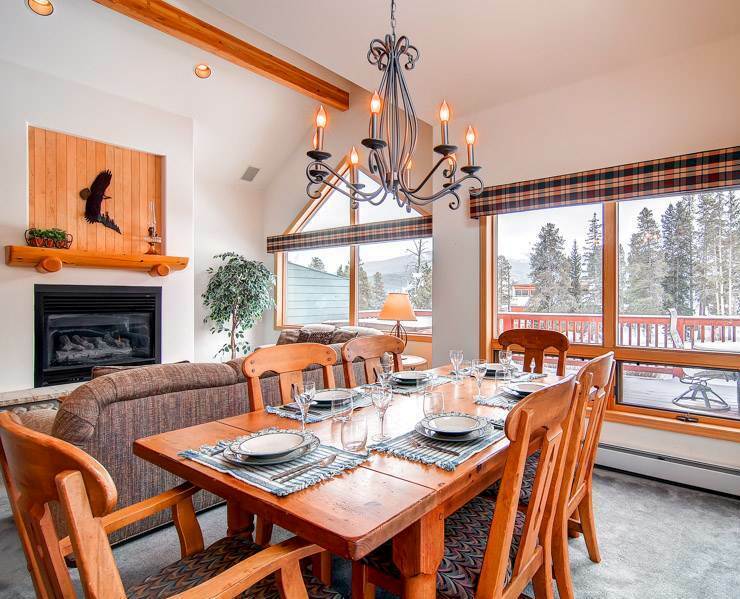 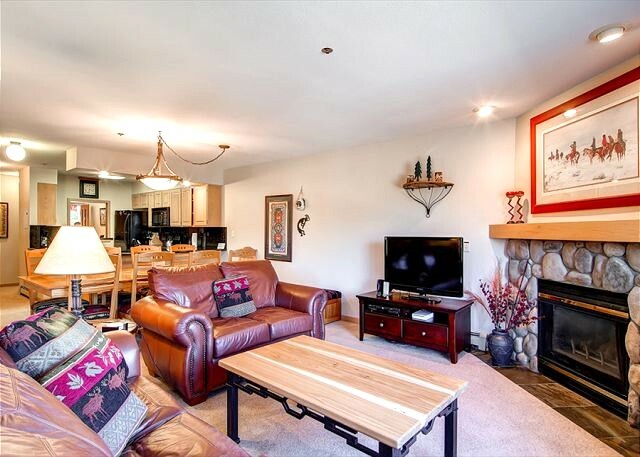 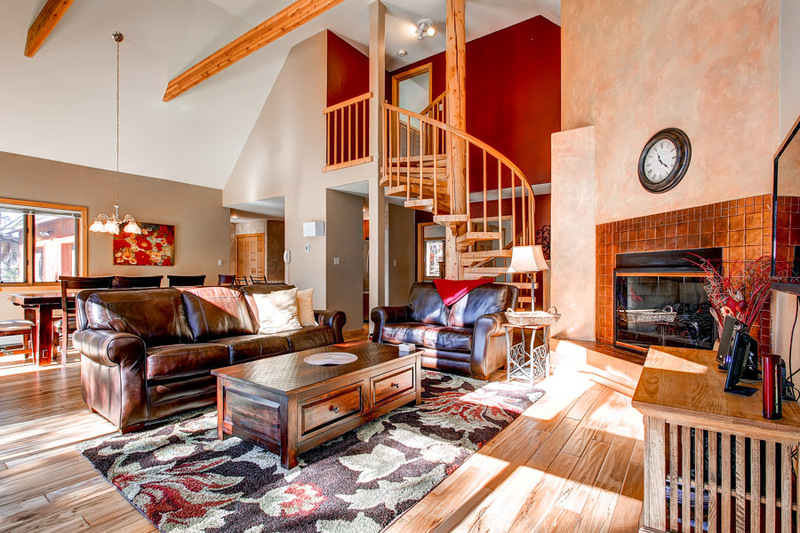 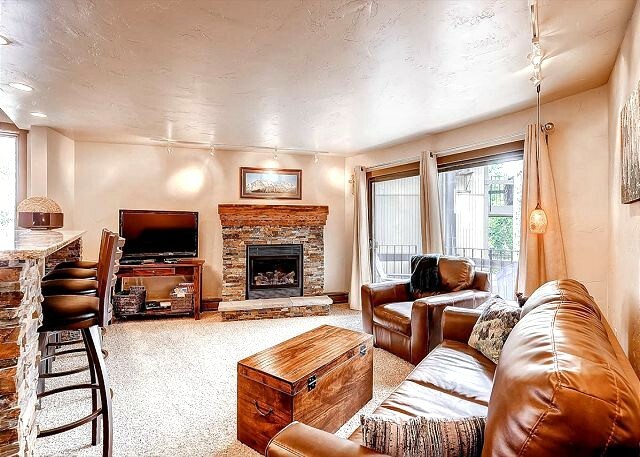 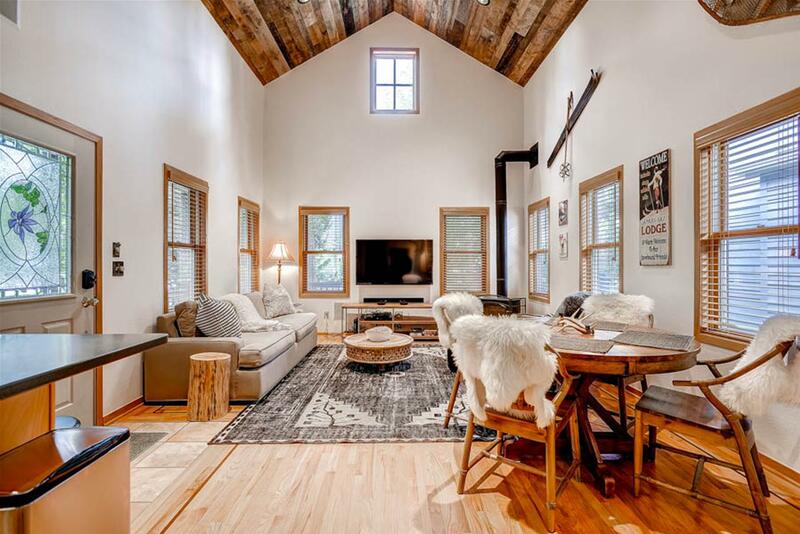 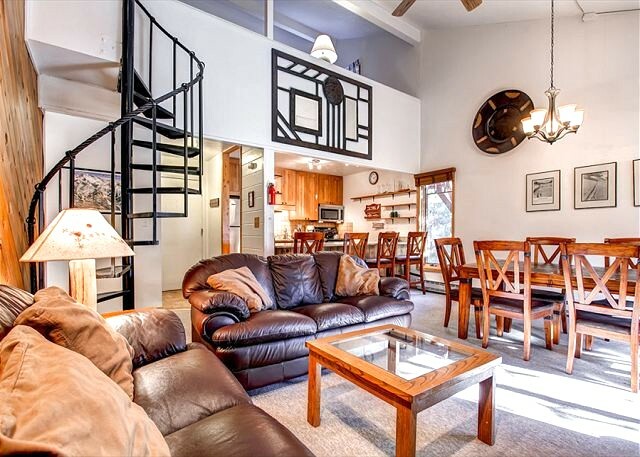 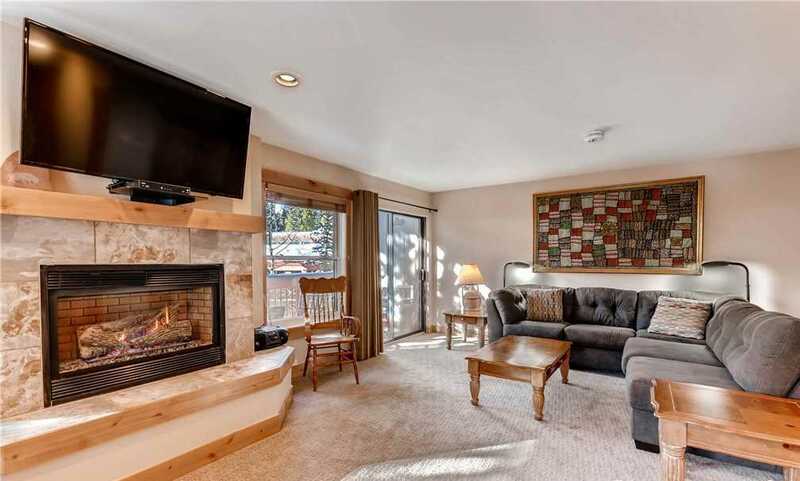 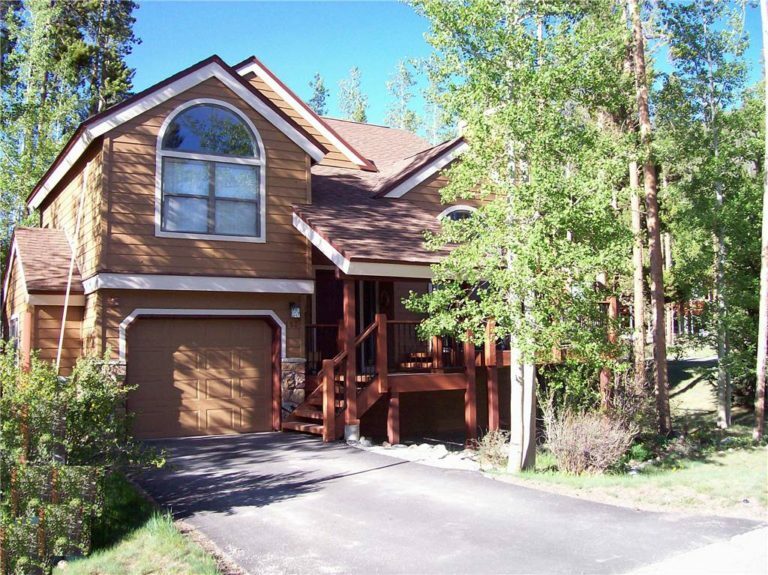 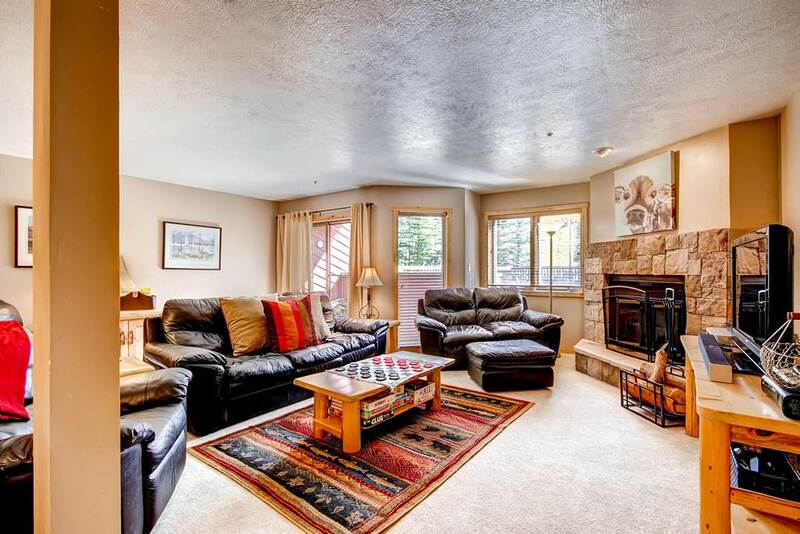 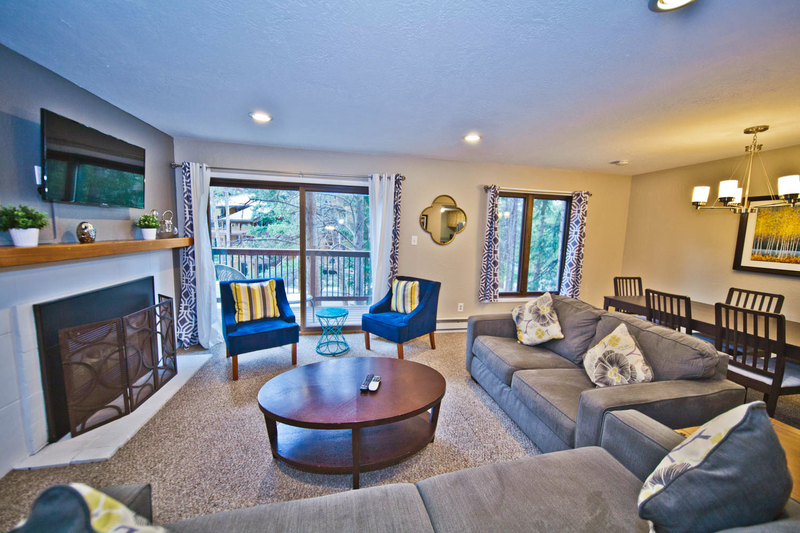 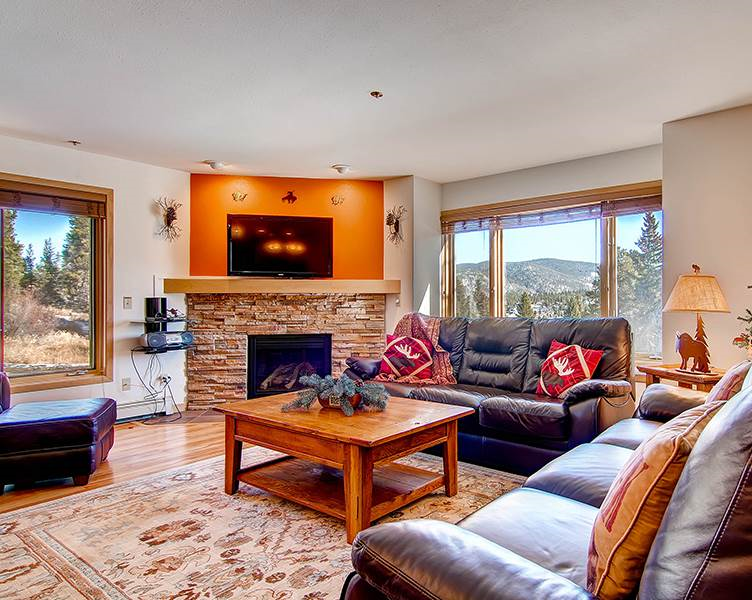 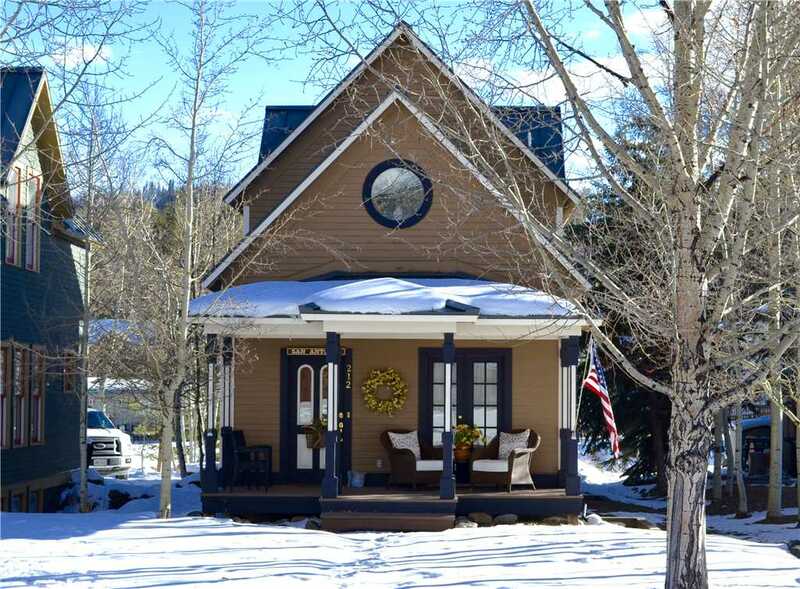 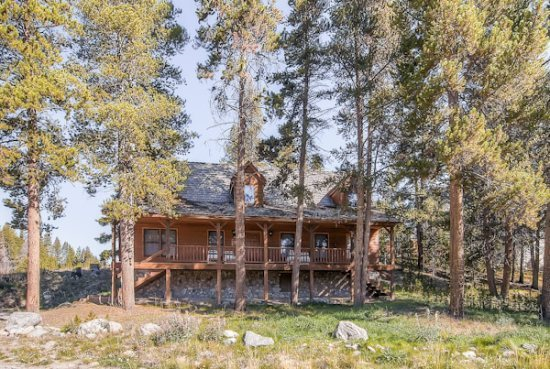 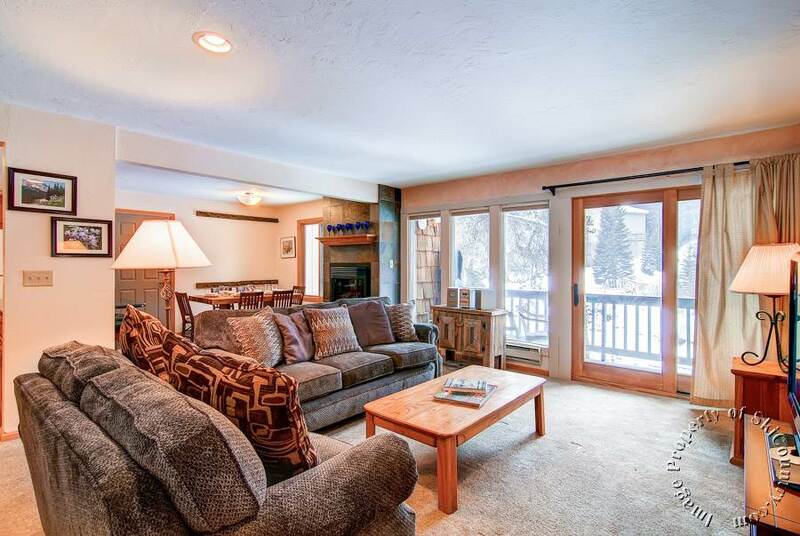 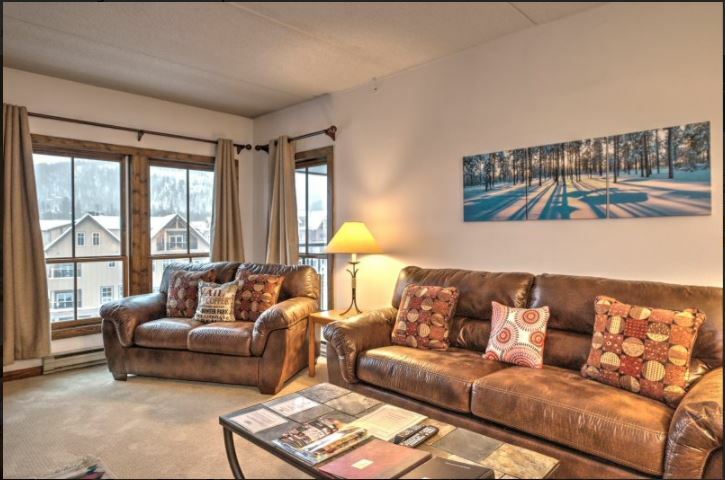 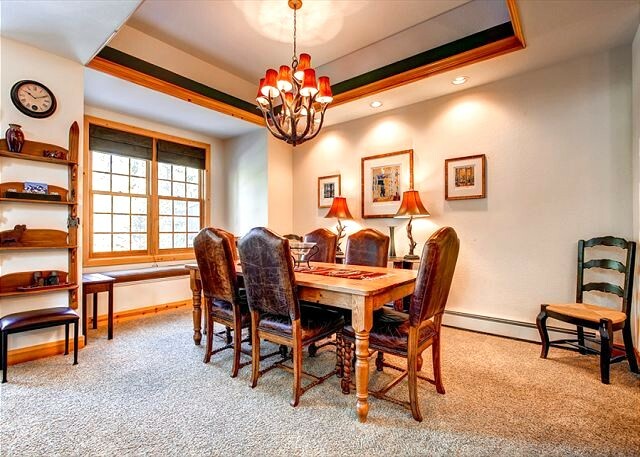 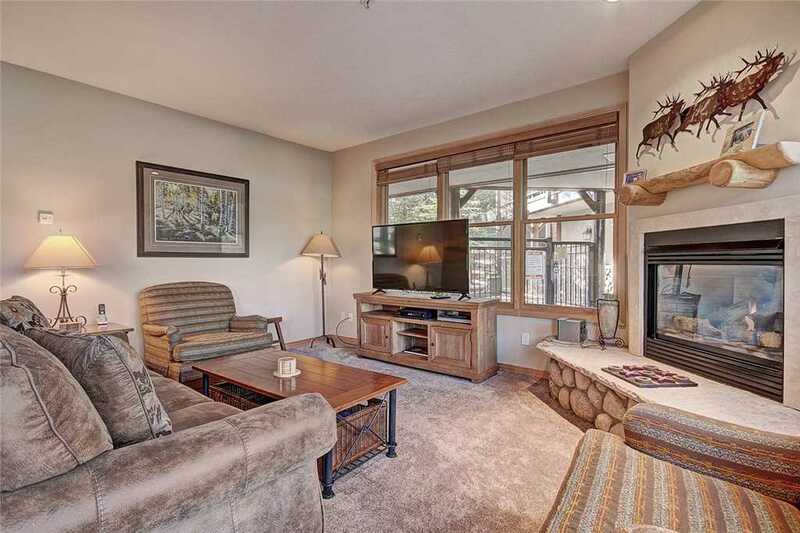 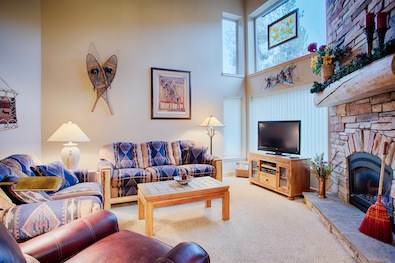 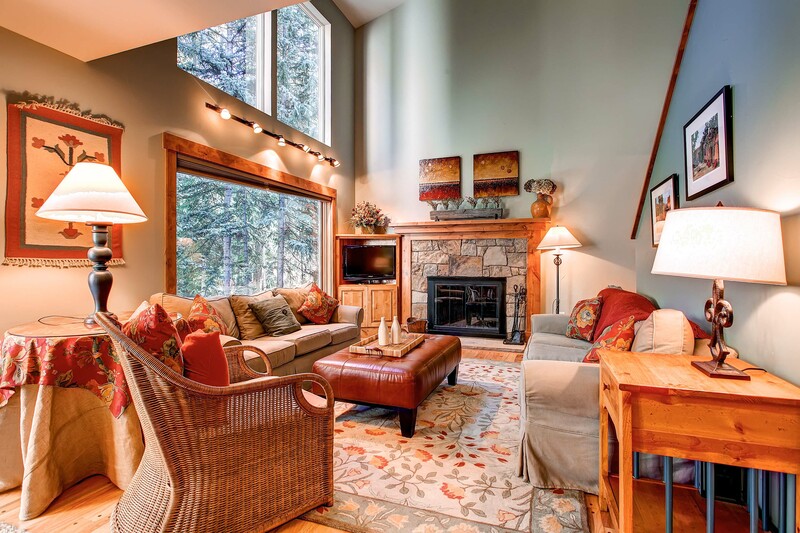 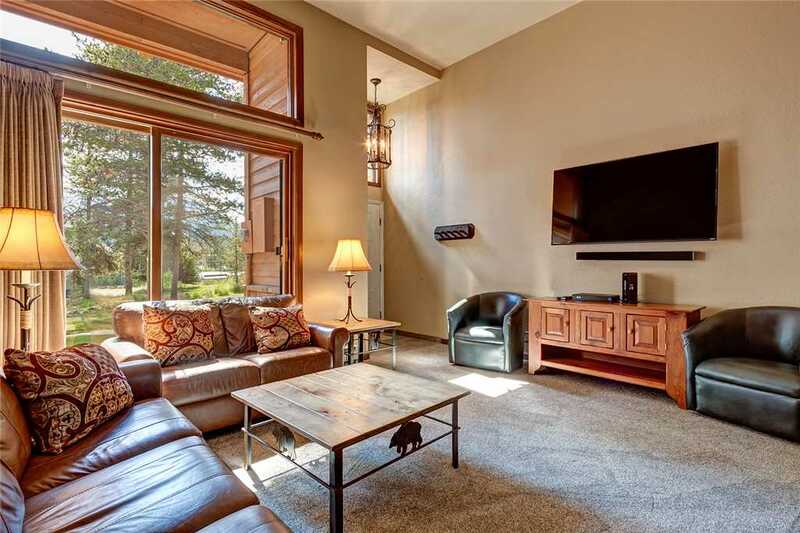 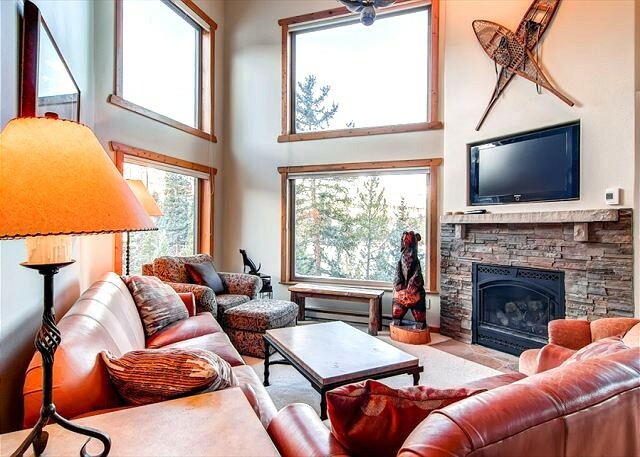 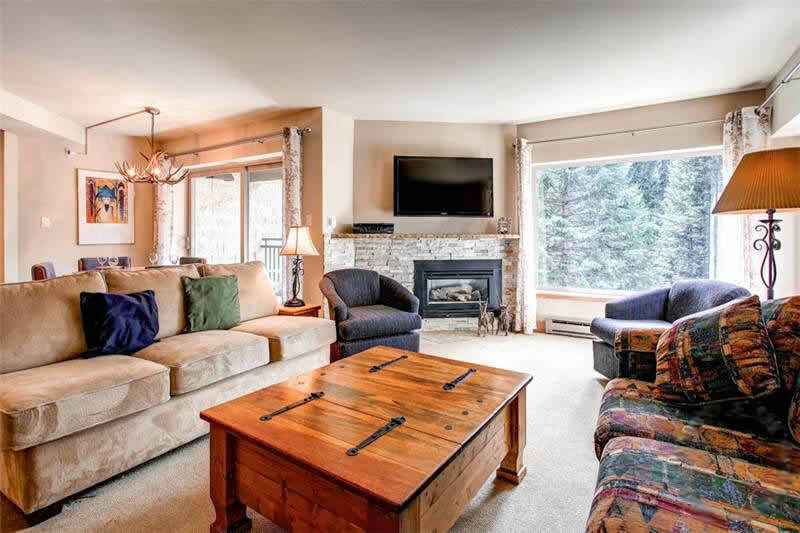 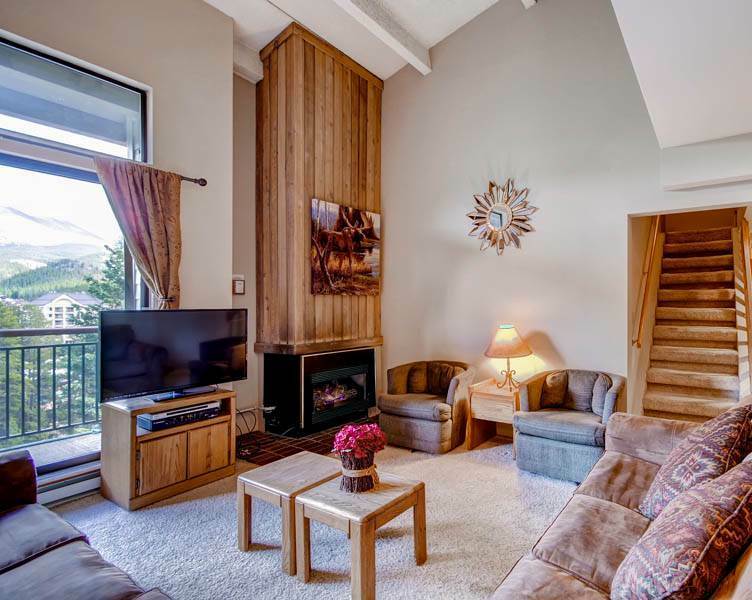 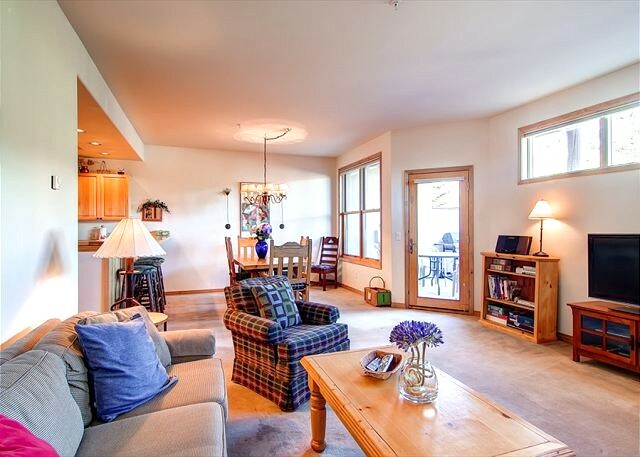 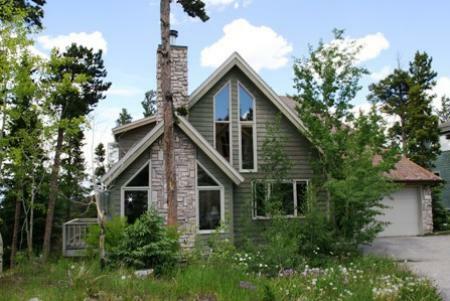 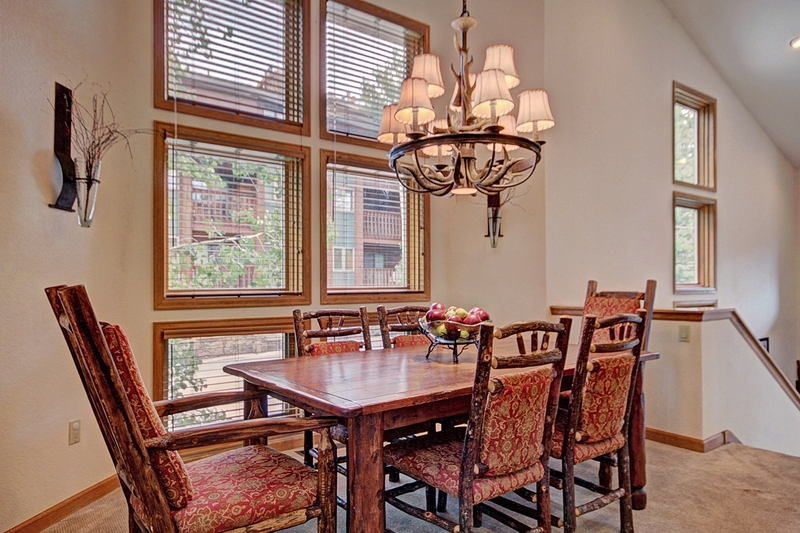 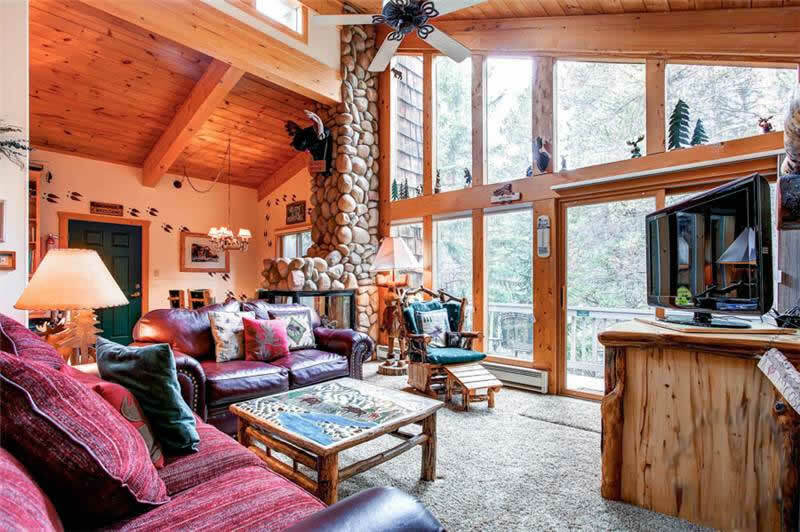 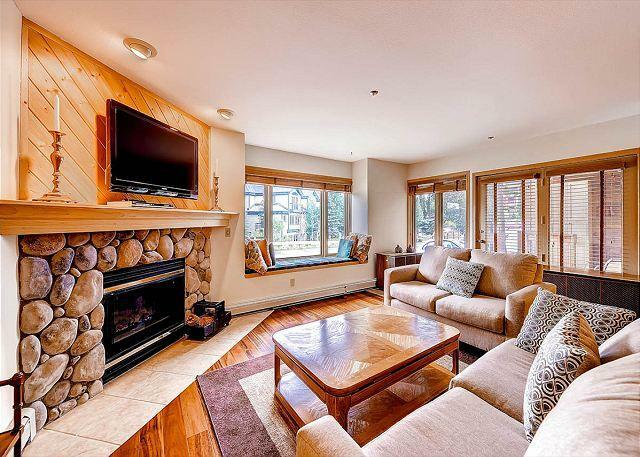 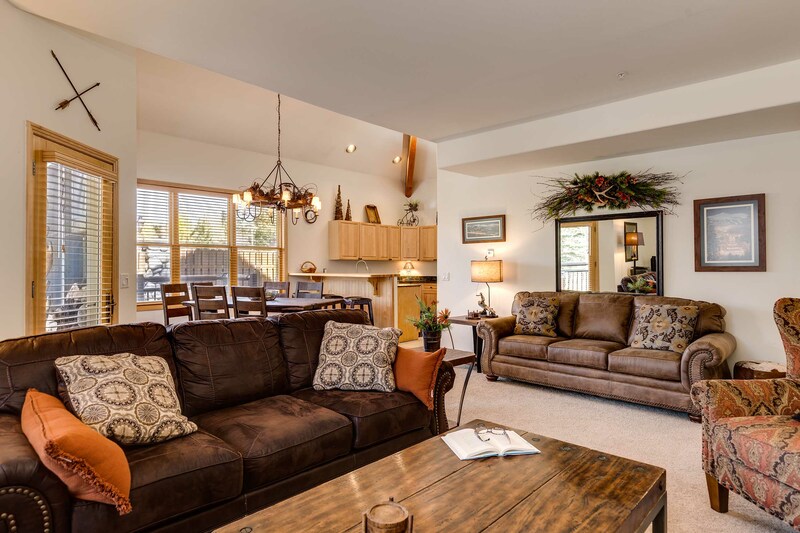 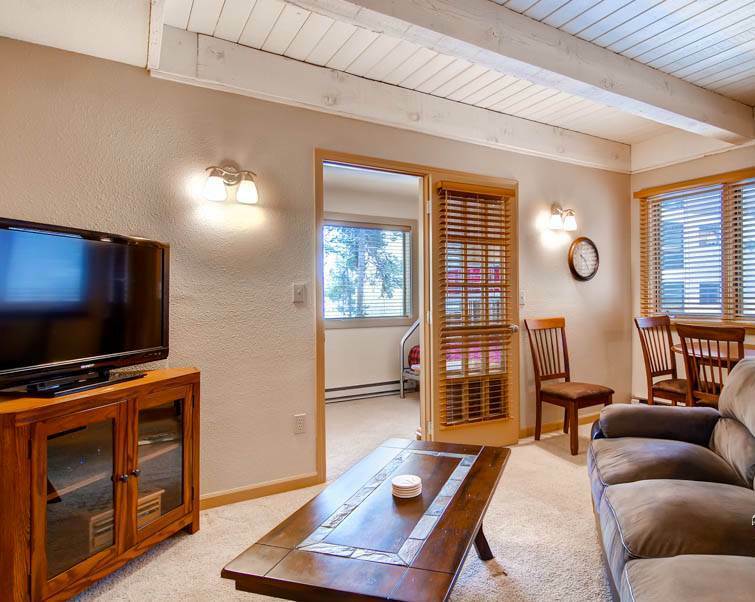 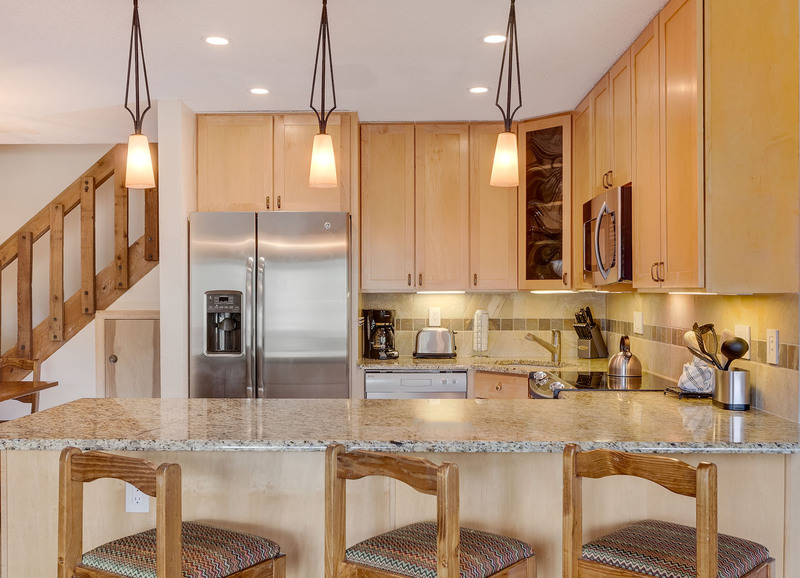 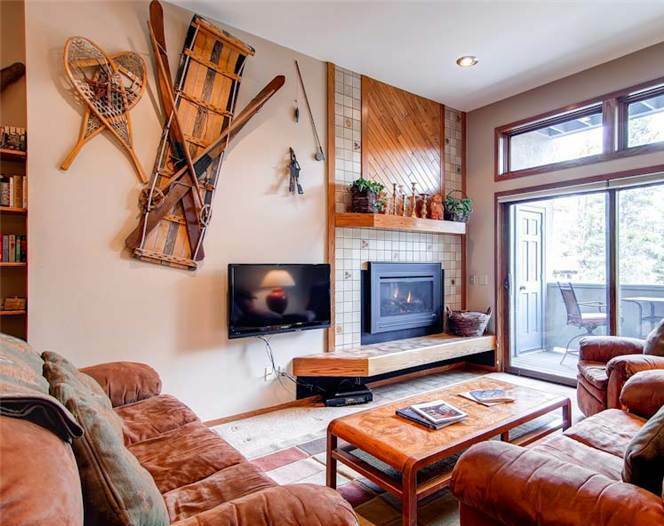 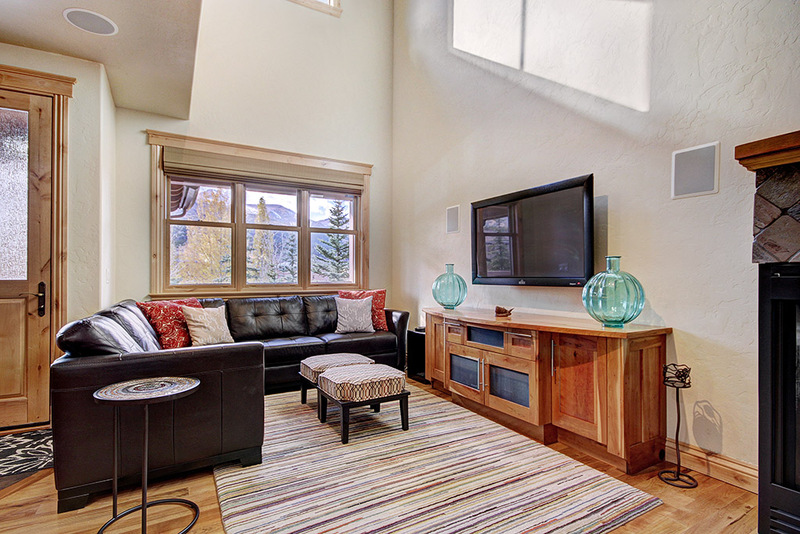 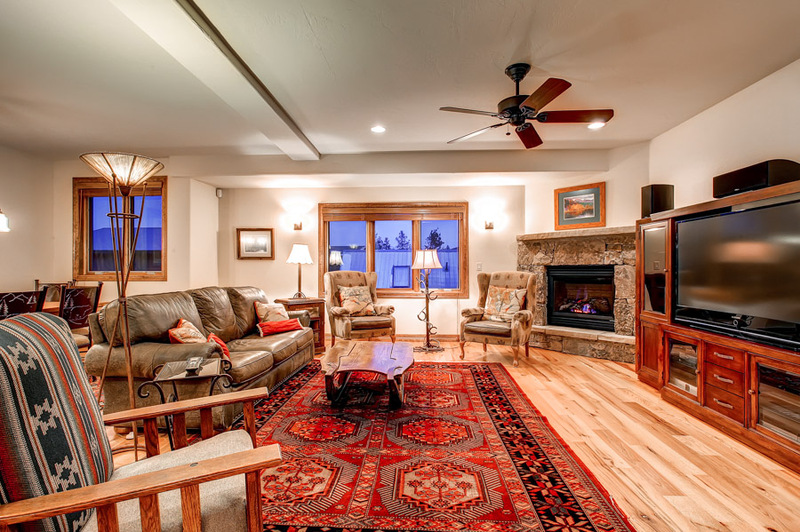 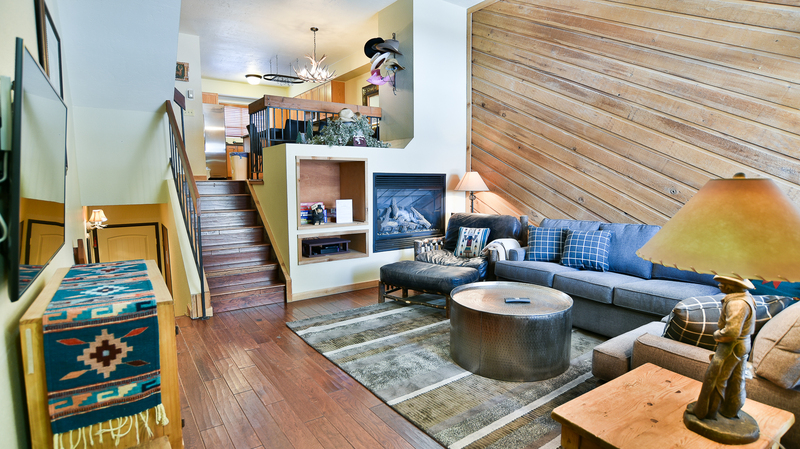 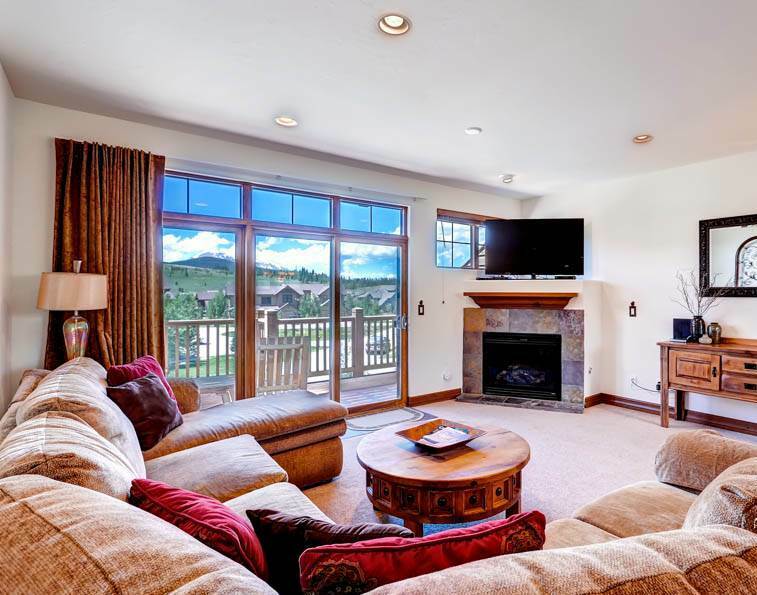 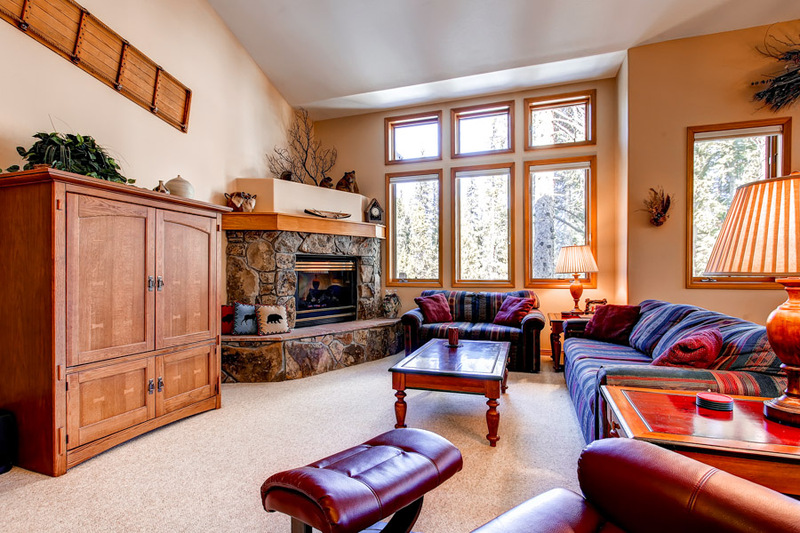 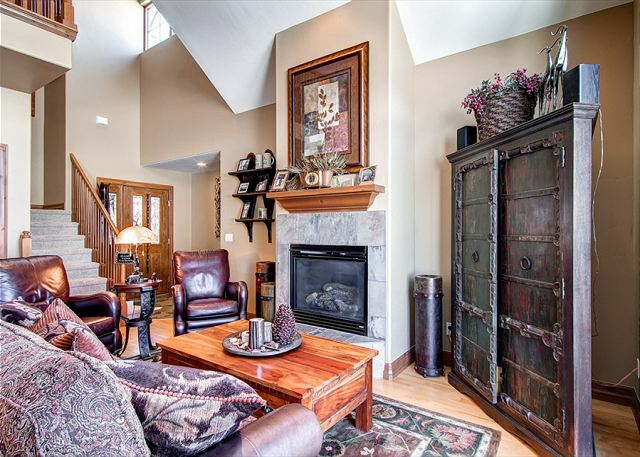 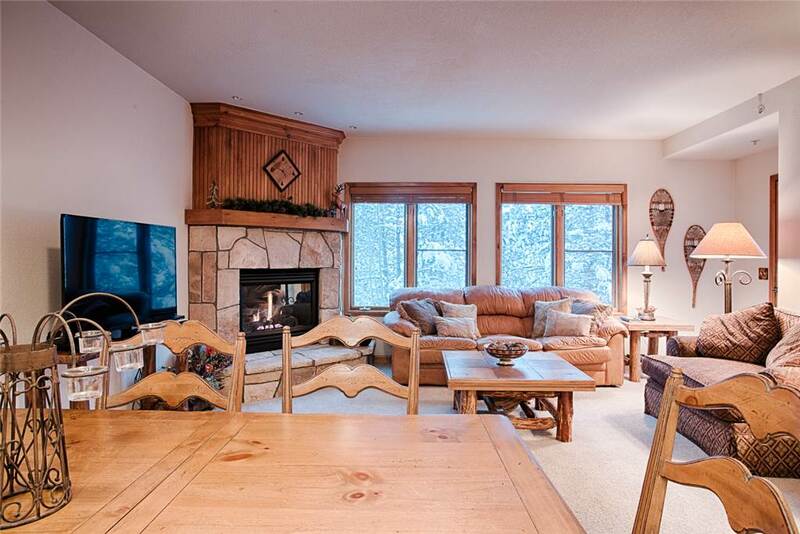 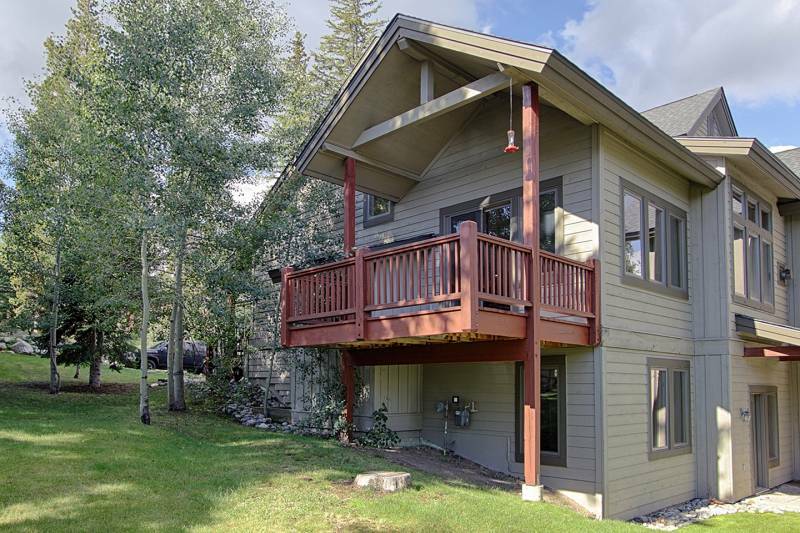 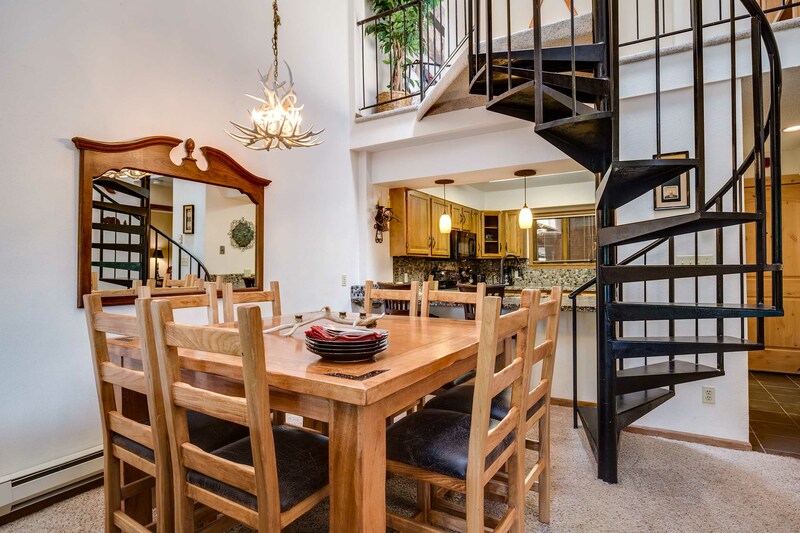 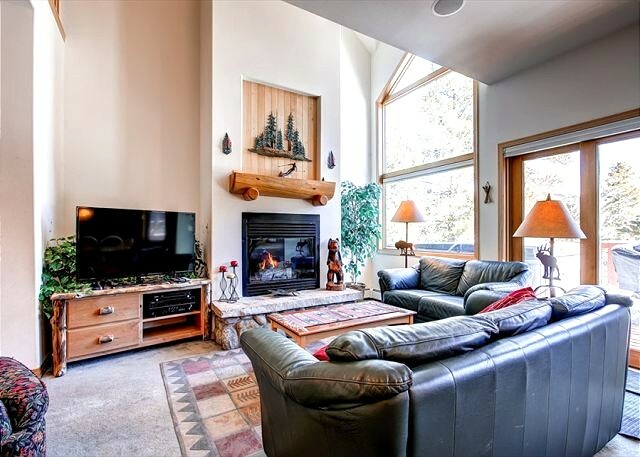 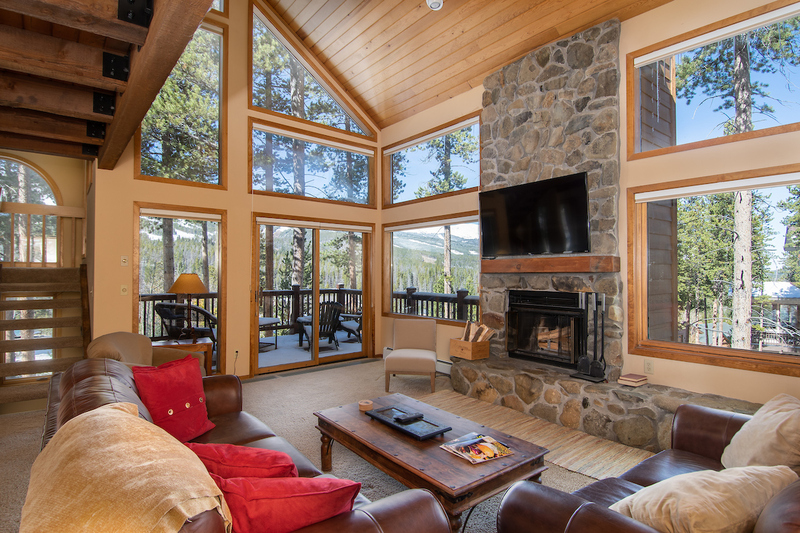 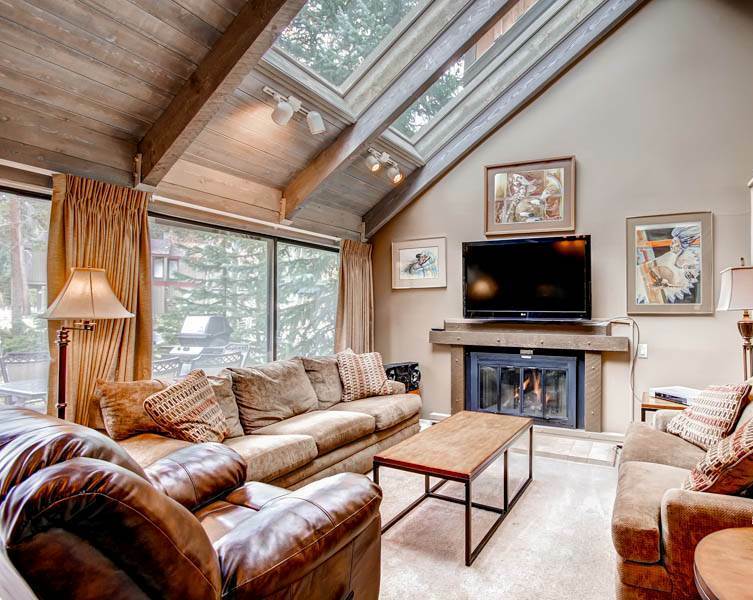 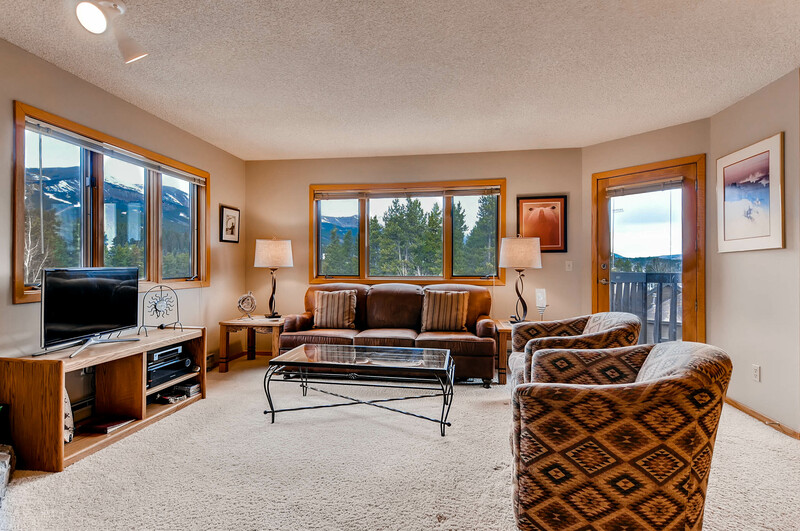 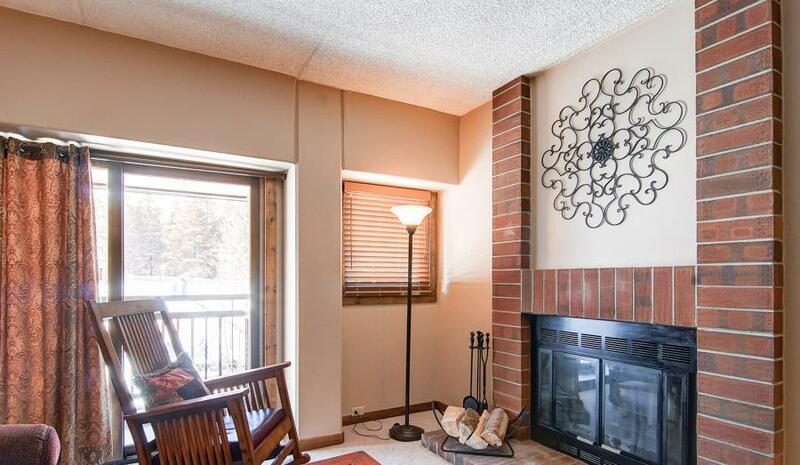 This two-story centrally located stylish townhome located just across the street from the Jack Nicklaus designed, 27-hole golf course and the Breckenridge Nordic Center offers a close proximity to five world class ski resorts. 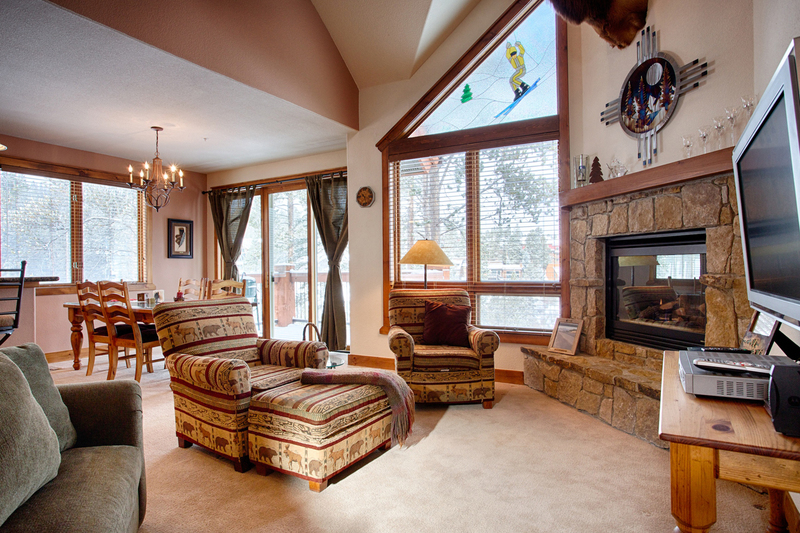 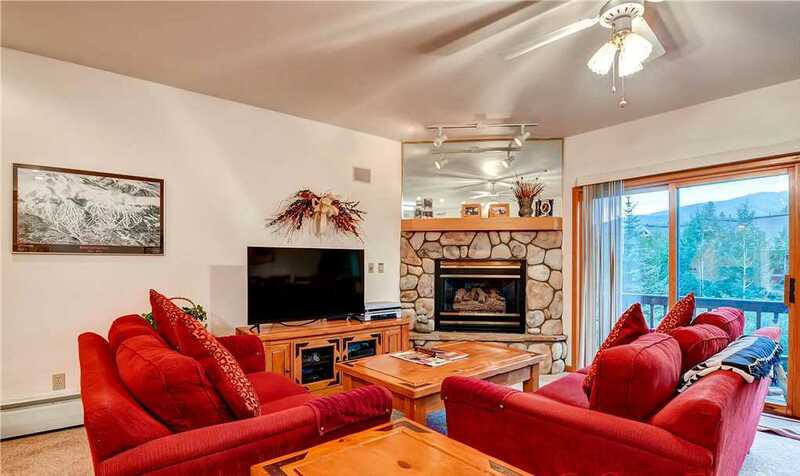 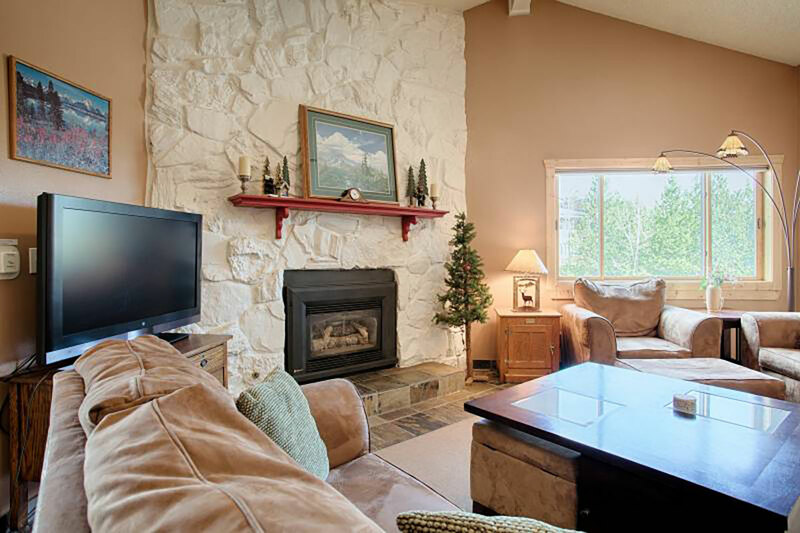 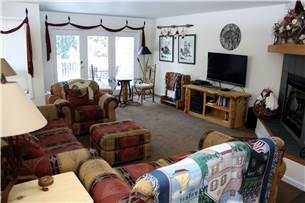 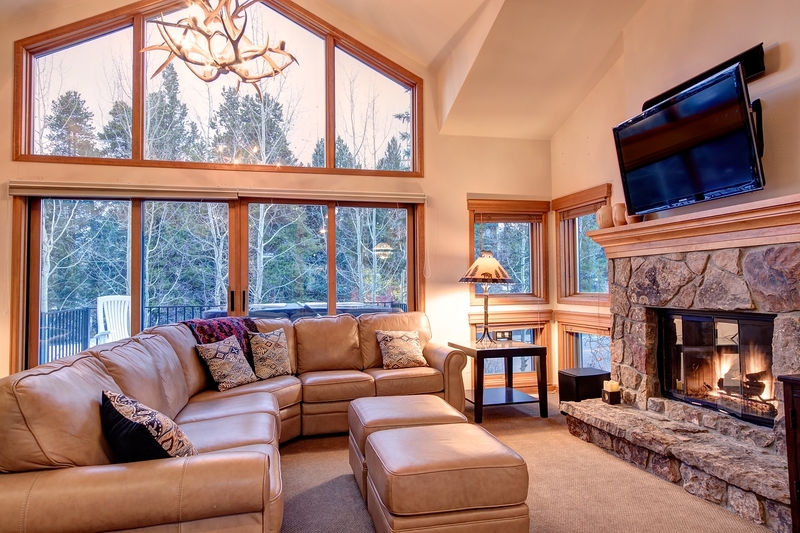 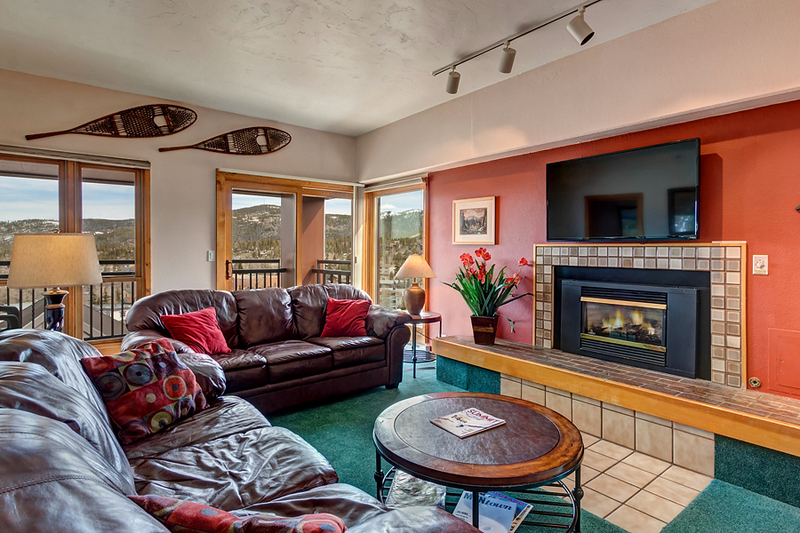 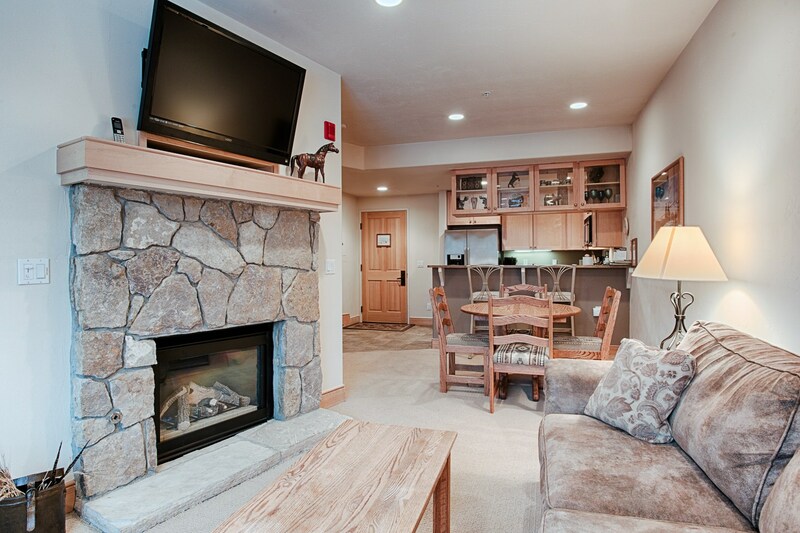 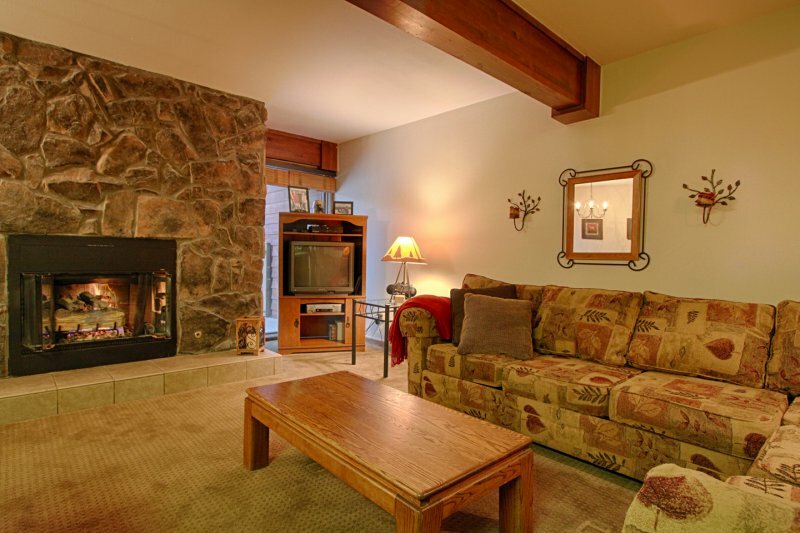 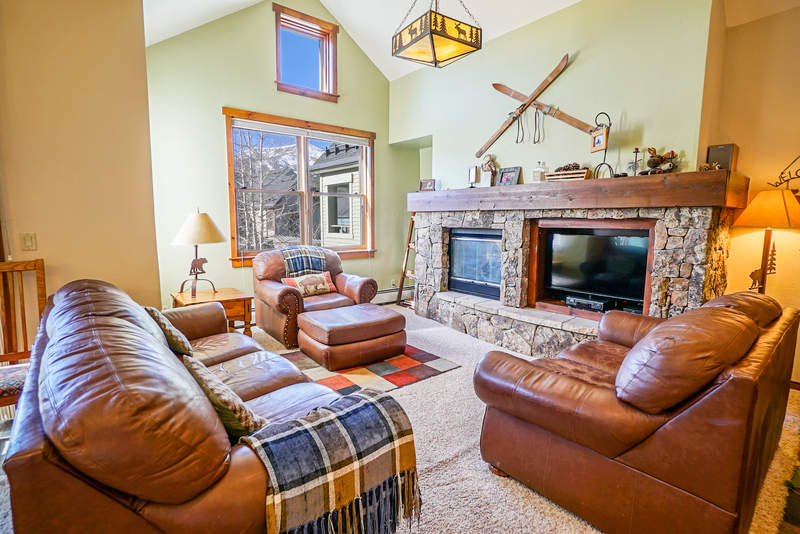 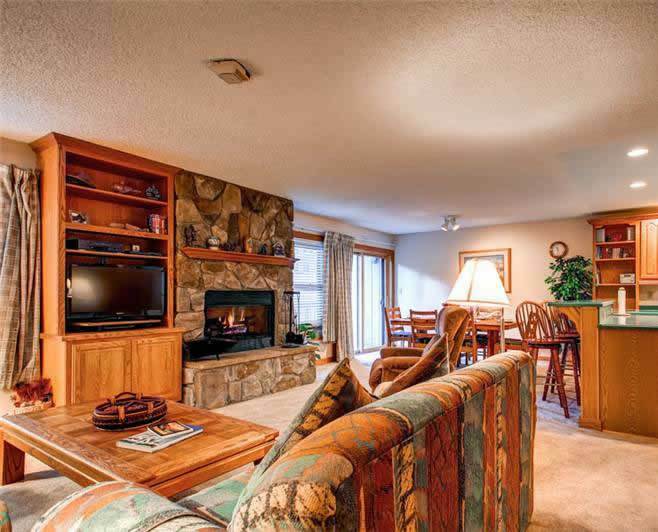 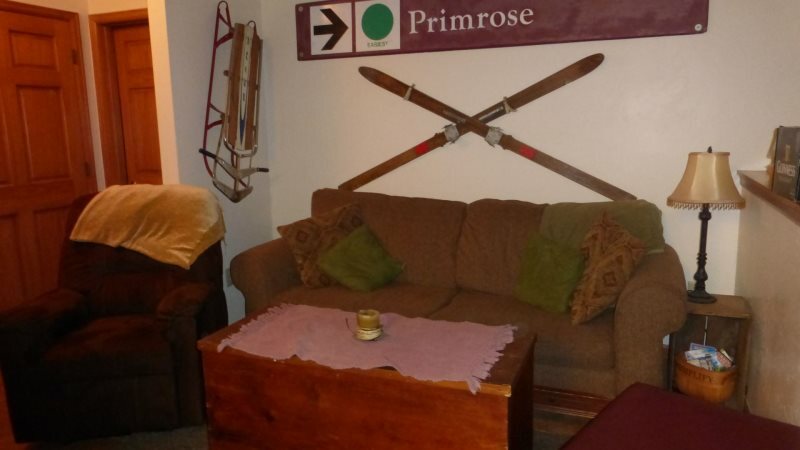 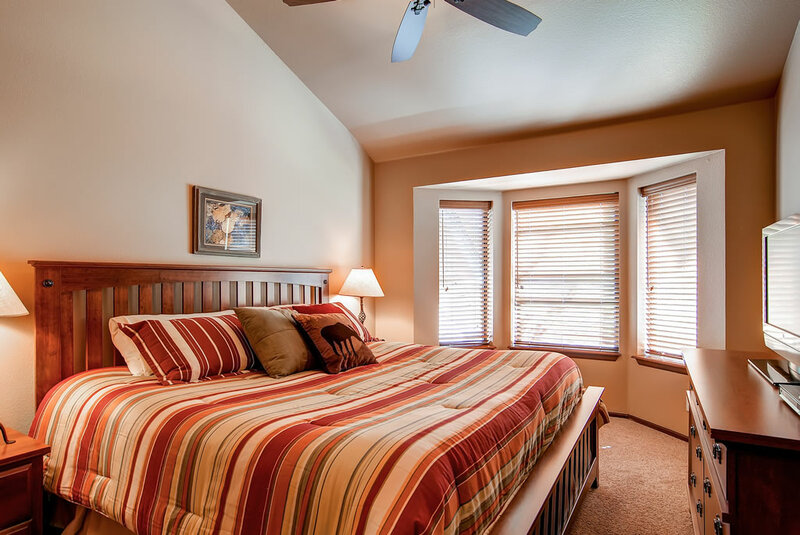 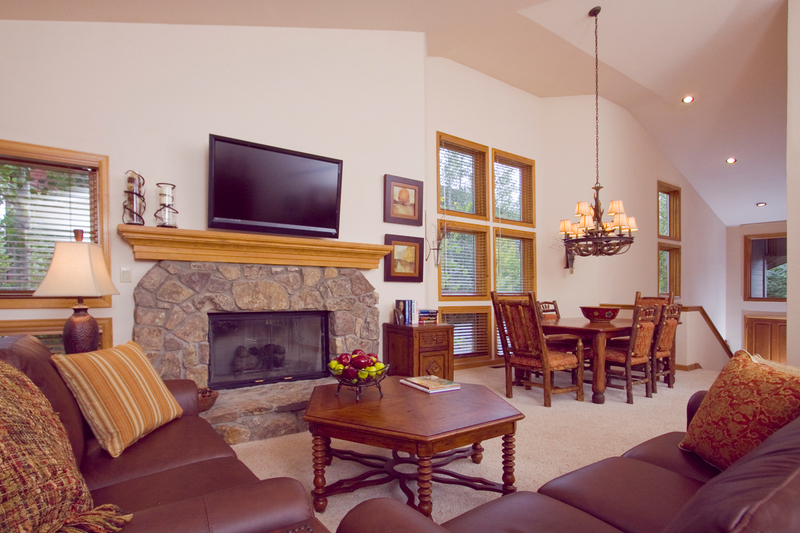 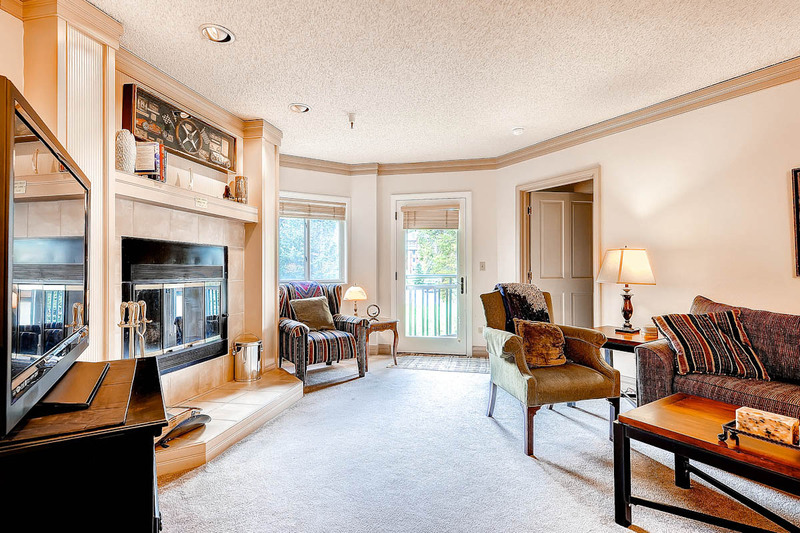 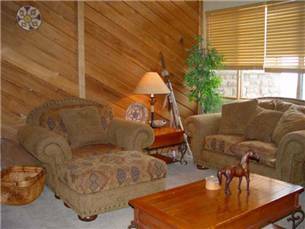 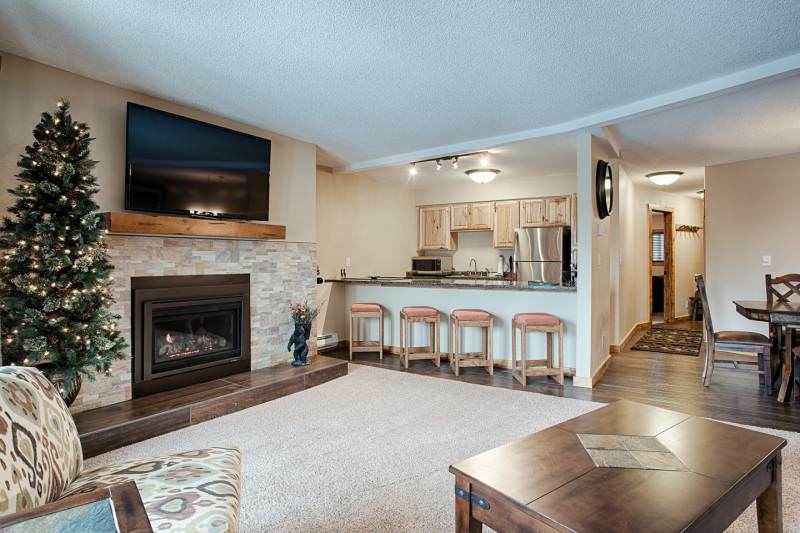 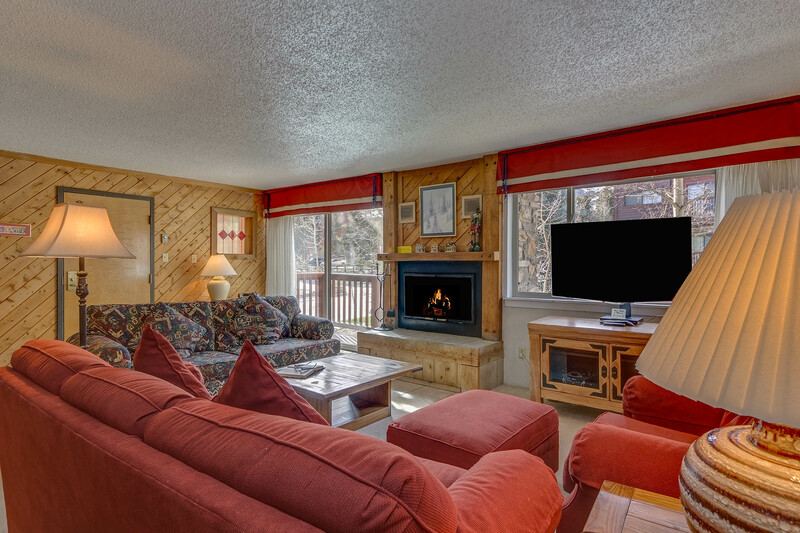 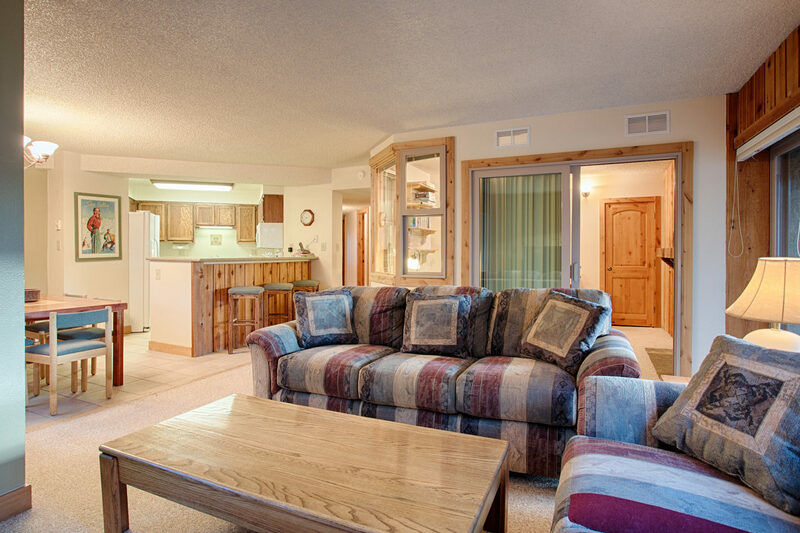 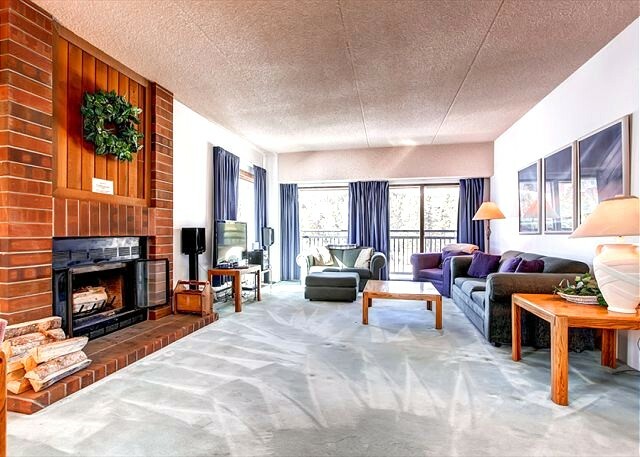 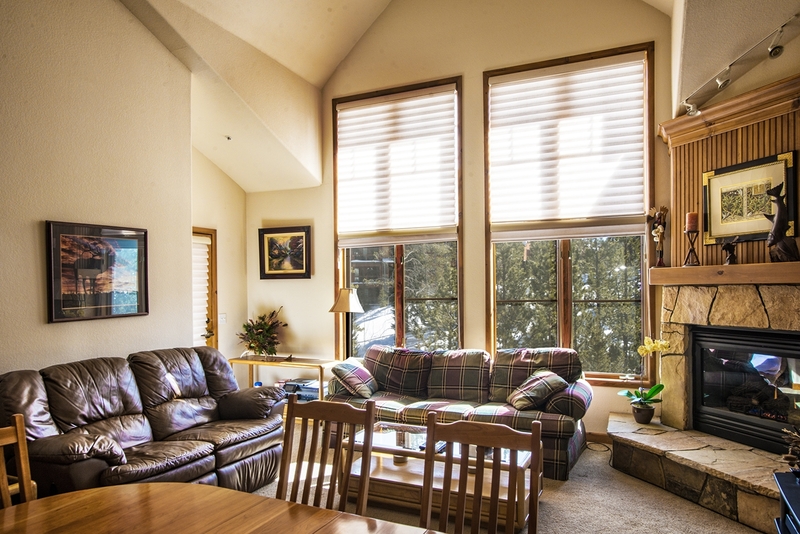 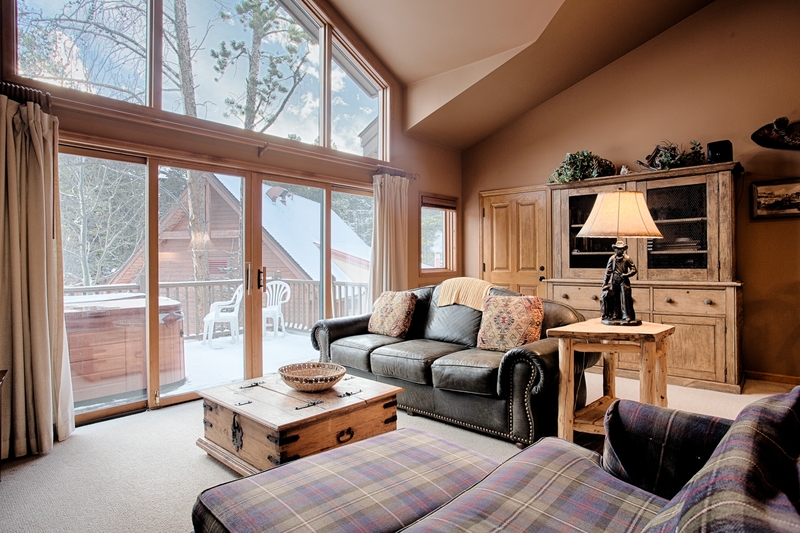 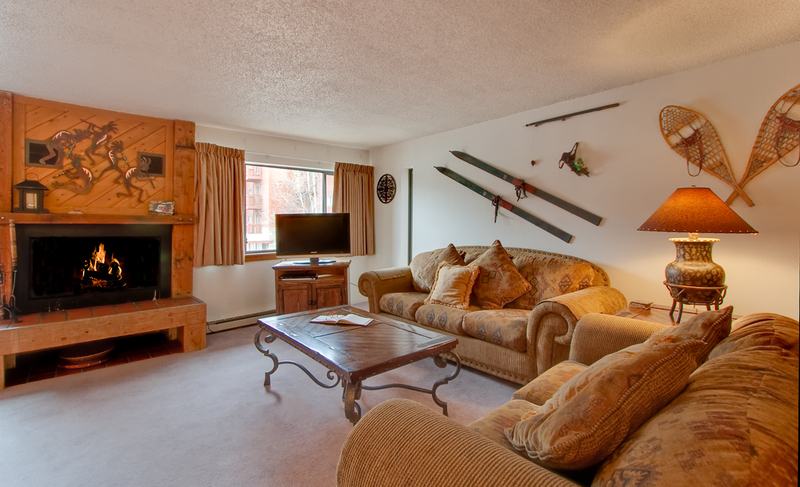 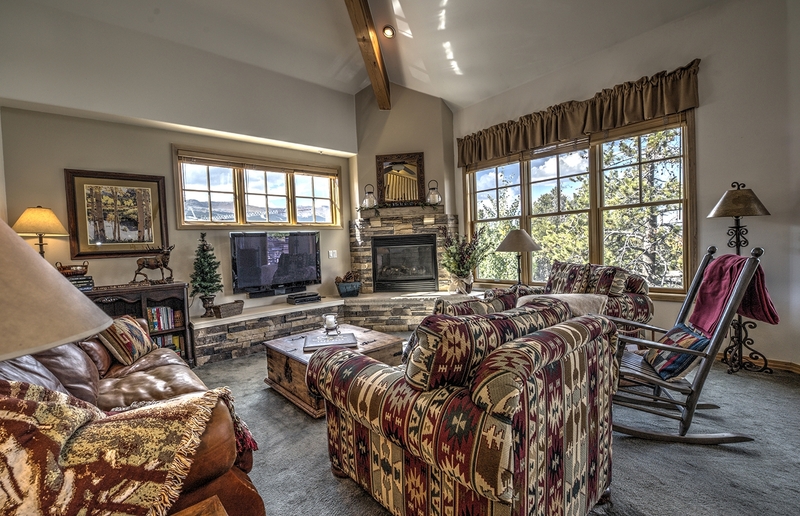 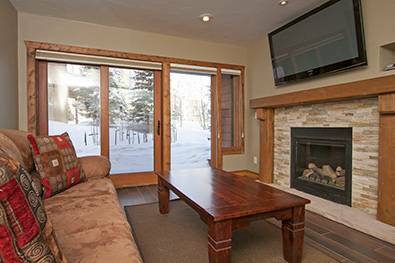 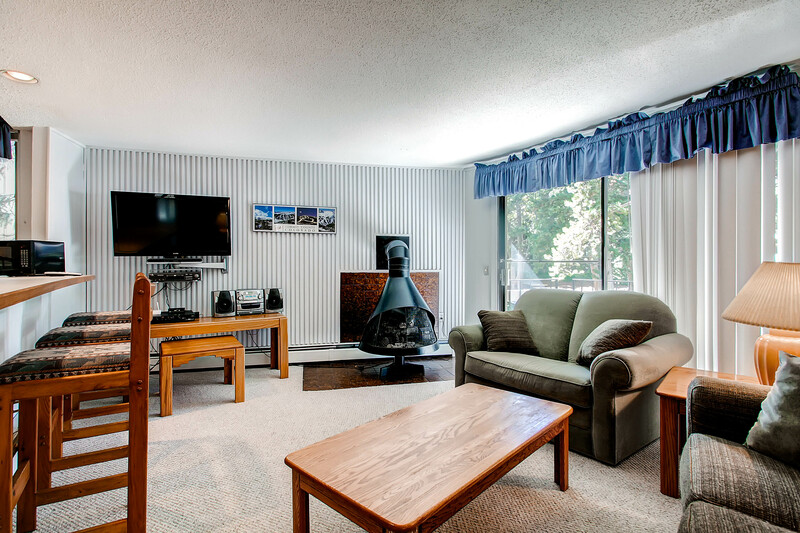 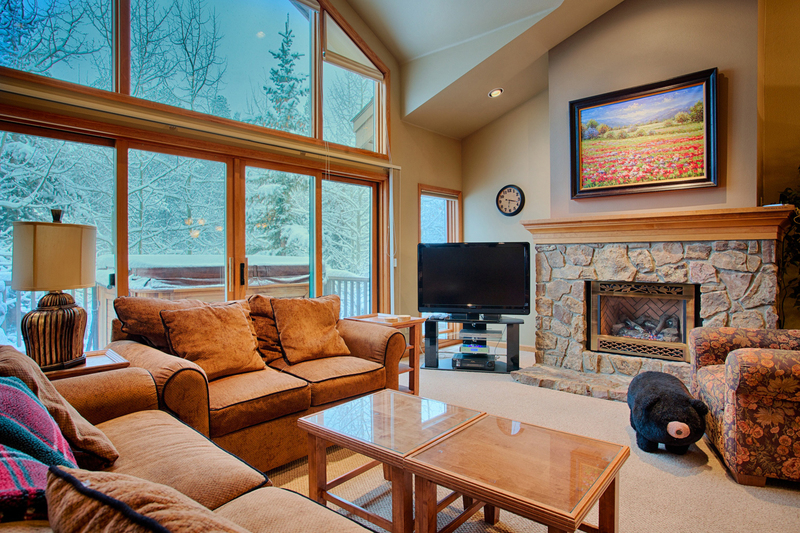 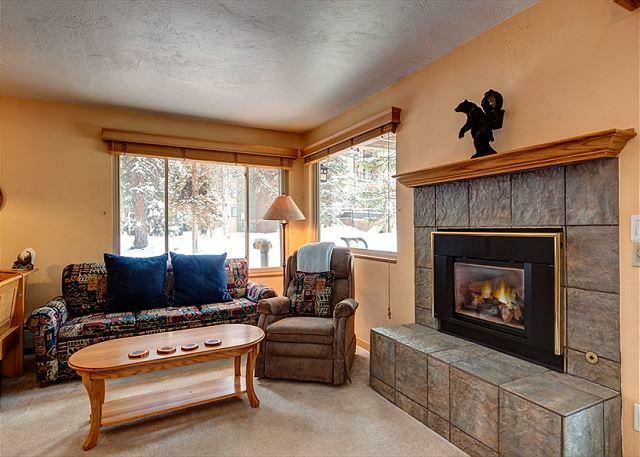 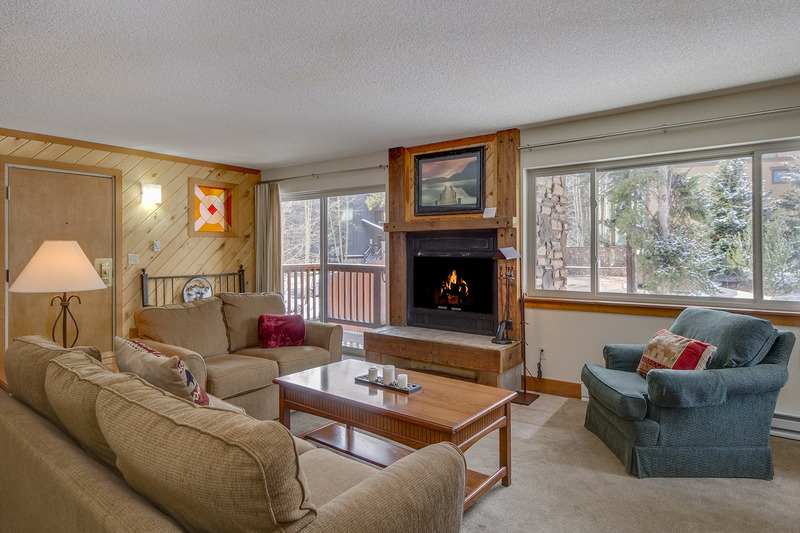 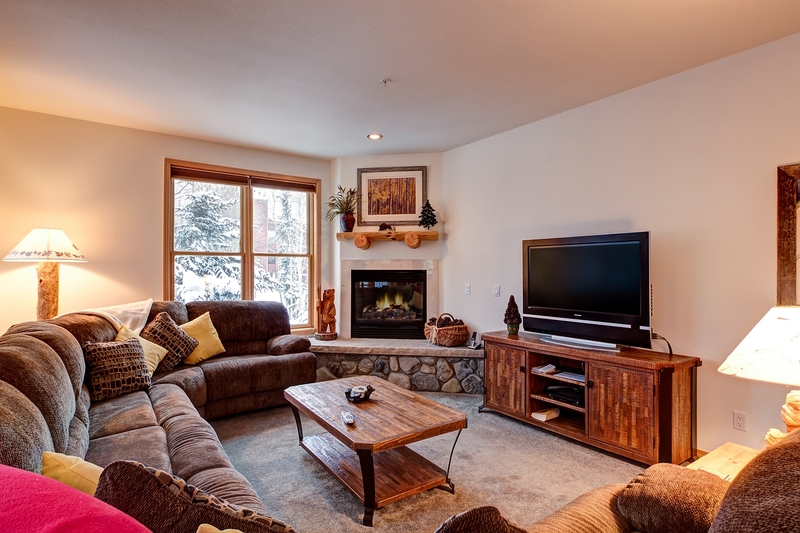 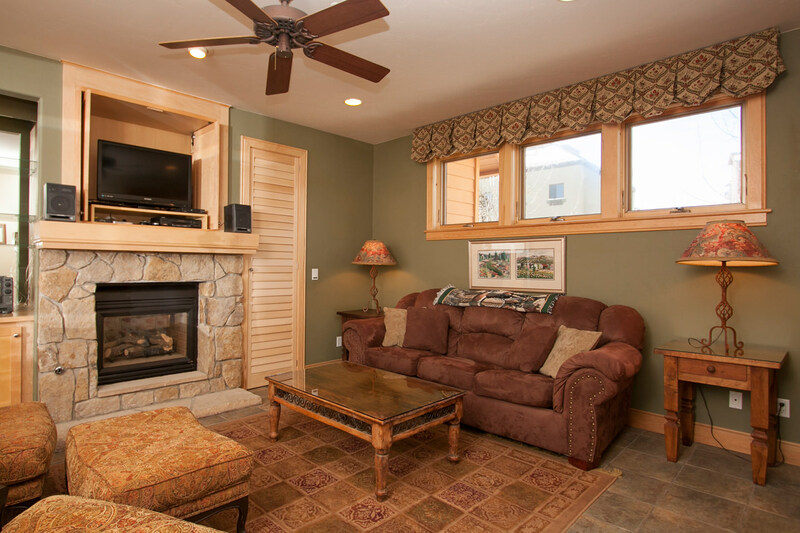 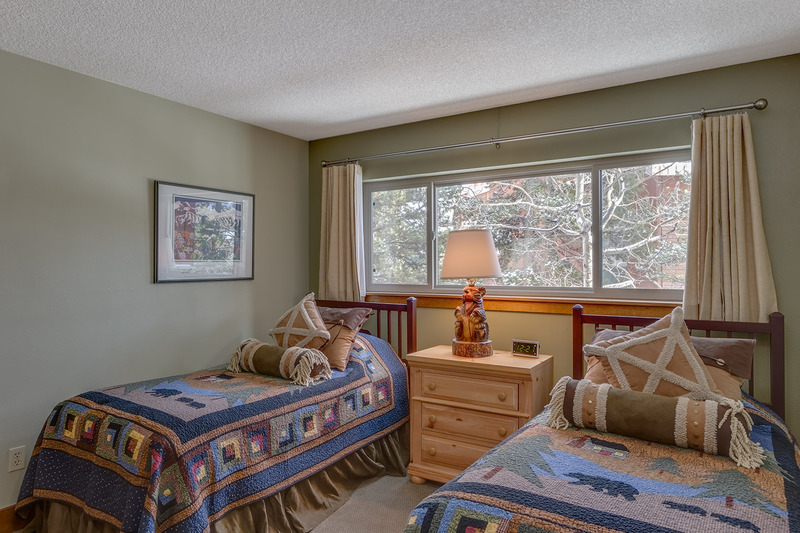 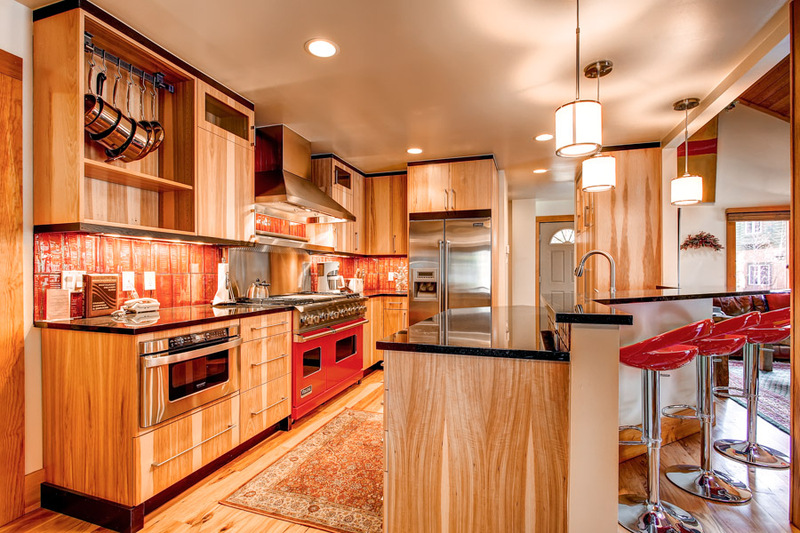 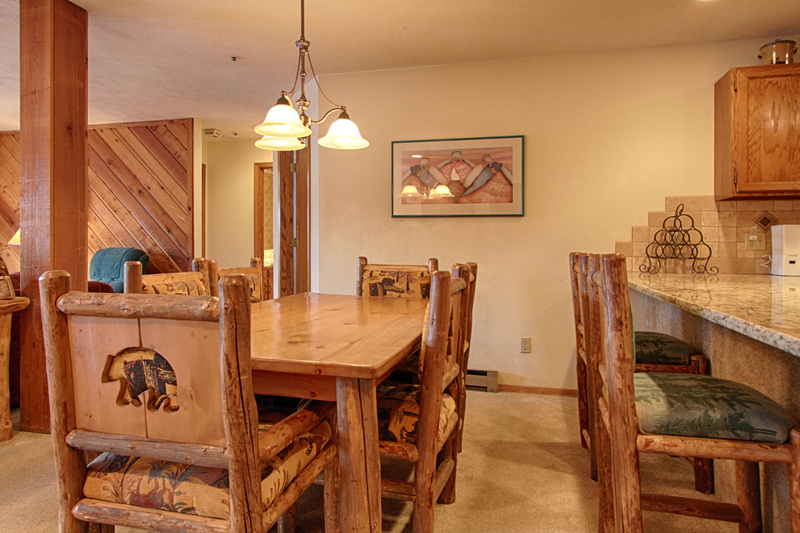 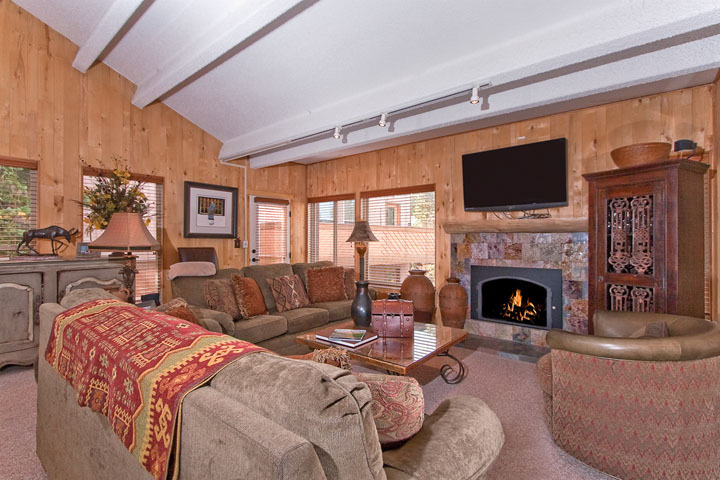 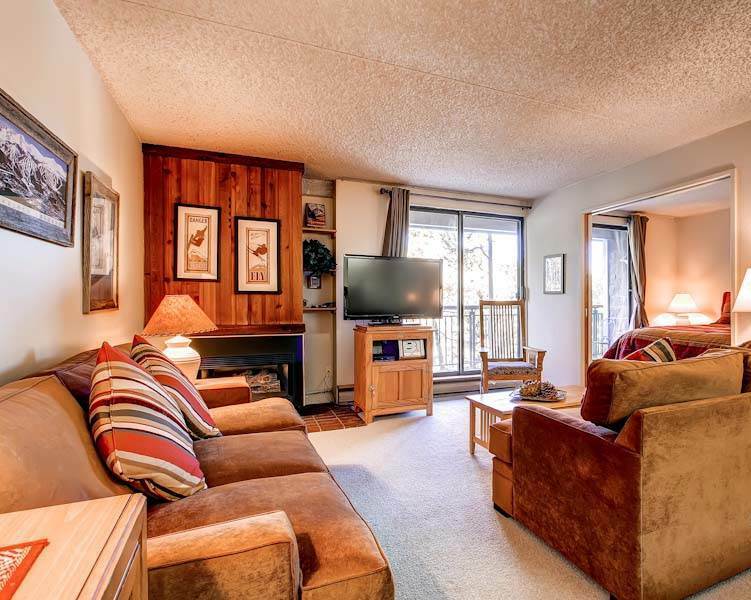 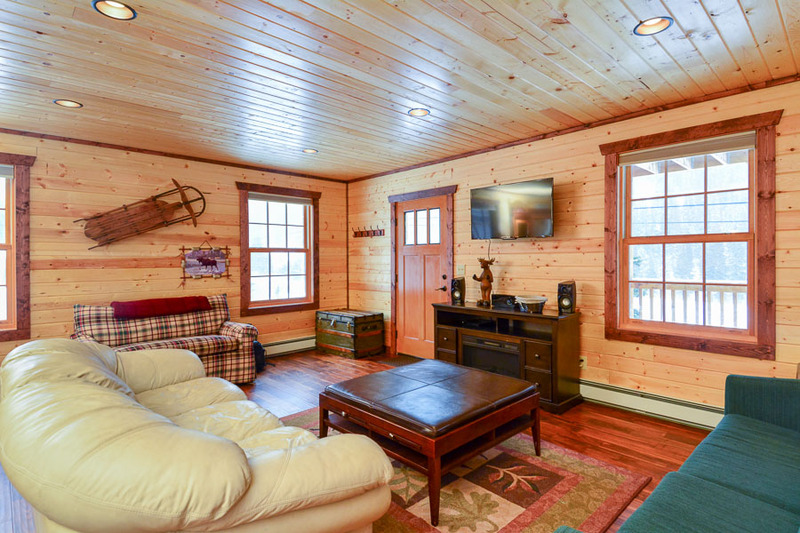 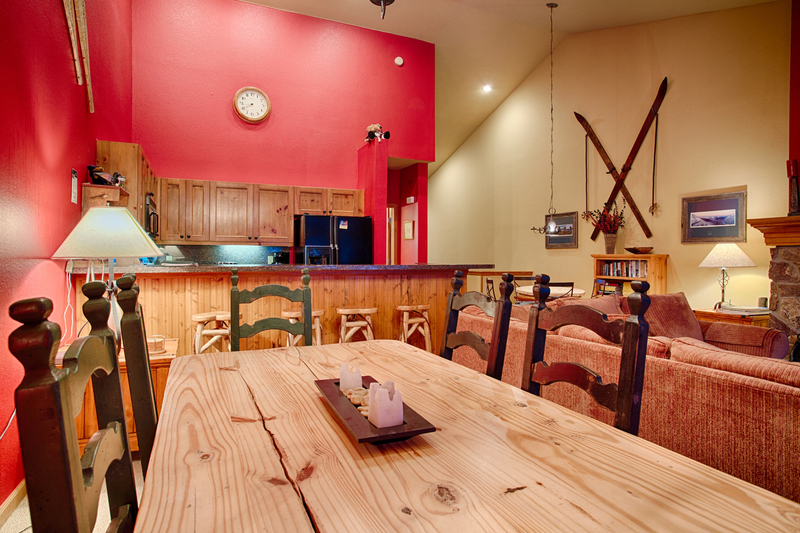 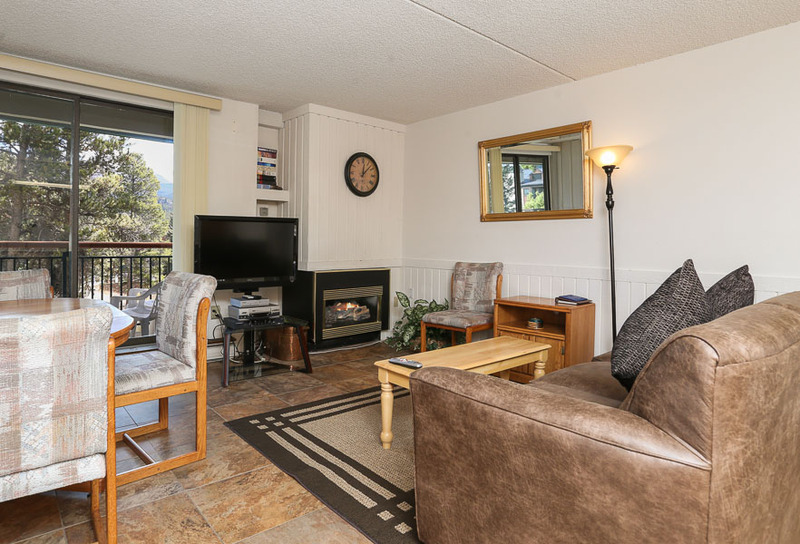 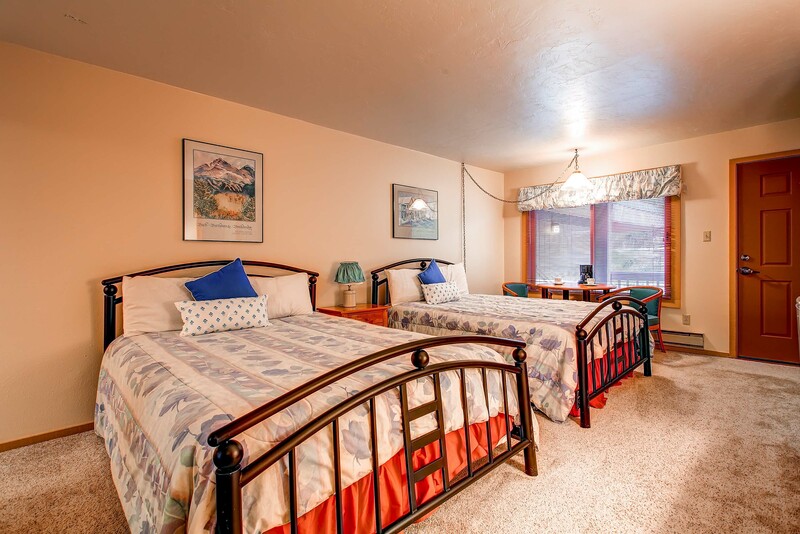 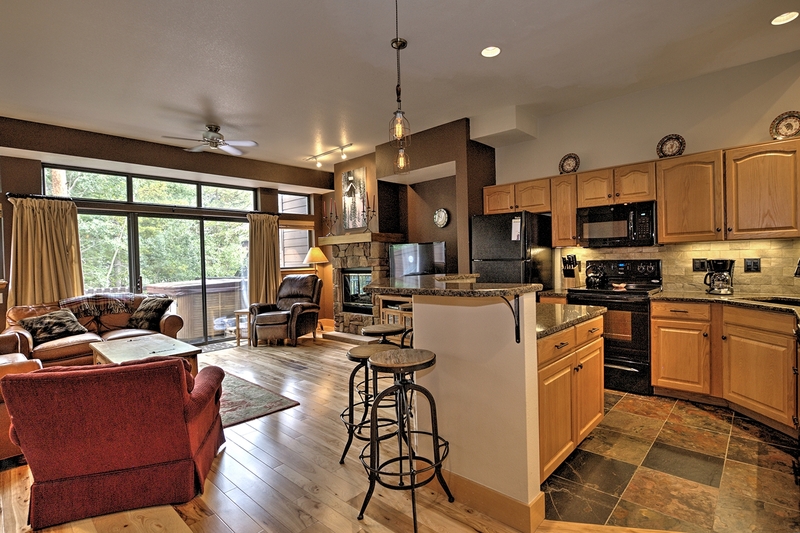 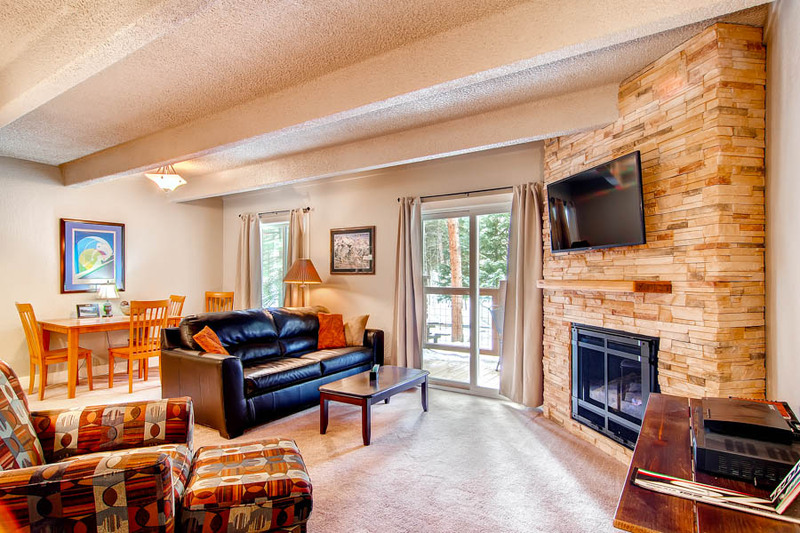 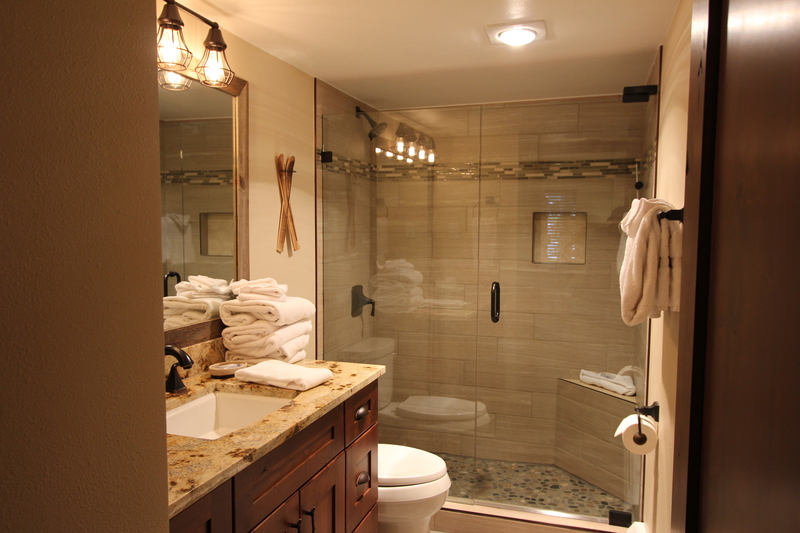 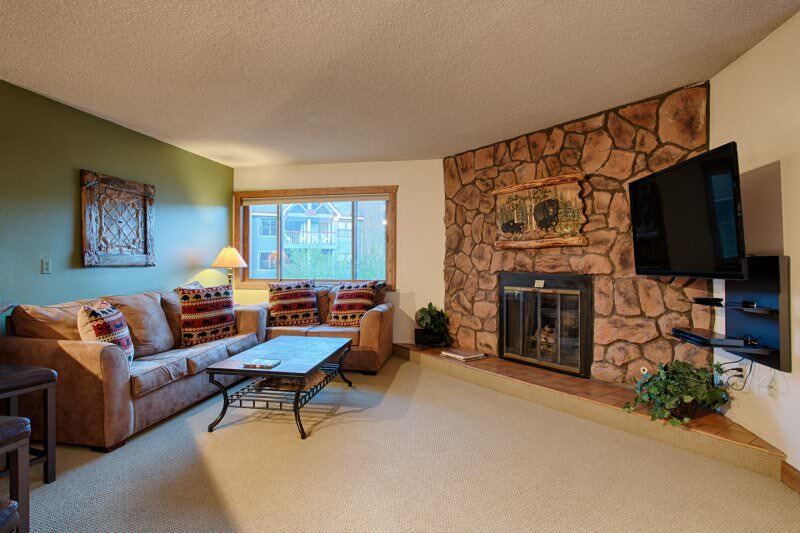 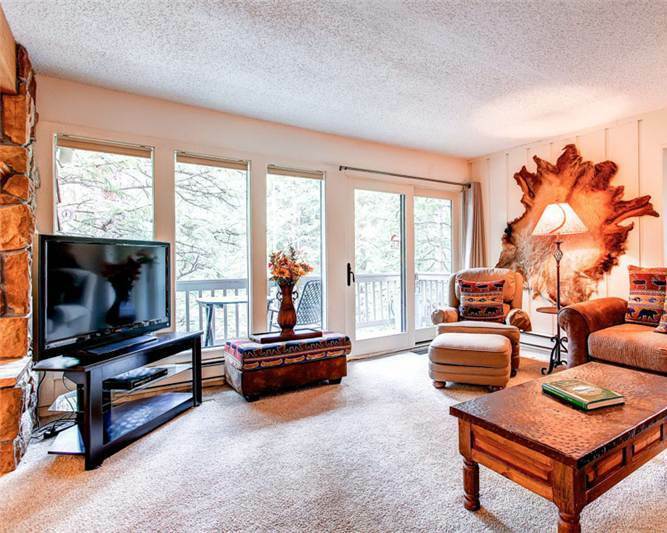 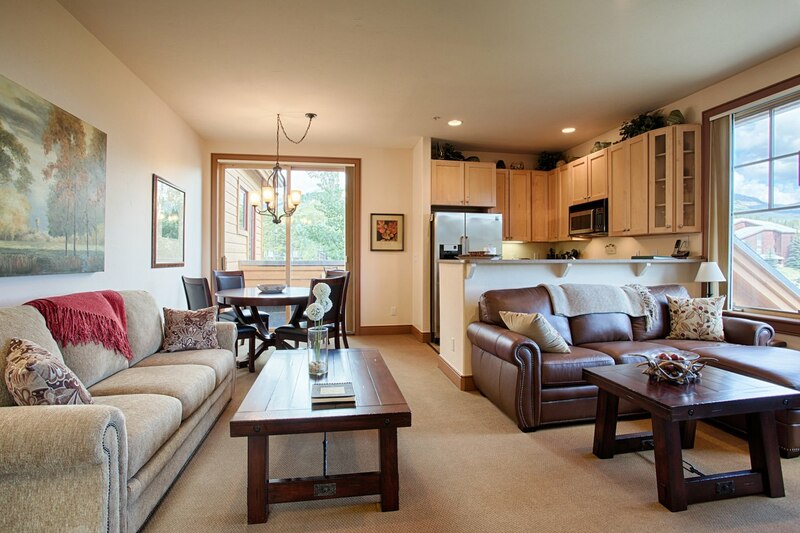 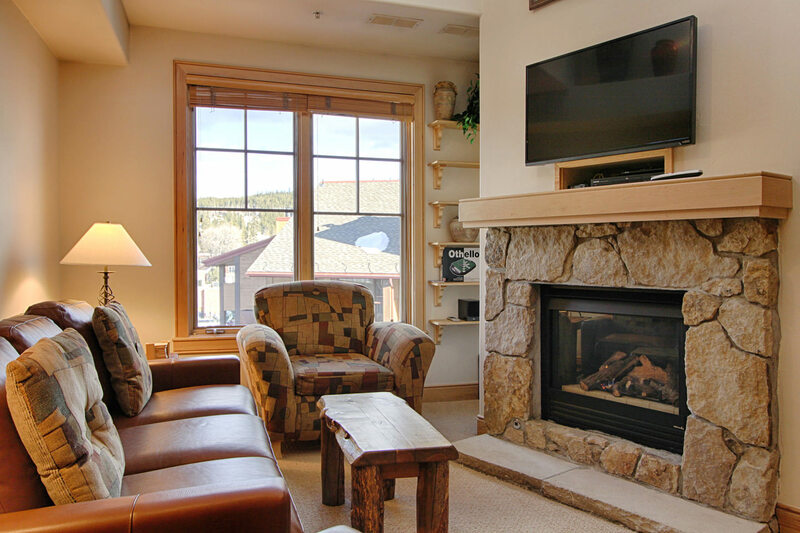 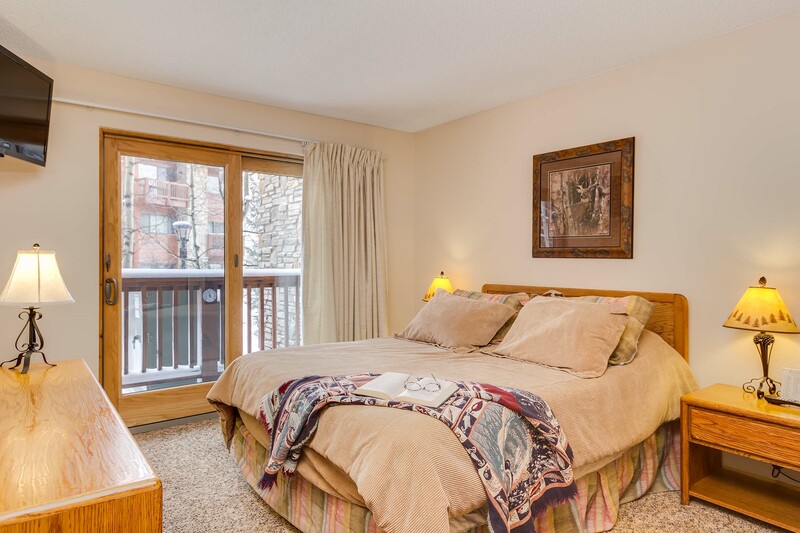 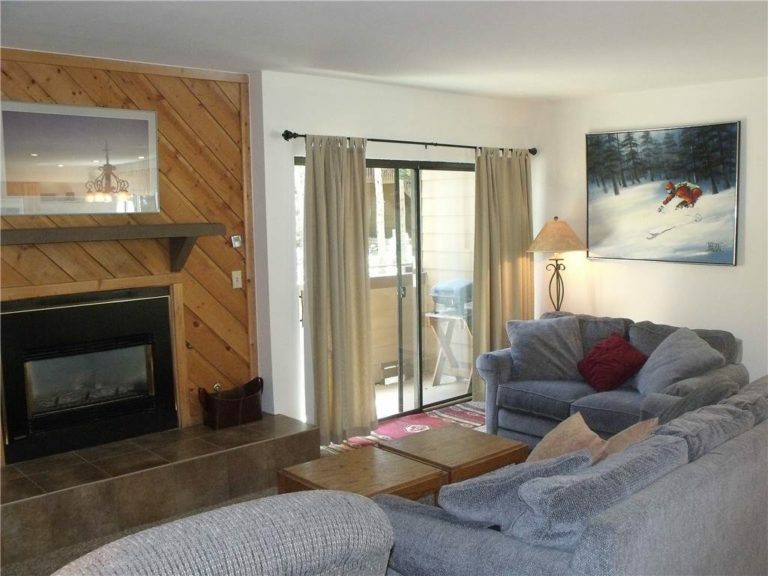 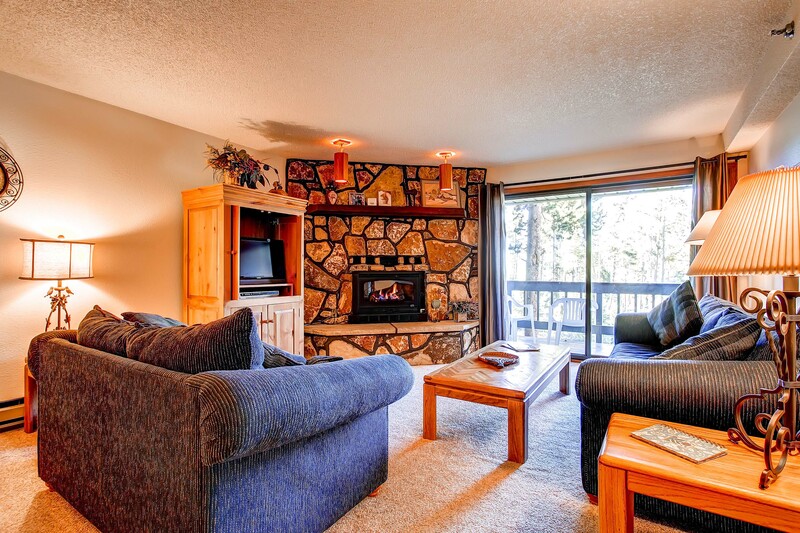 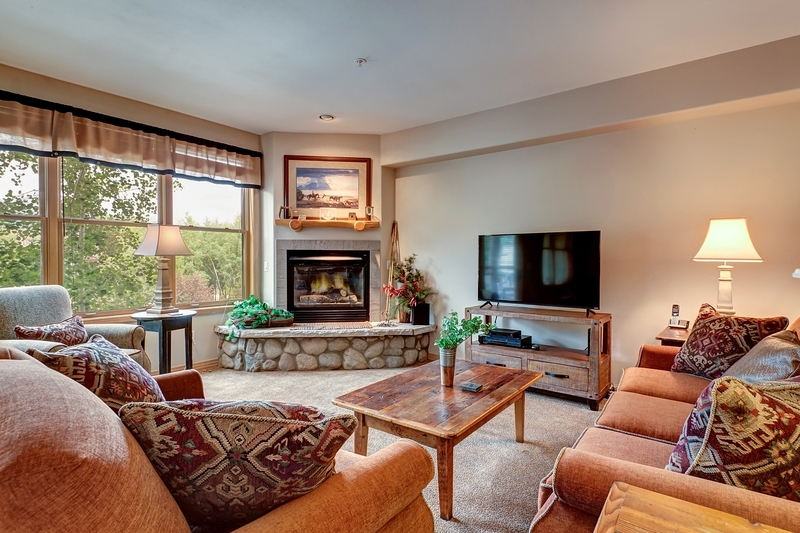 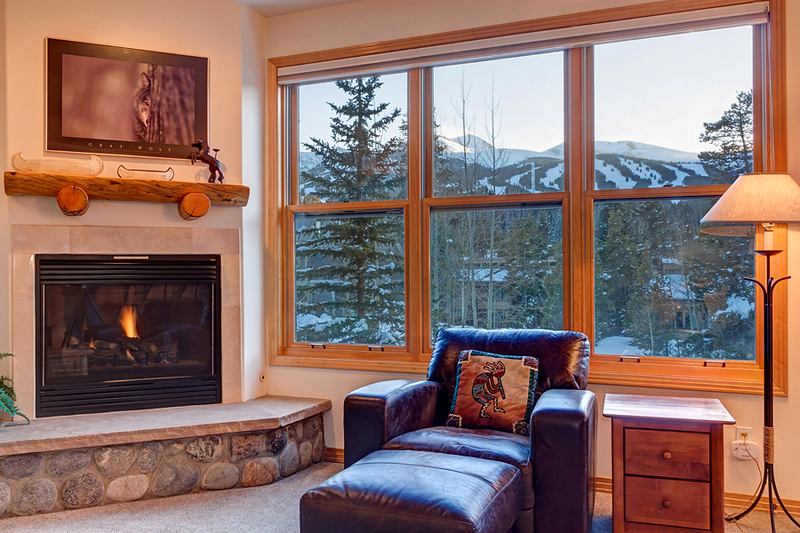 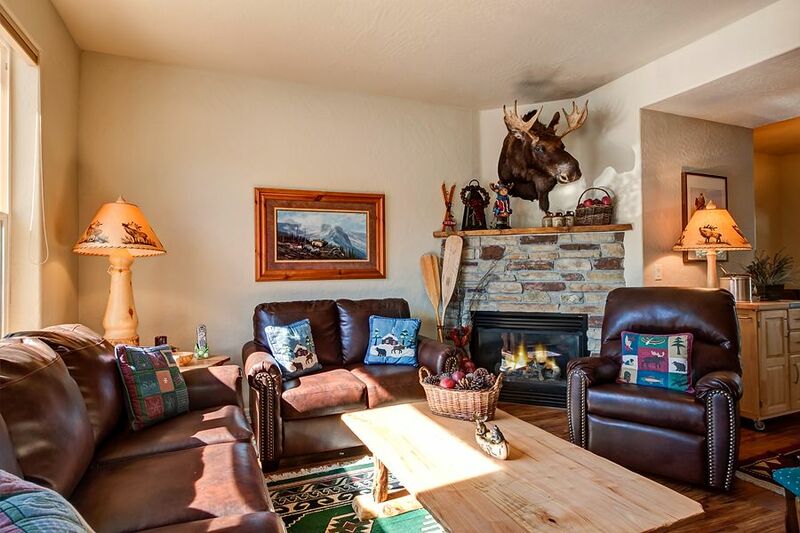 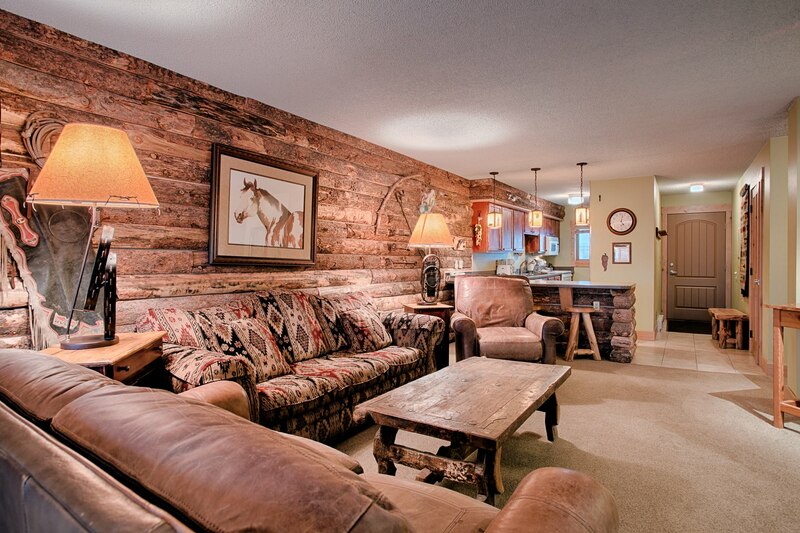 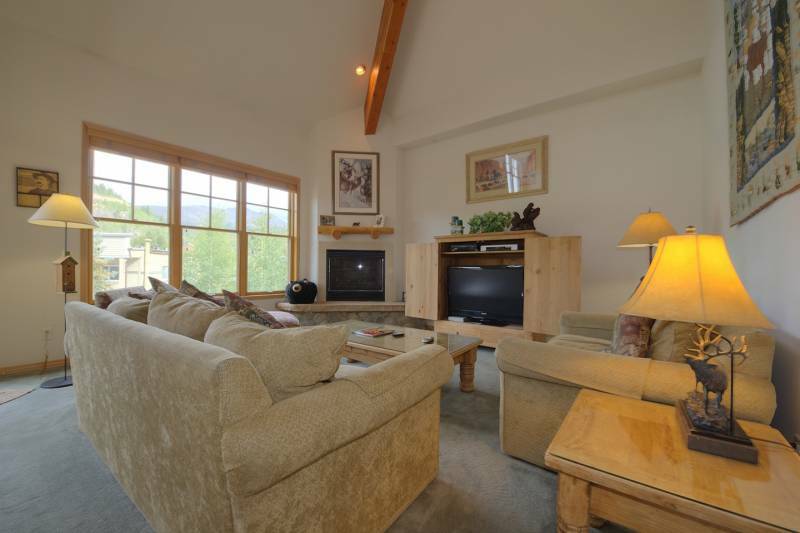 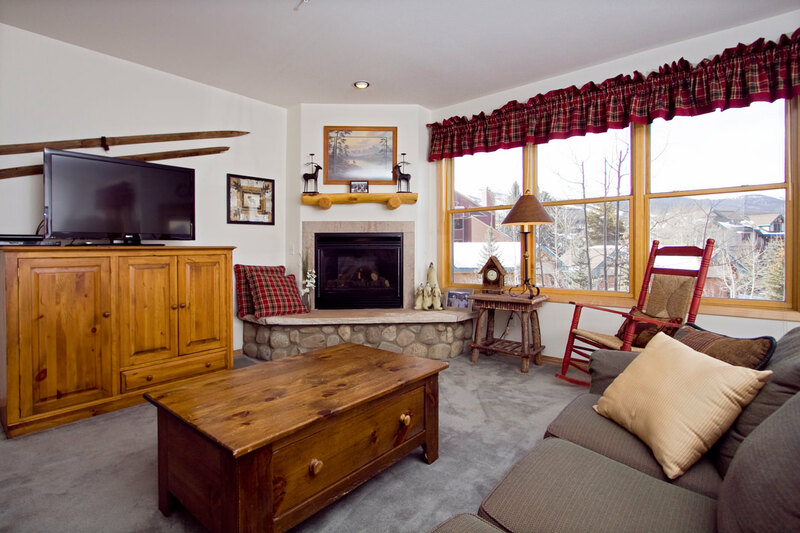 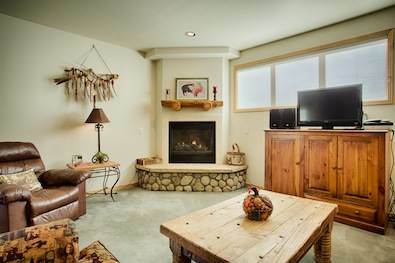 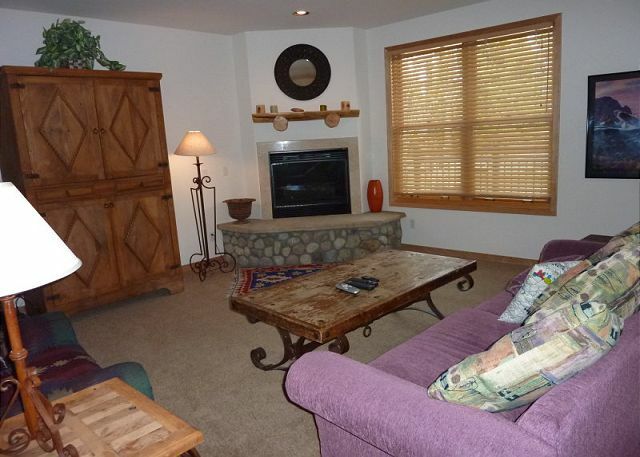 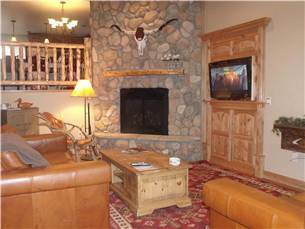 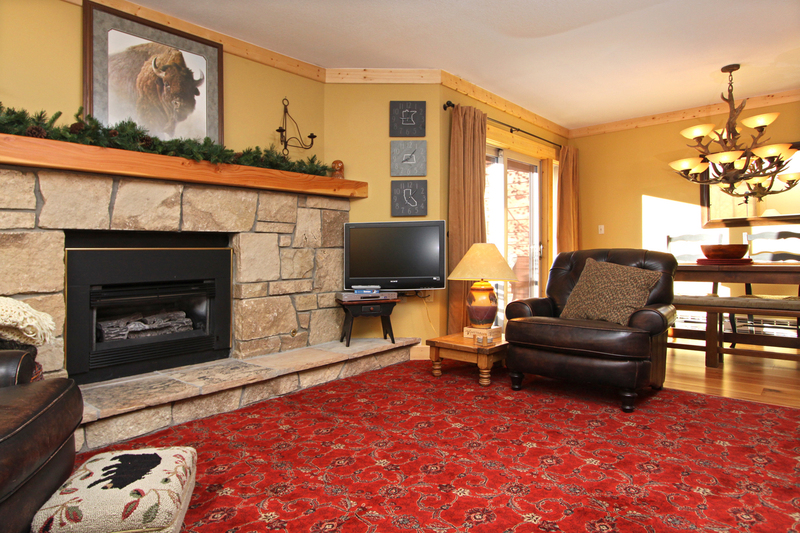 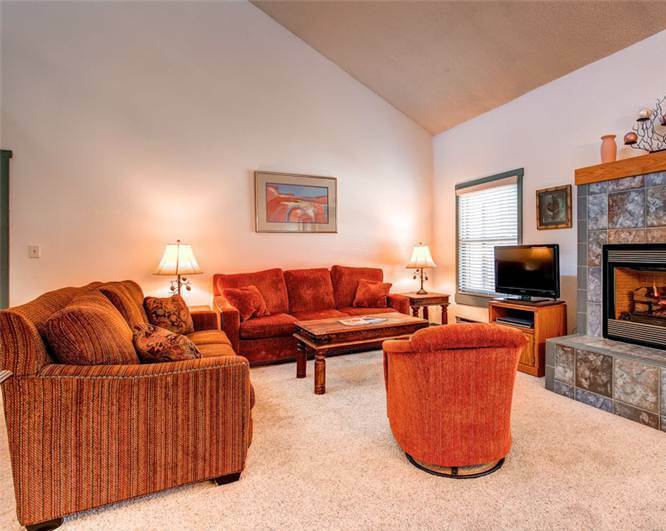 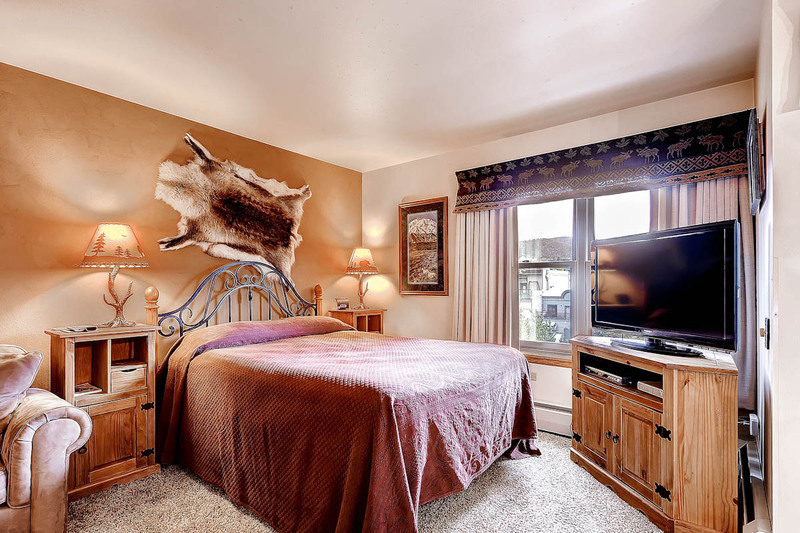 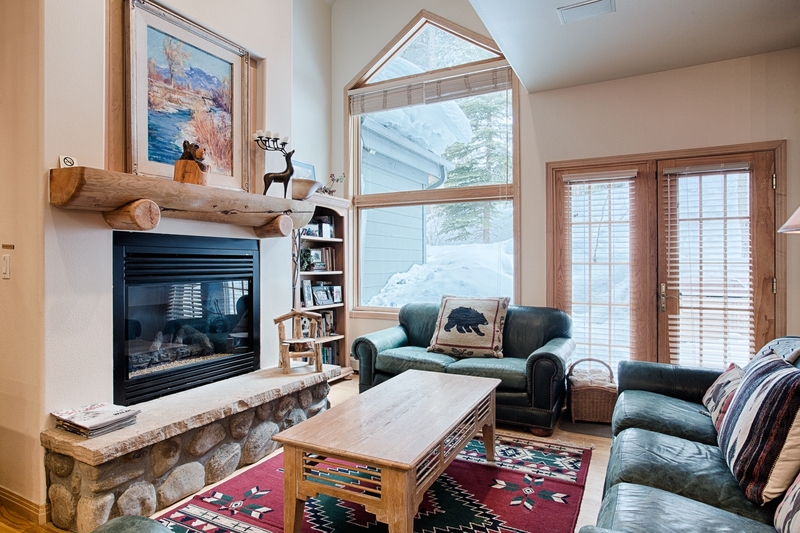 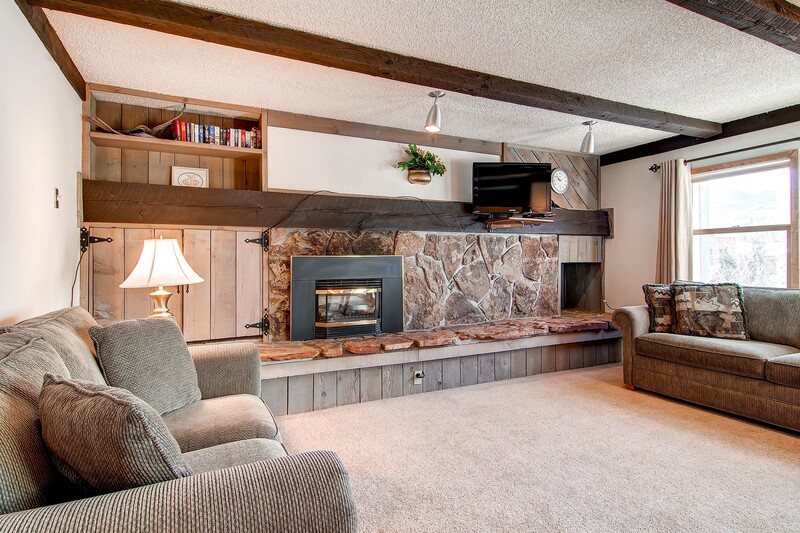 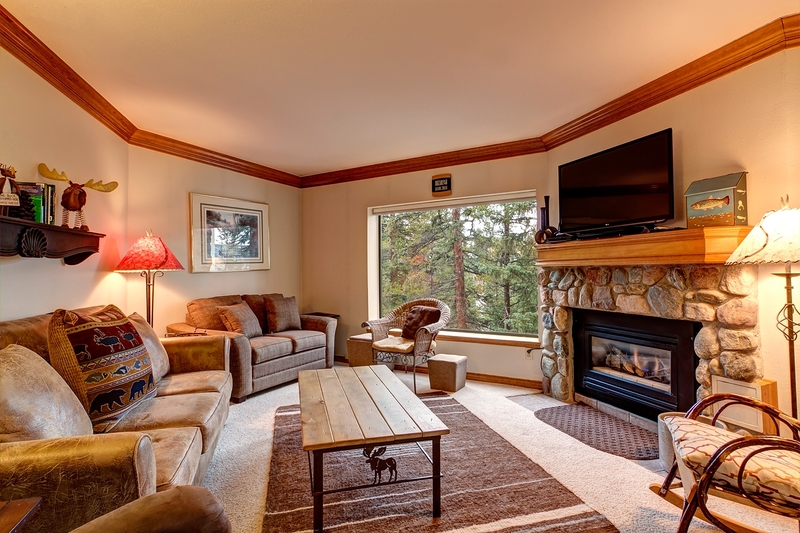 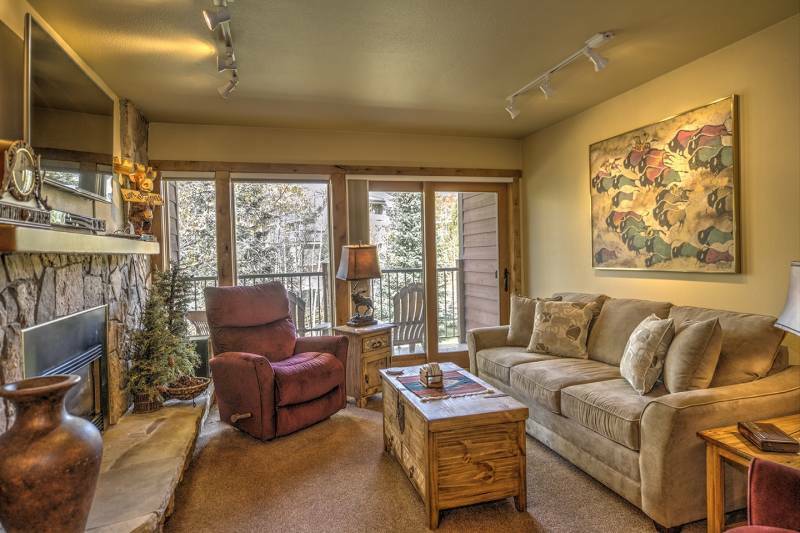 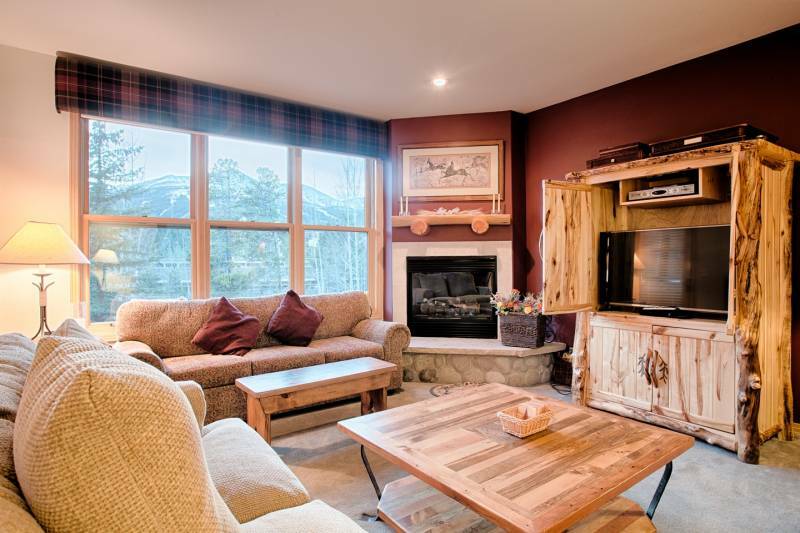 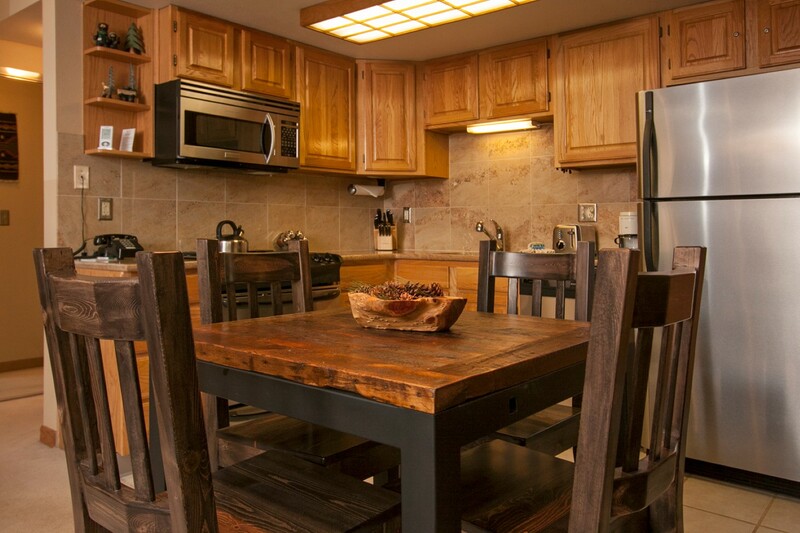 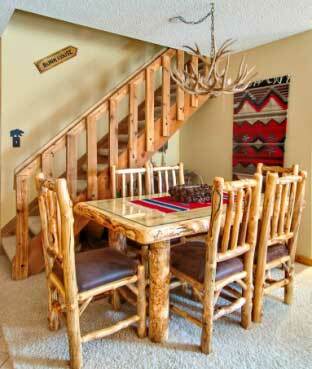 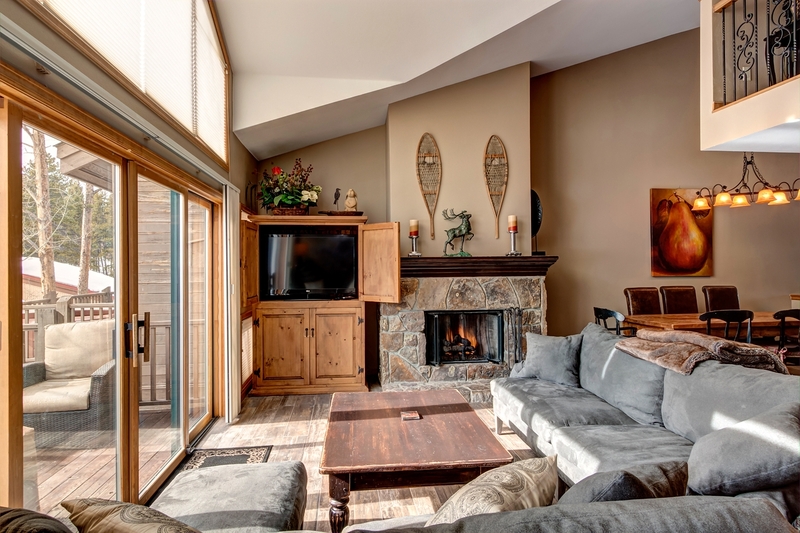 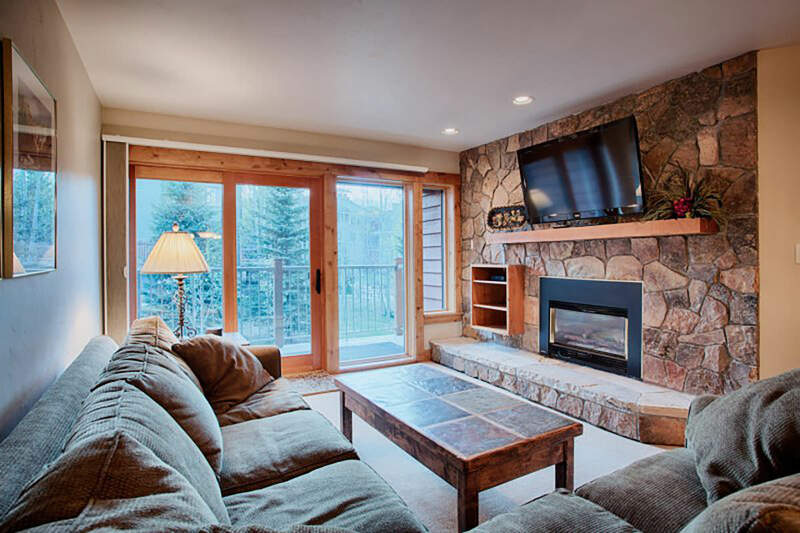 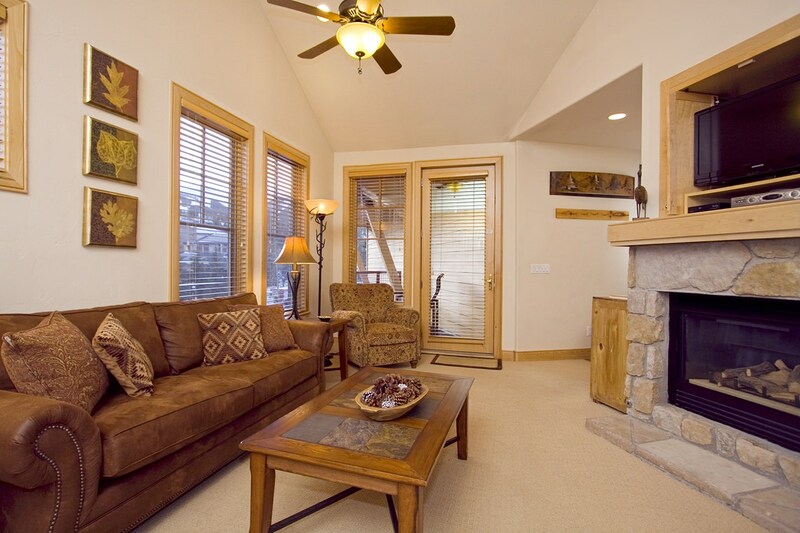 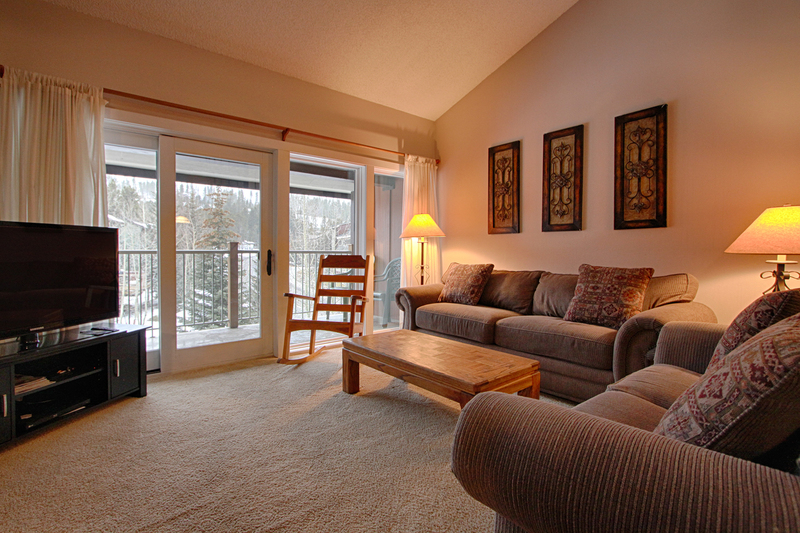 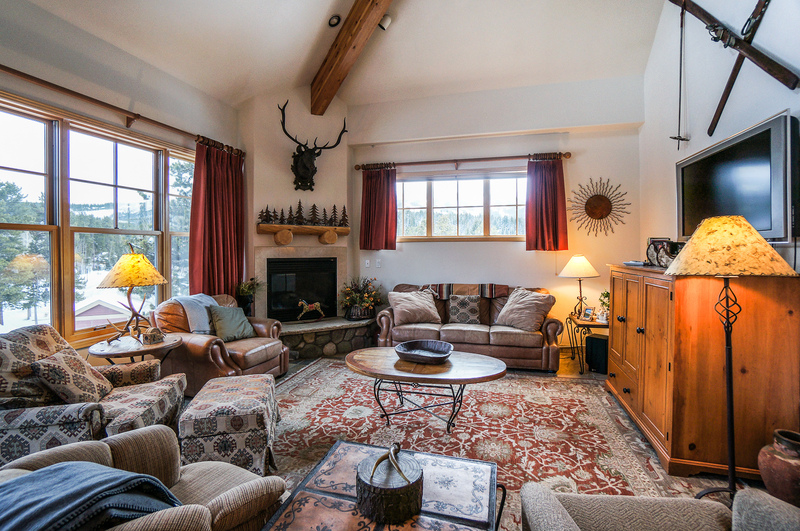 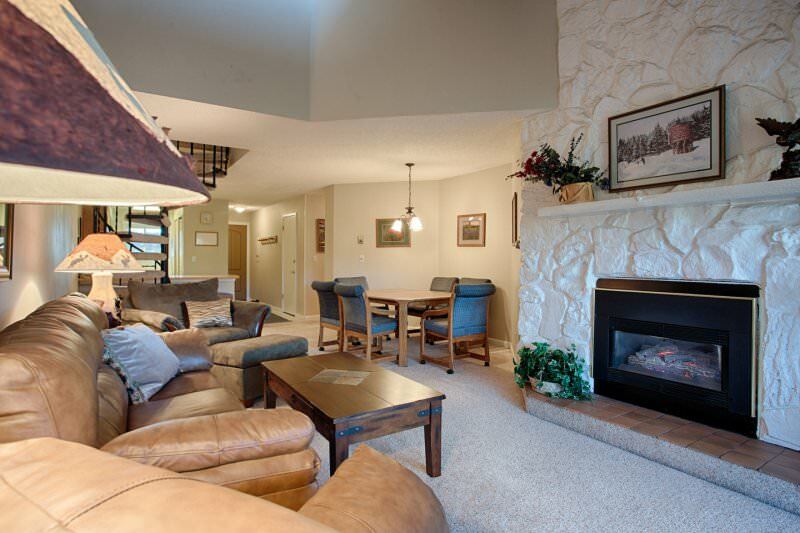 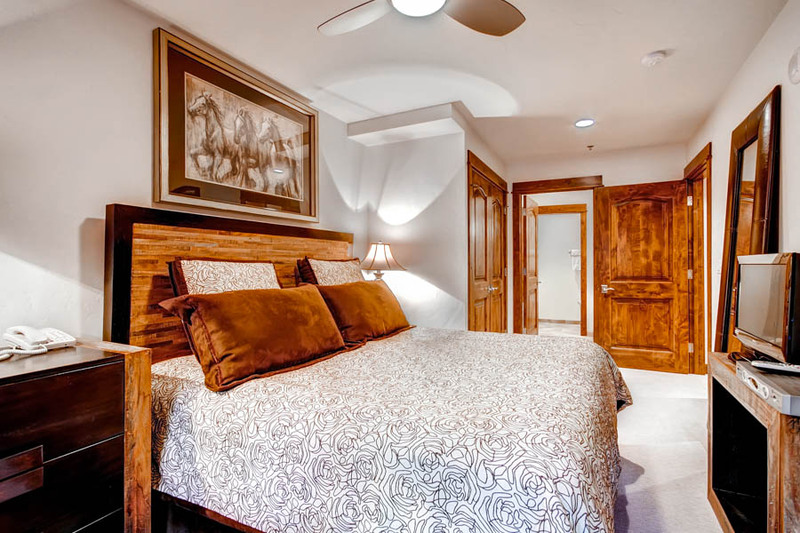 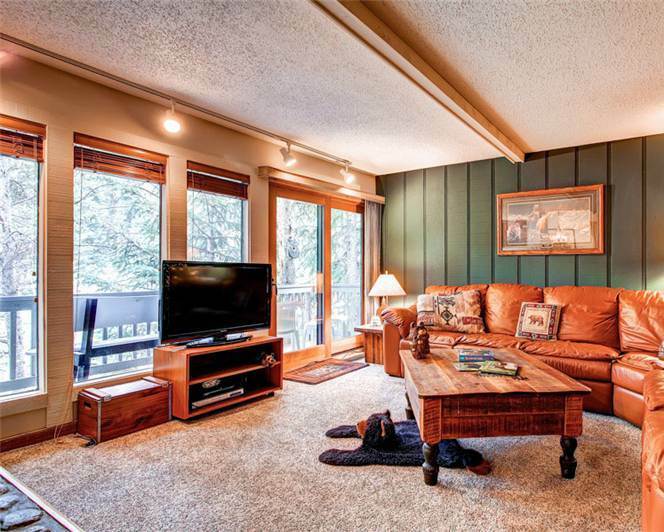 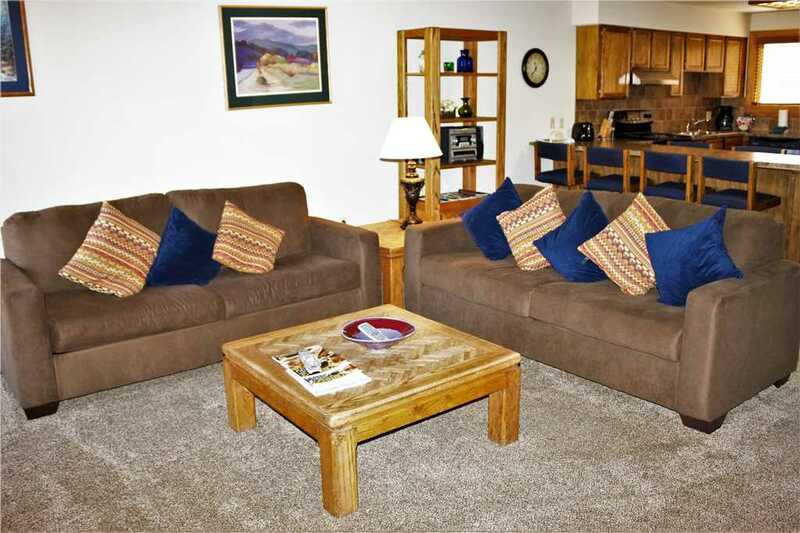 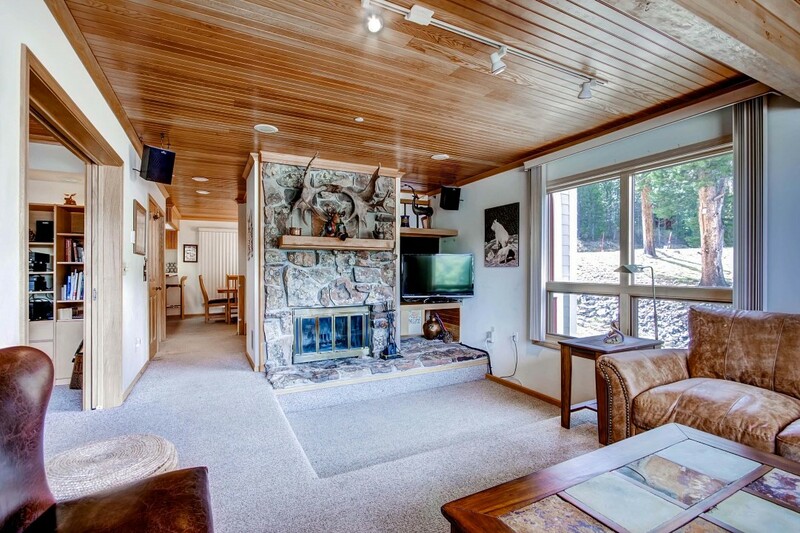 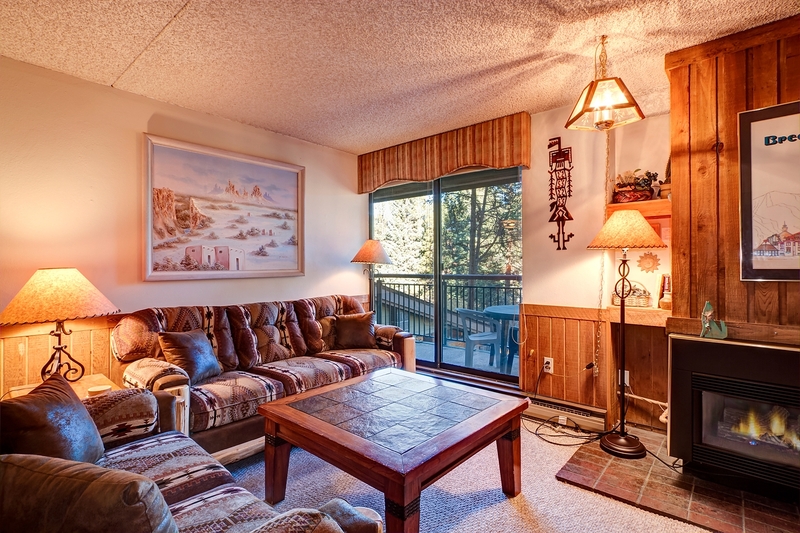 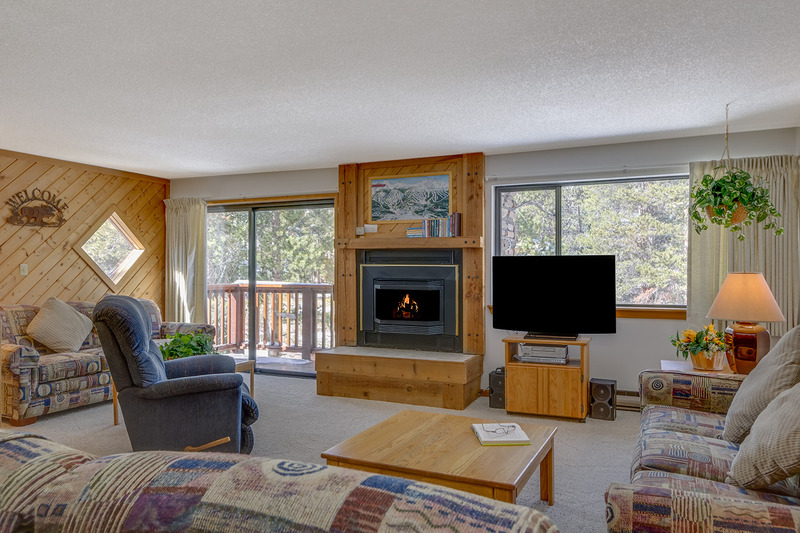 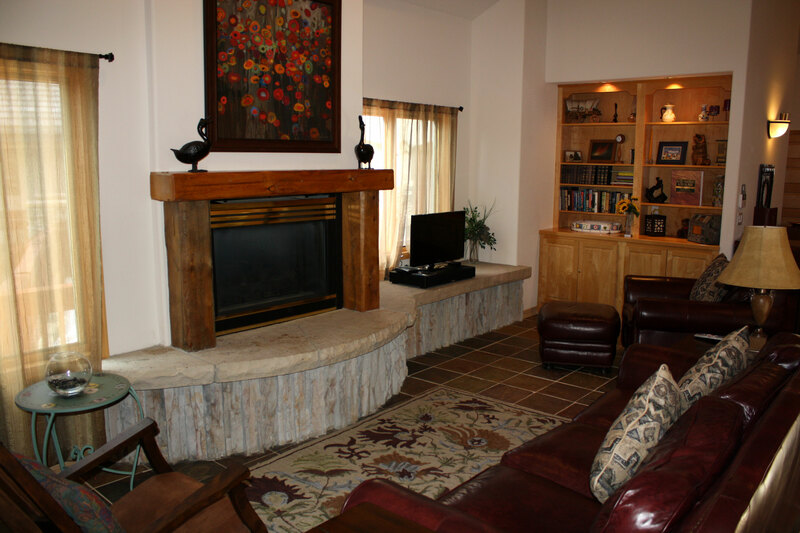 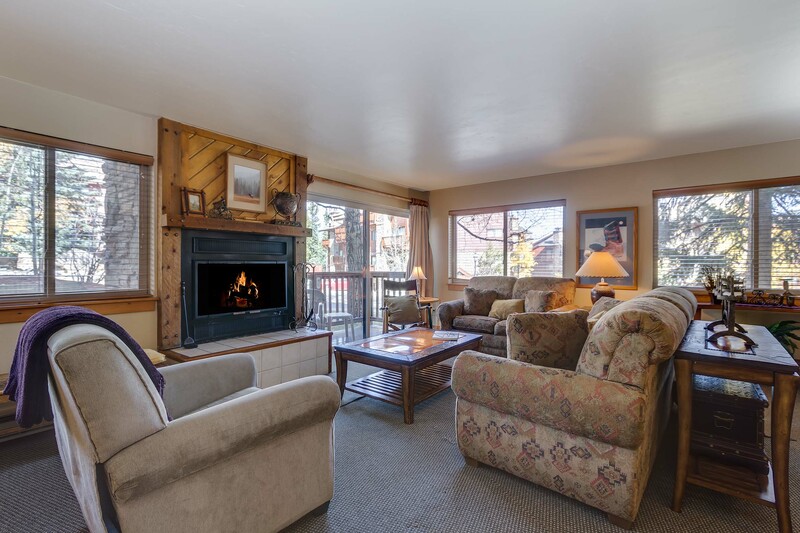 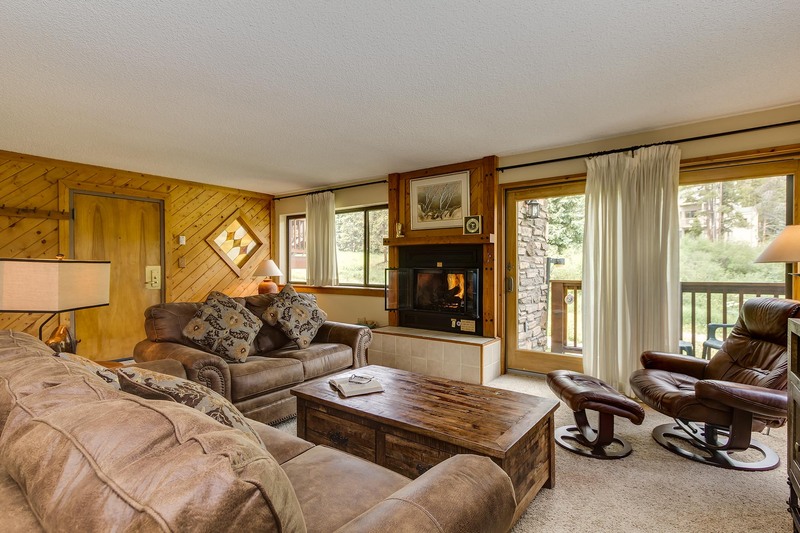 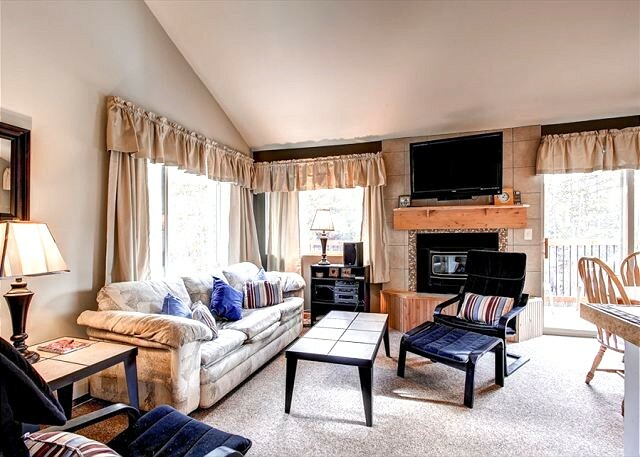 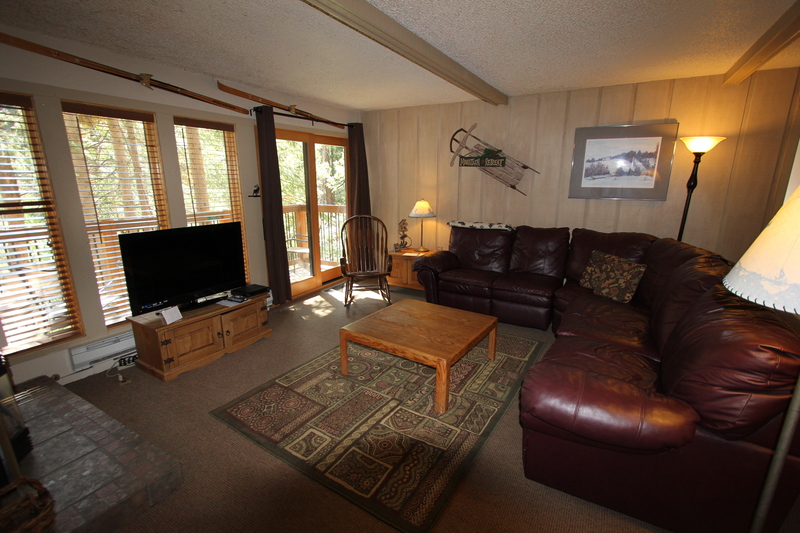 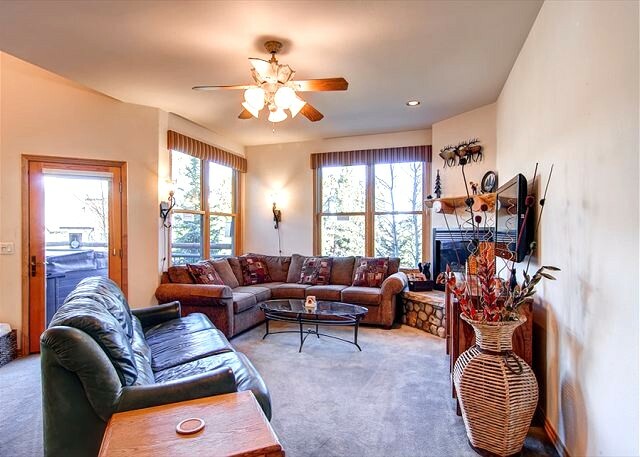 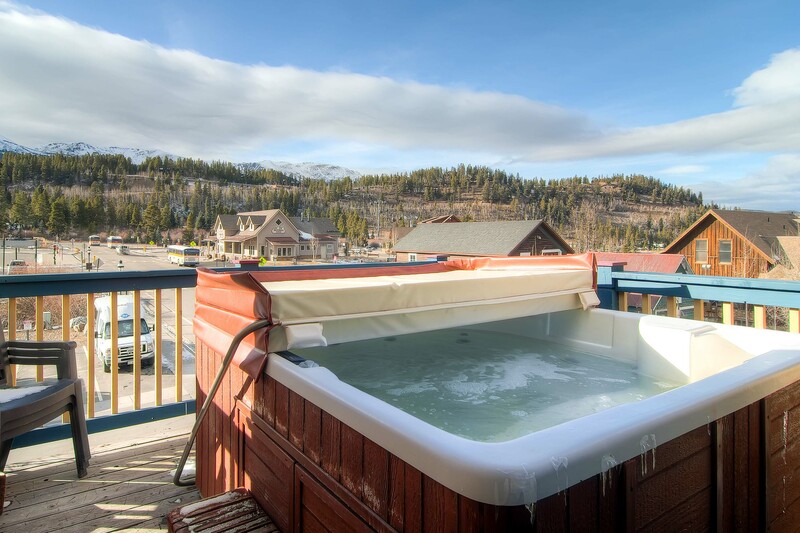 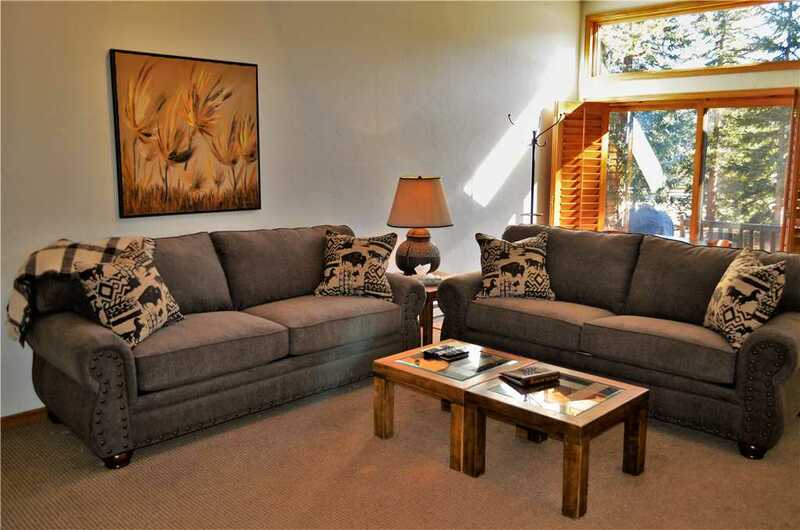 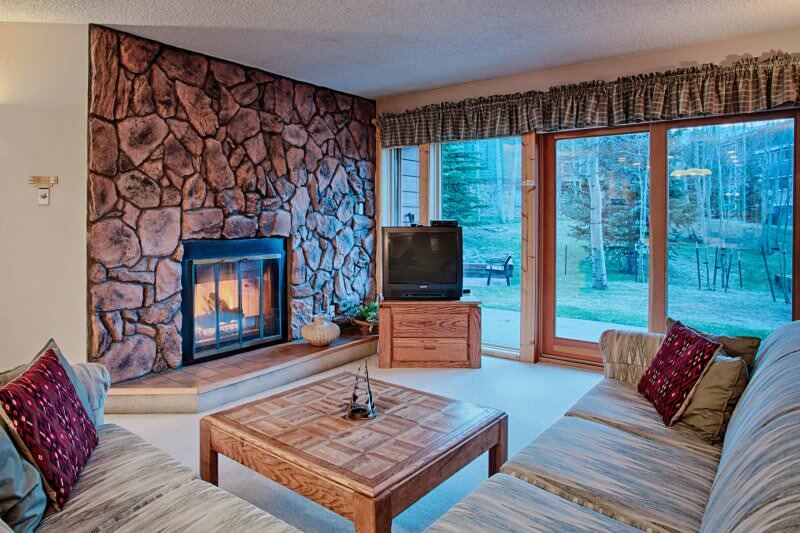 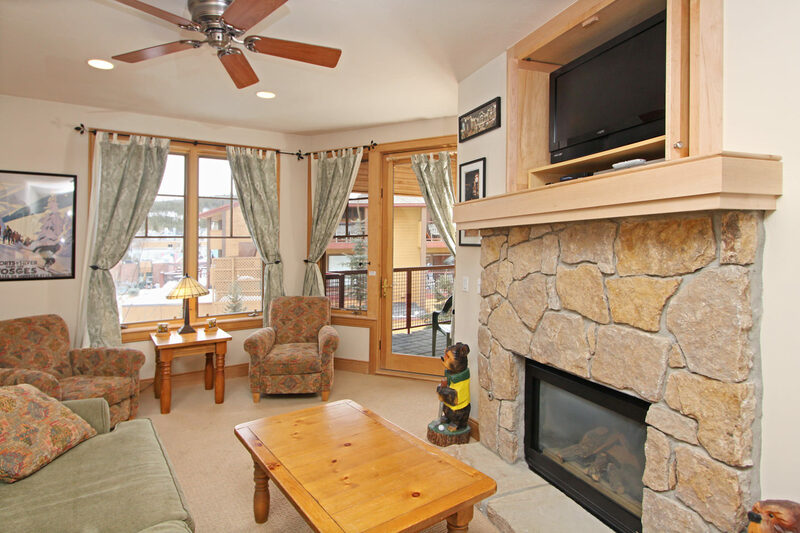 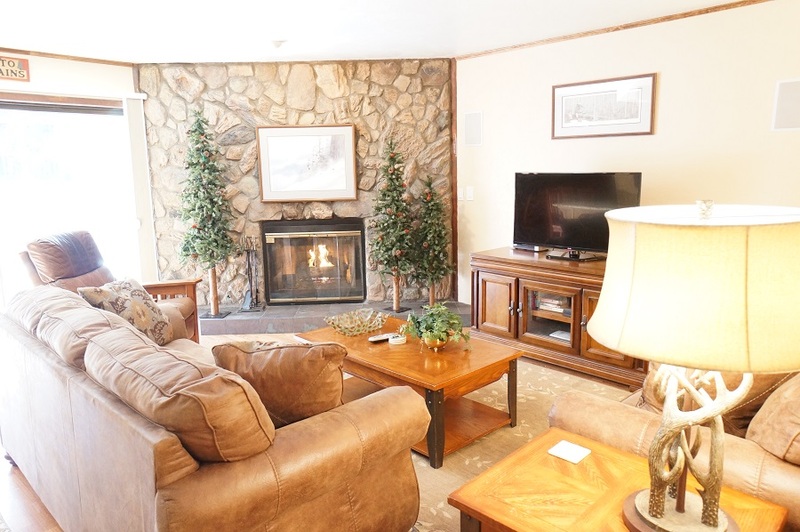 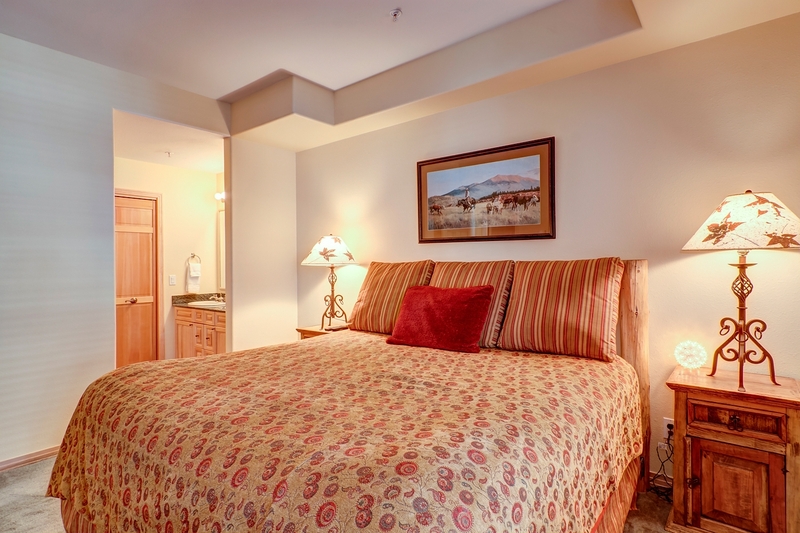 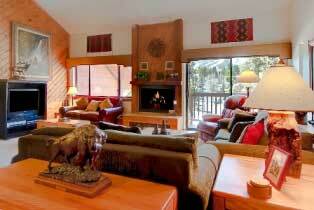 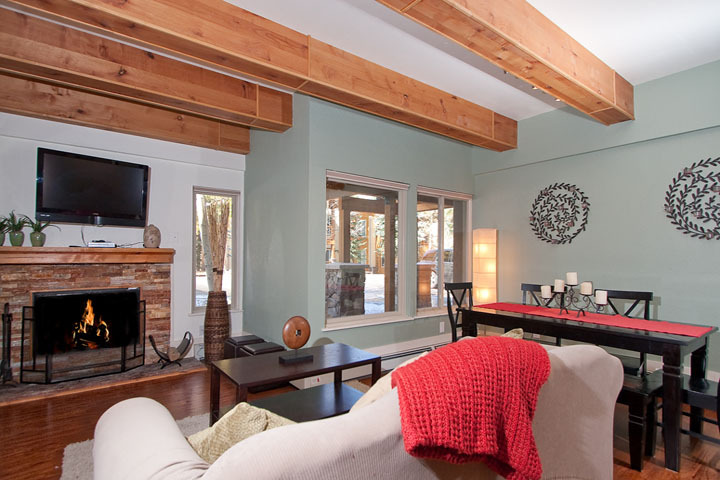 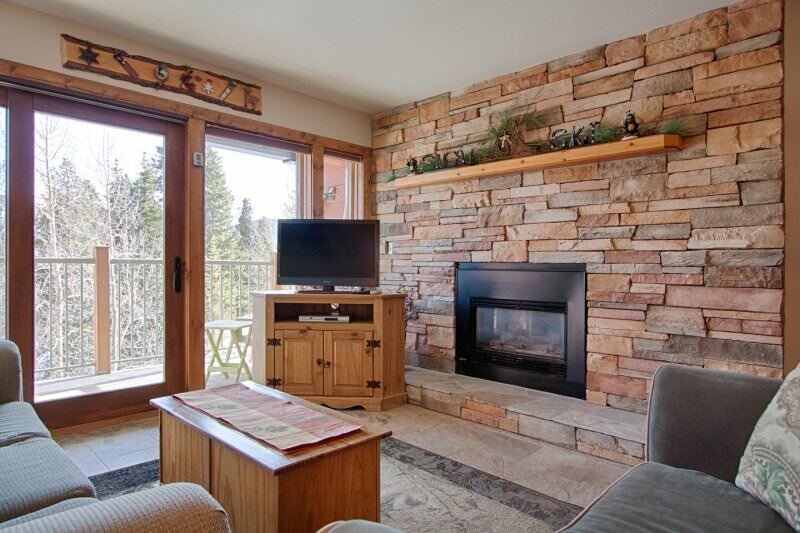 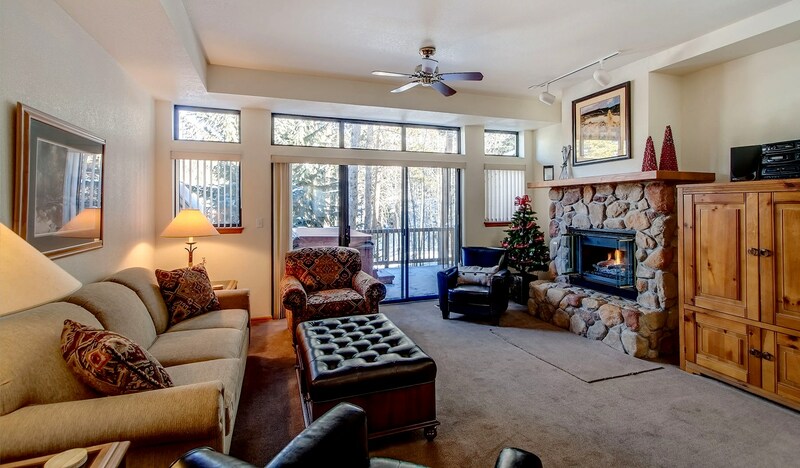 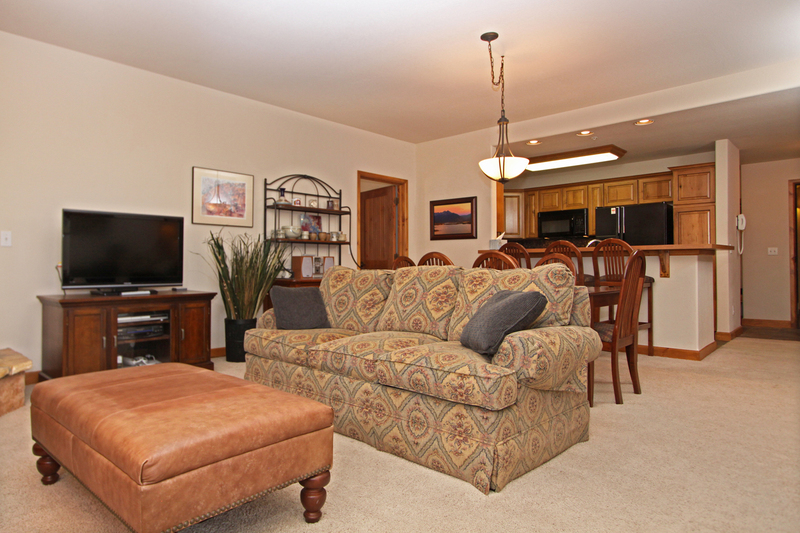 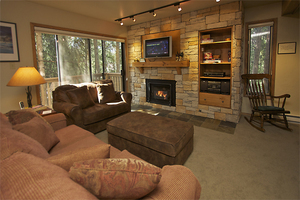 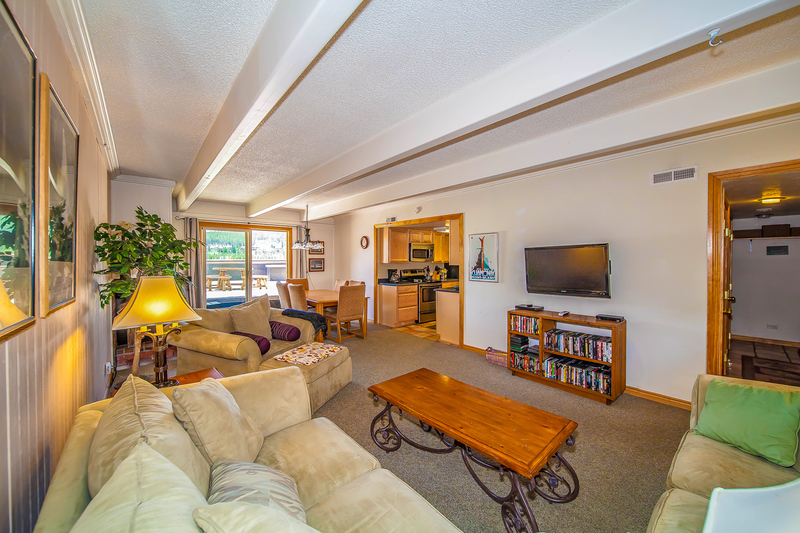 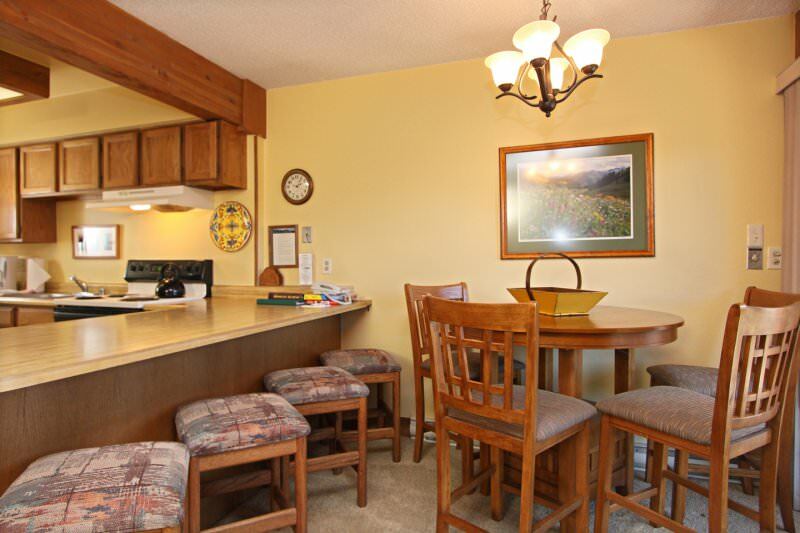 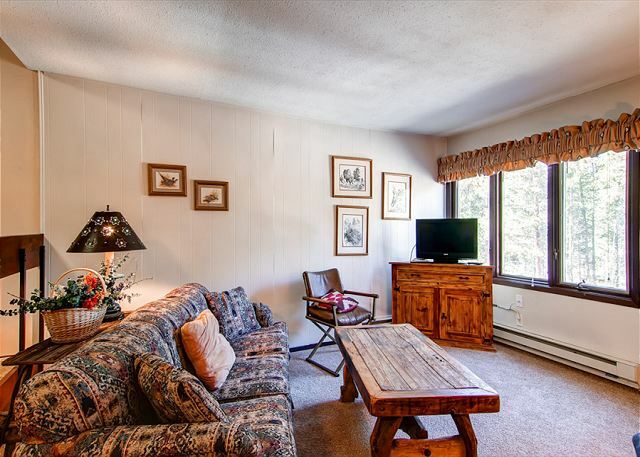 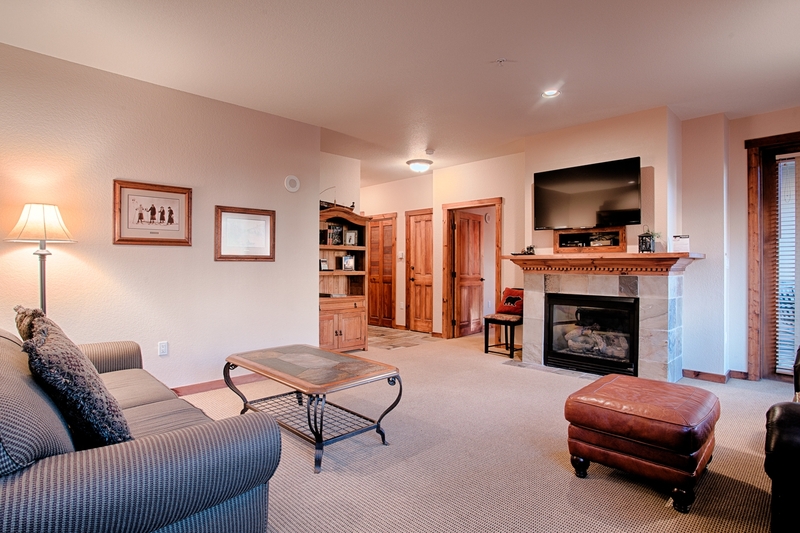 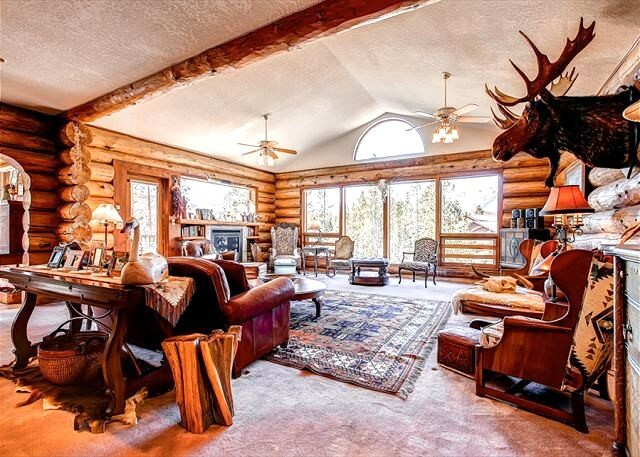 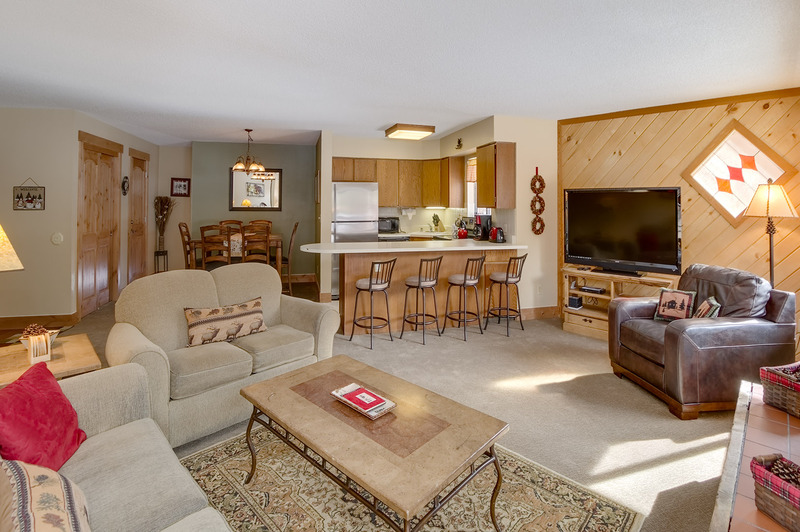 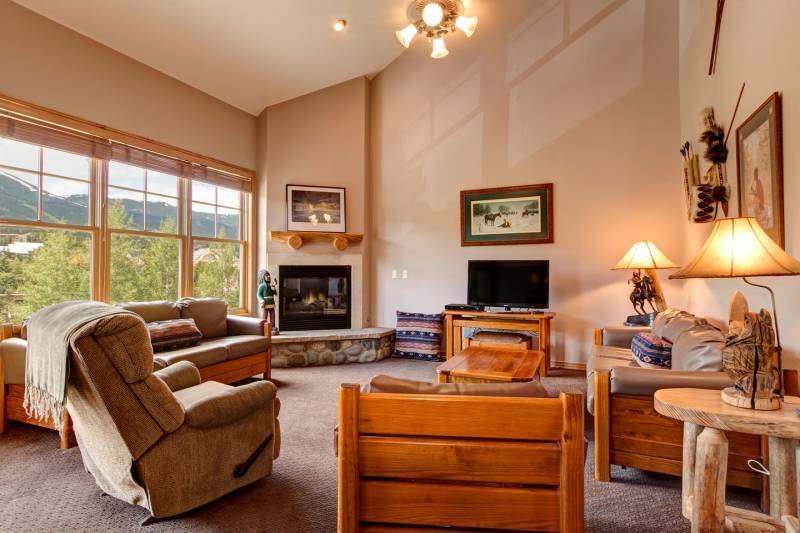 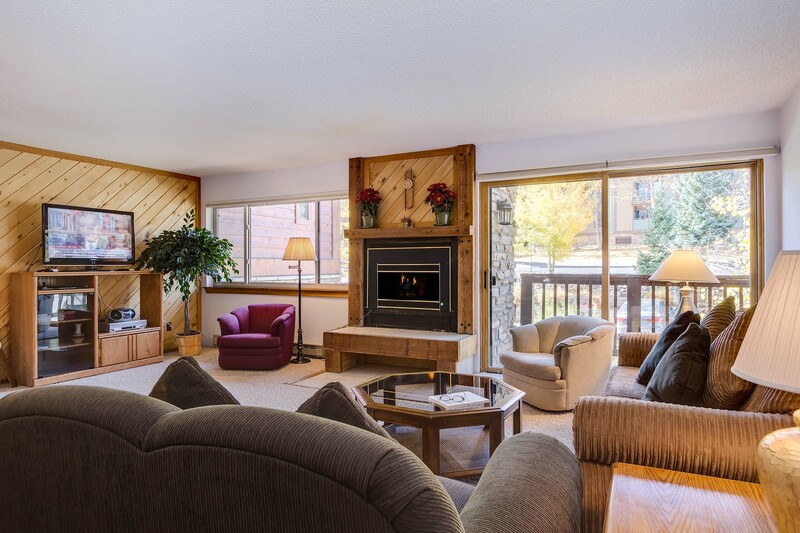 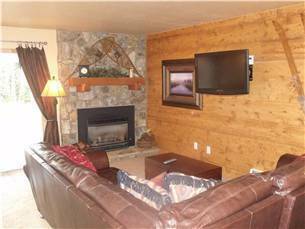 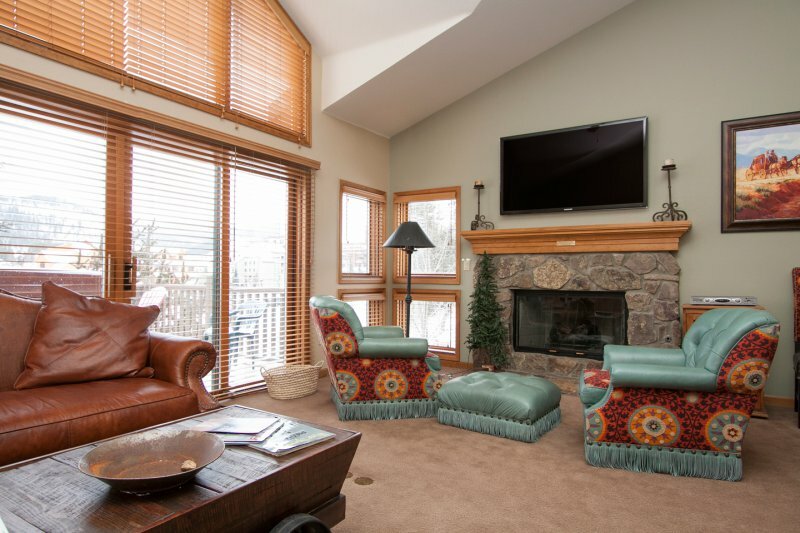 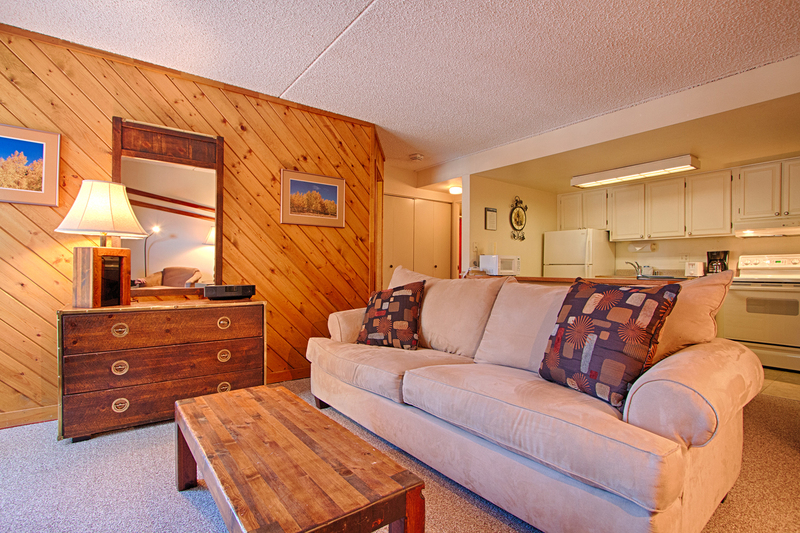 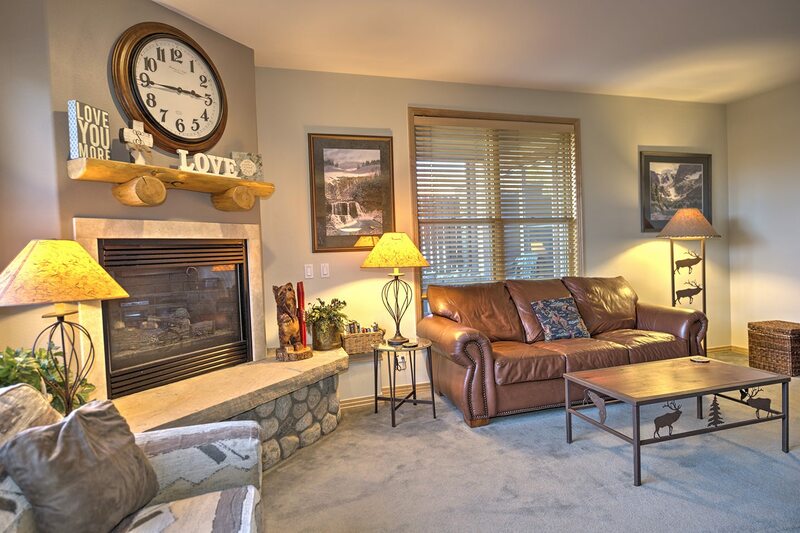 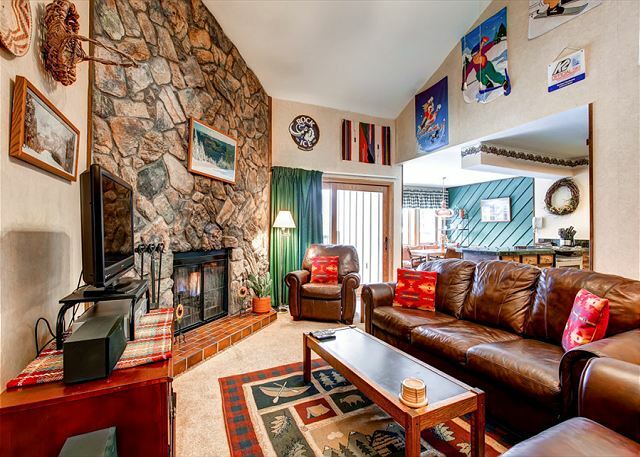 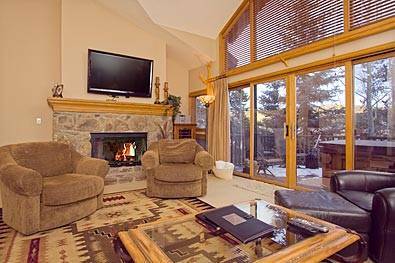 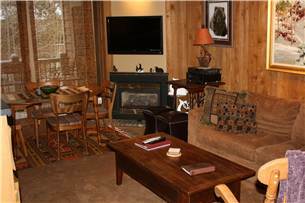 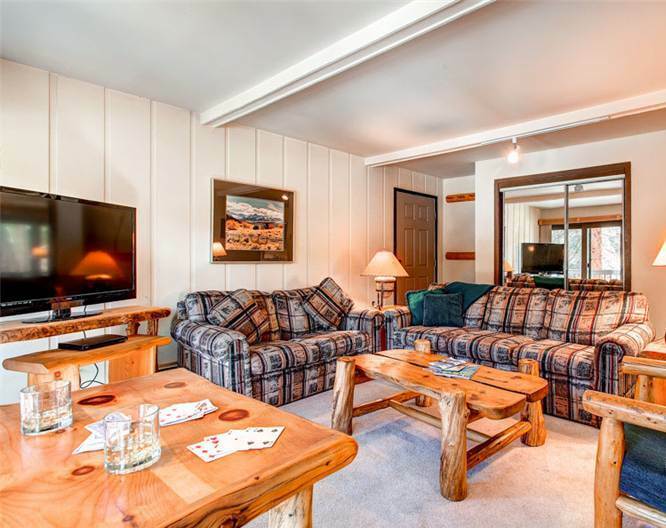 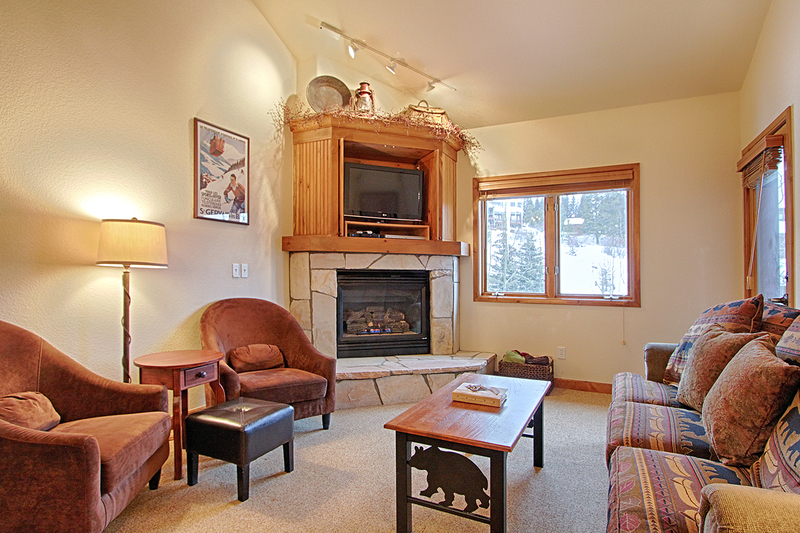 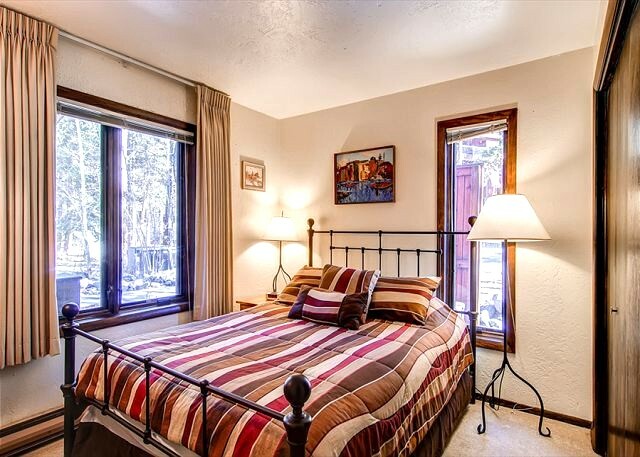 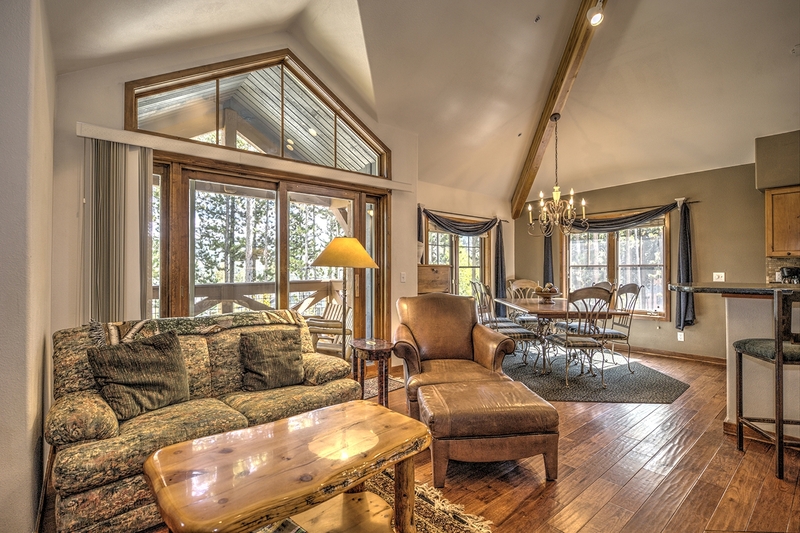 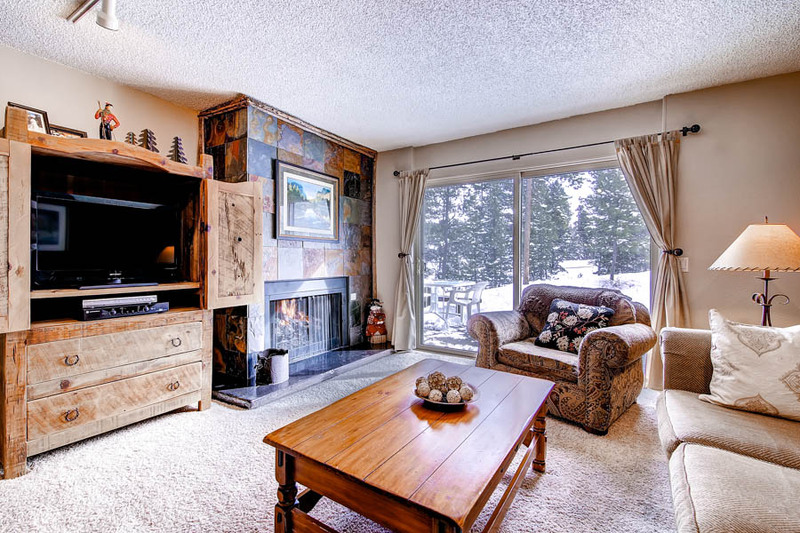 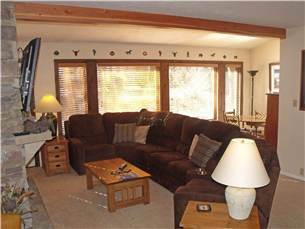 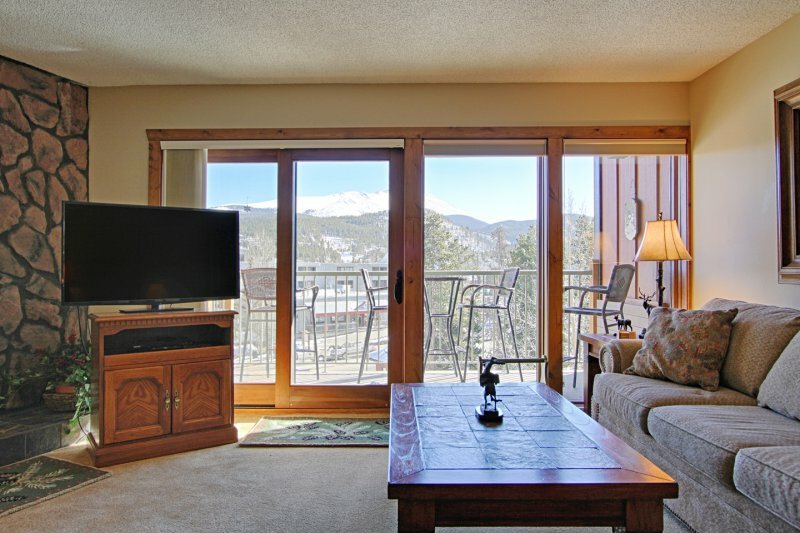 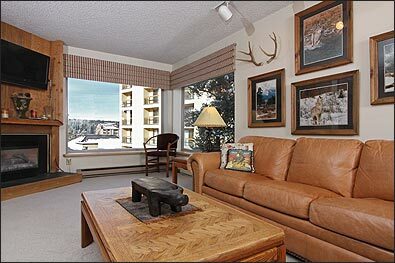 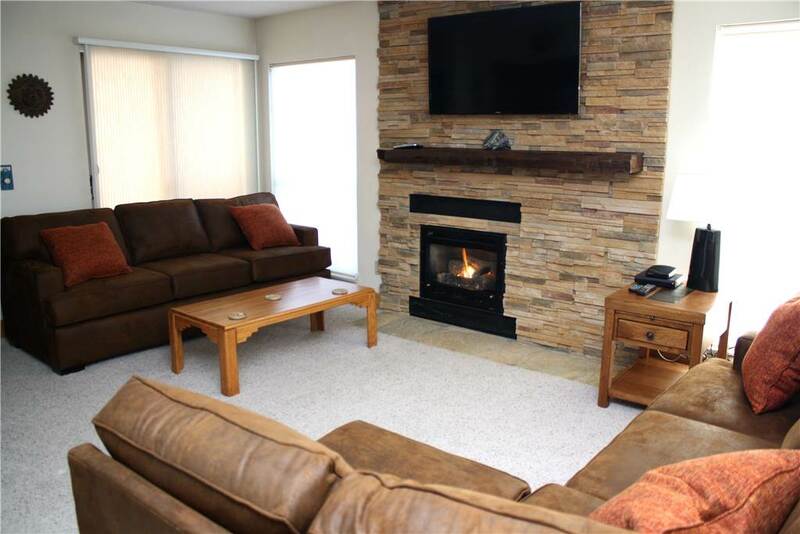 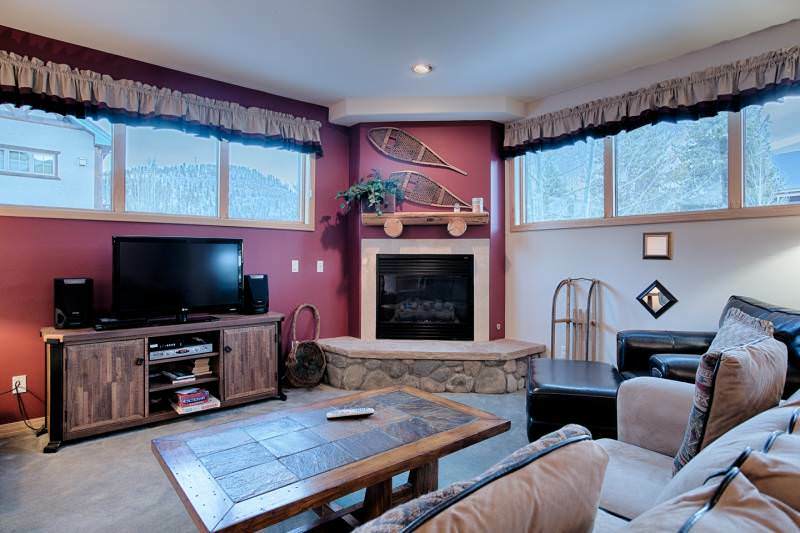 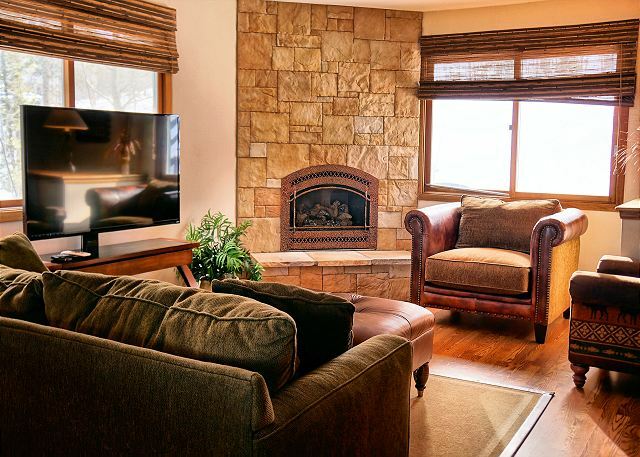 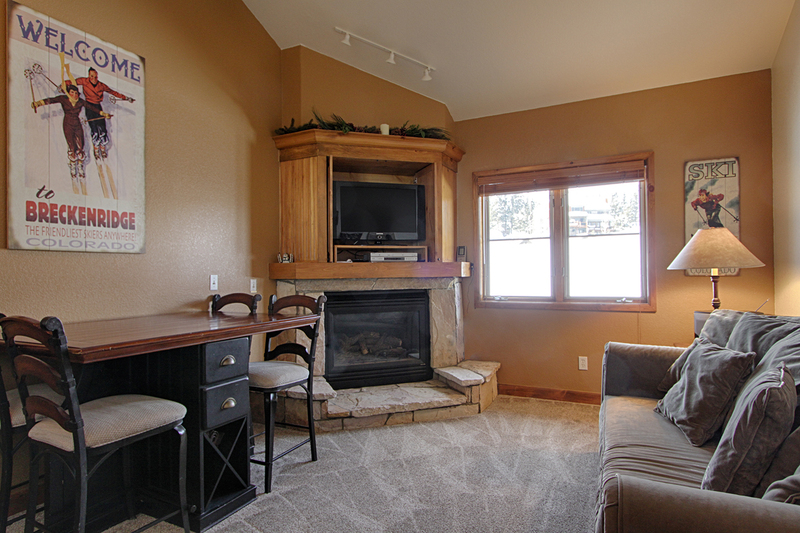 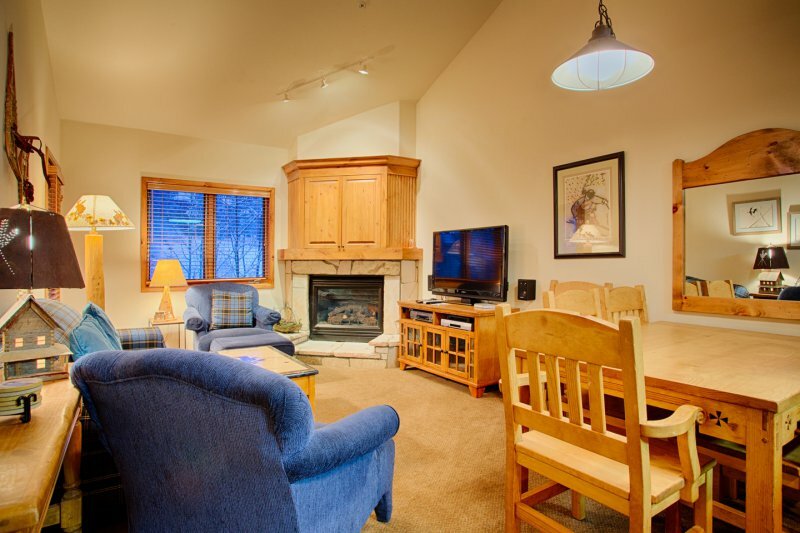 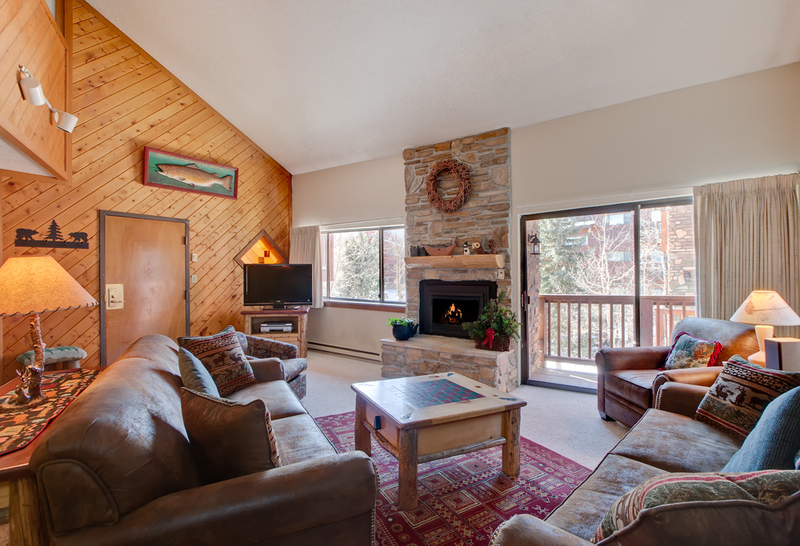 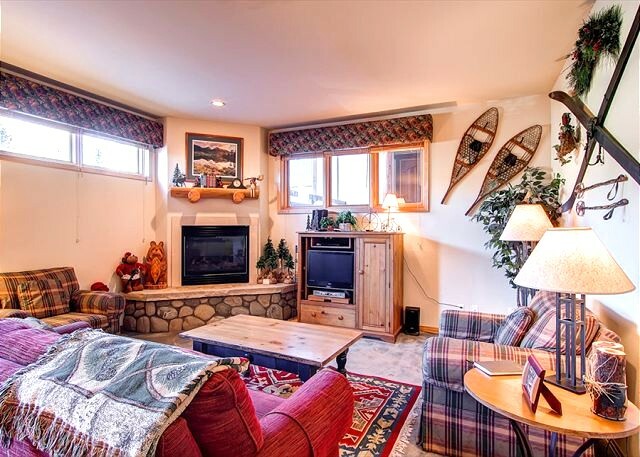 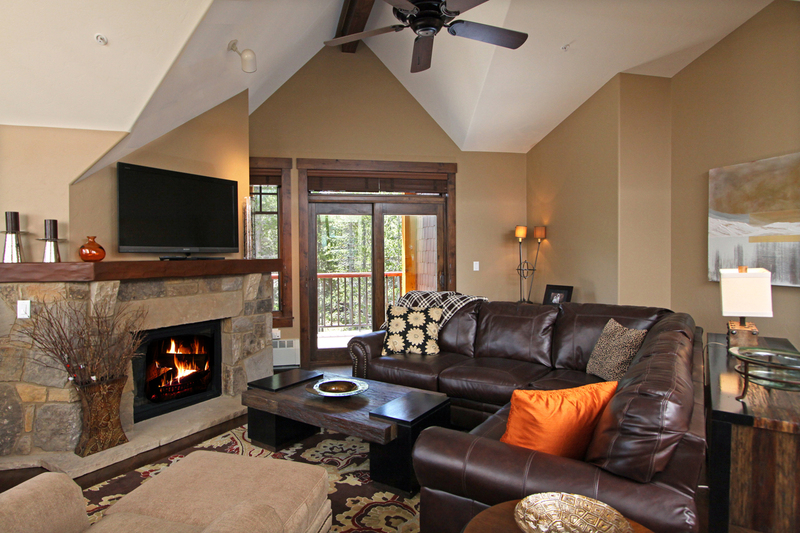 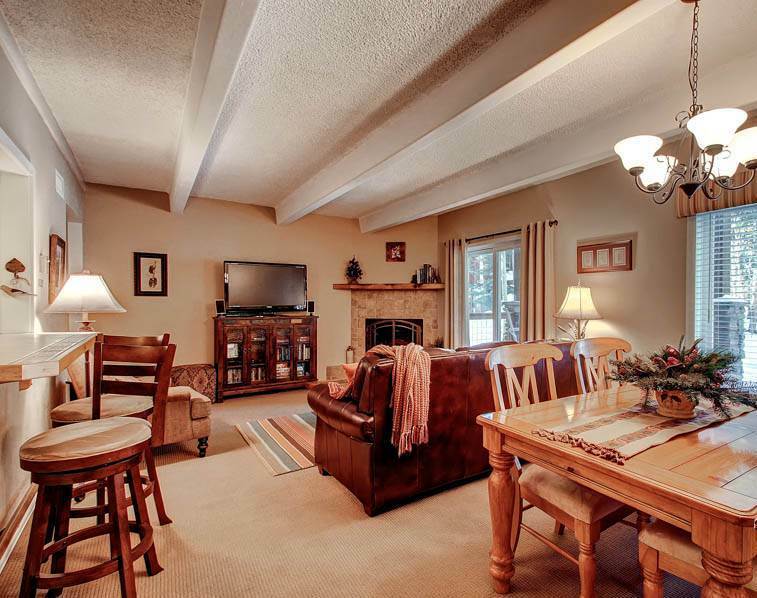 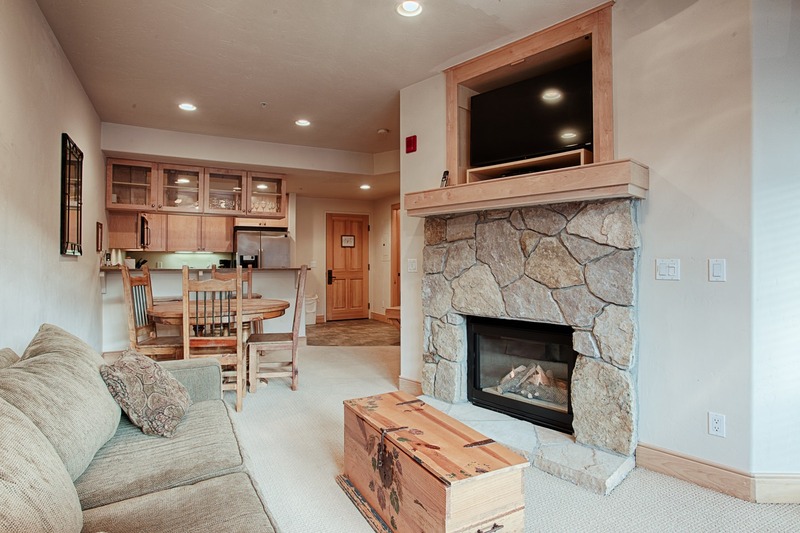 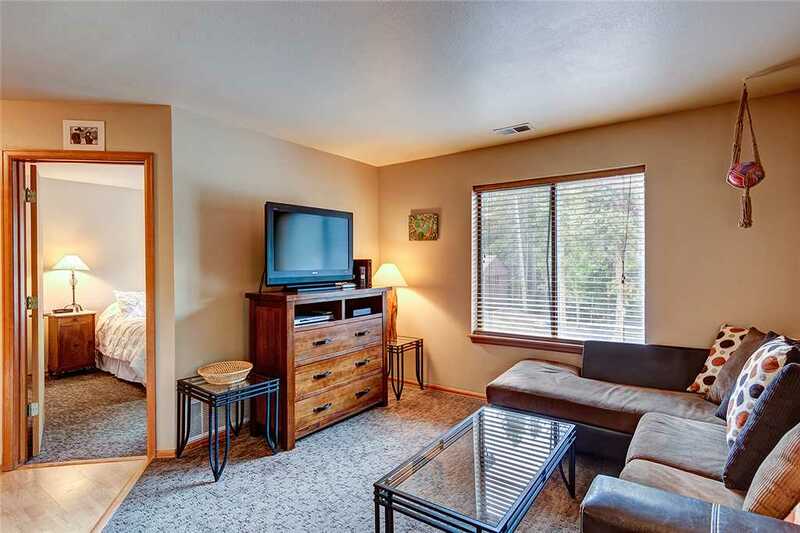 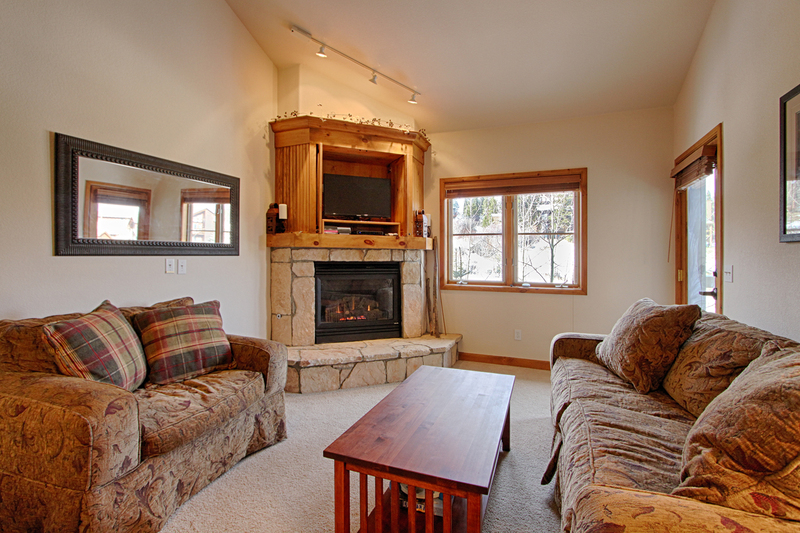 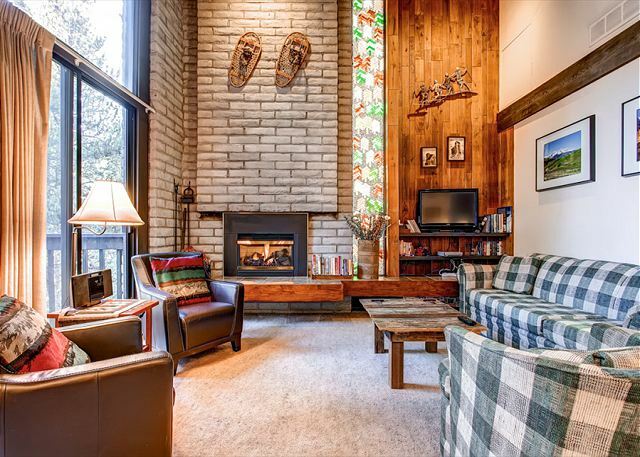 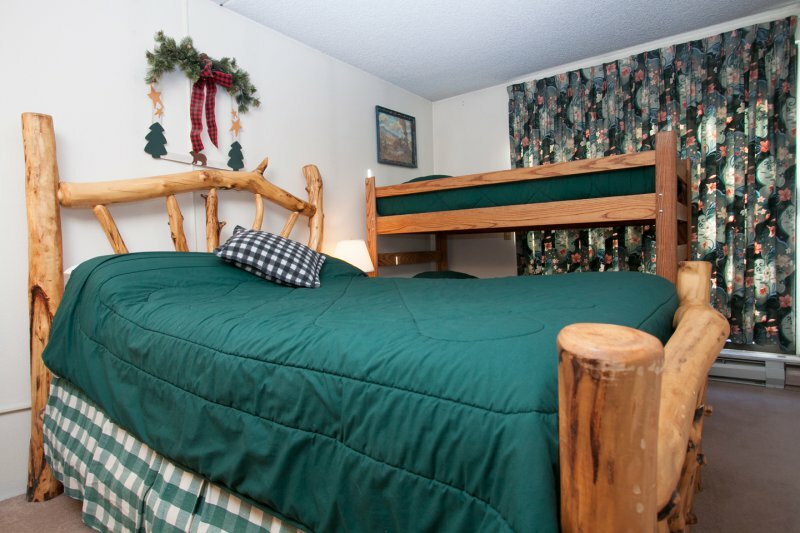 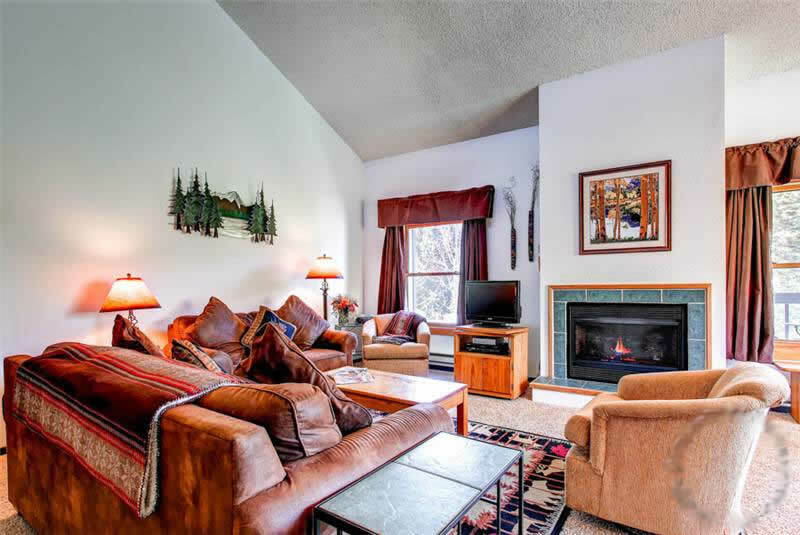 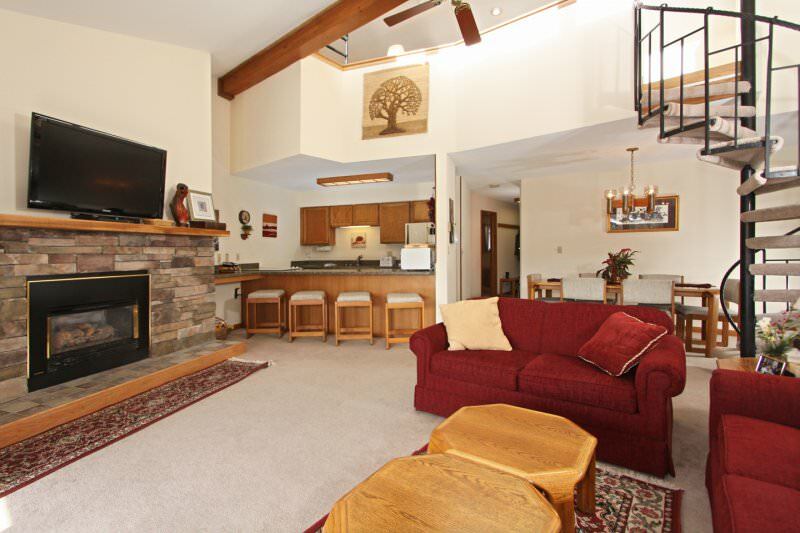 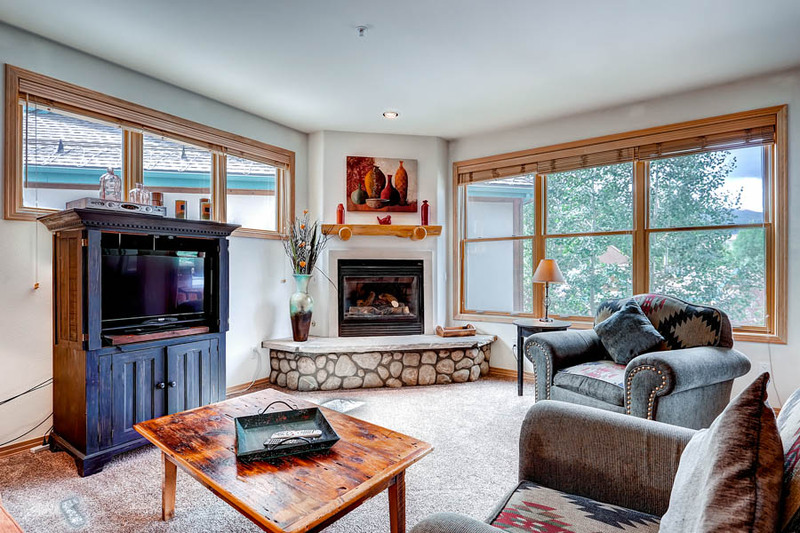 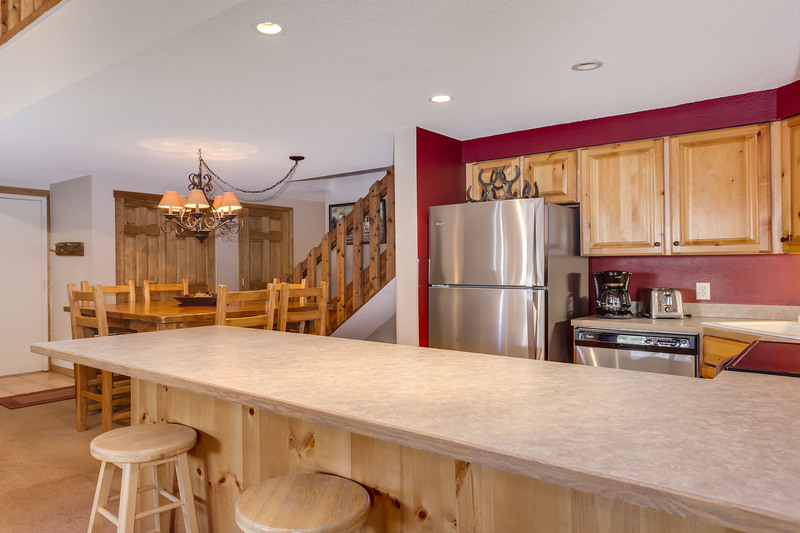 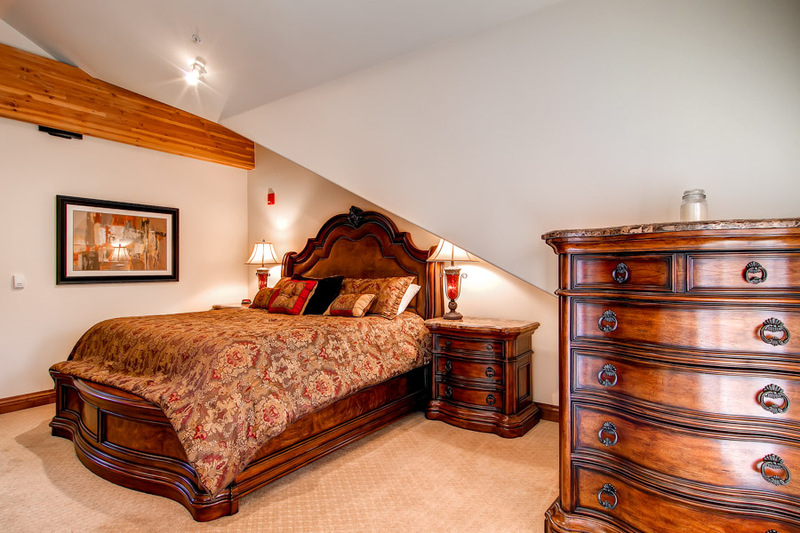 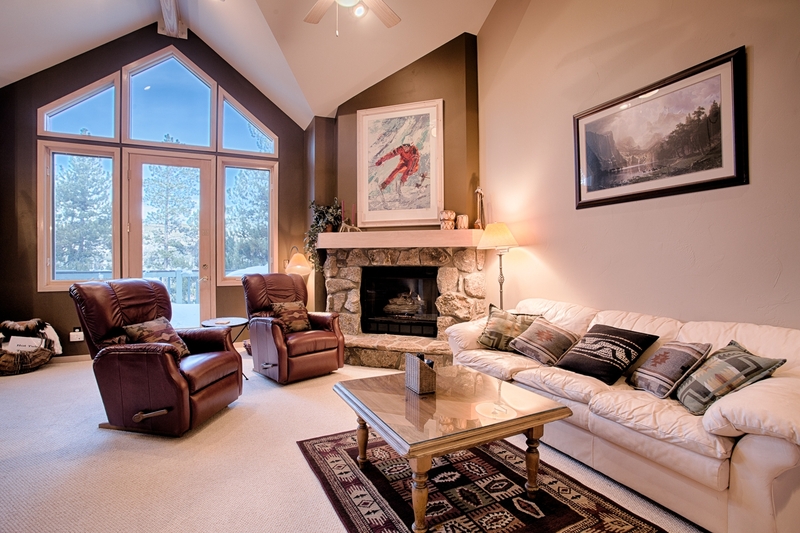 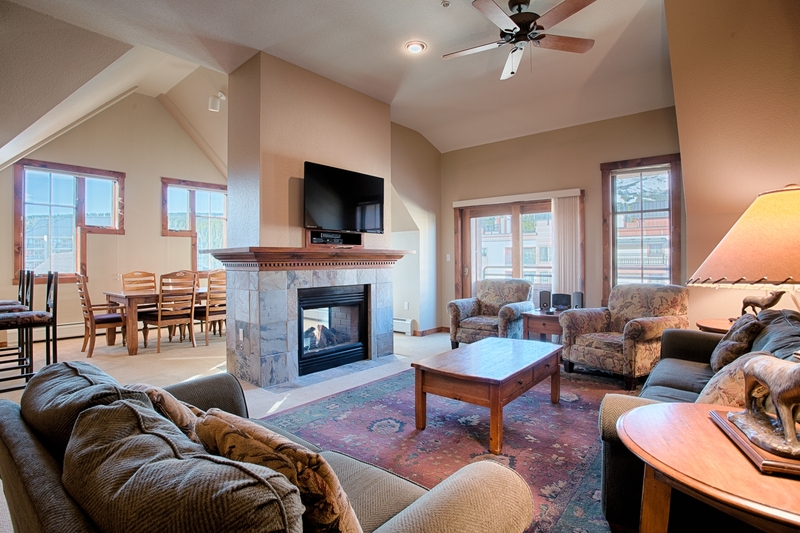 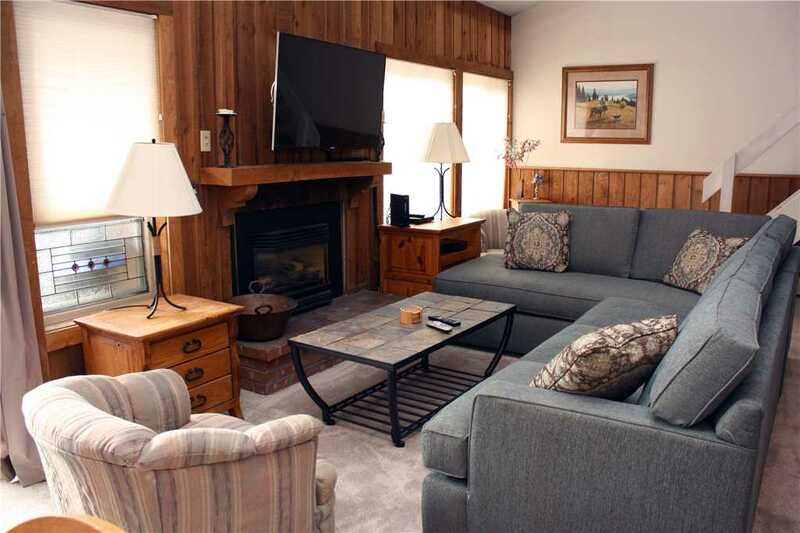 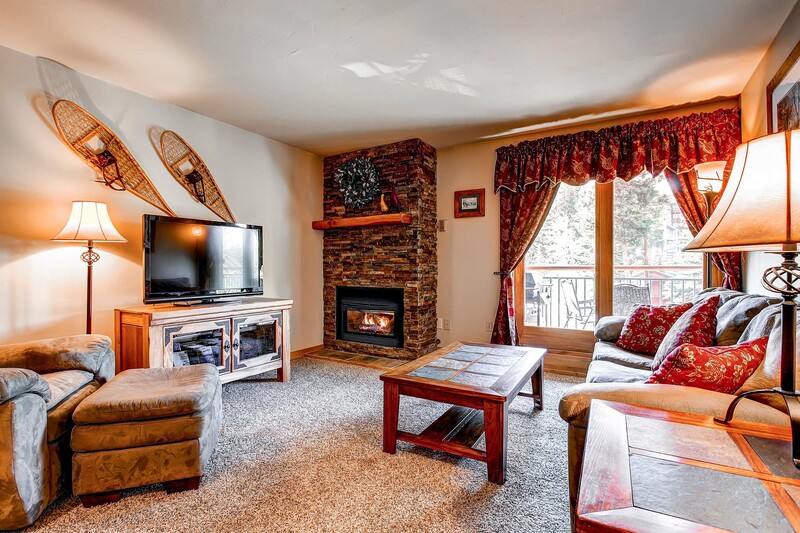 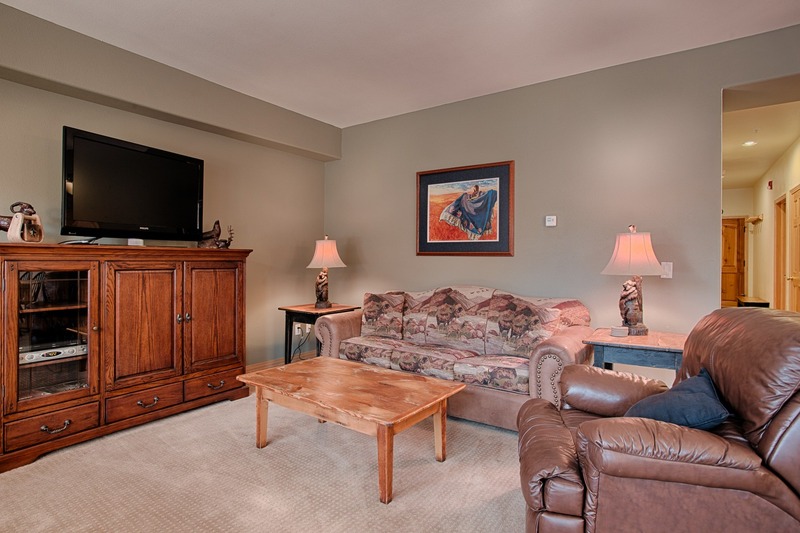 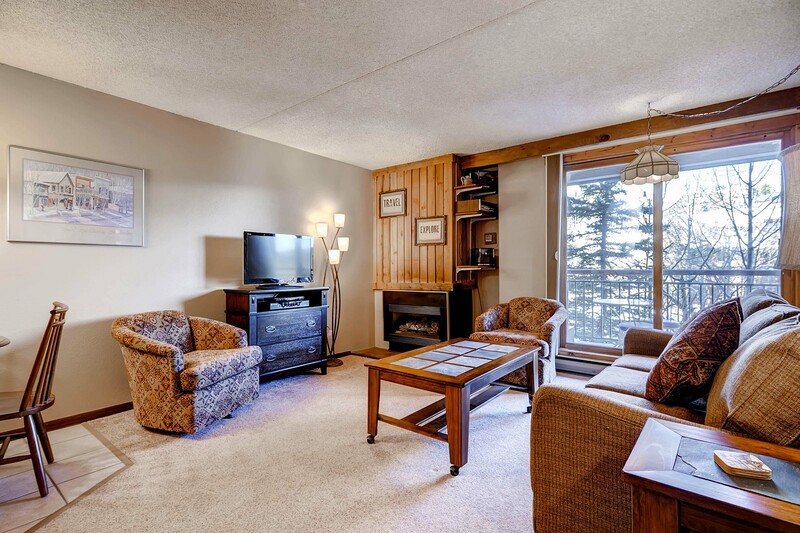 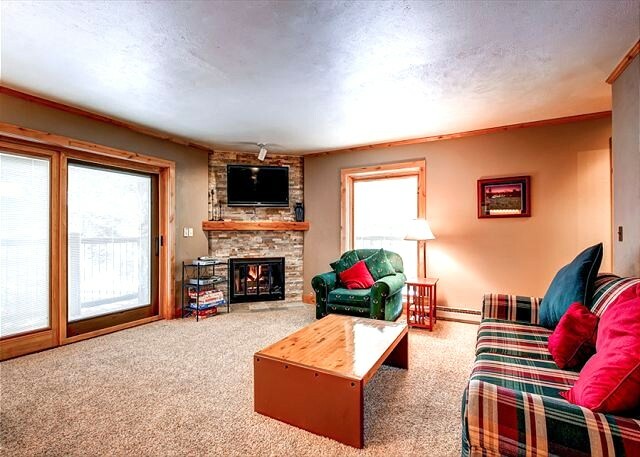 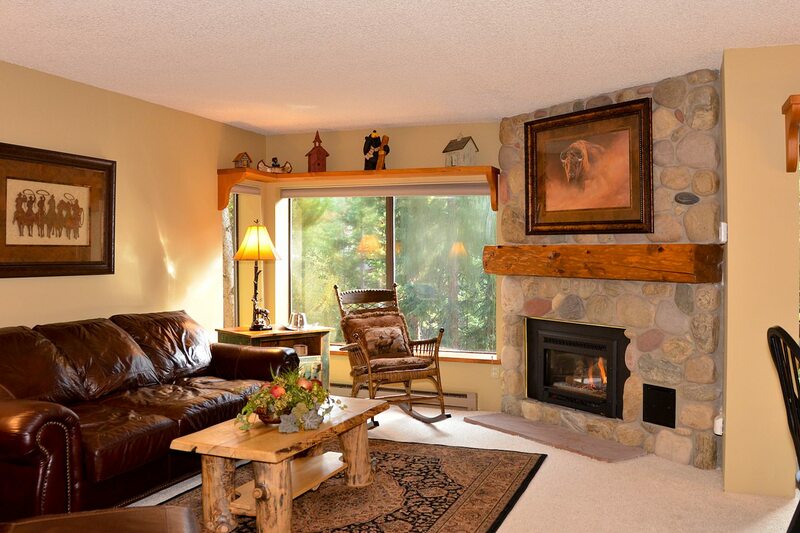 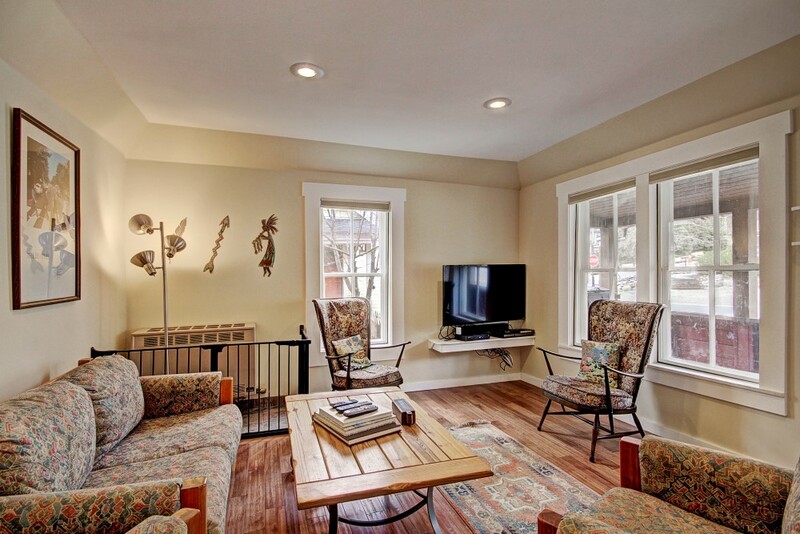 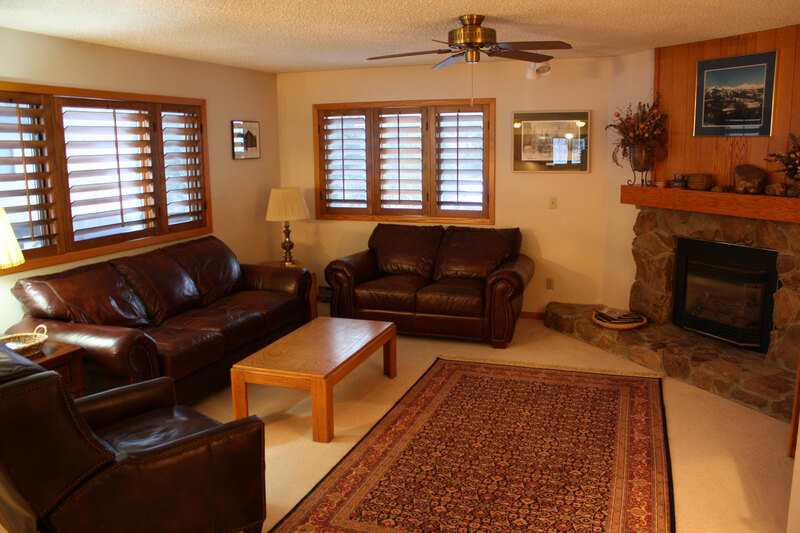 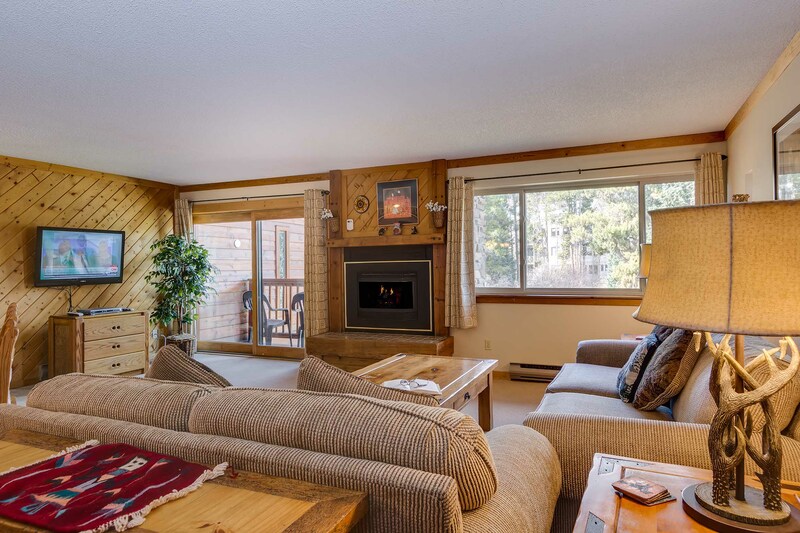 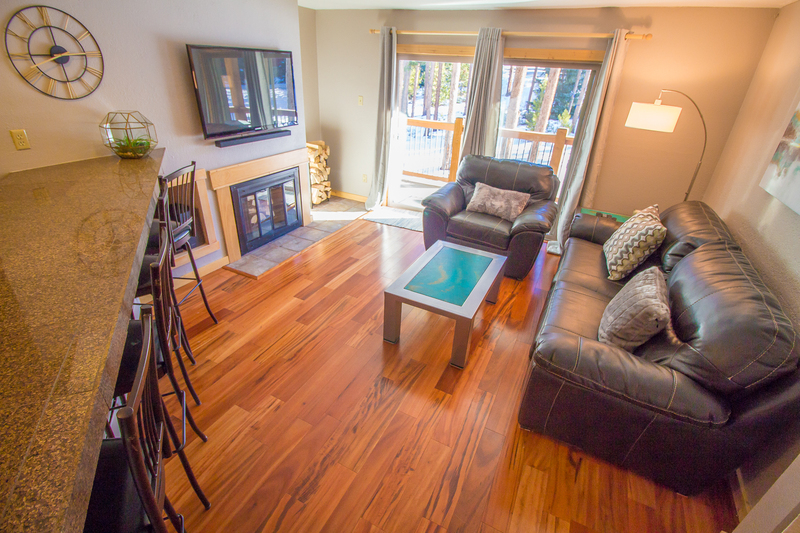 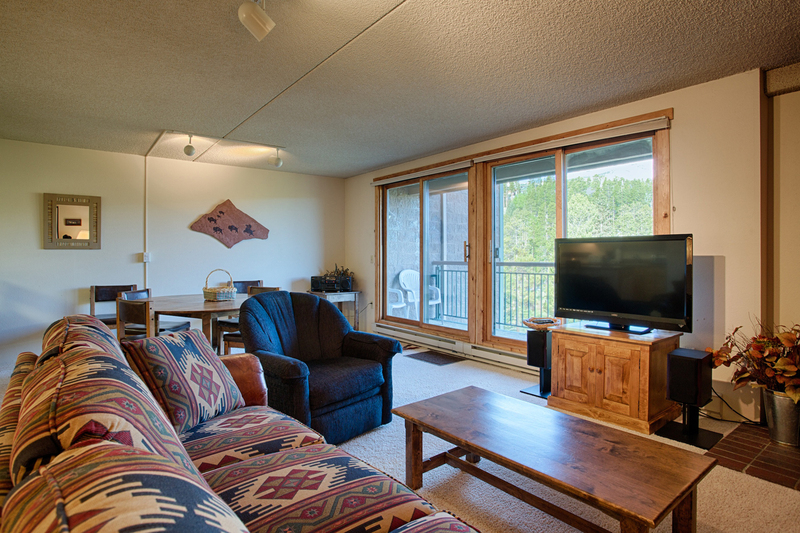 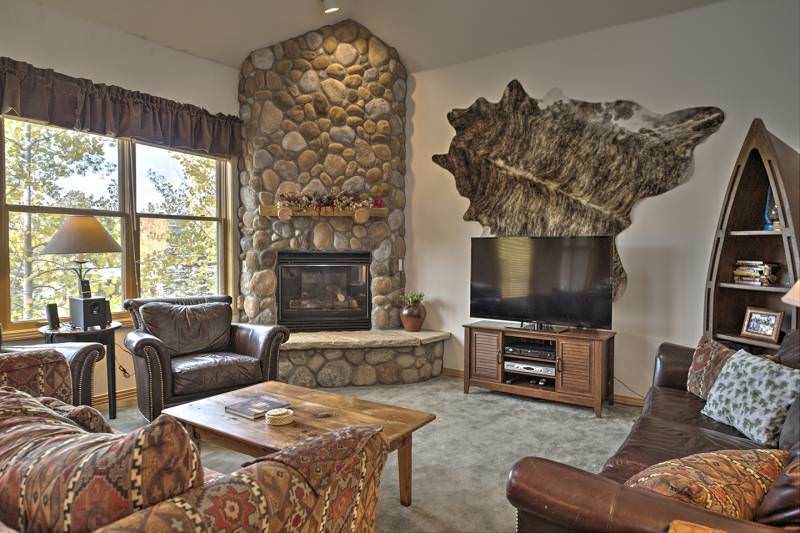 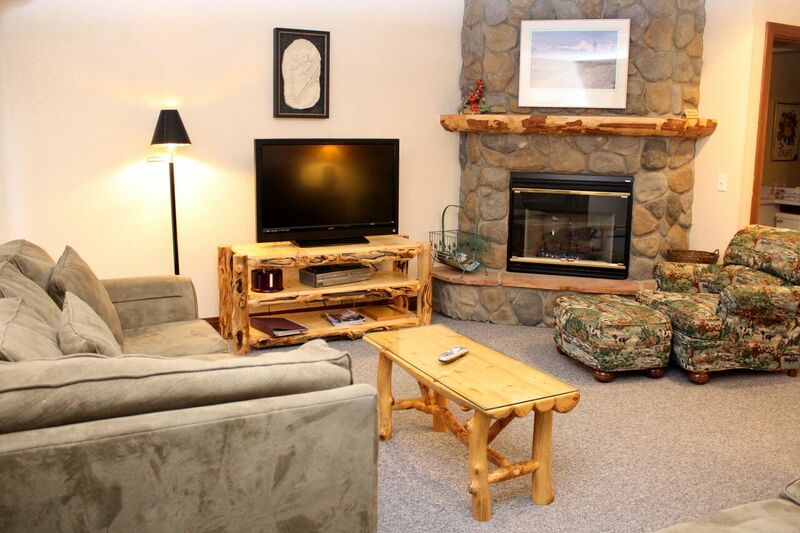 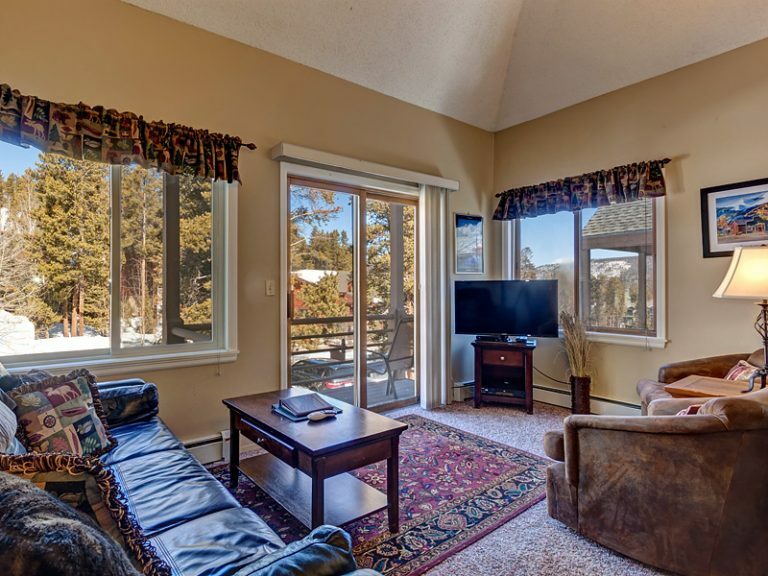 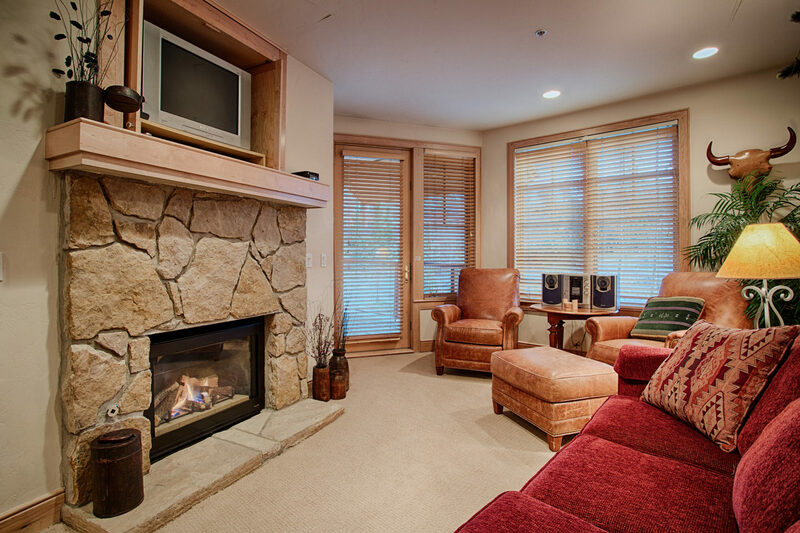 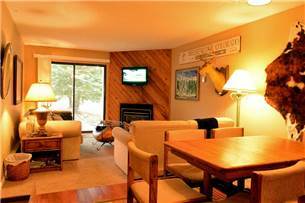 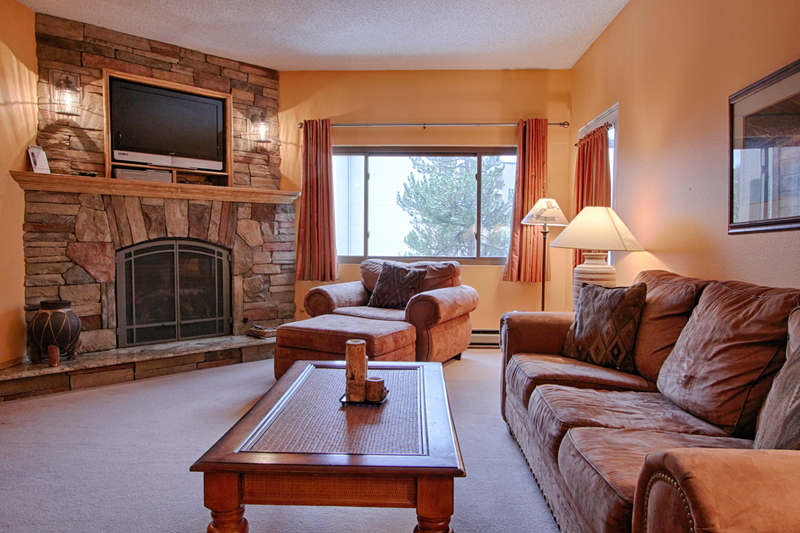 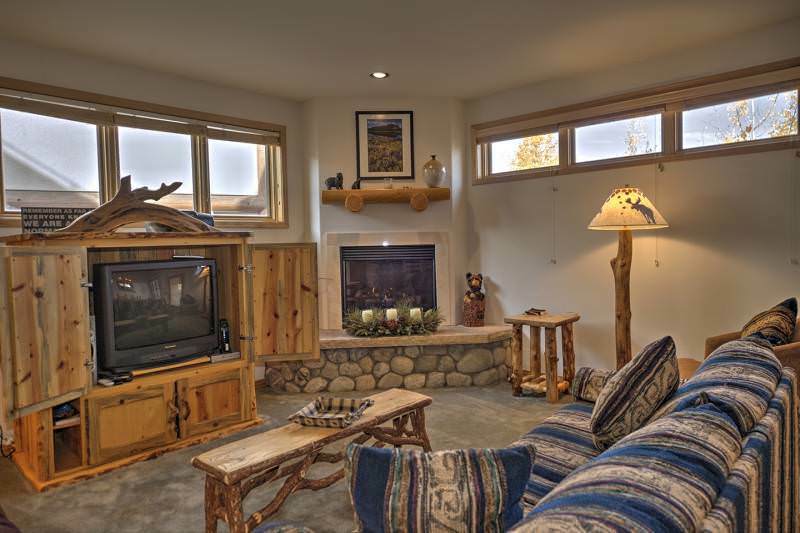 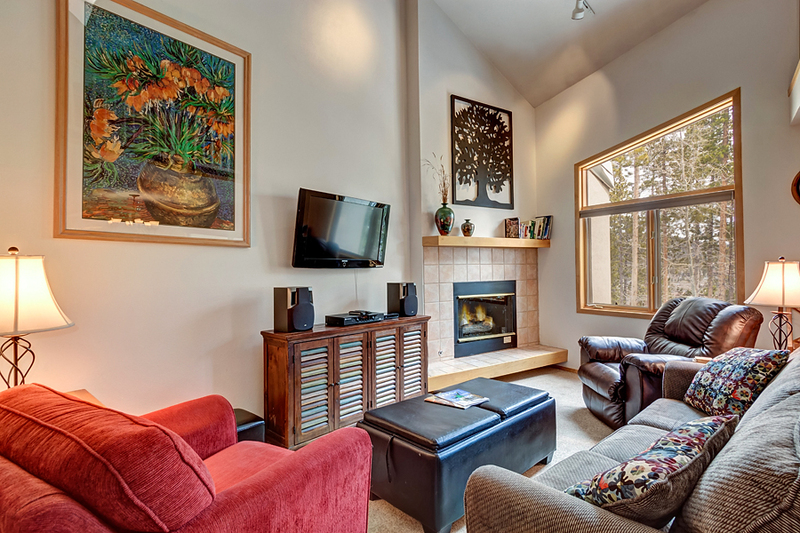 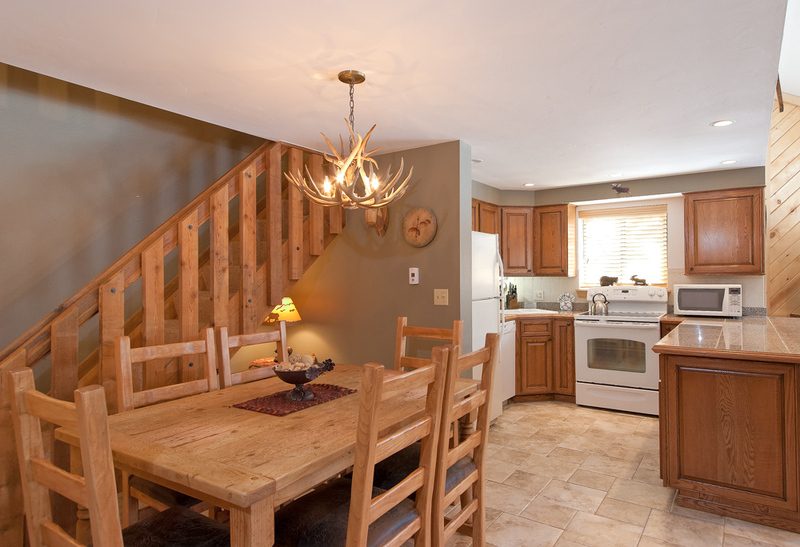 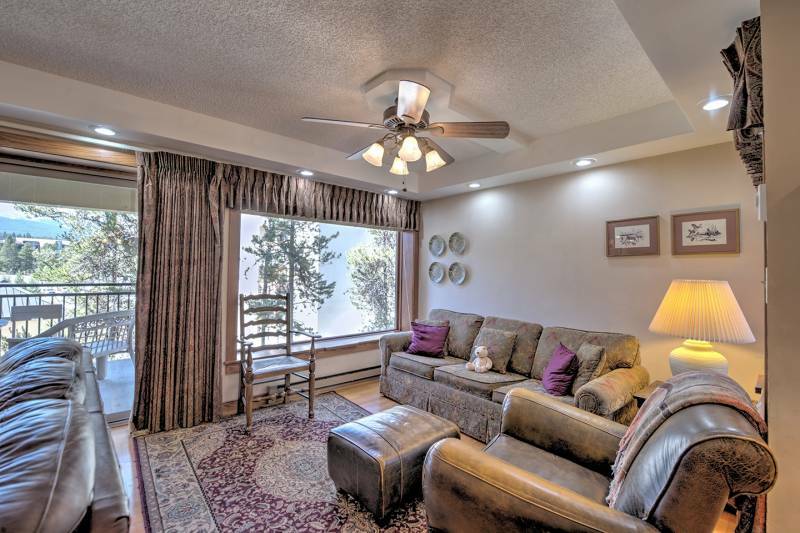 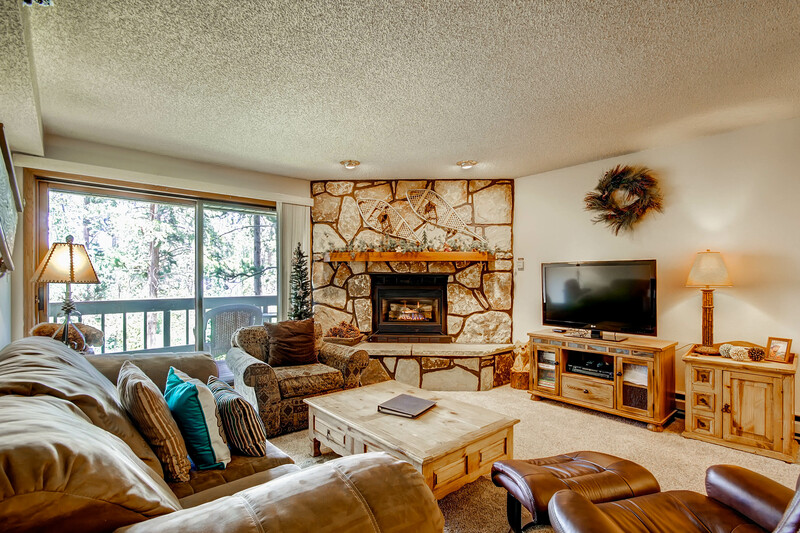 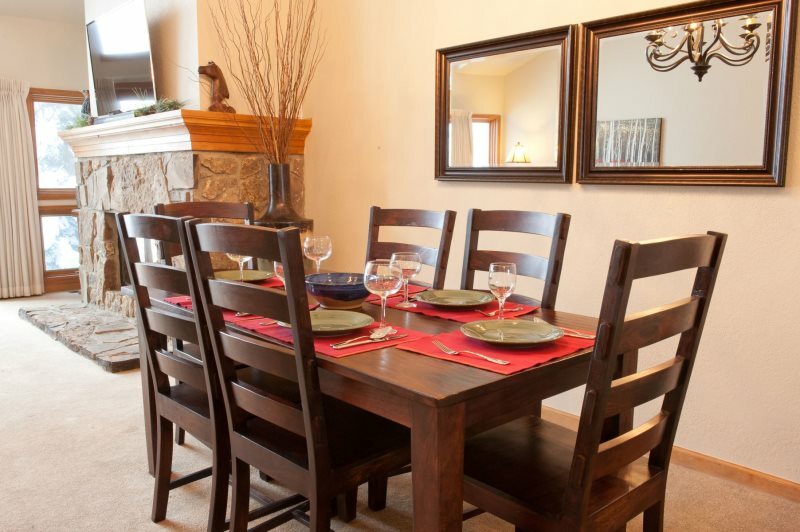 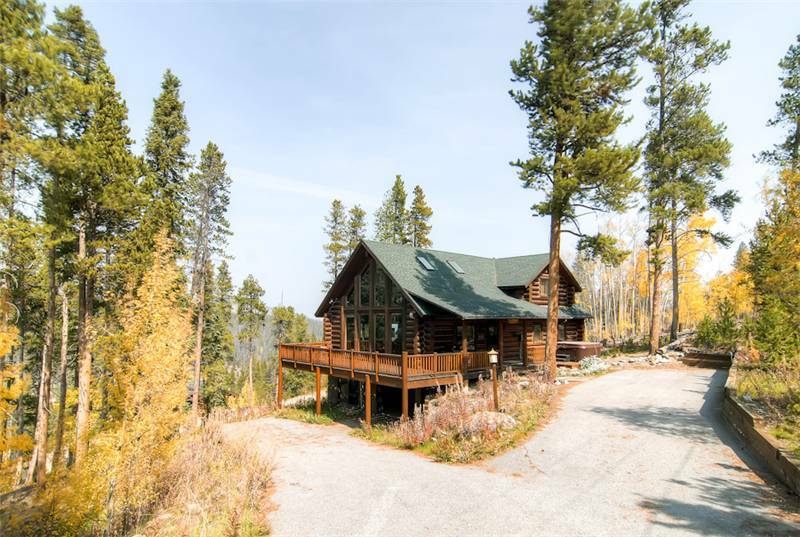 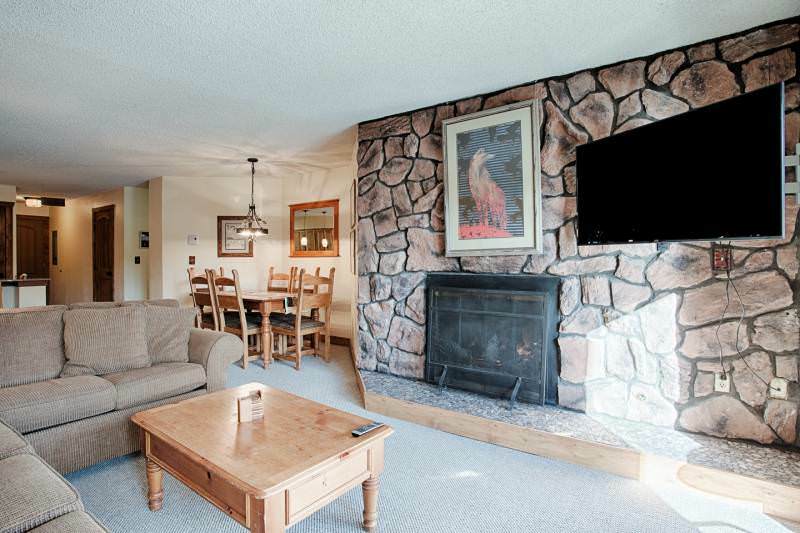 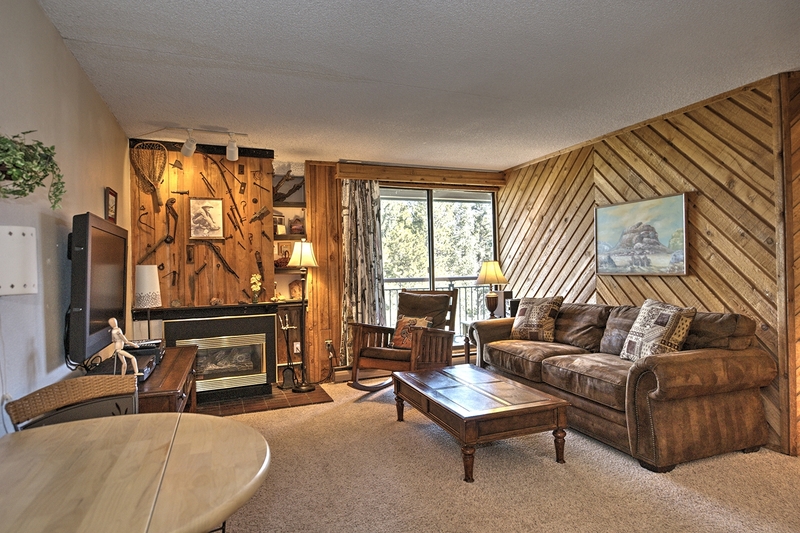 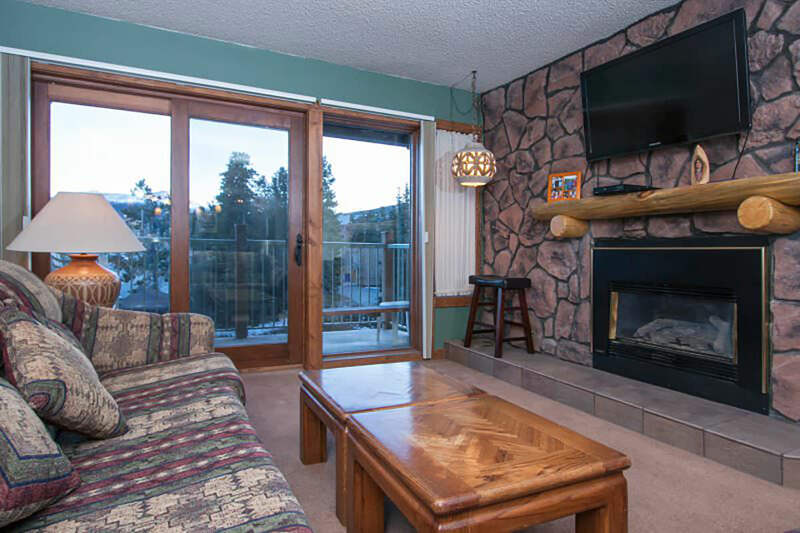 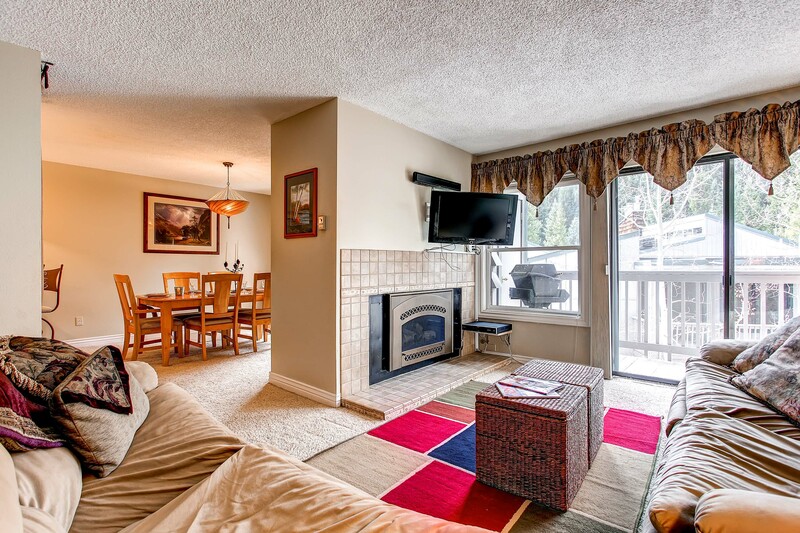 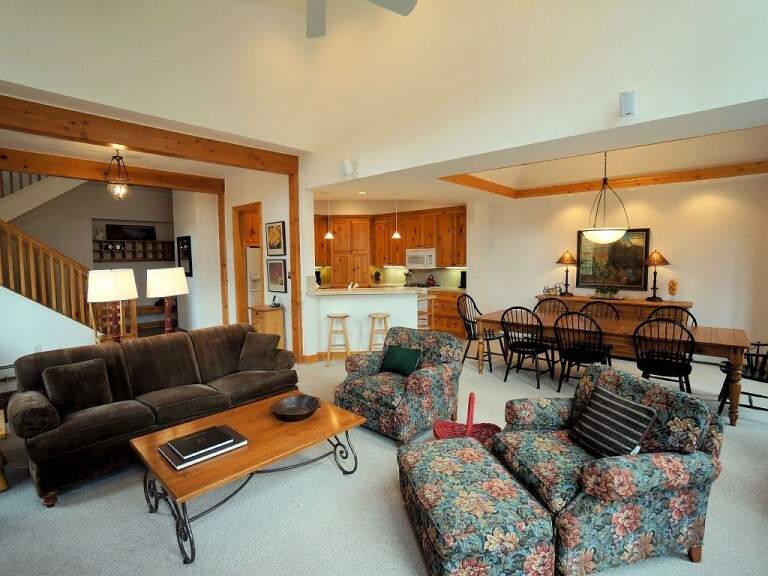 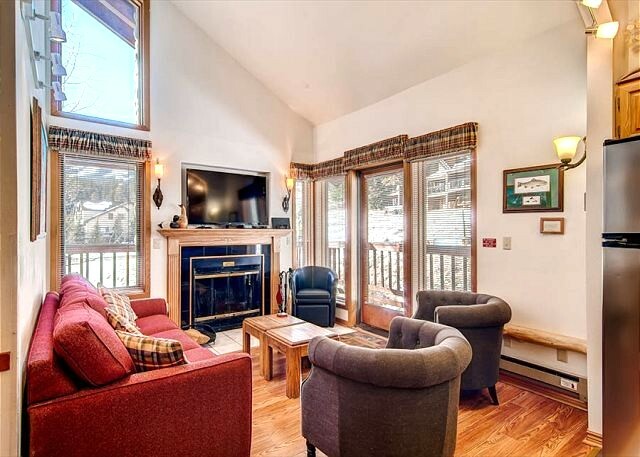 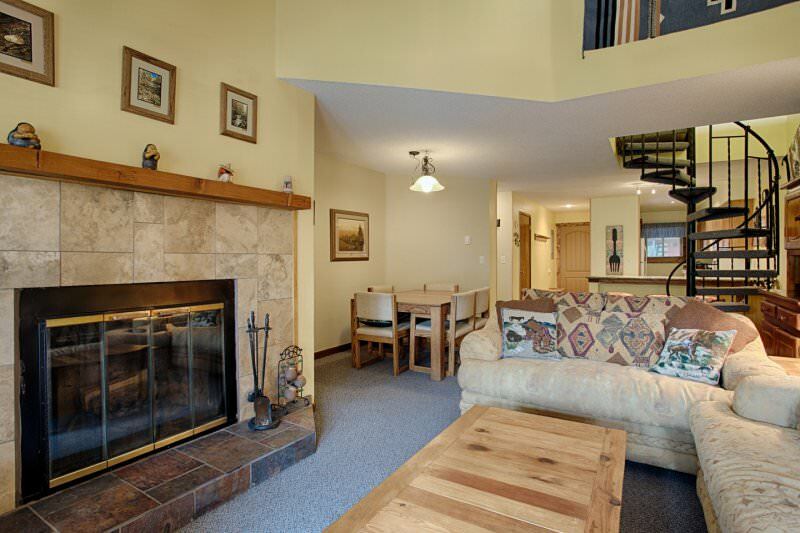 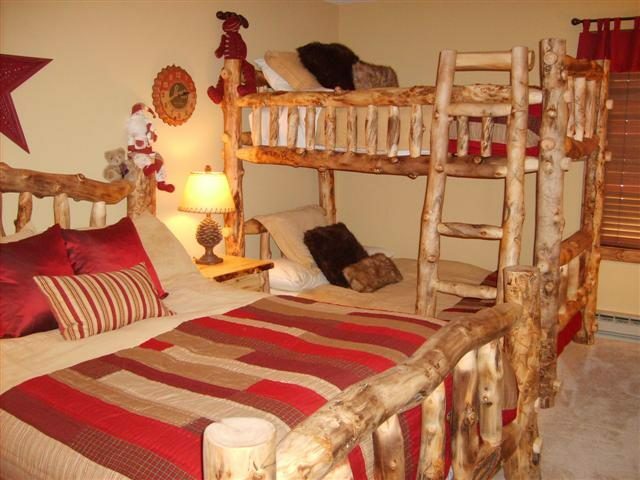 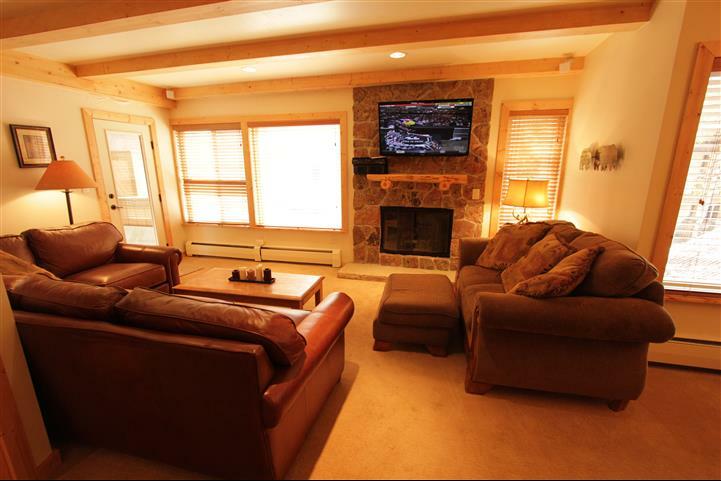 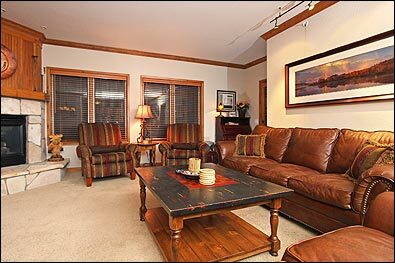 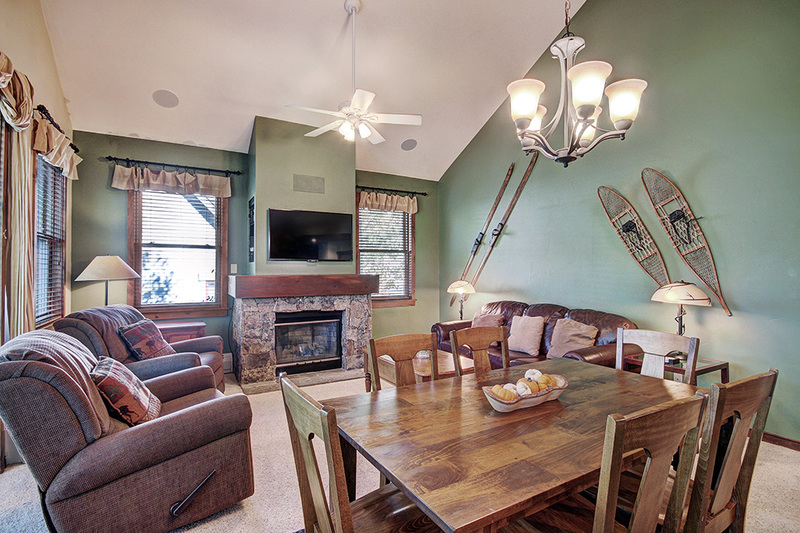 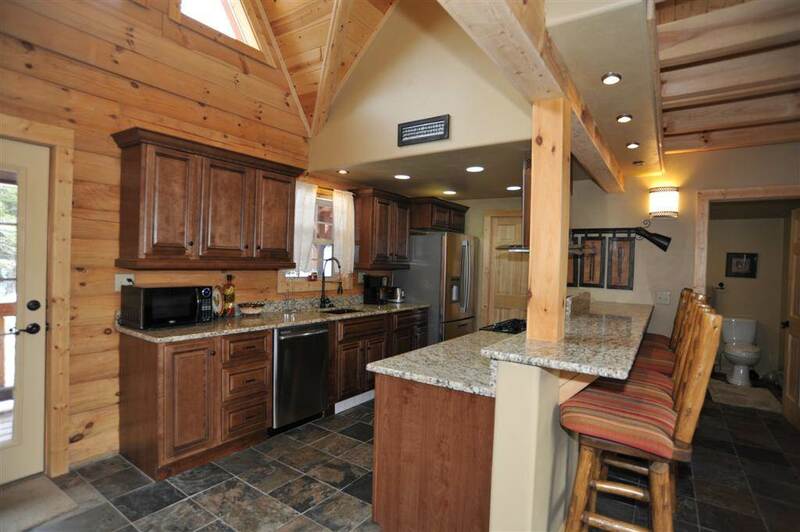 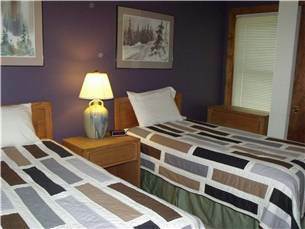 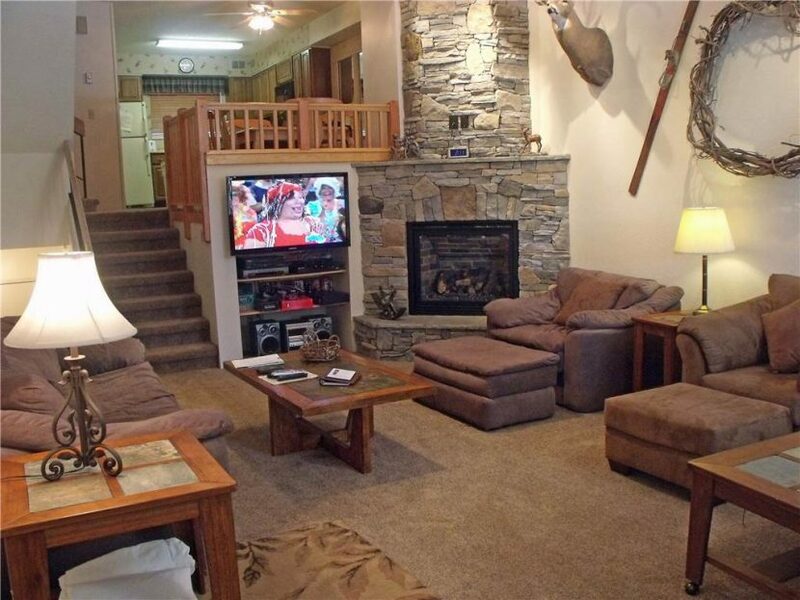 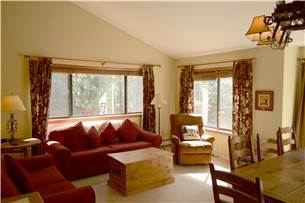 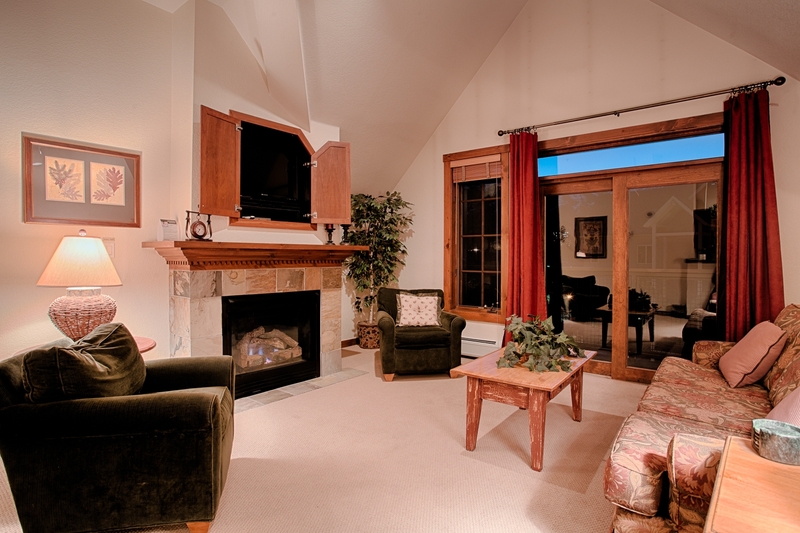 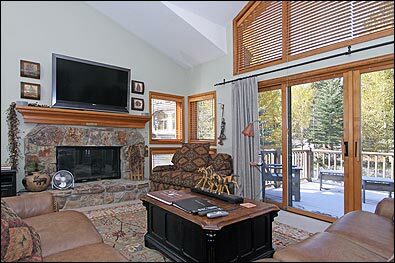 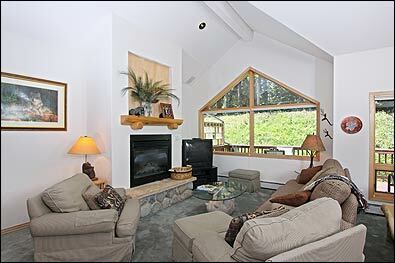 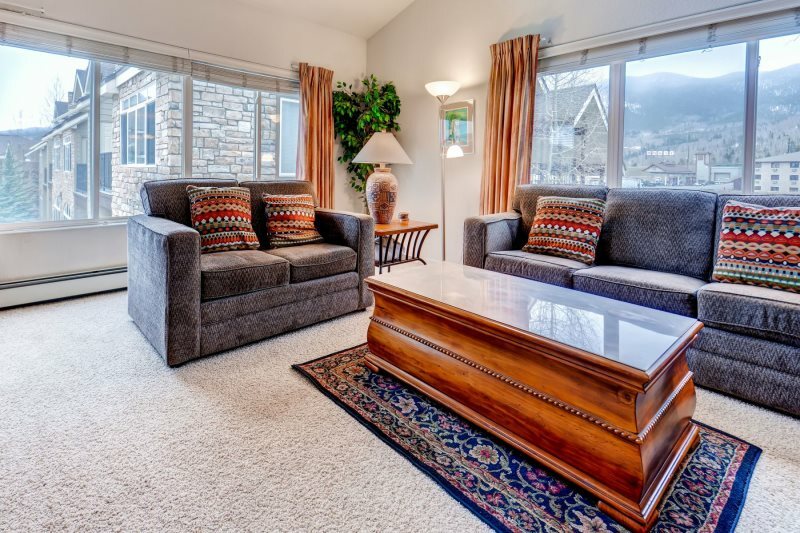 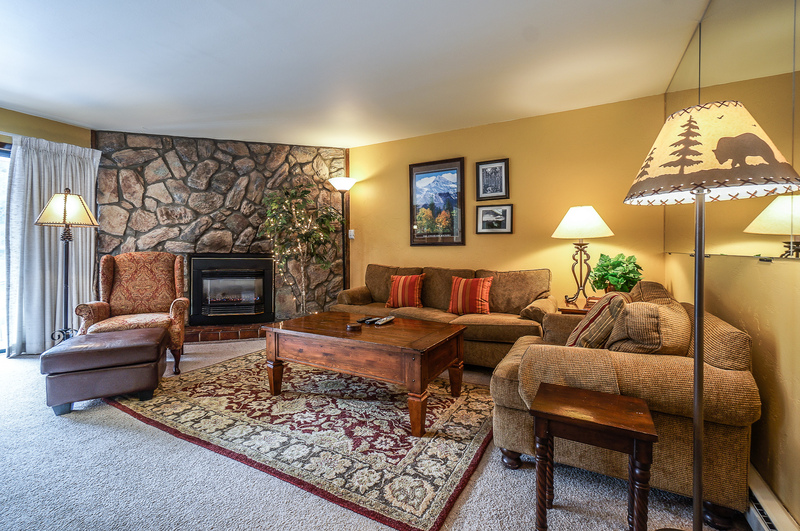 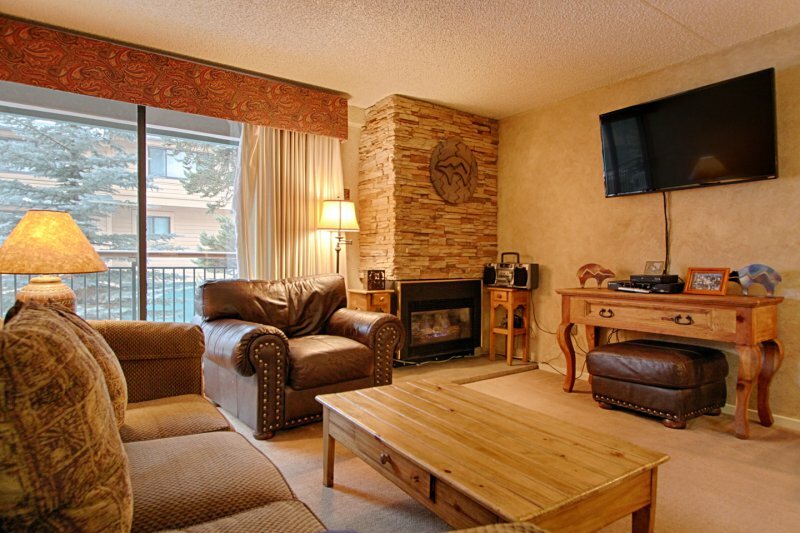 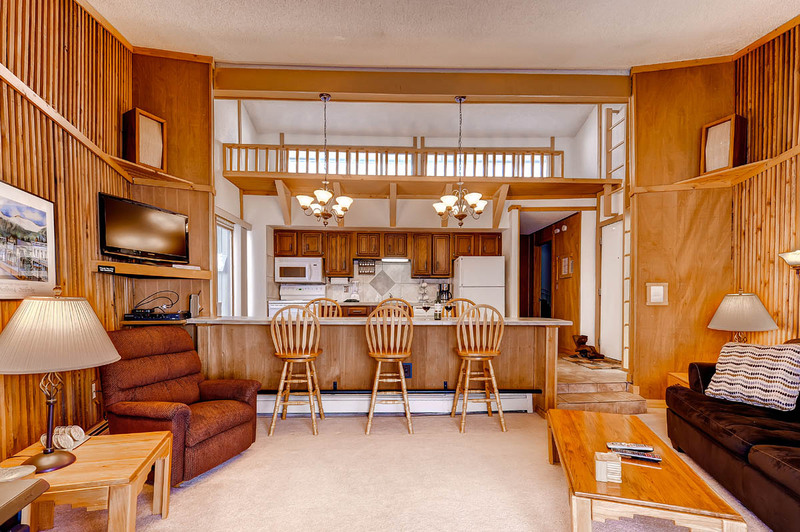 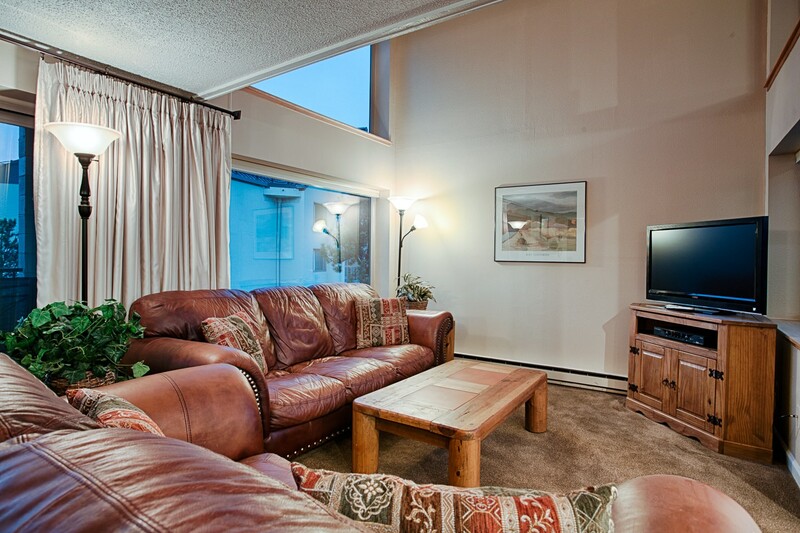 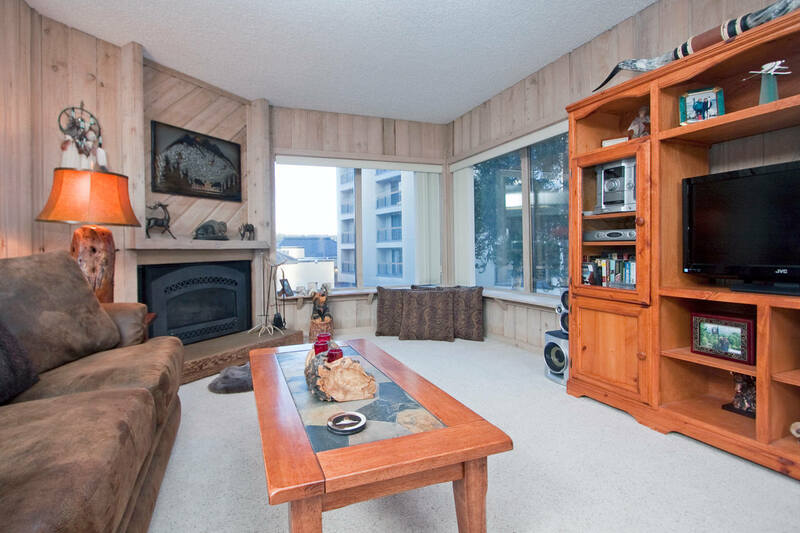 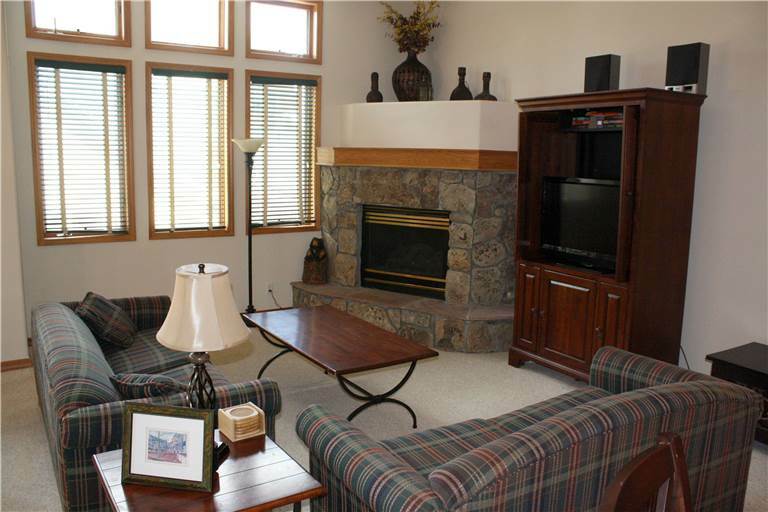 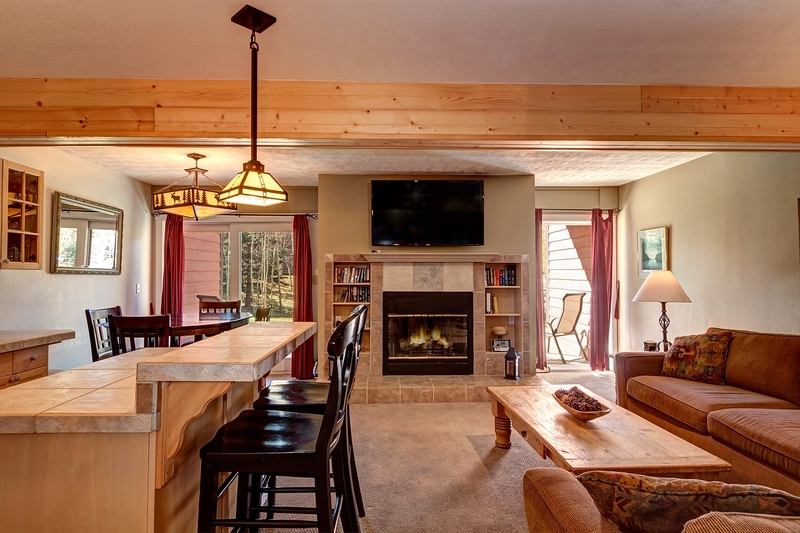 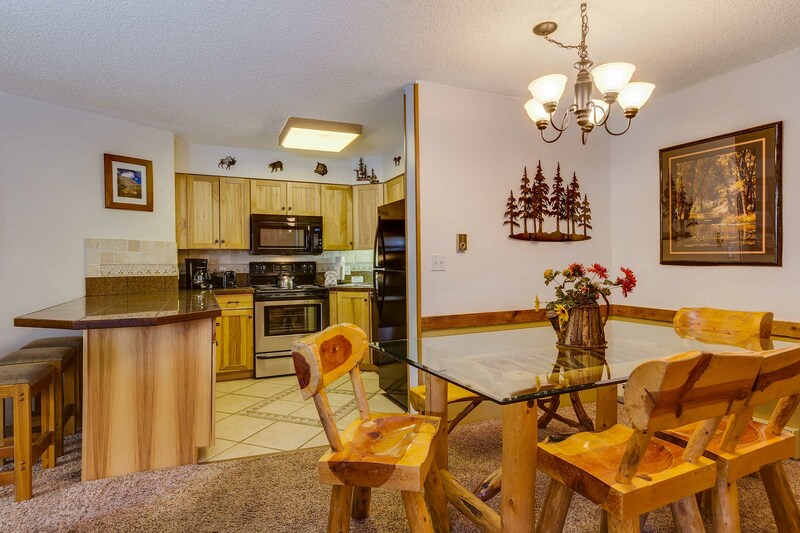 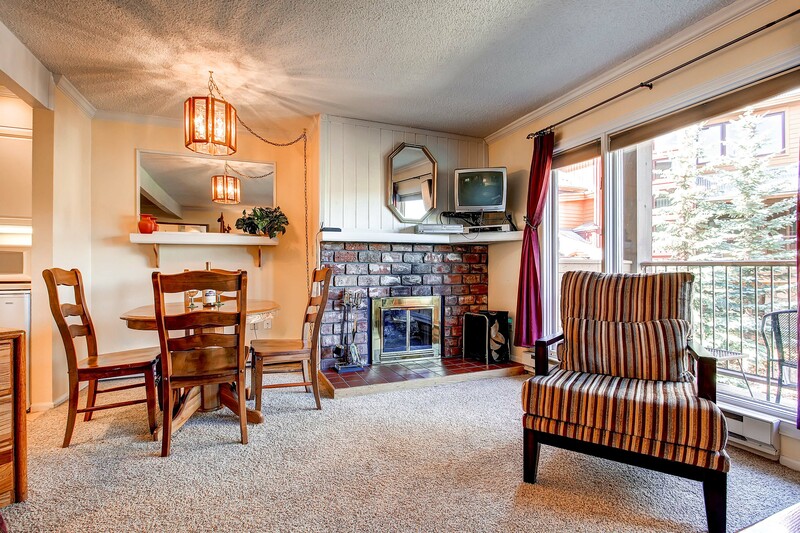 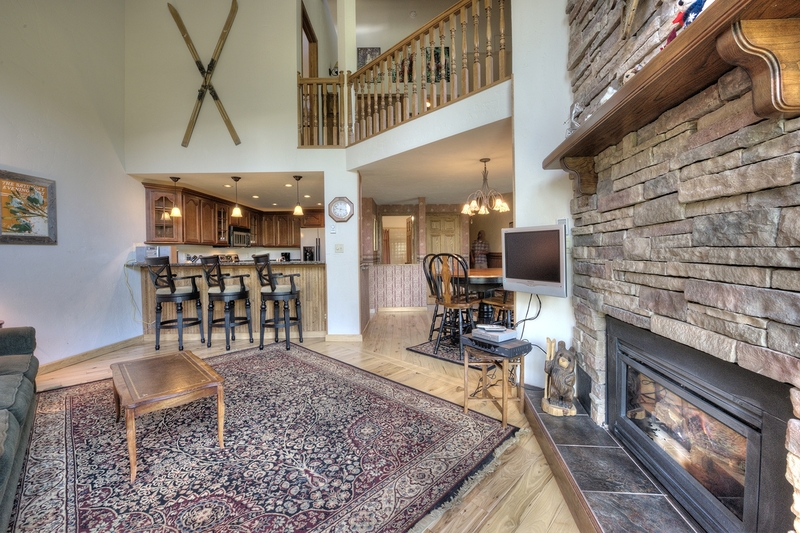 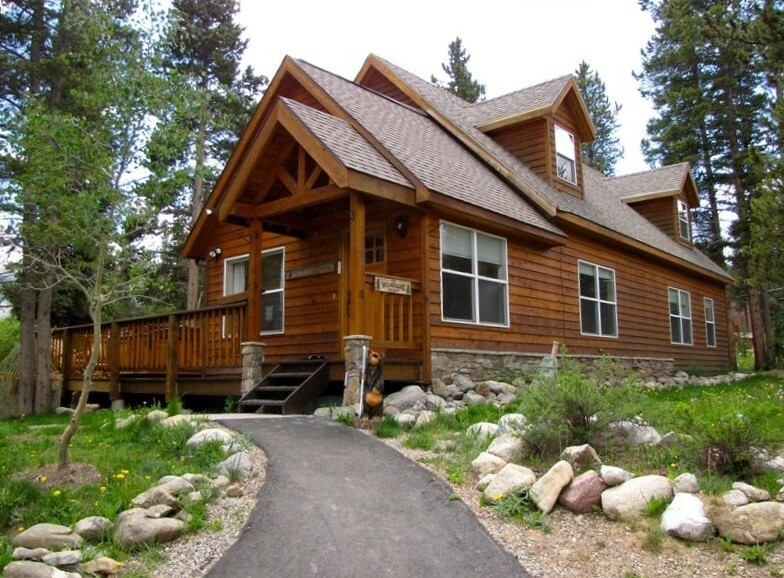 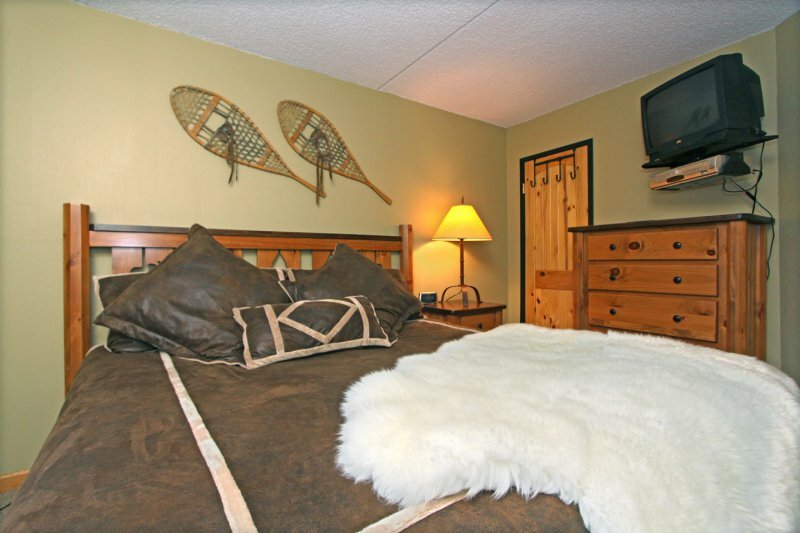 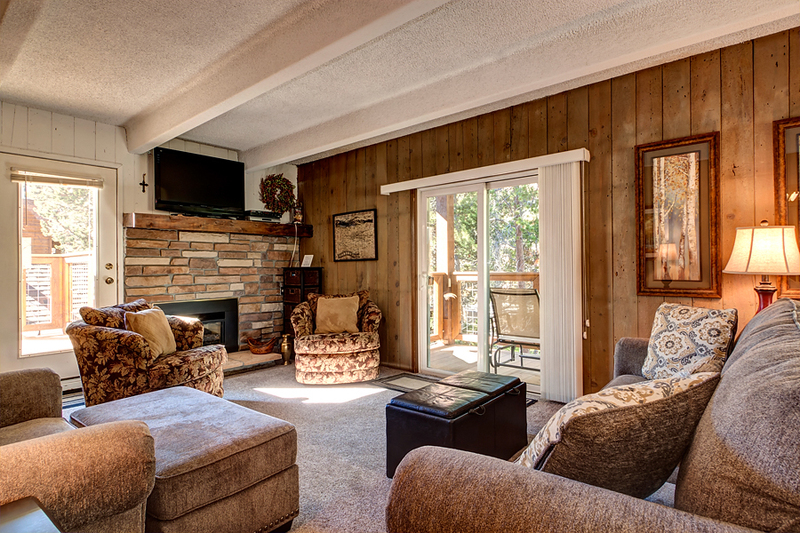 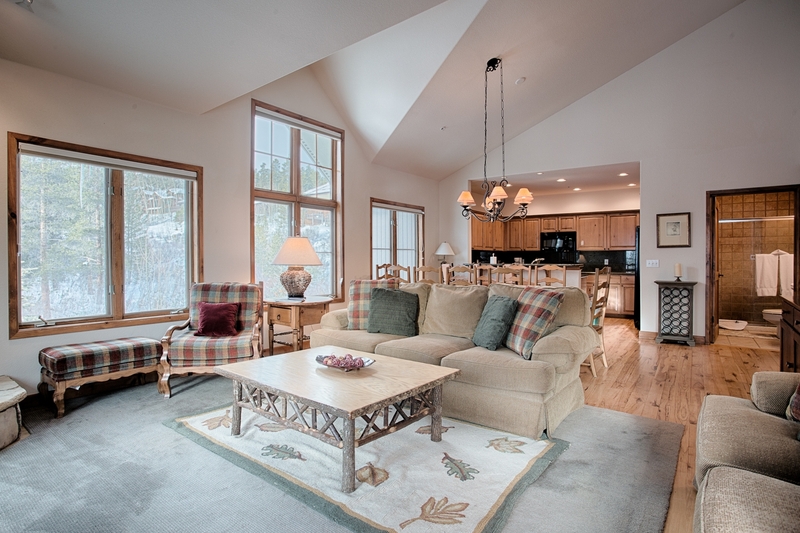 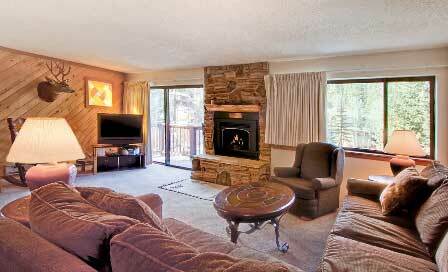 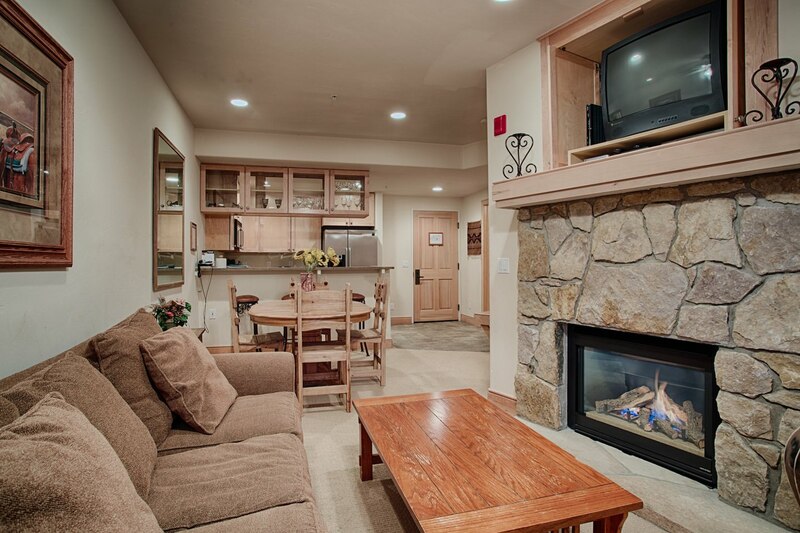 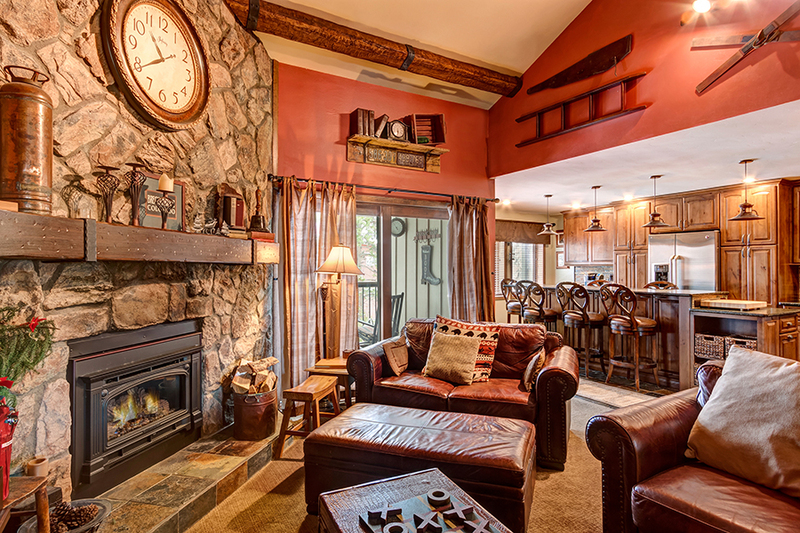 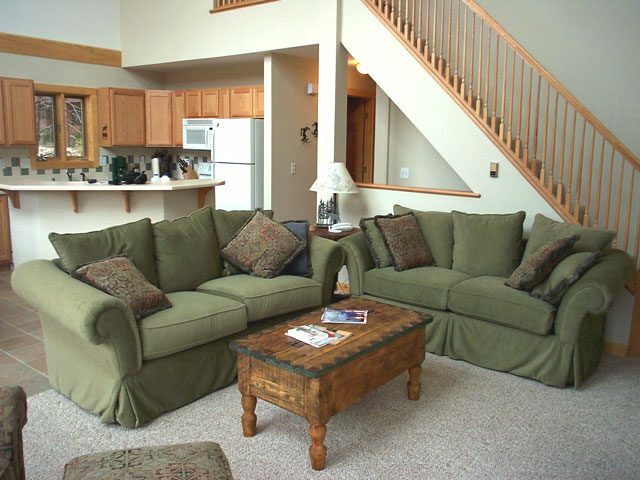 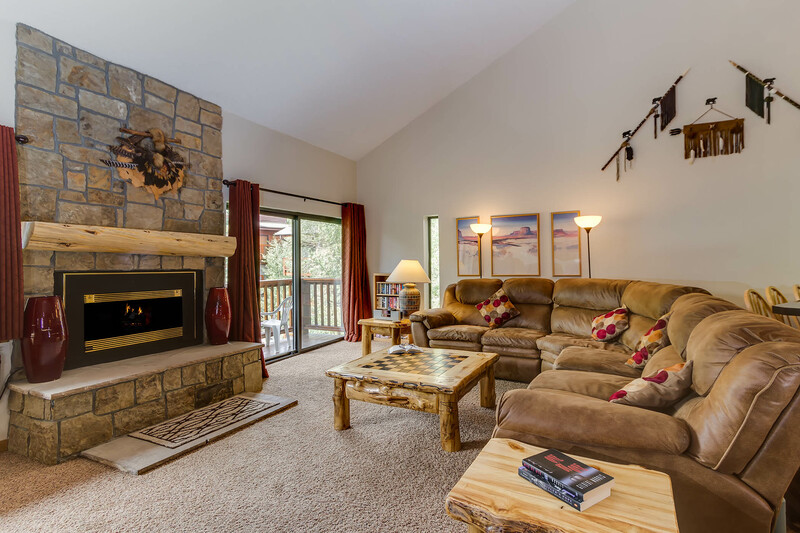 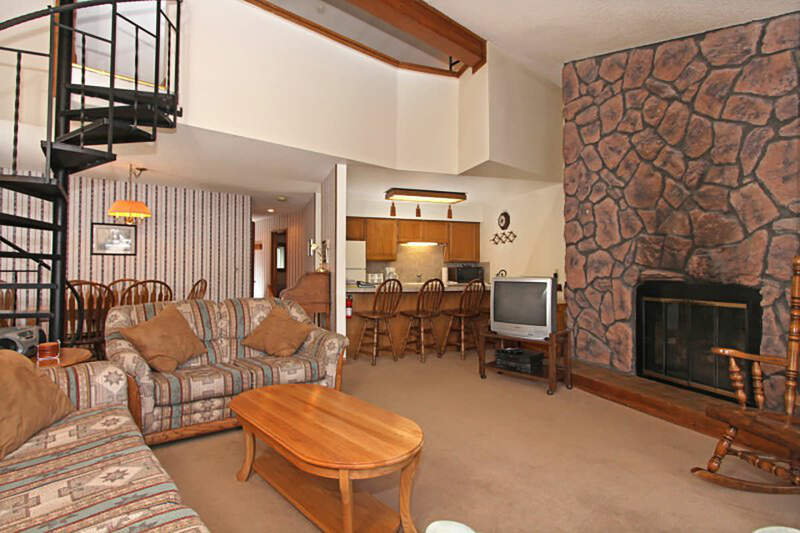 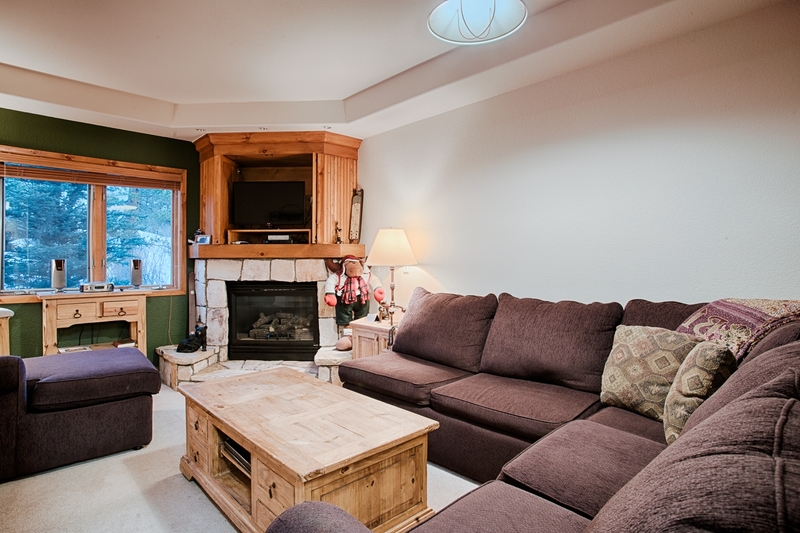 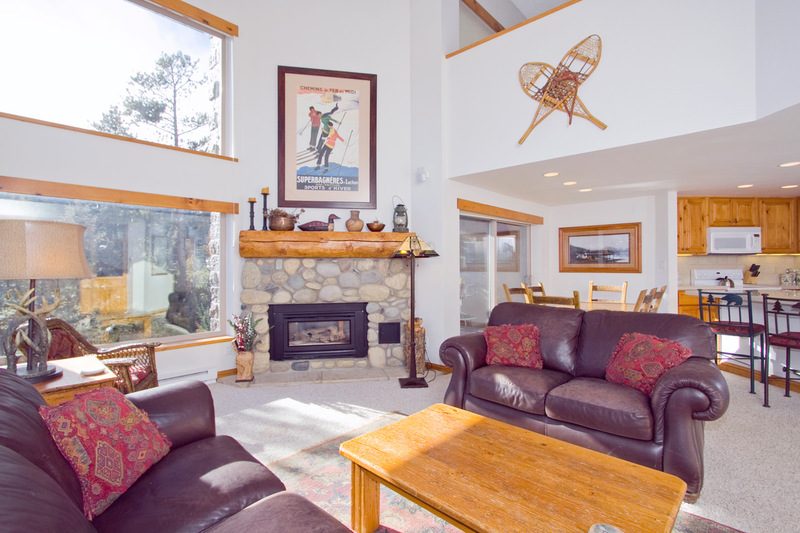 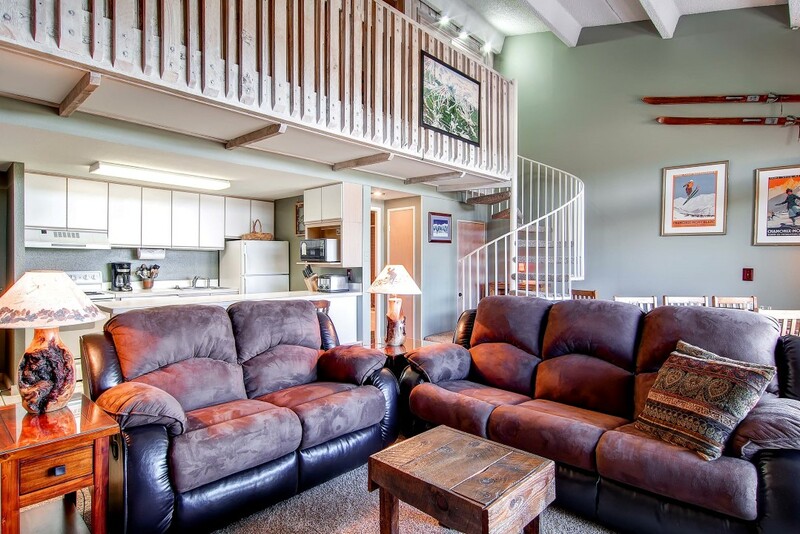 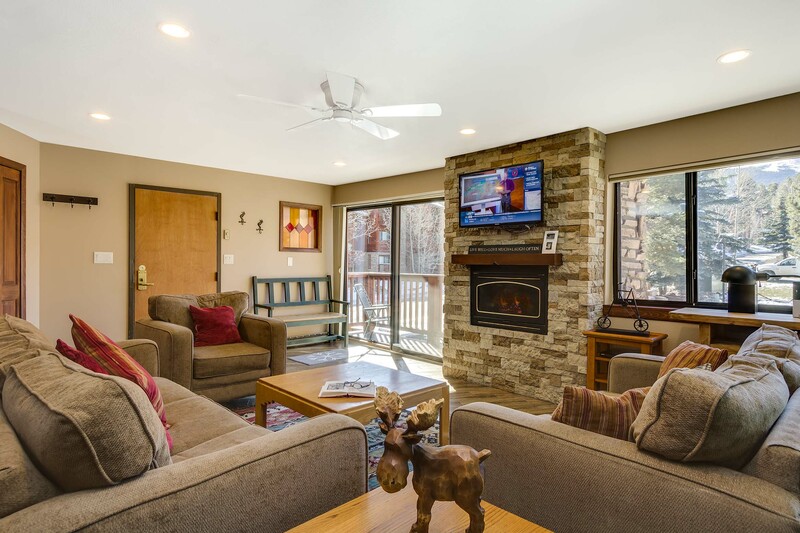 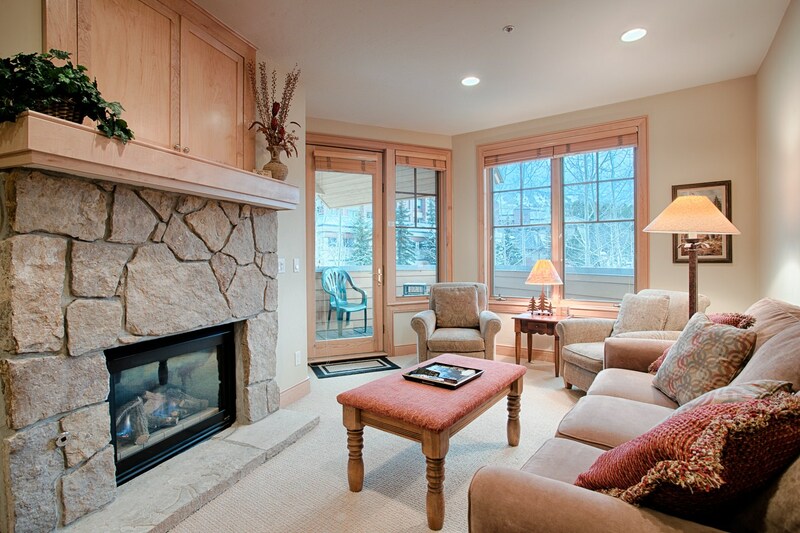 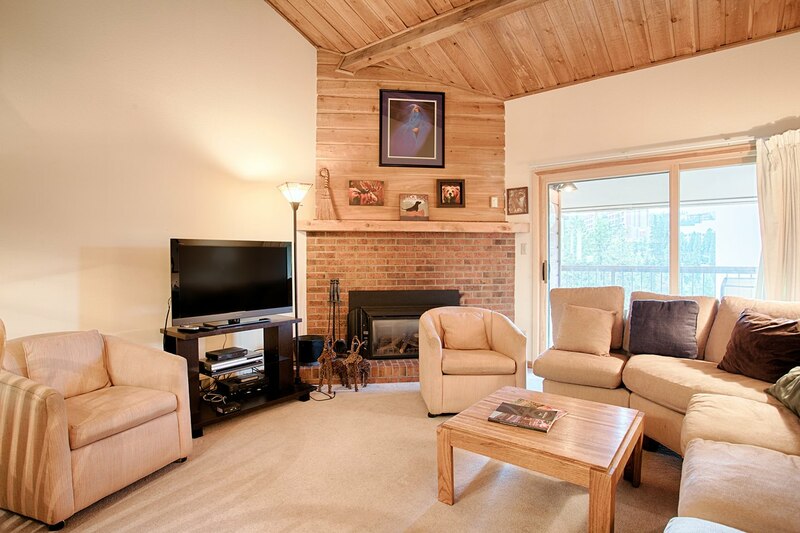 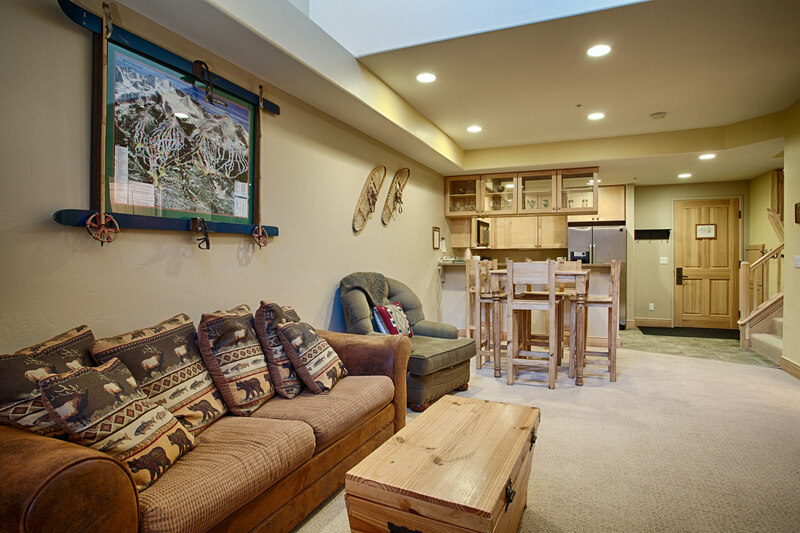 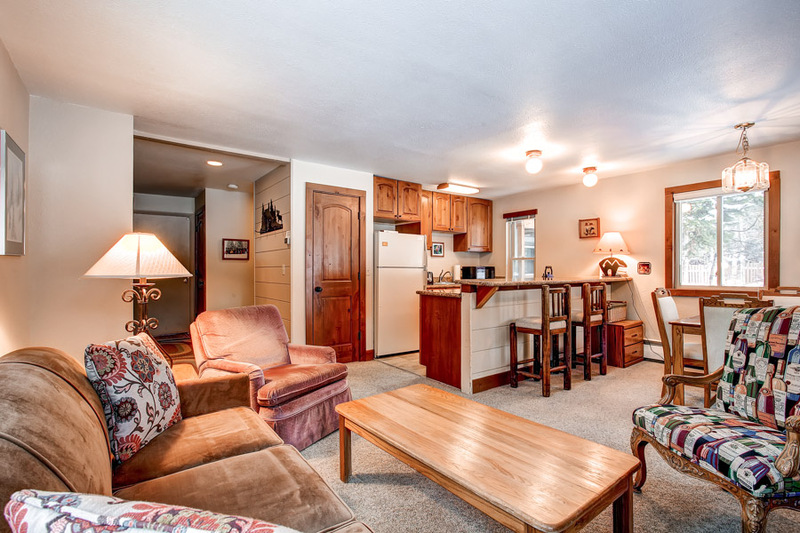 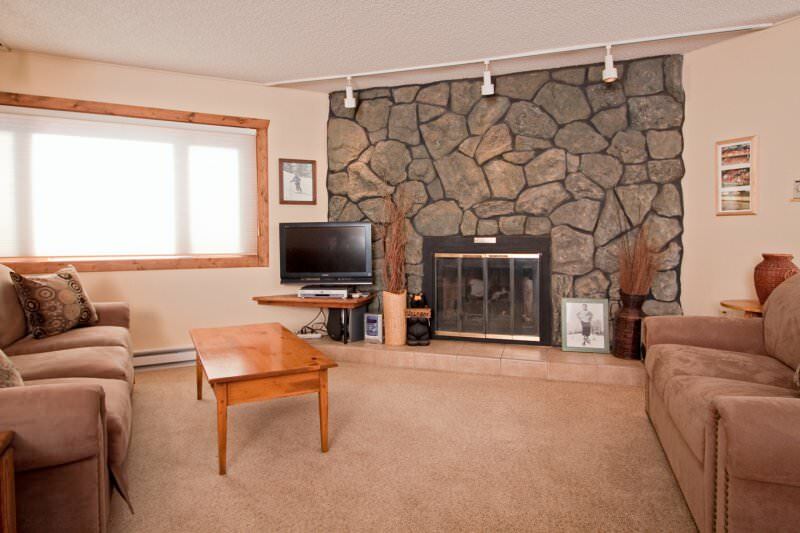 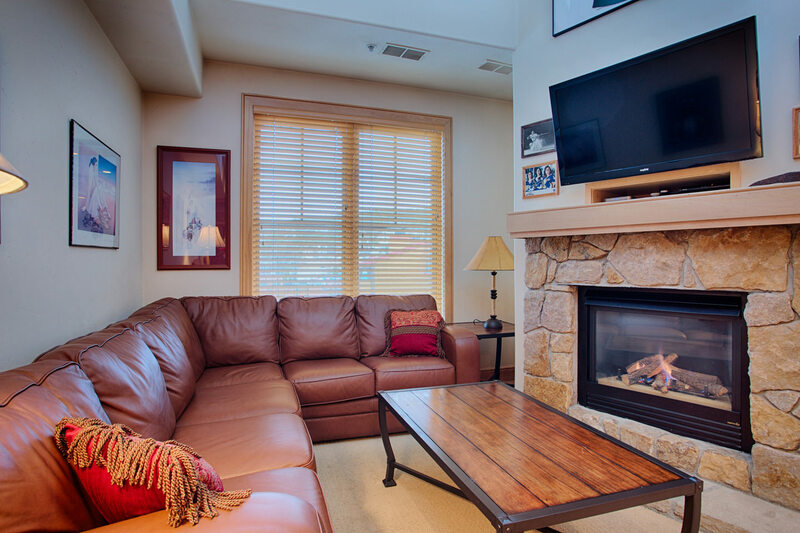 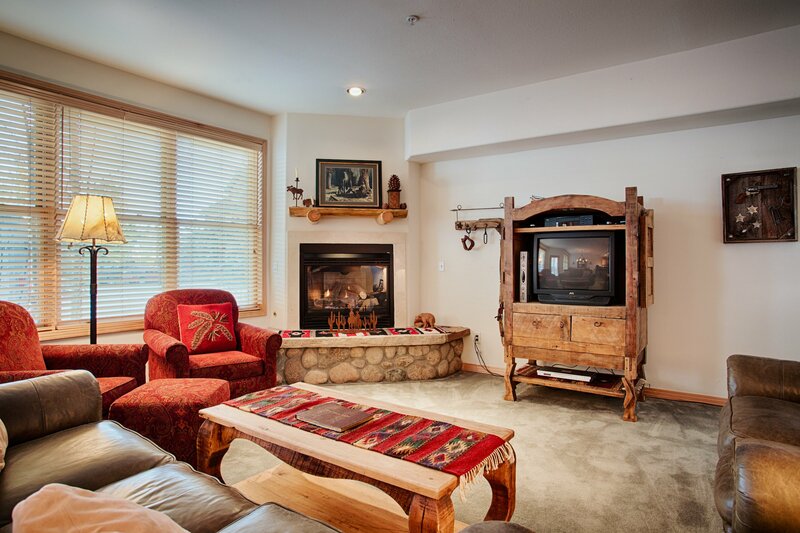 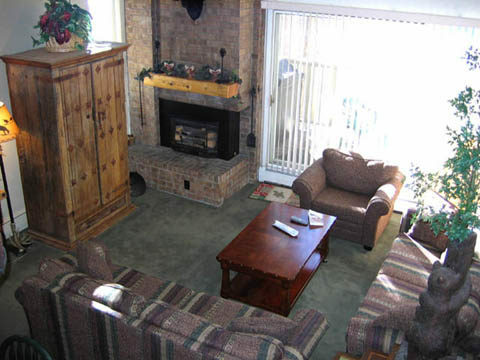 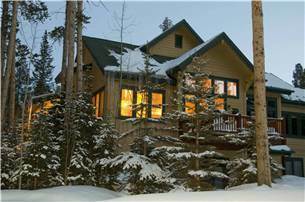 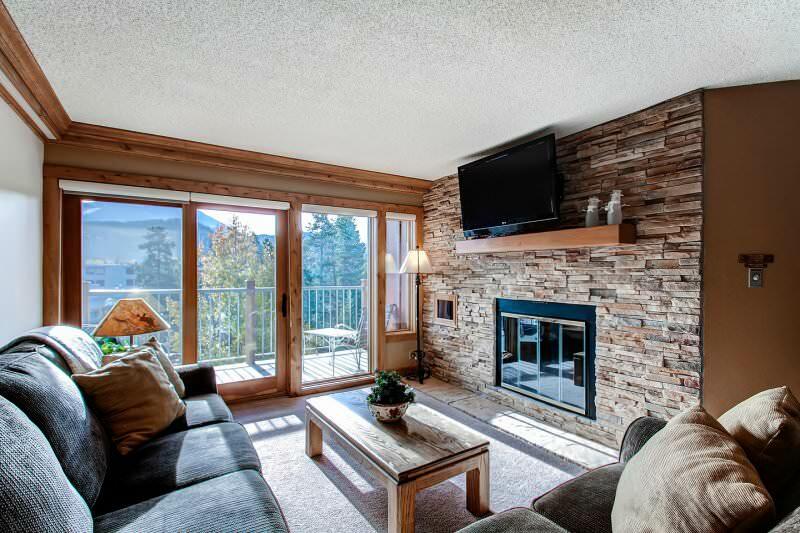 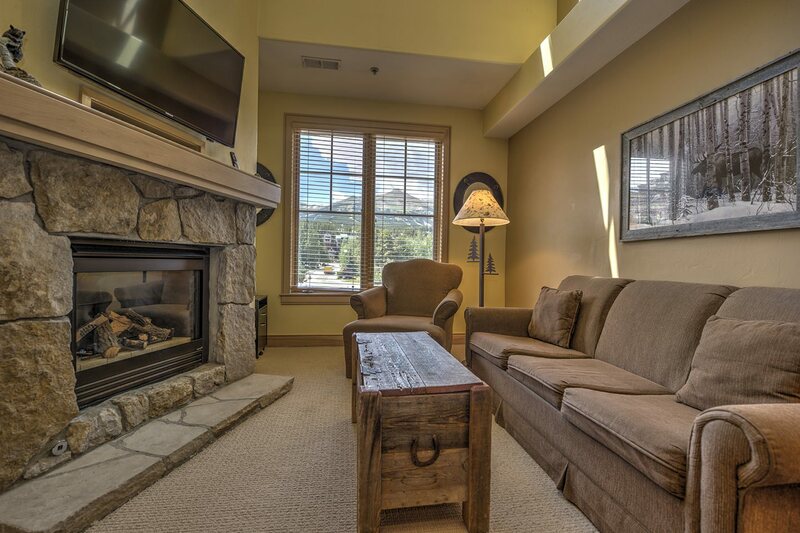 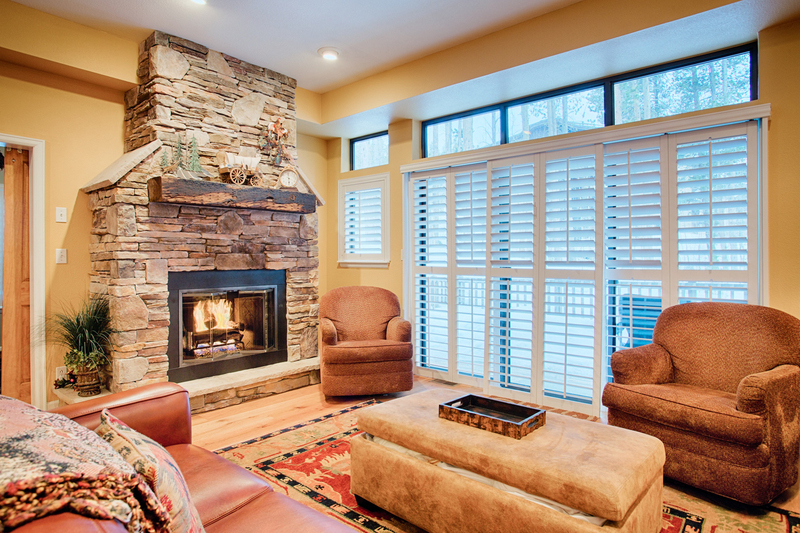 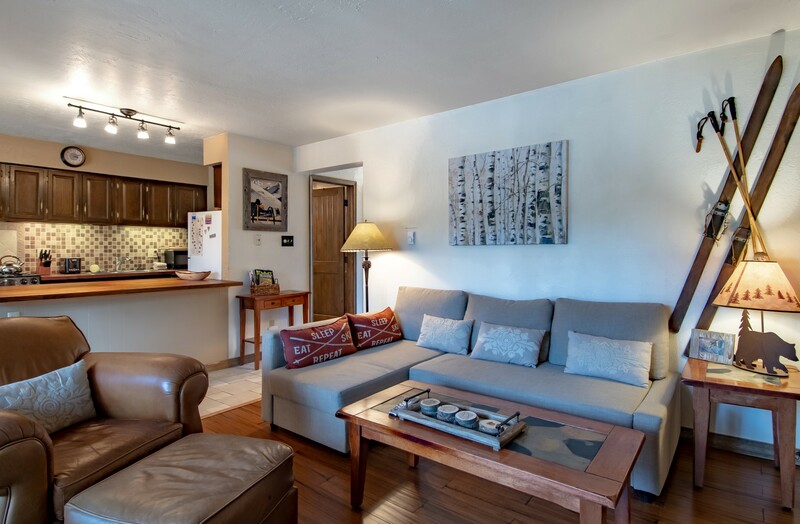 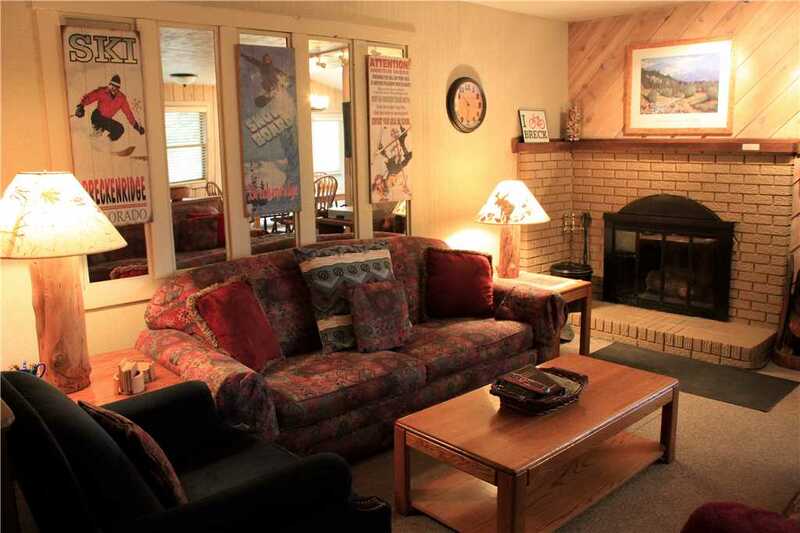 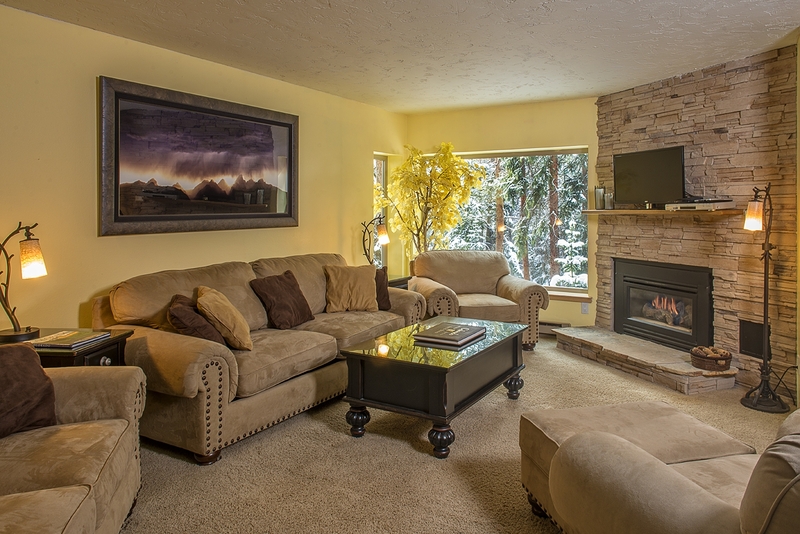 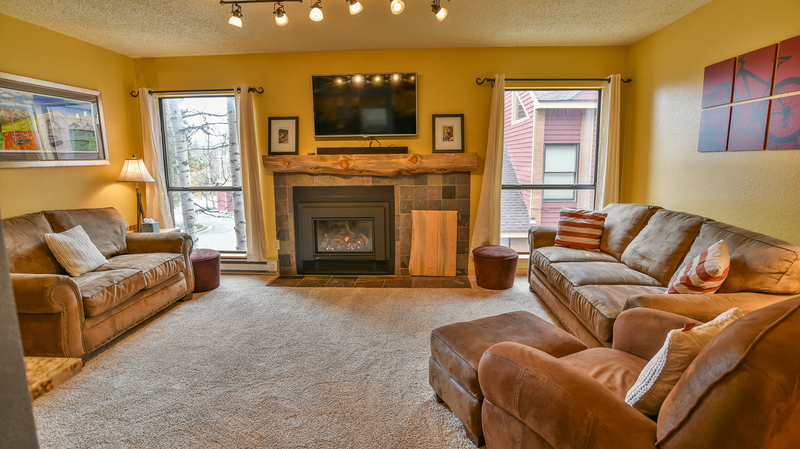 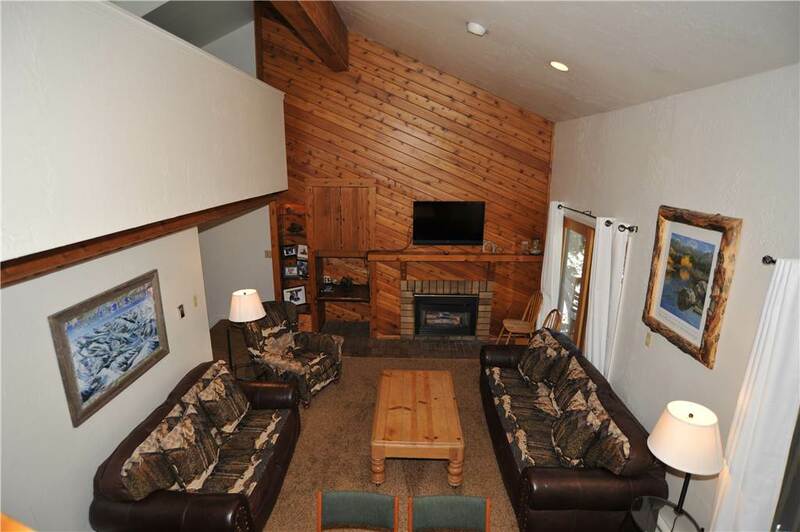 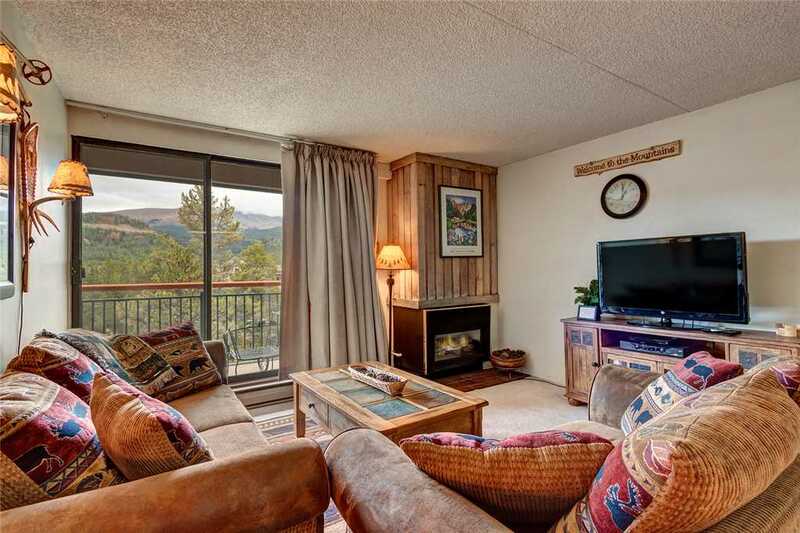 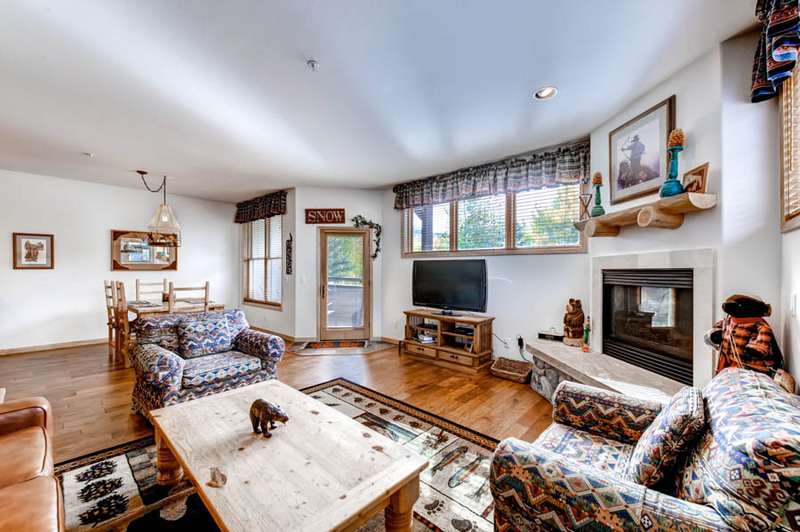 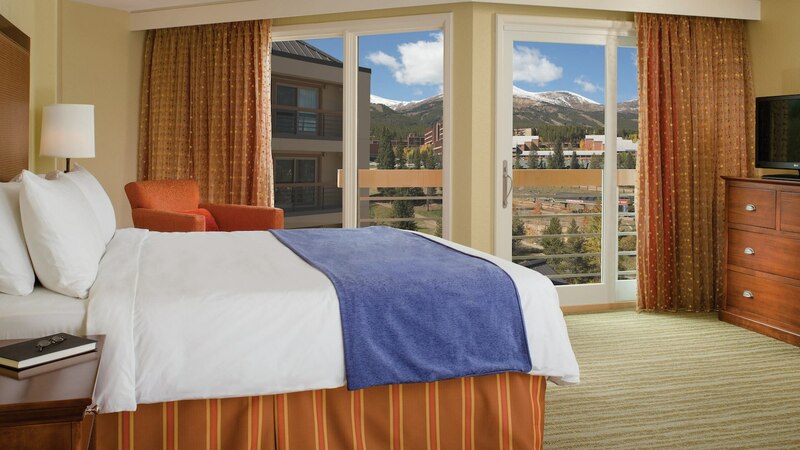 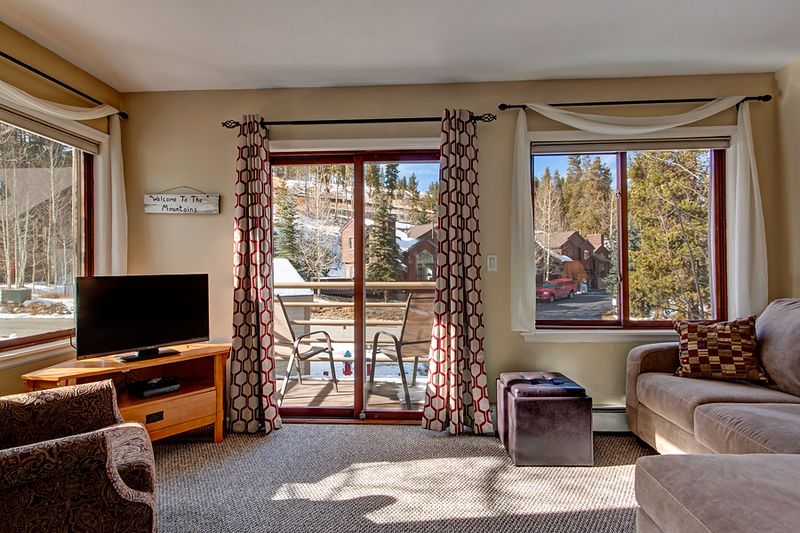 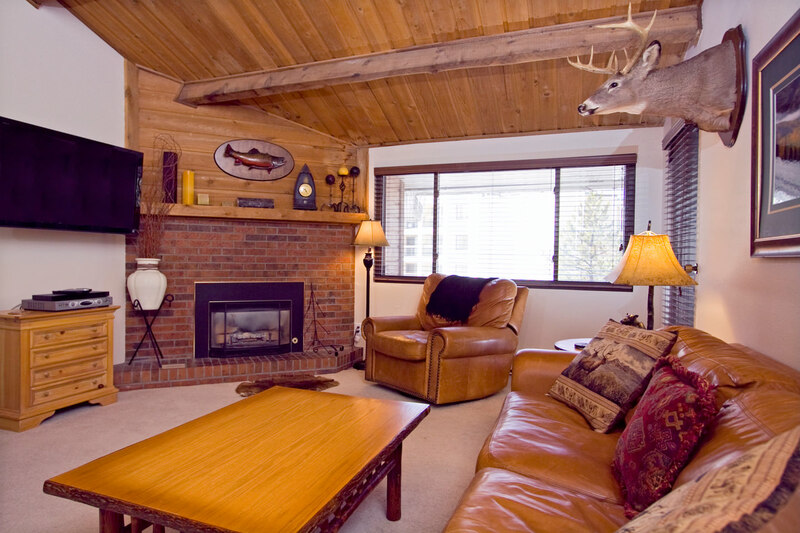 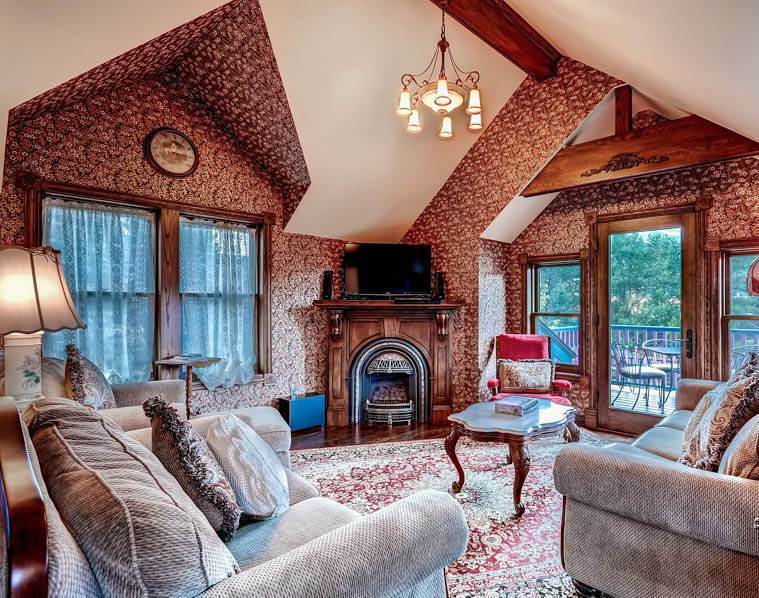 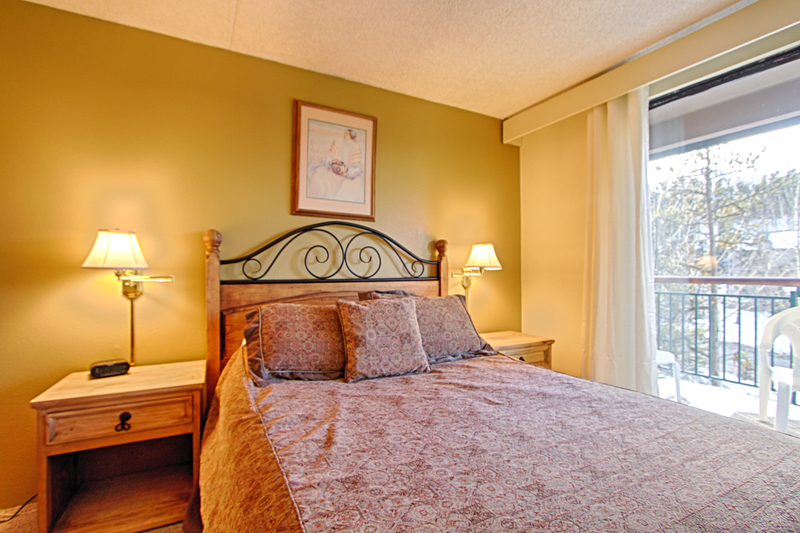 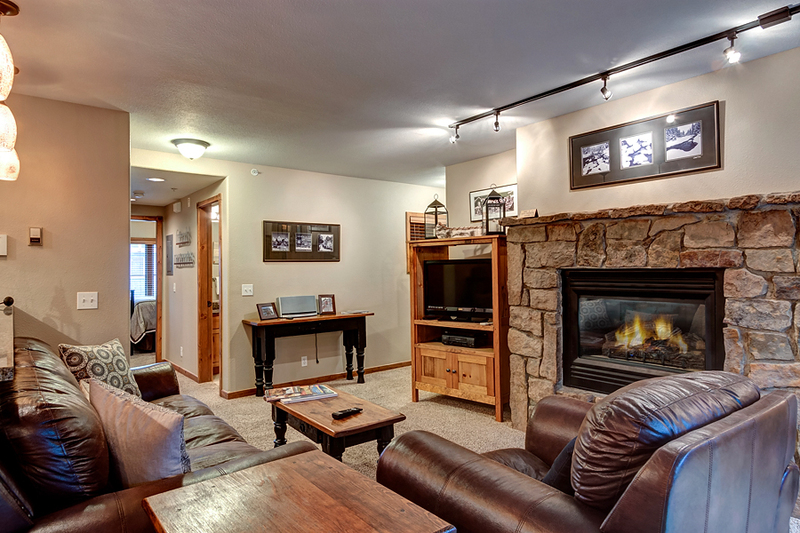 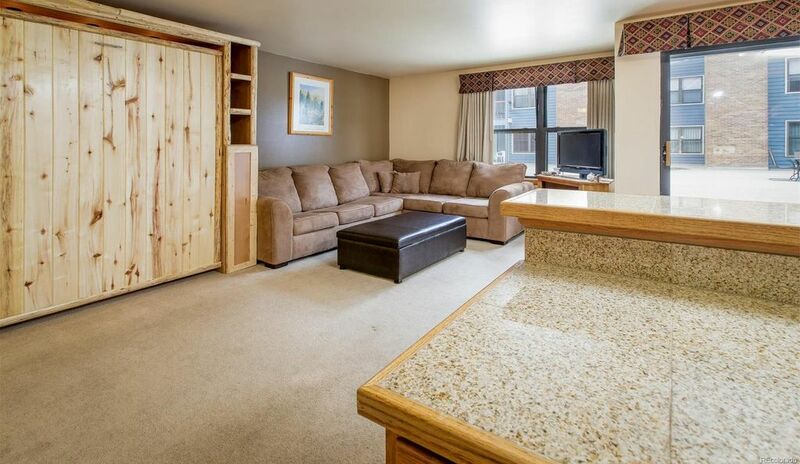 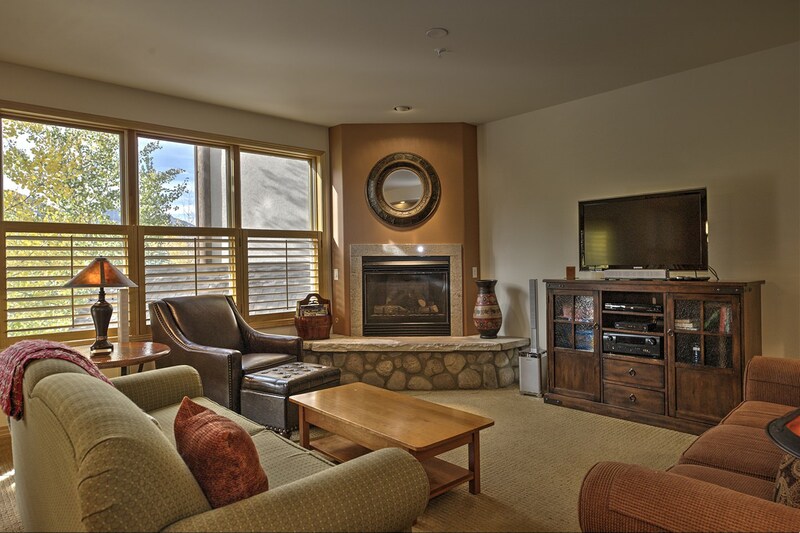 You will find all the amenities needed to make your mountain stay comfortable and enjoyable. 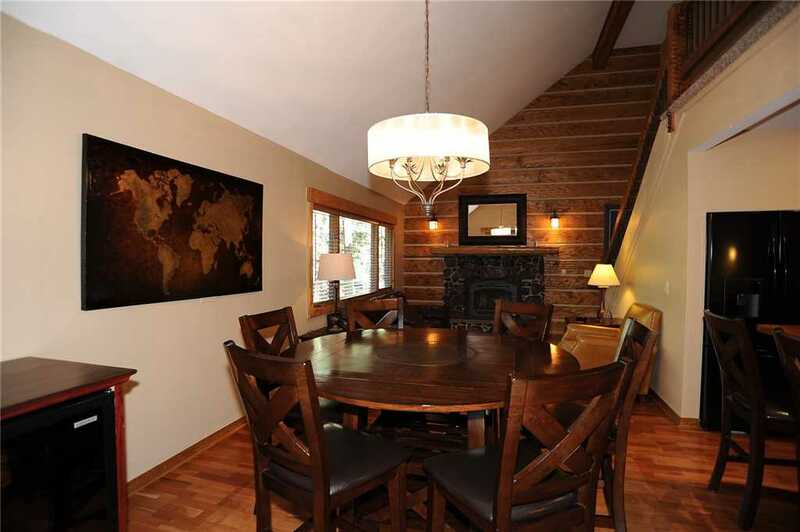 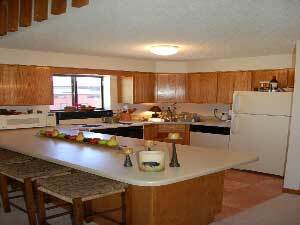 The main level has the kitchen, living room, dining room, and half bathroom. 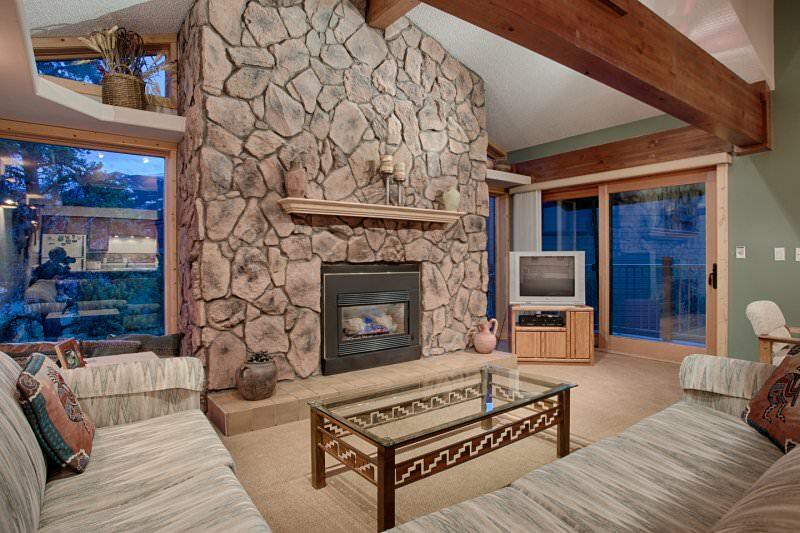 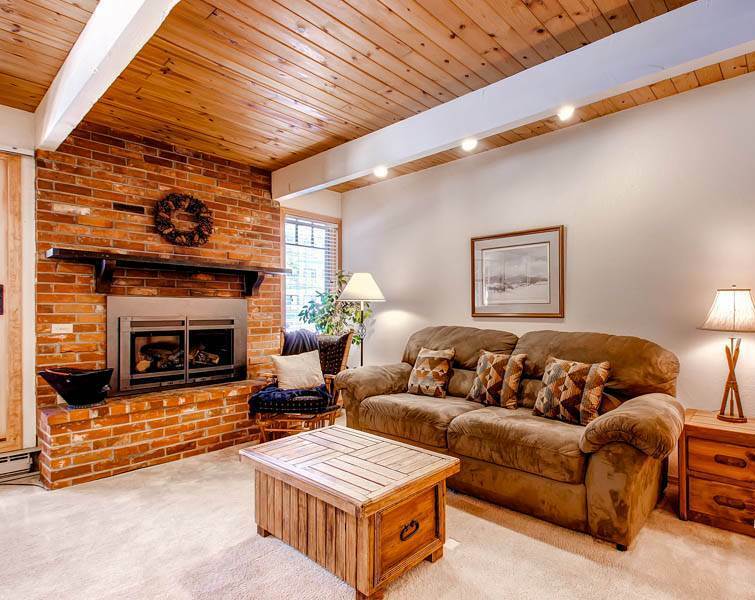 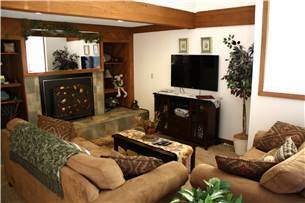 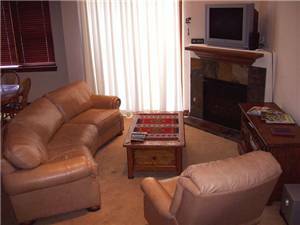 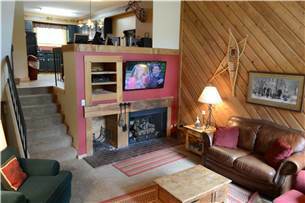 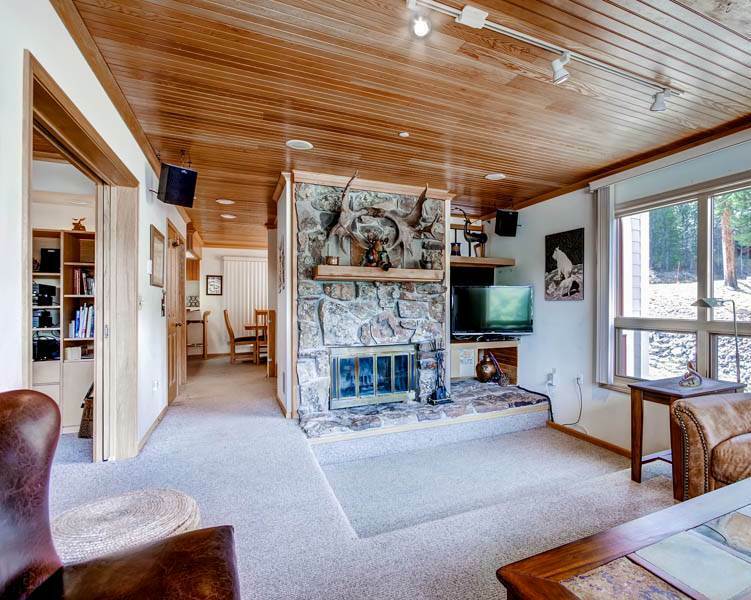 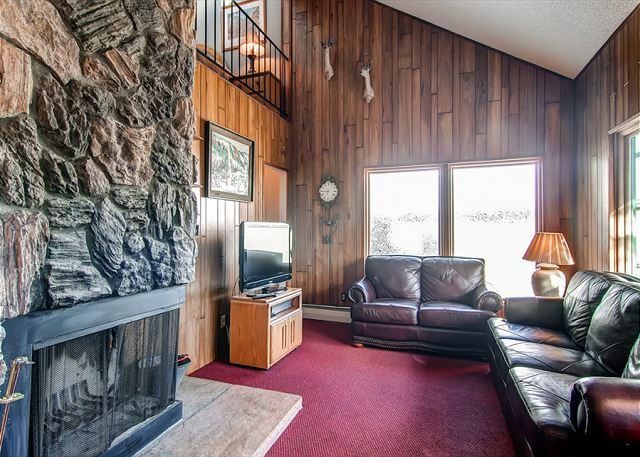 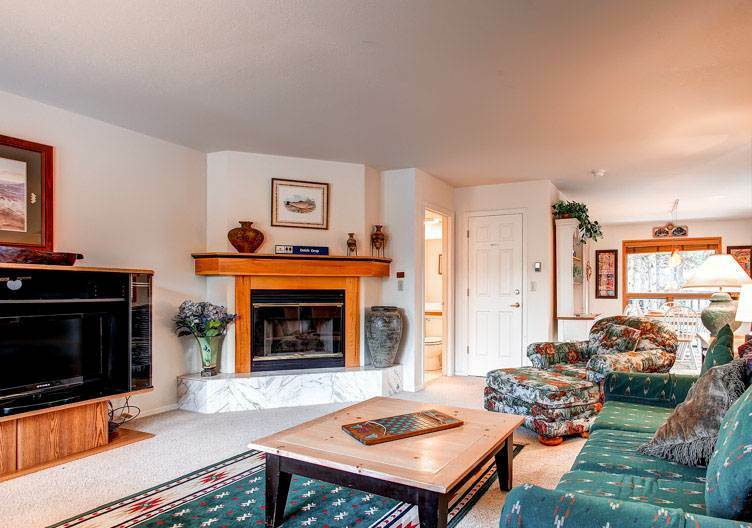 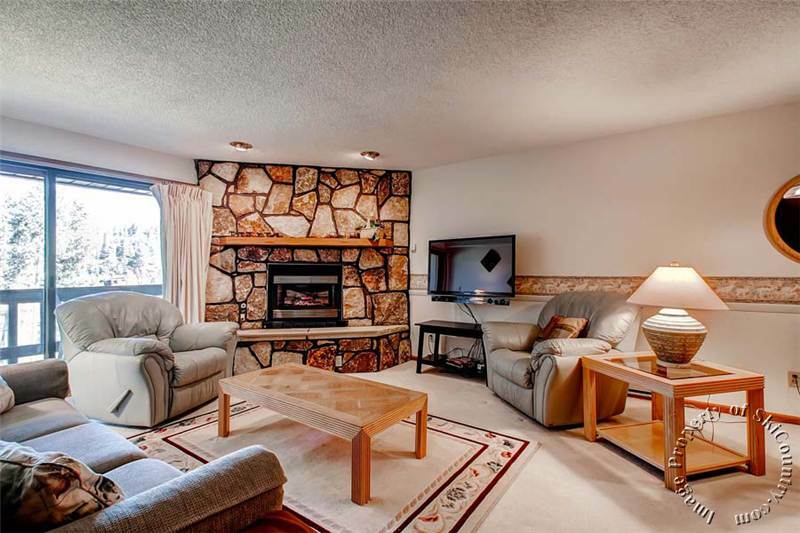 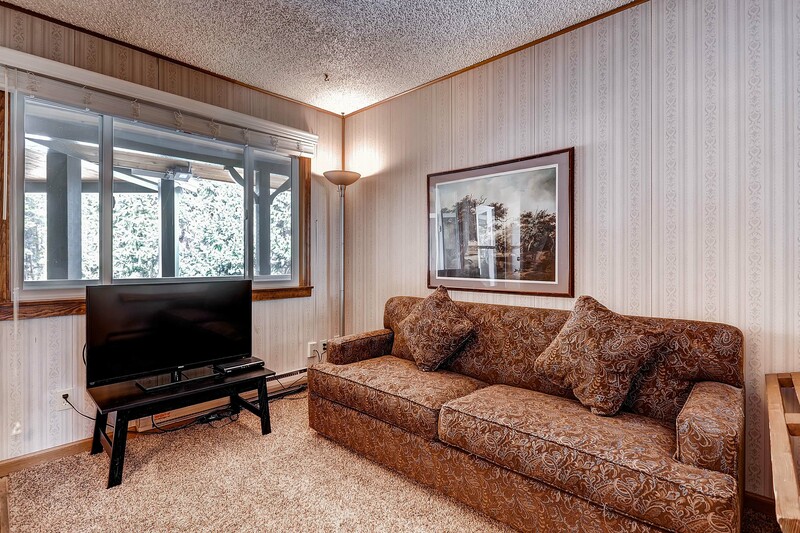 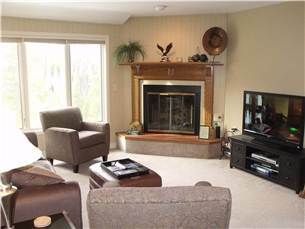 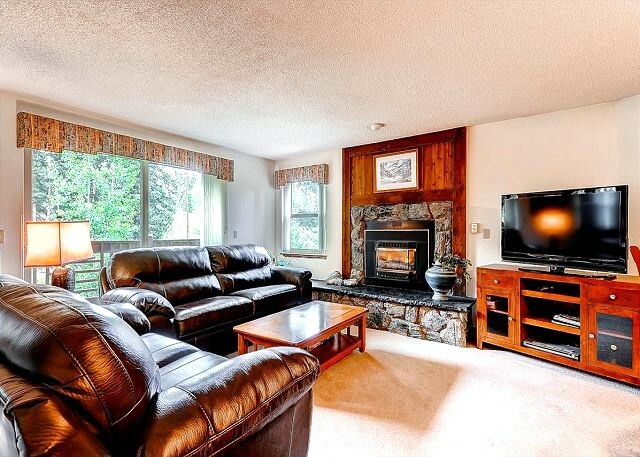 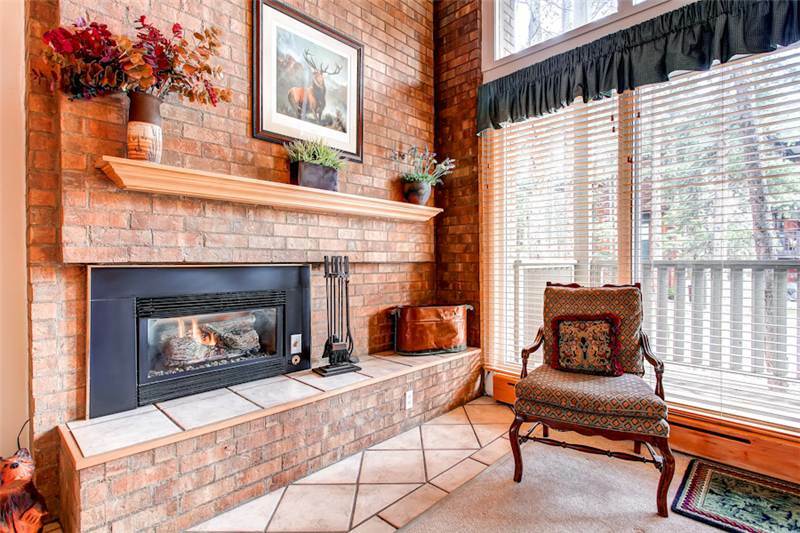 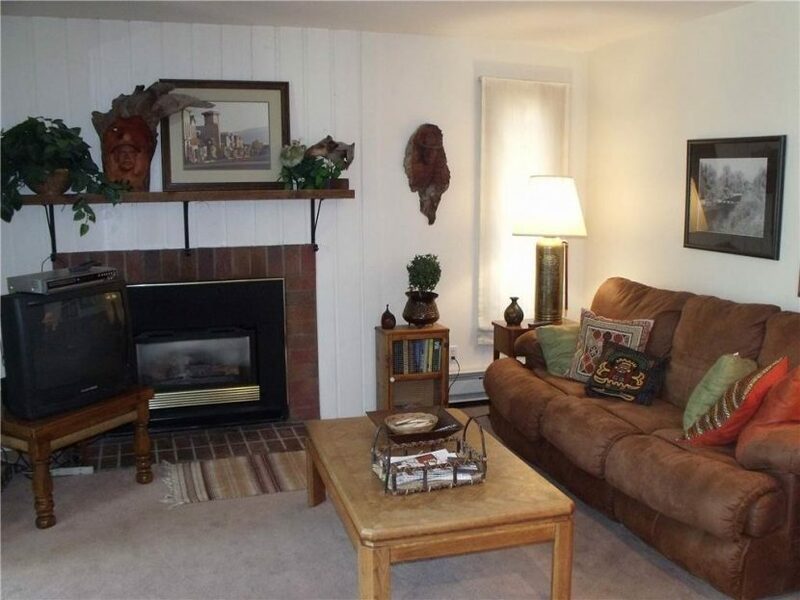 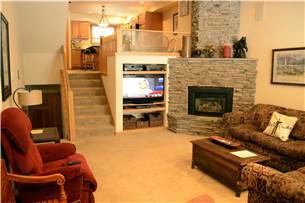 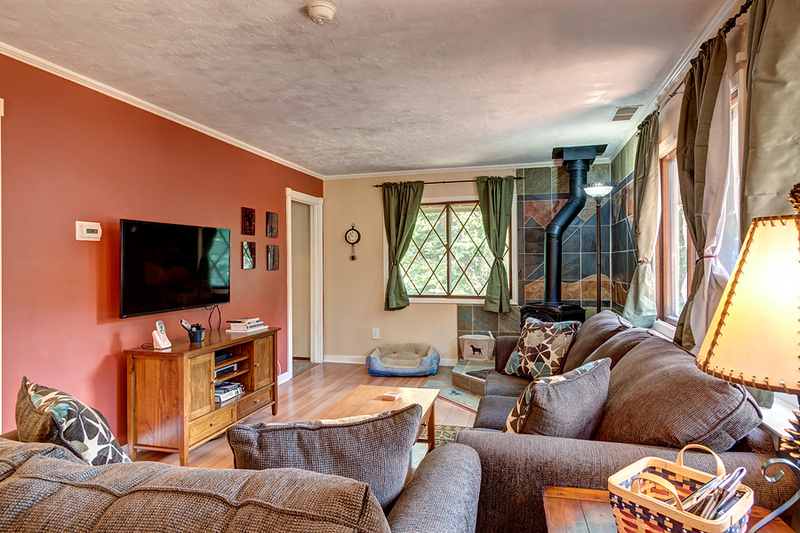 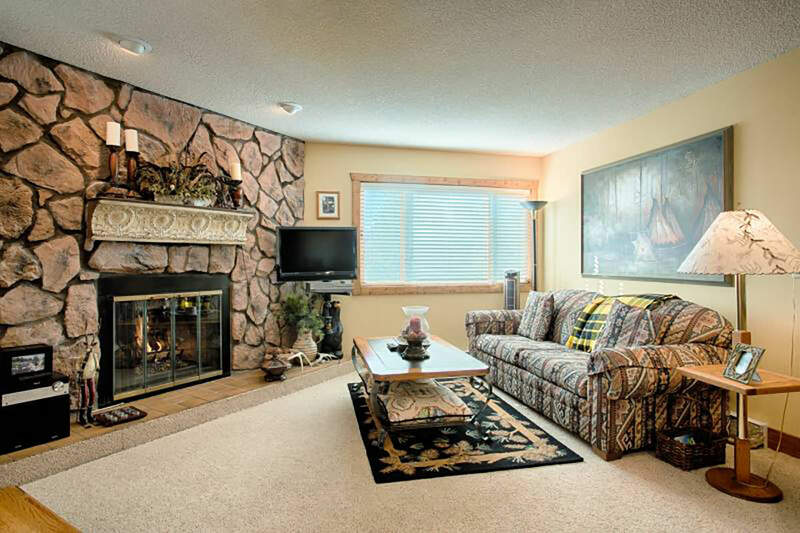 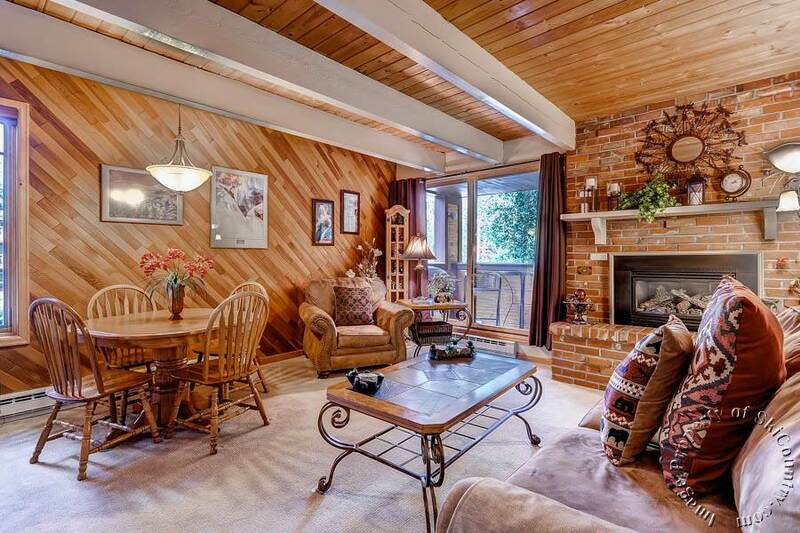 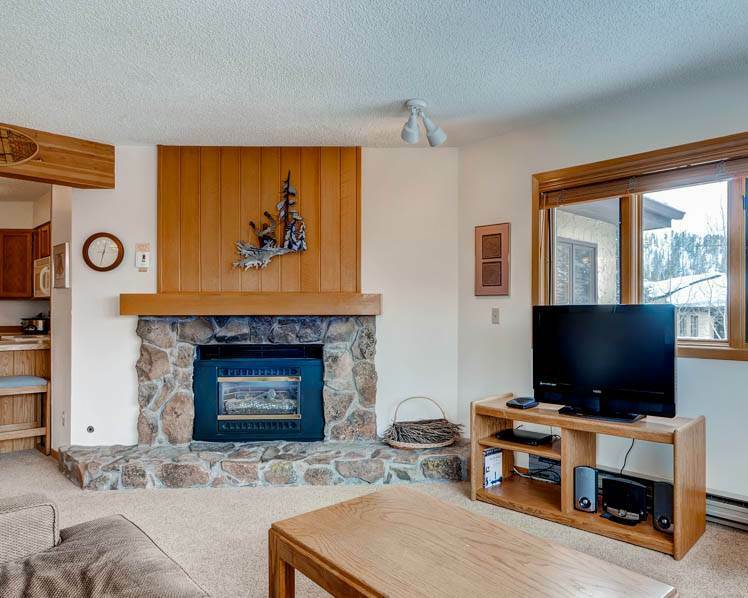 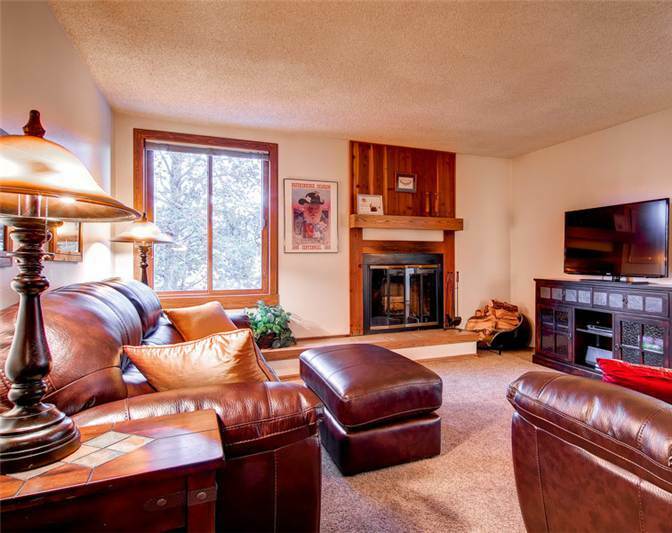 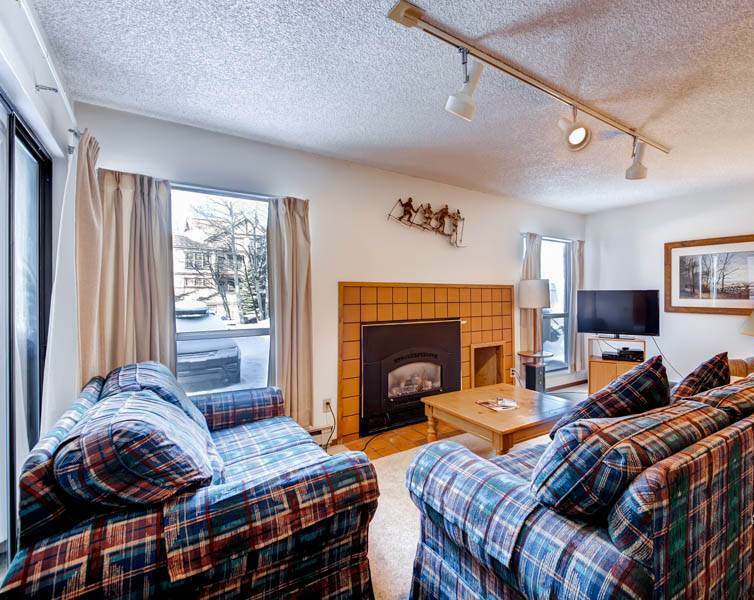 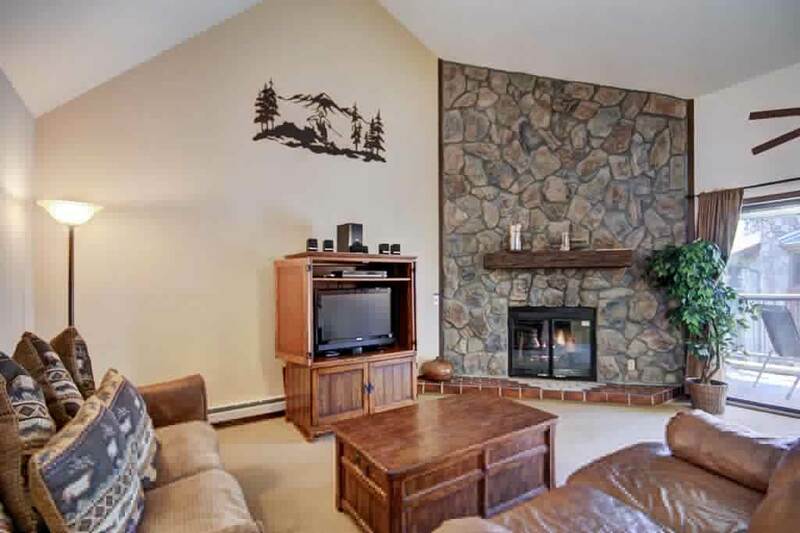 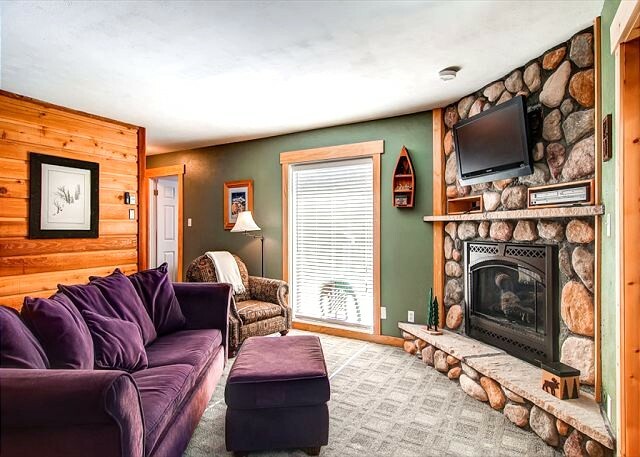 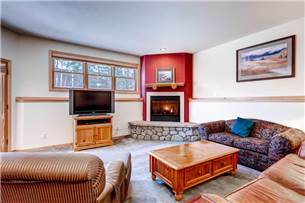 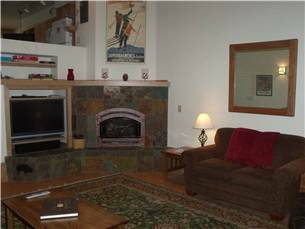 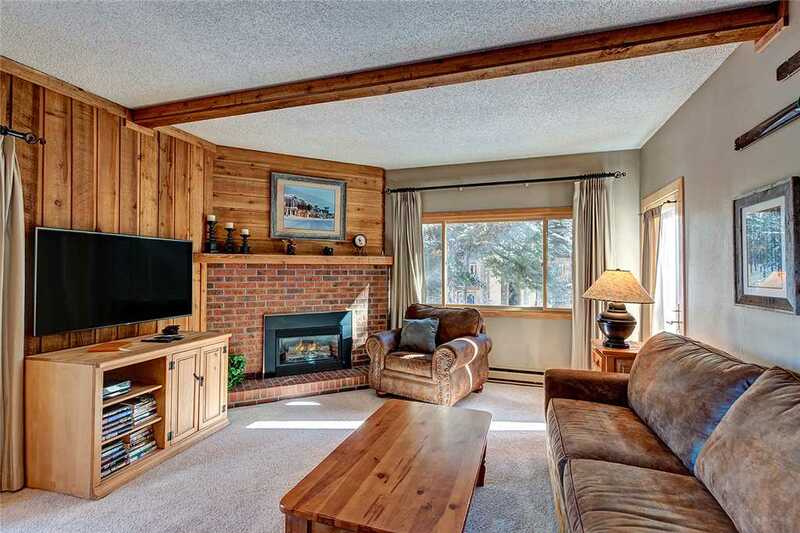 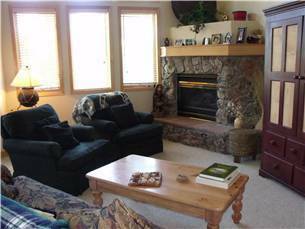 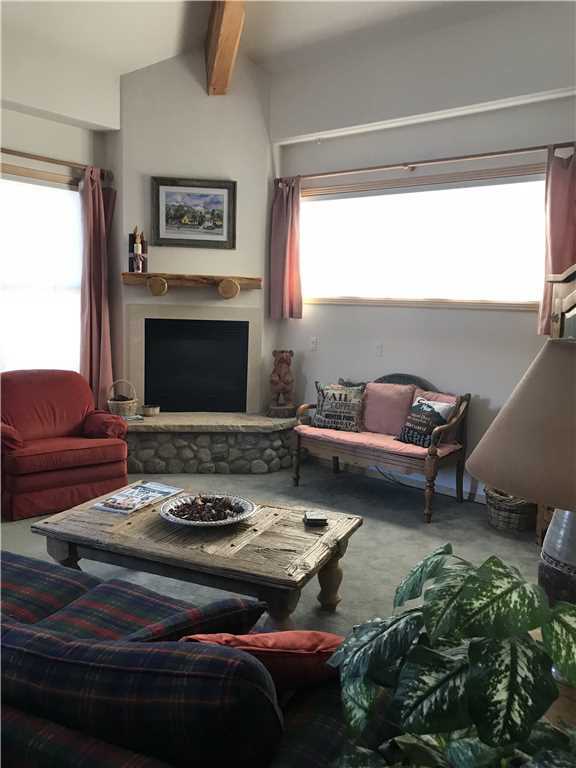 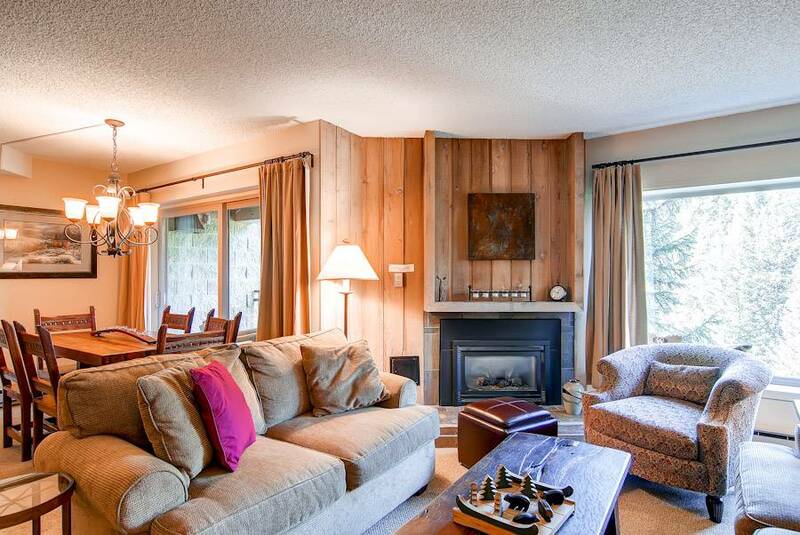 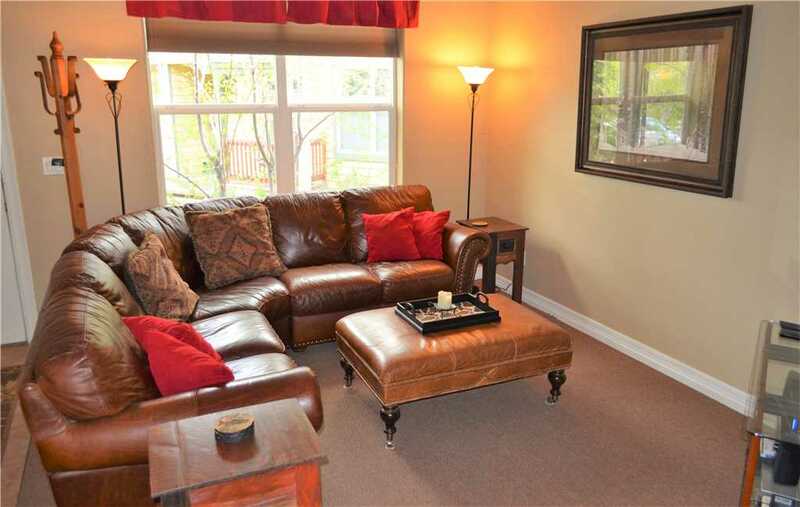 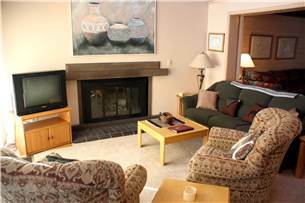 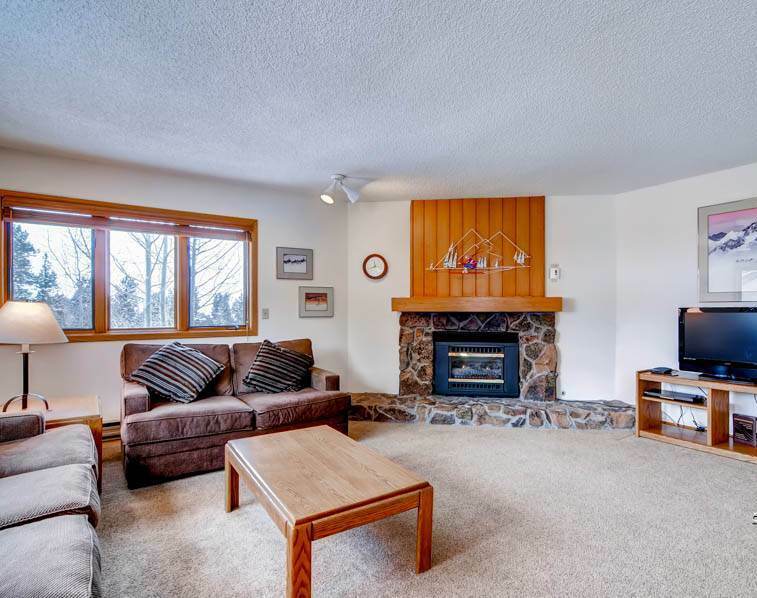 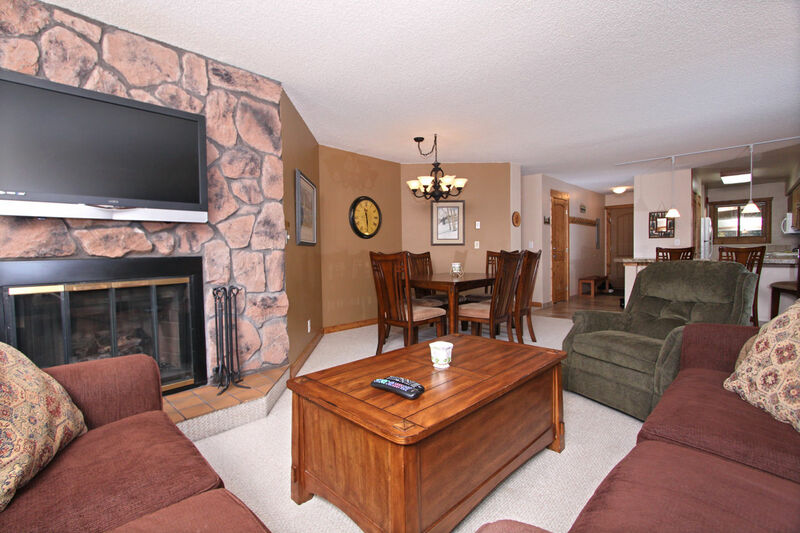 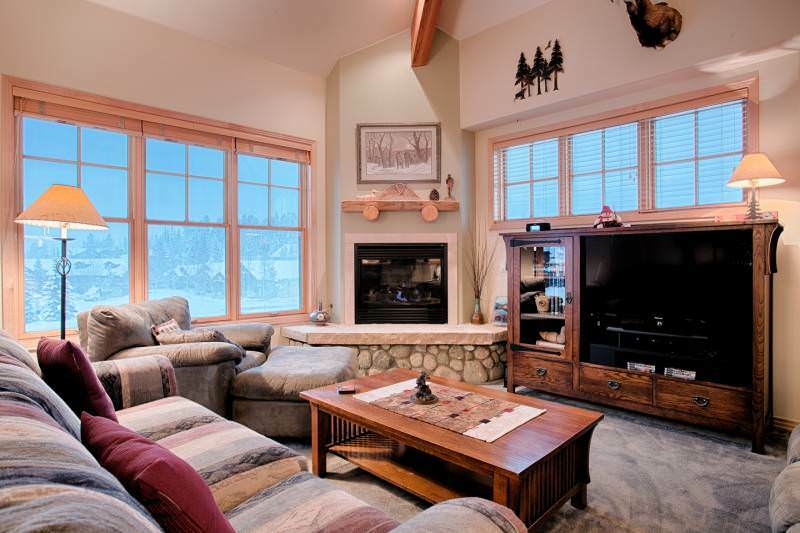 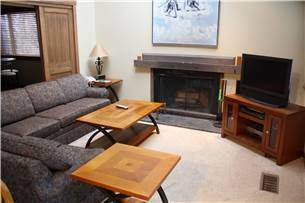 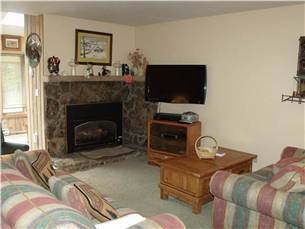 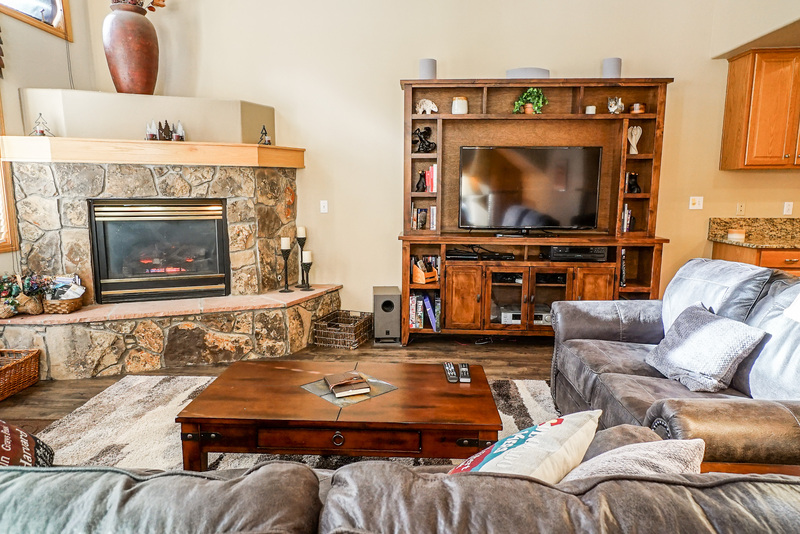 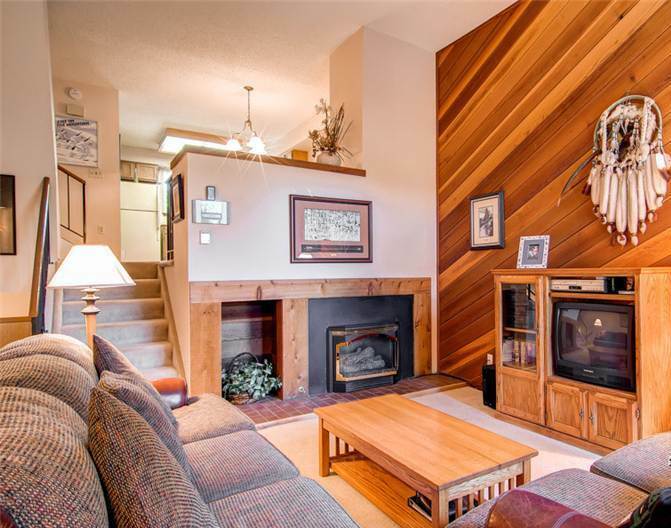 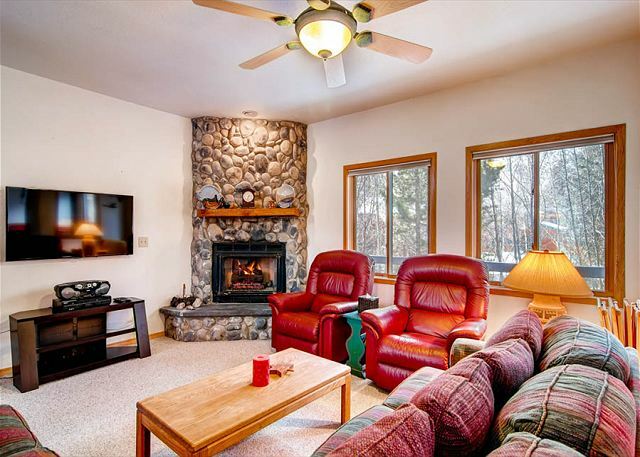 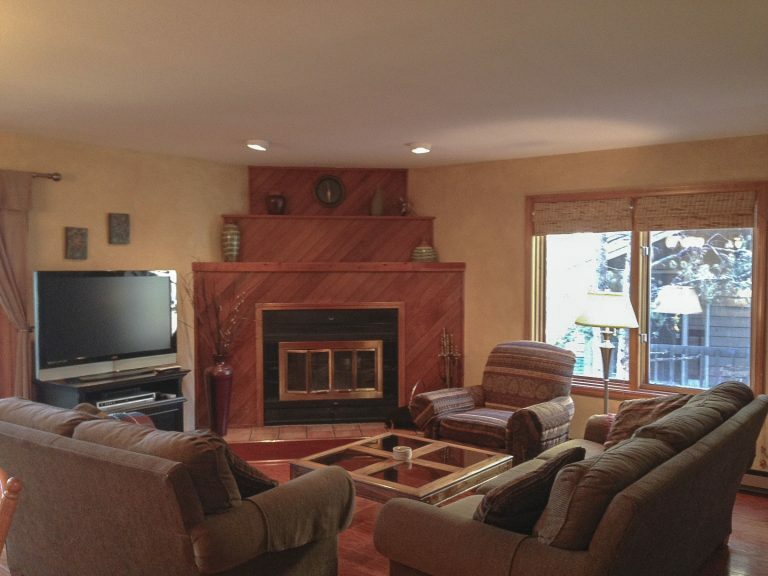 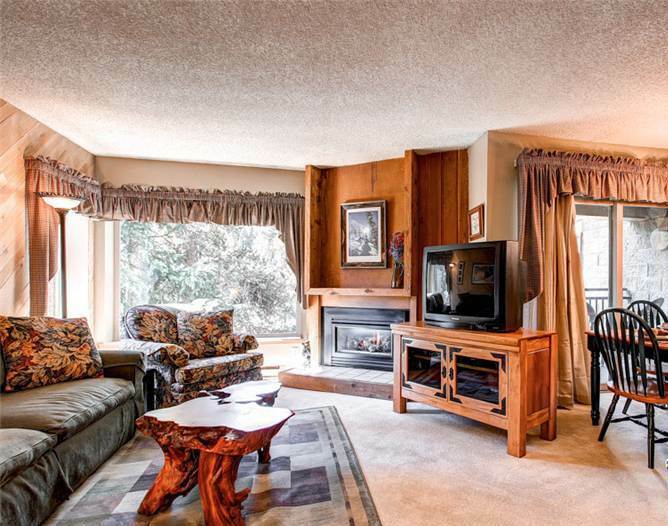 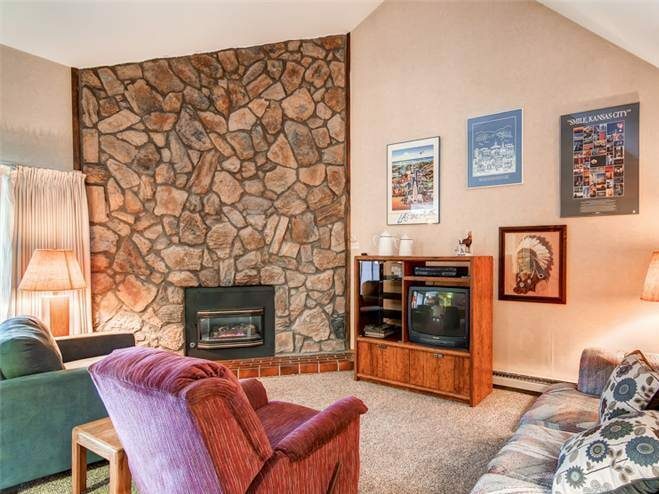 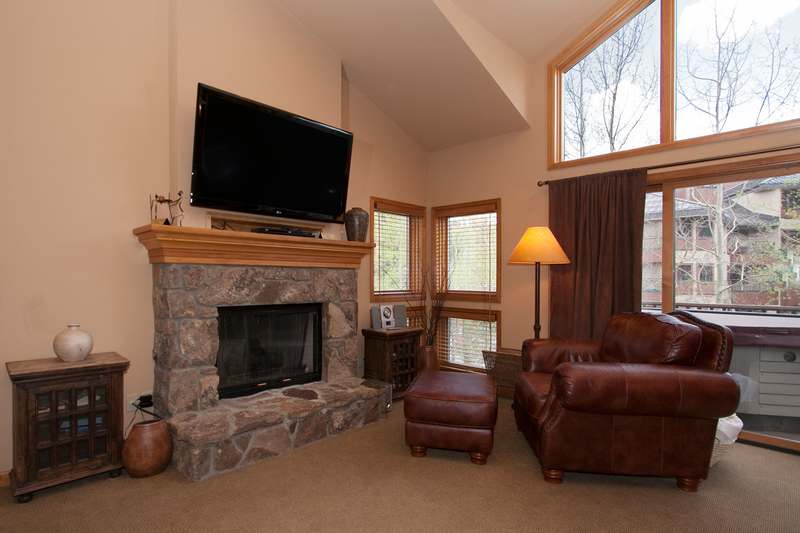 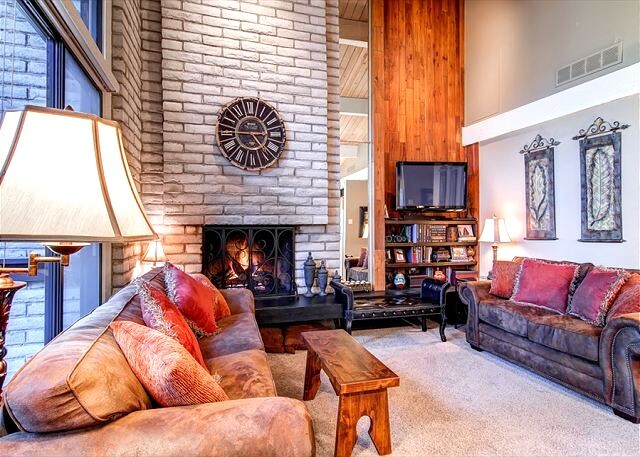 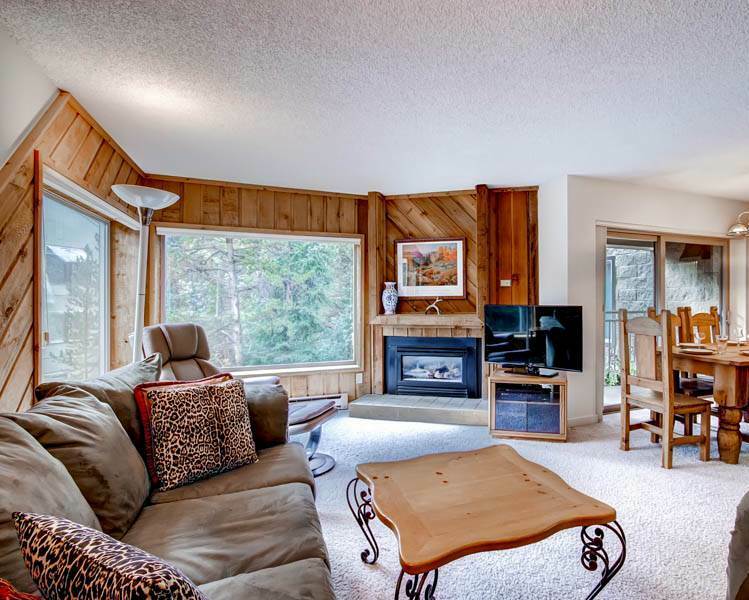 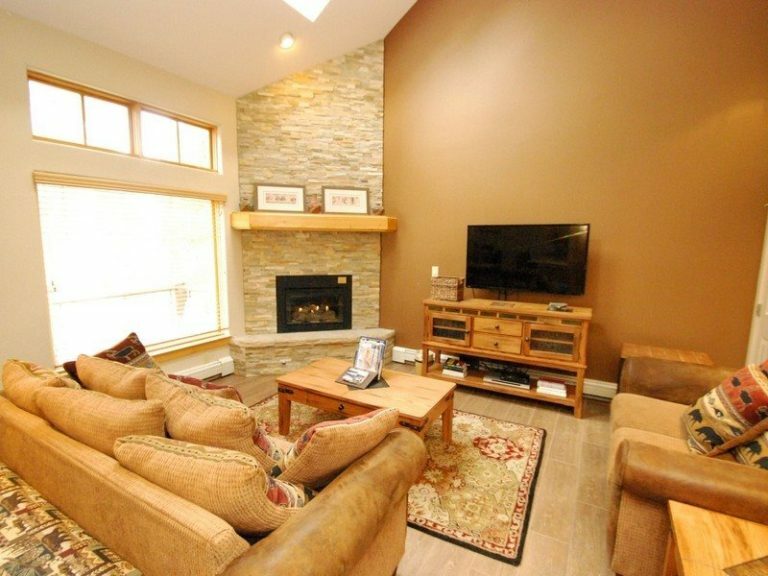 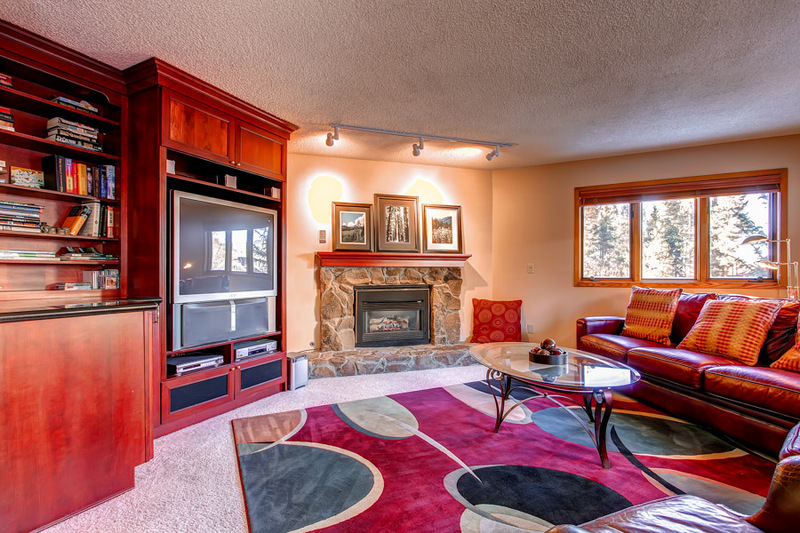 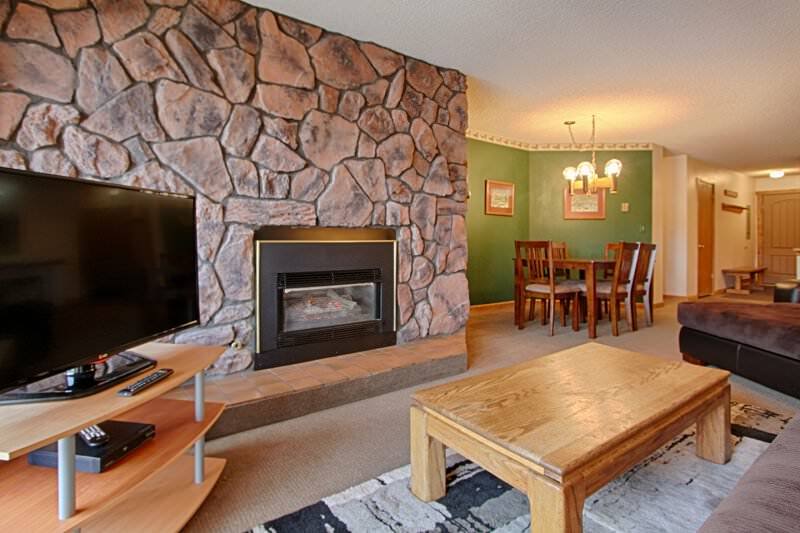 The living room has a gas fireplace, TV and DVD player. 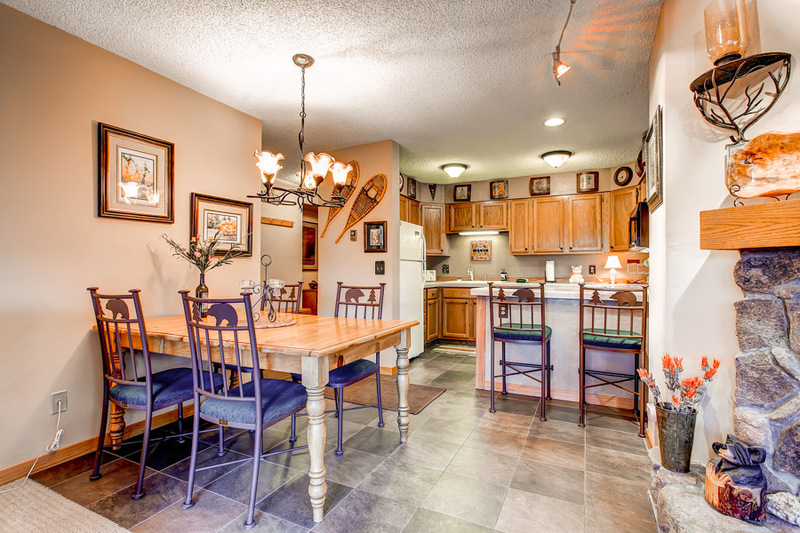 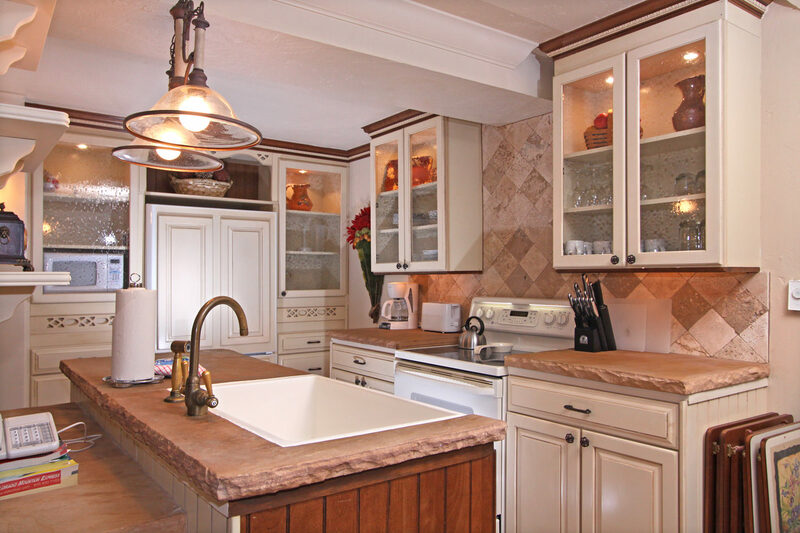 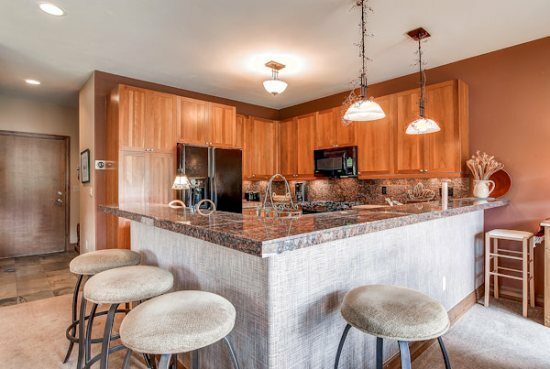 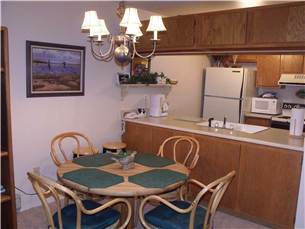 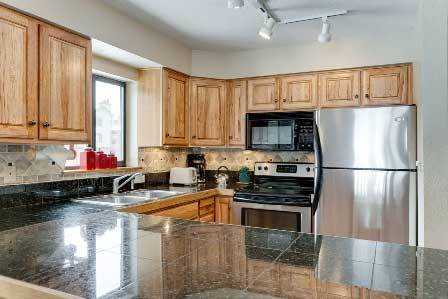 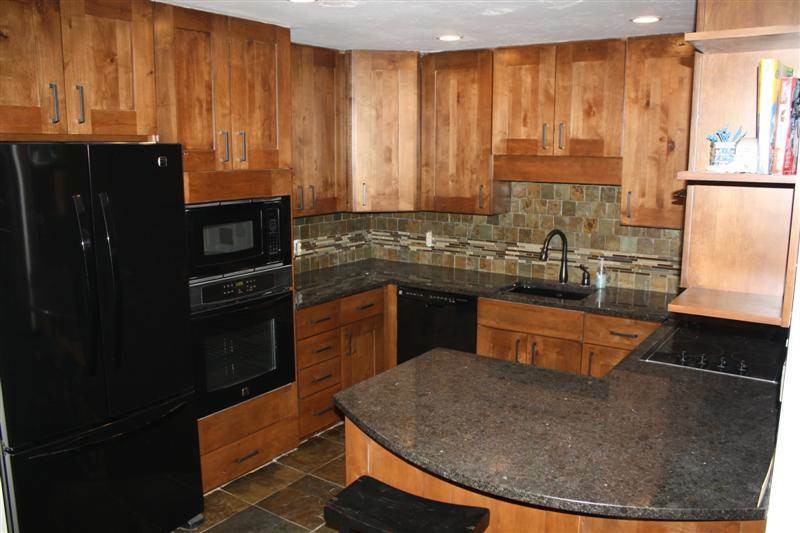 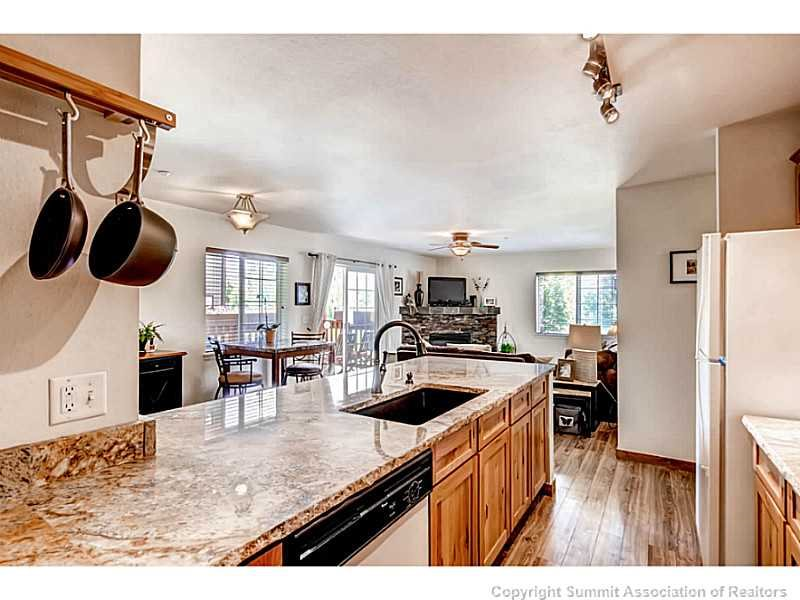 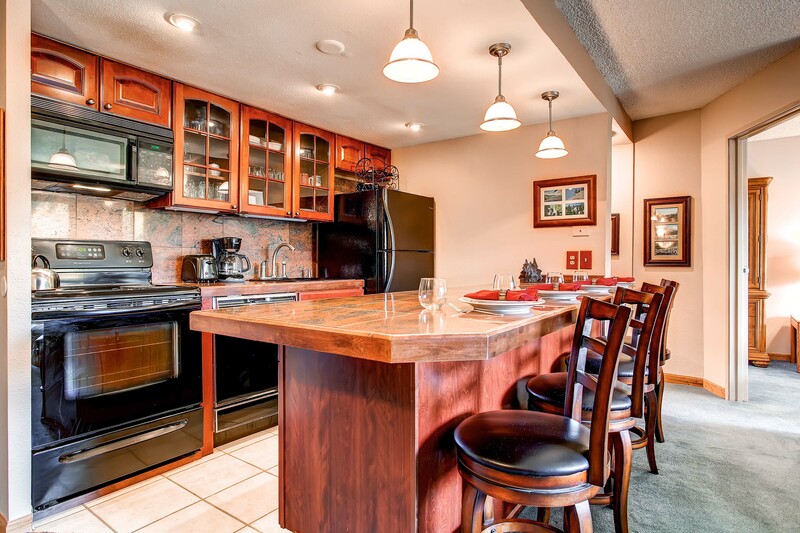 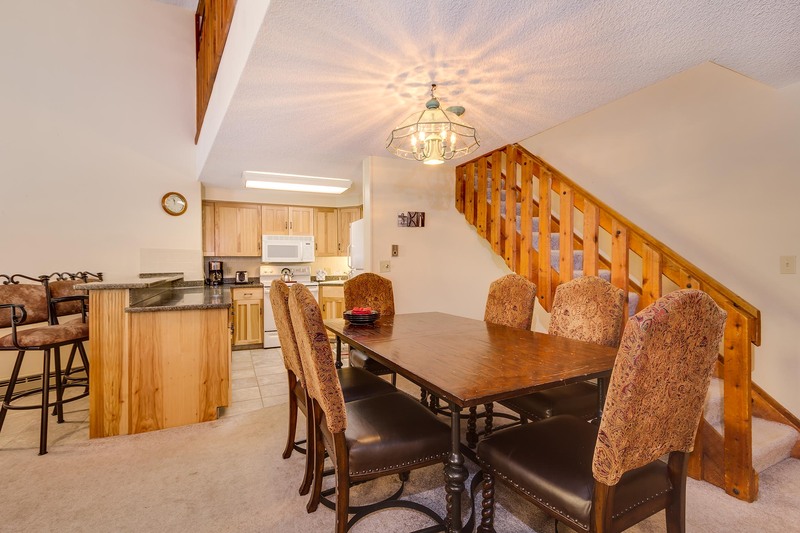 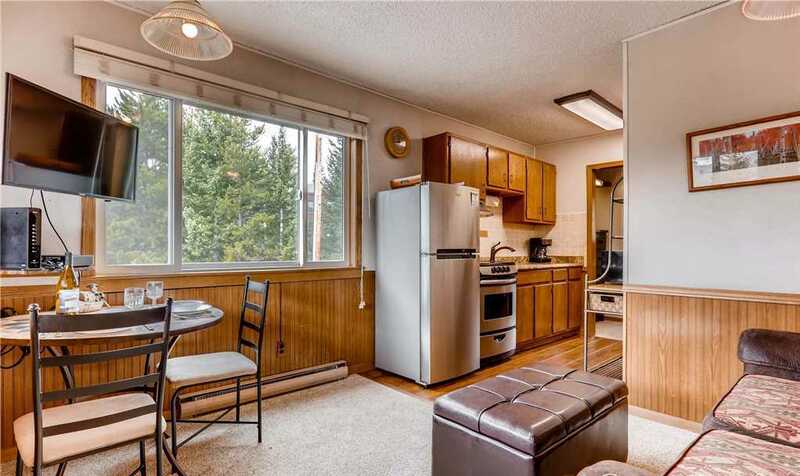 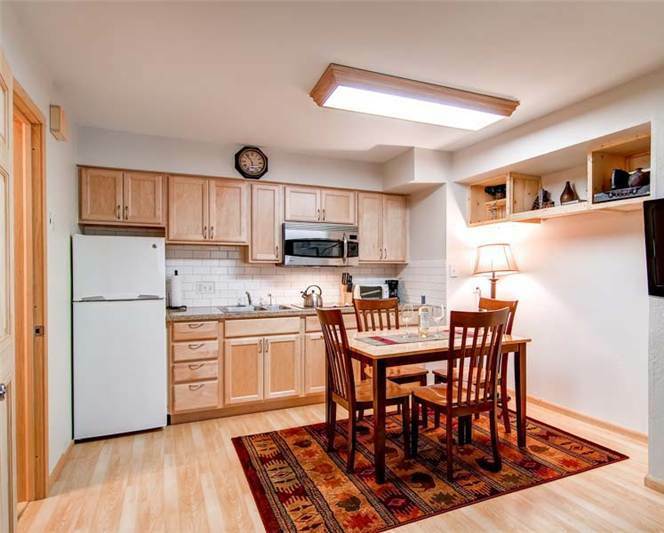 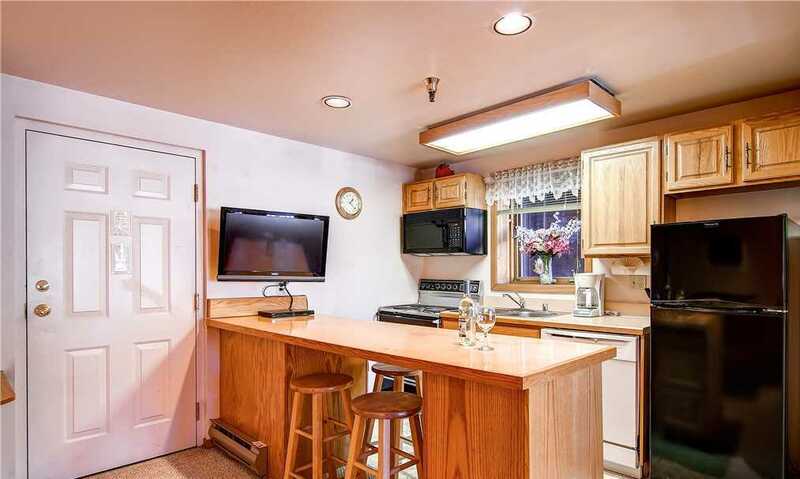 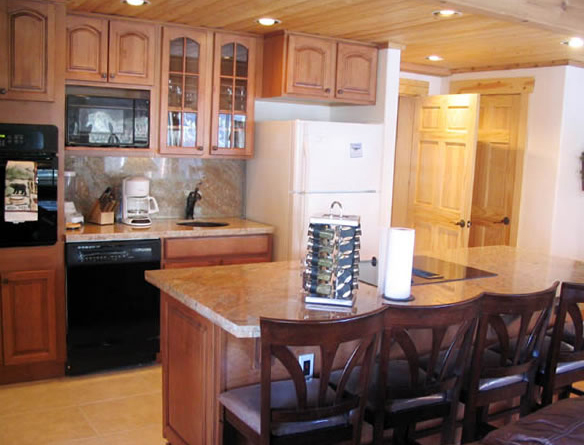 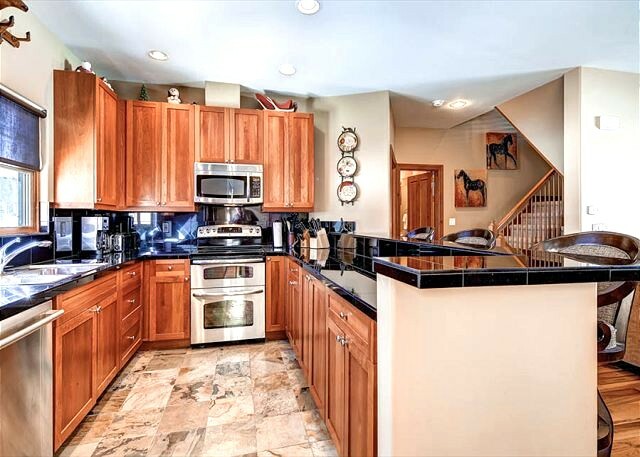 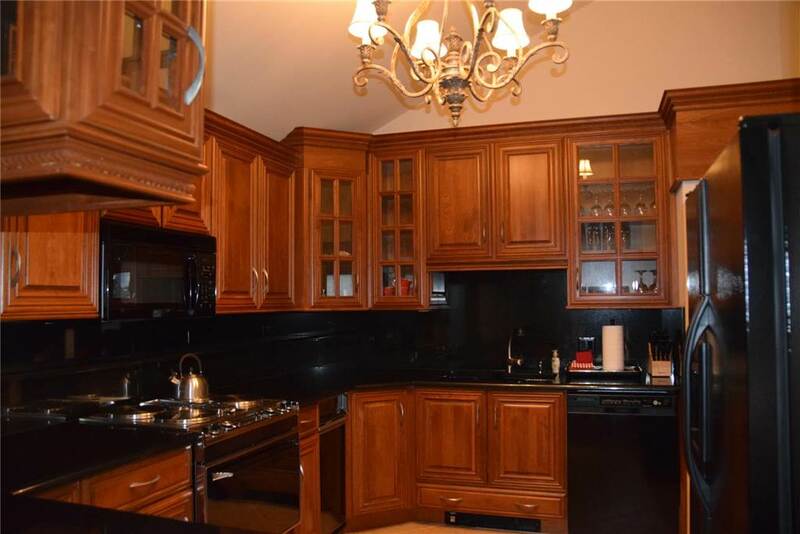 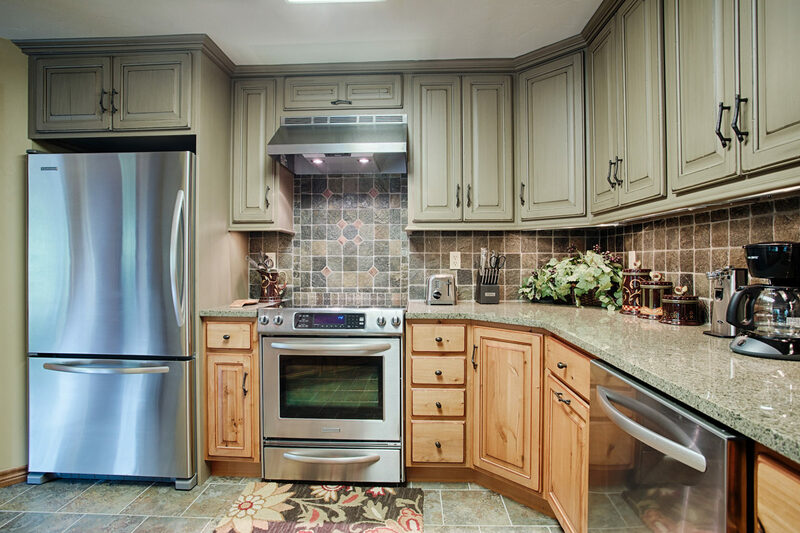 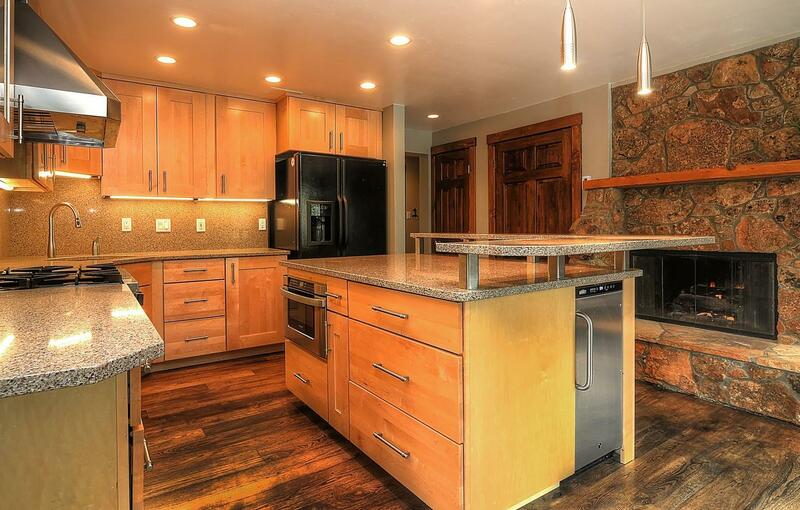 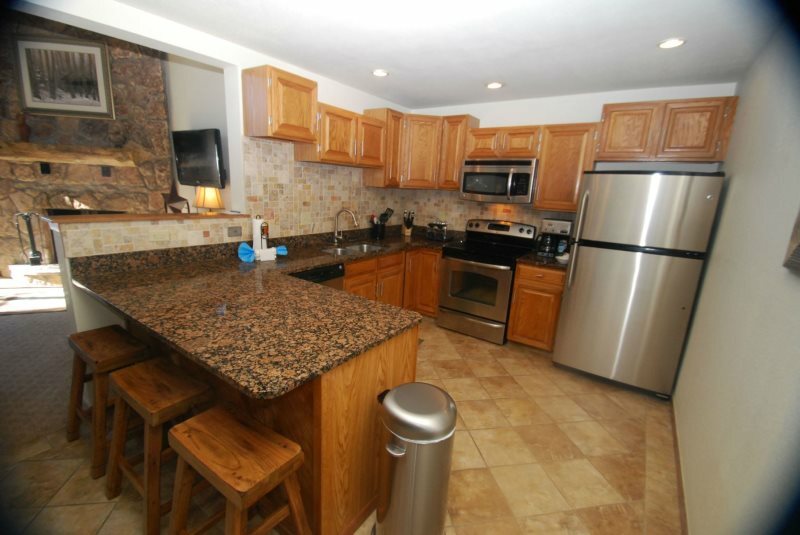 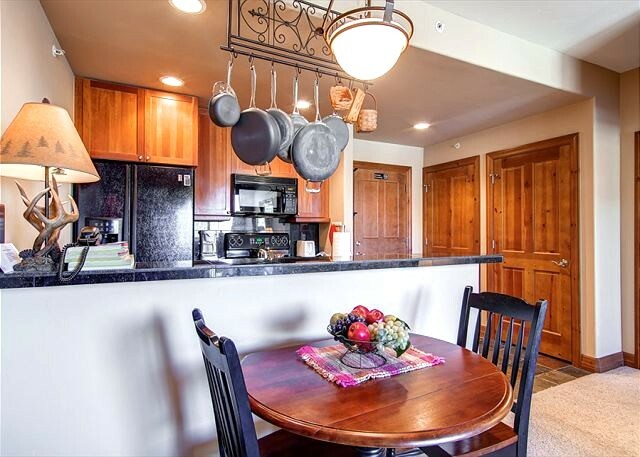 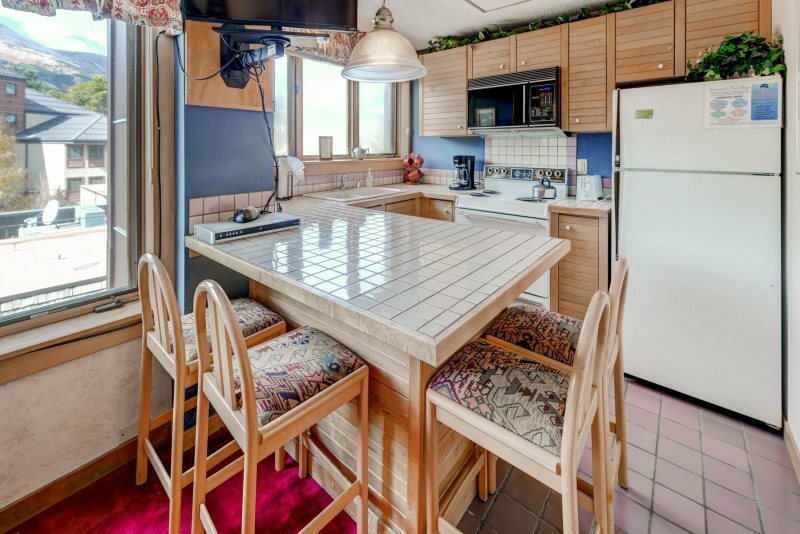 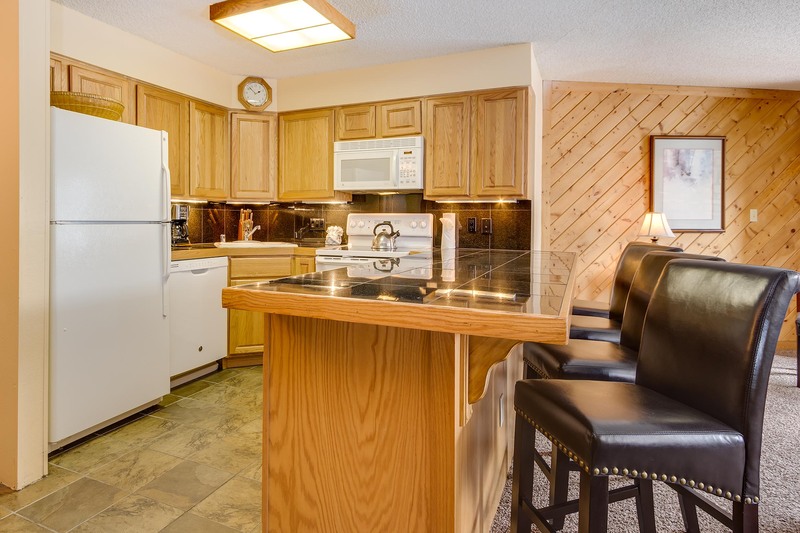 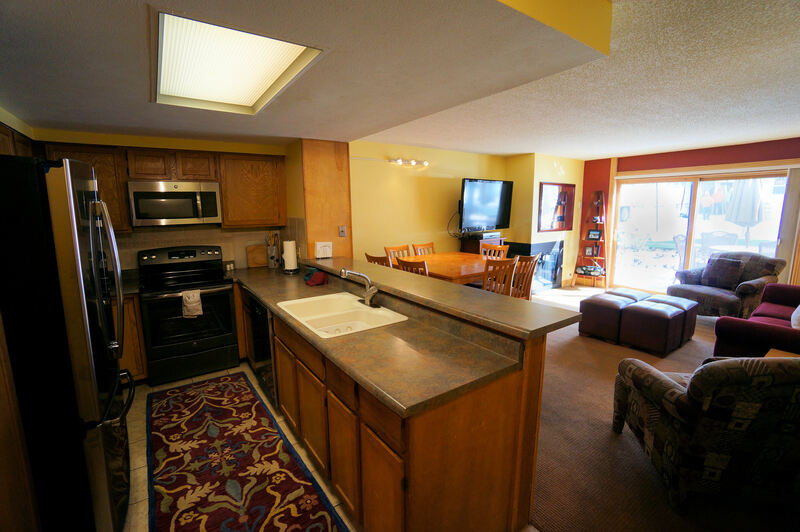 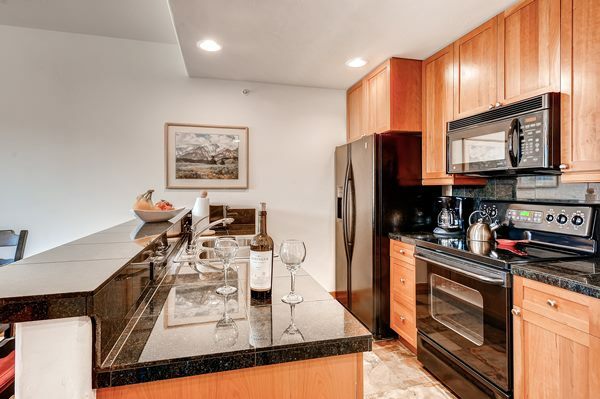 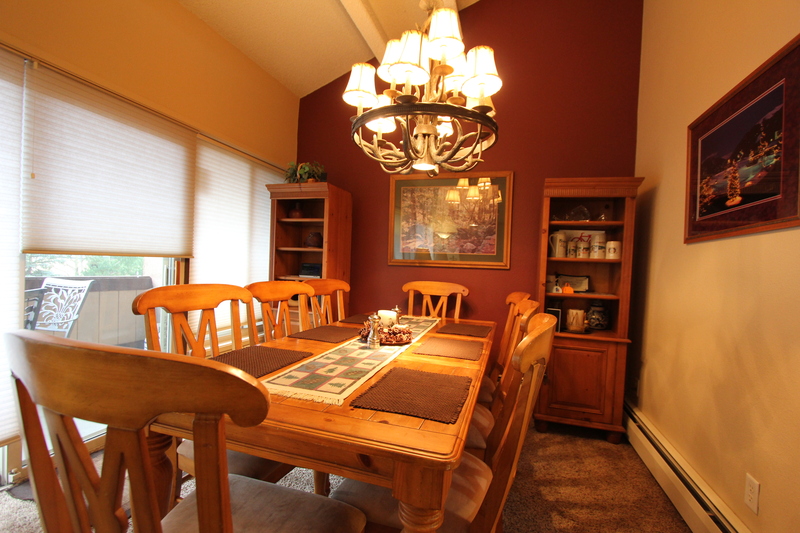 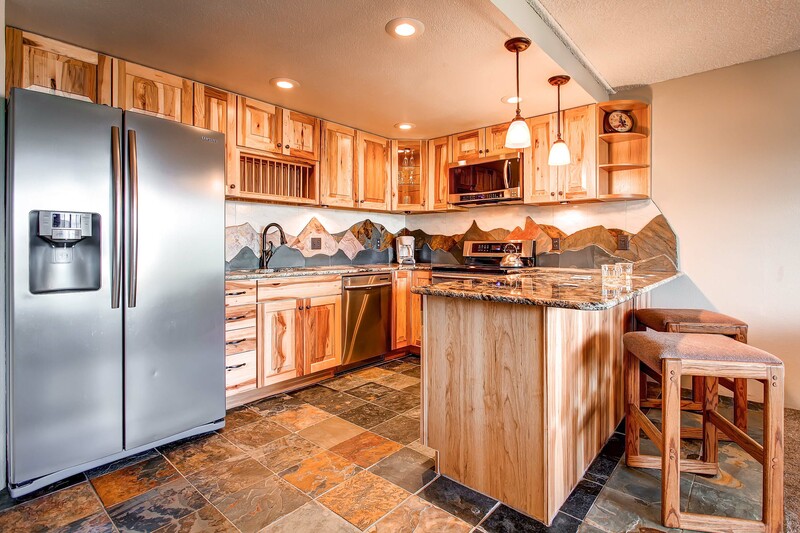 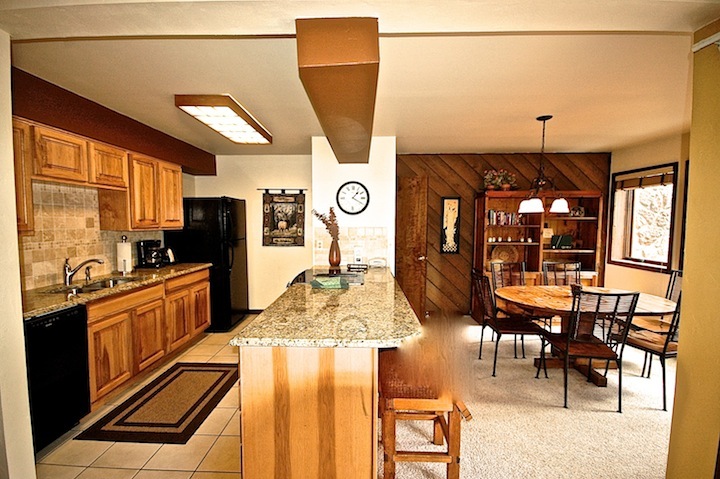 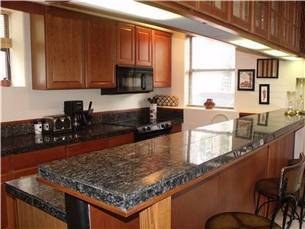 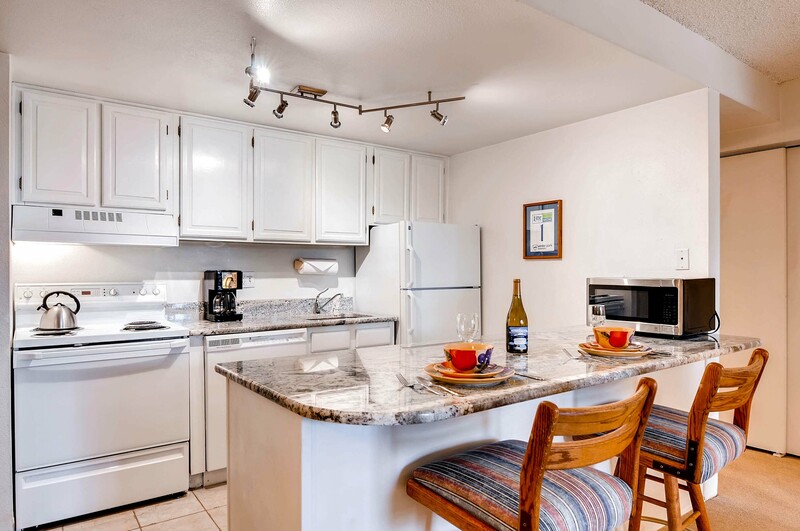 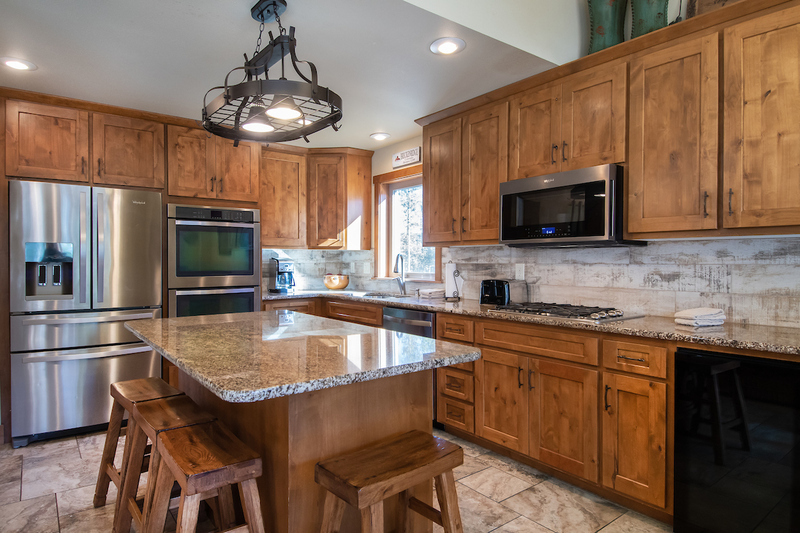 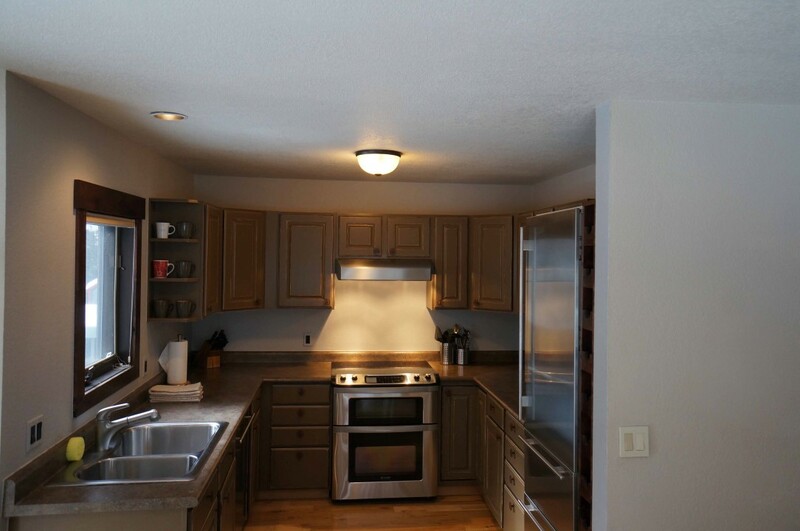 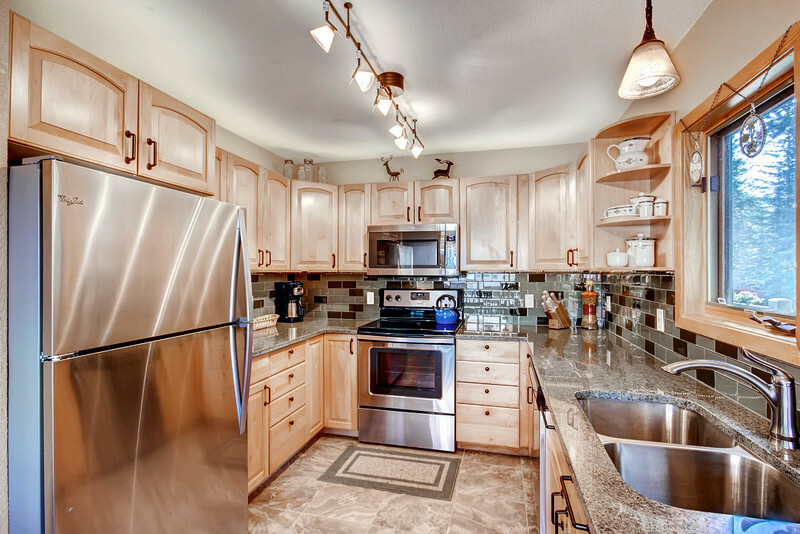 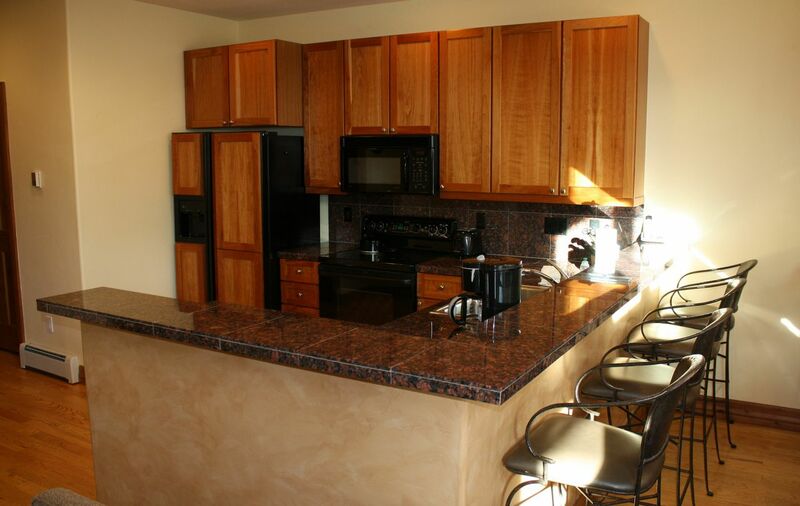 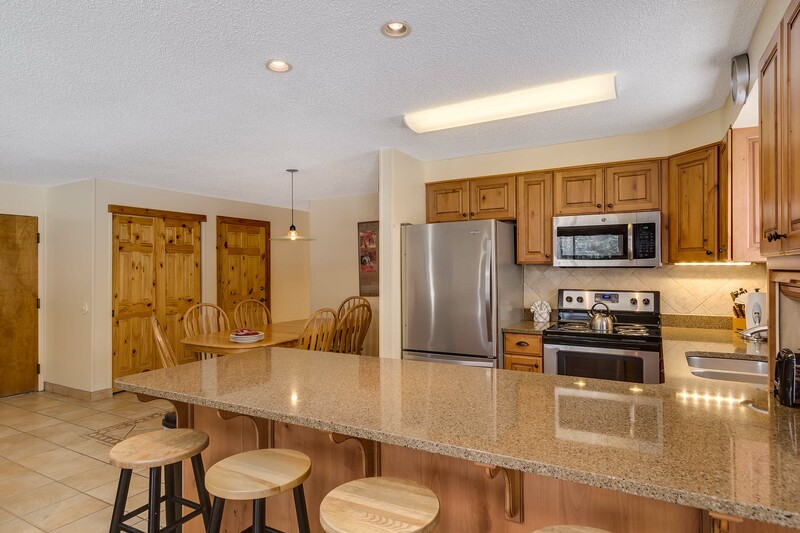 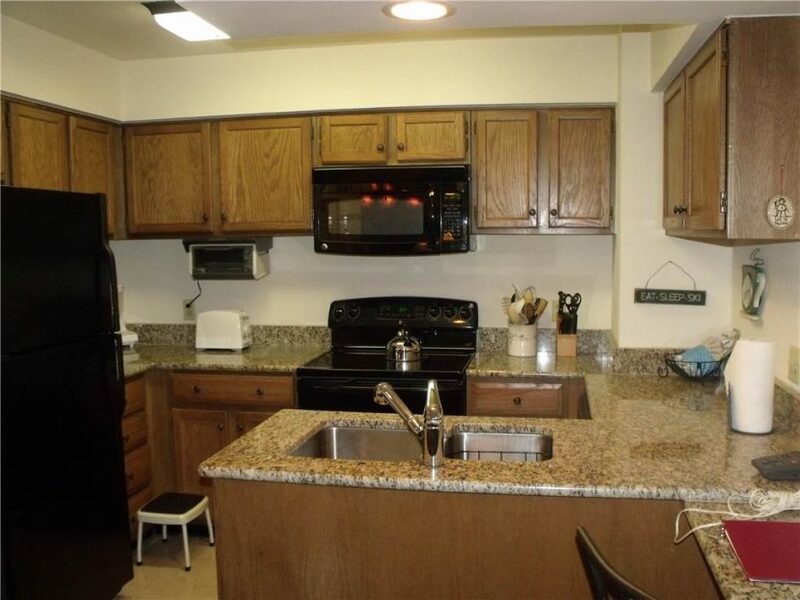 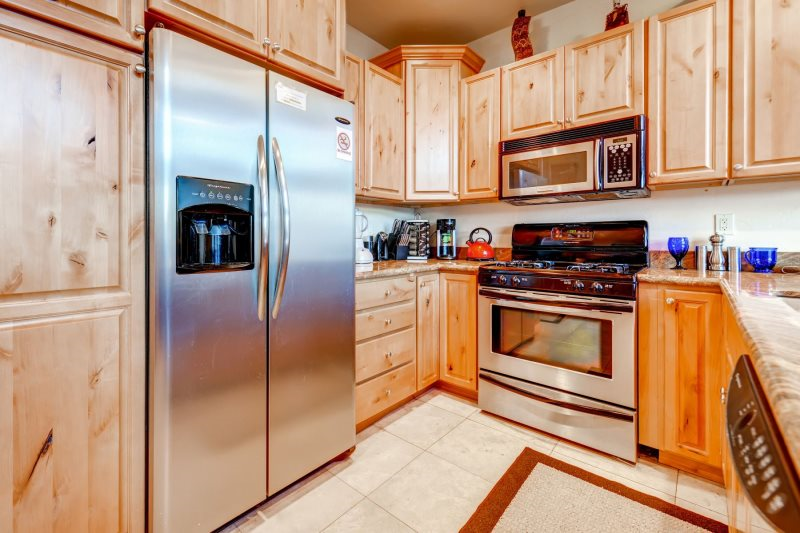 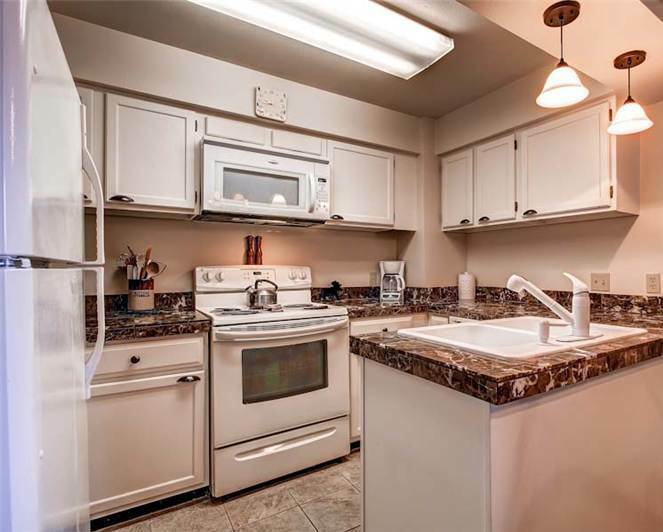 Enjoy a fully equipped kitchen with granite counter tops, dishwasher, microwave, blender, coffee maker, and toaster. 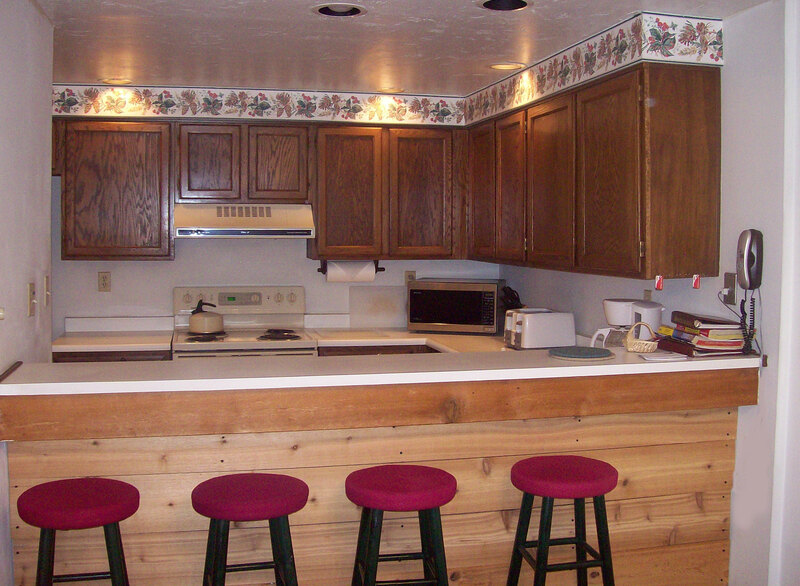 The dining area seats six with additional seating at the bar. 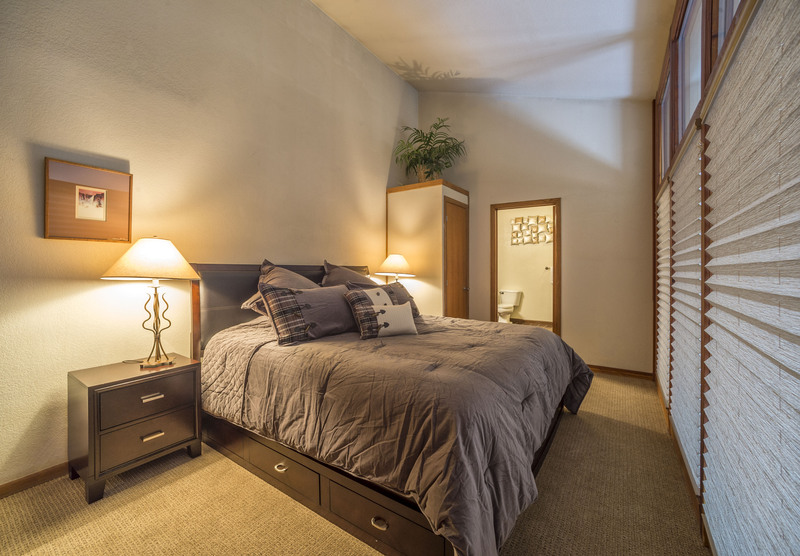 The bottom level has two guest bedrooms with a Jack-n-Jill full bathroom. 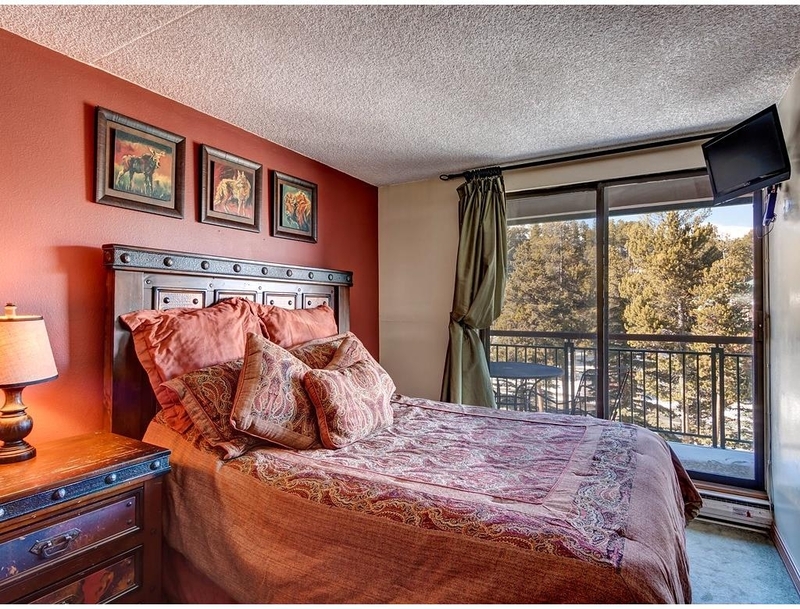 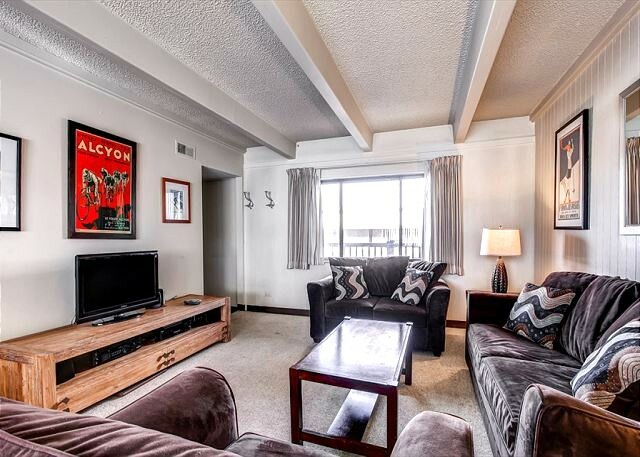 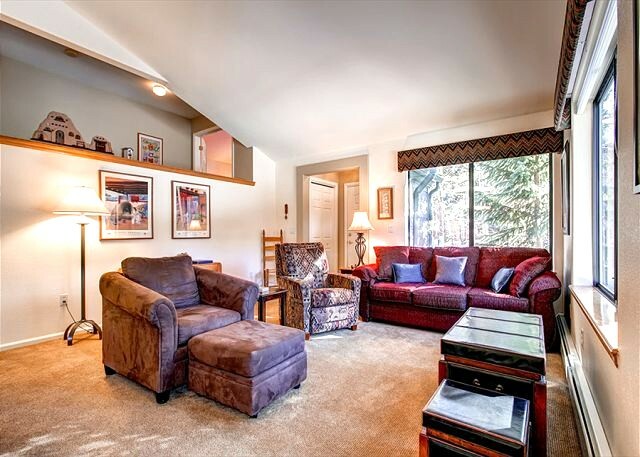 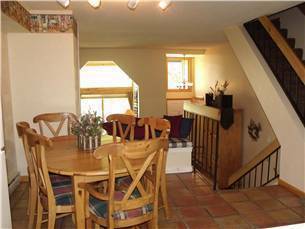 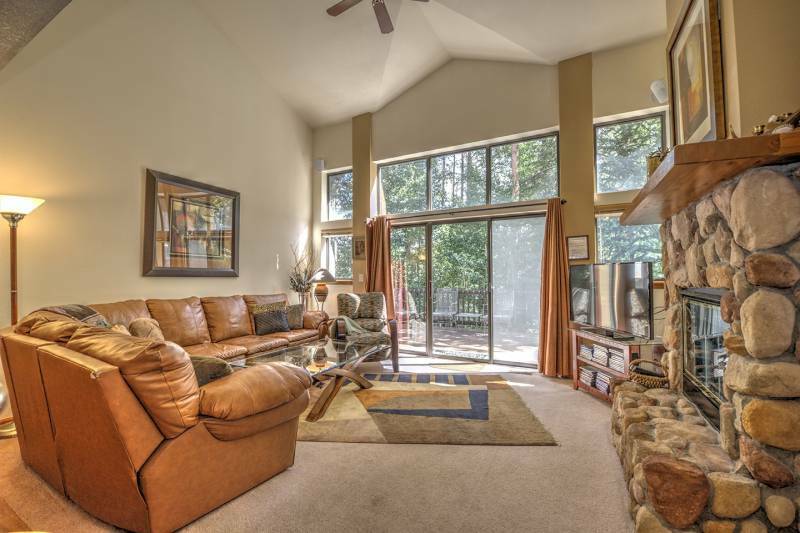 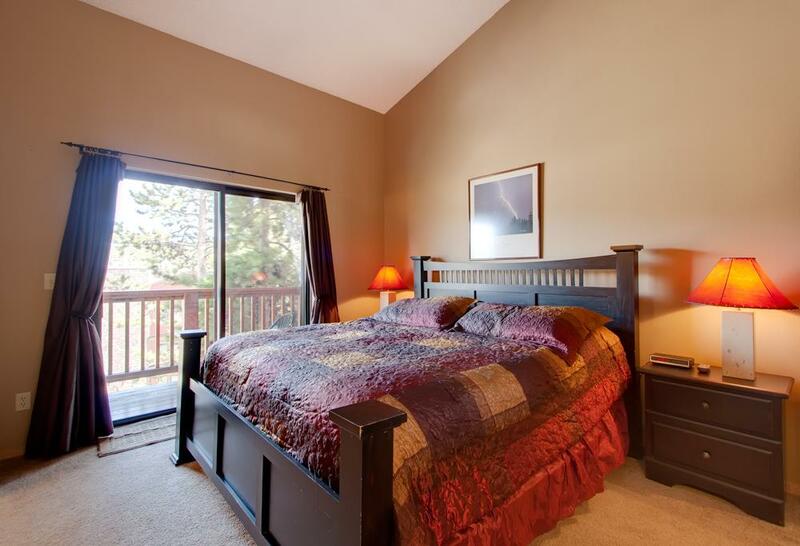 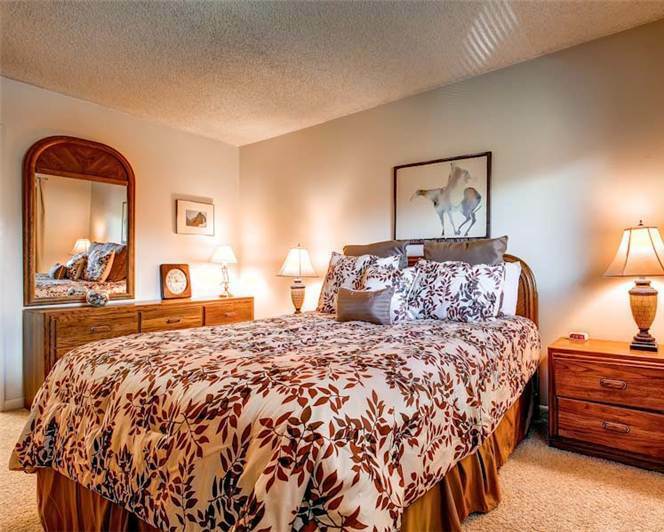 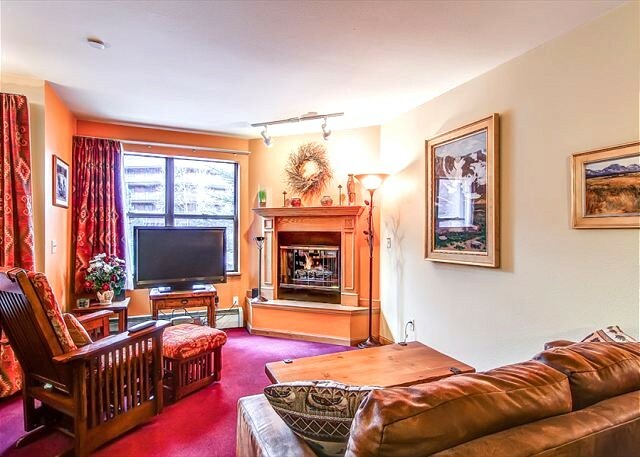 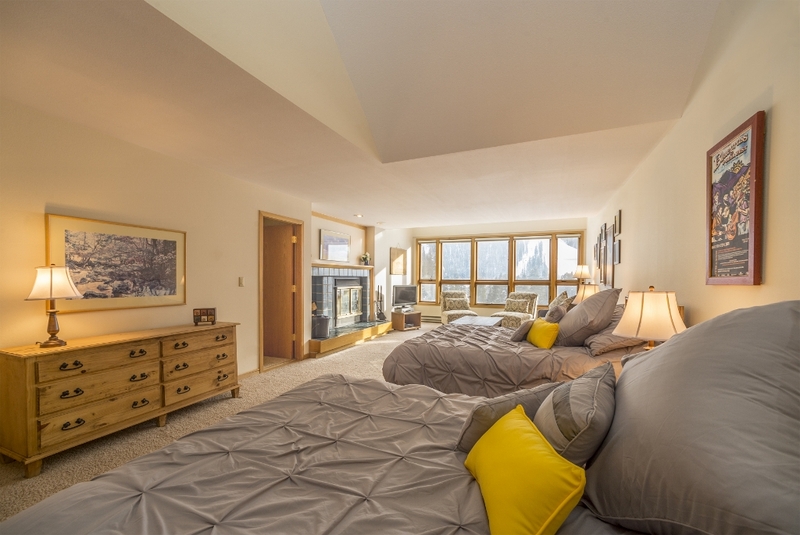 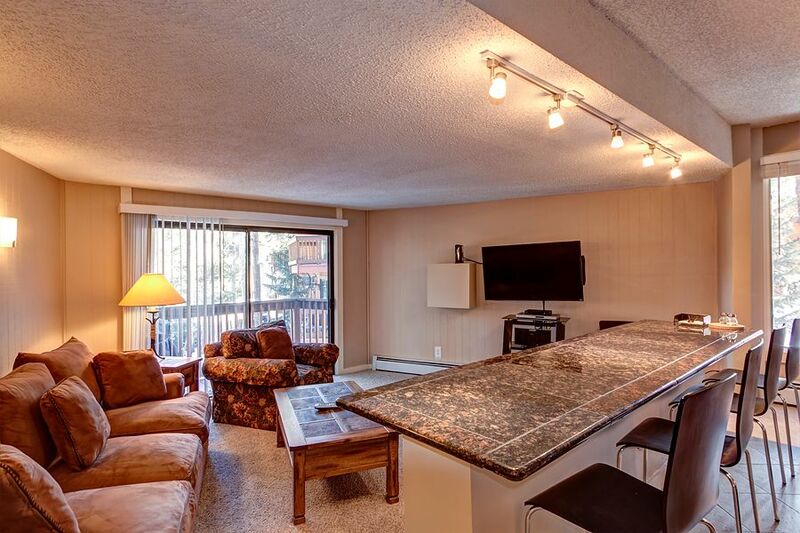 The mastersuite is located on the top floor of this townhome with great views. 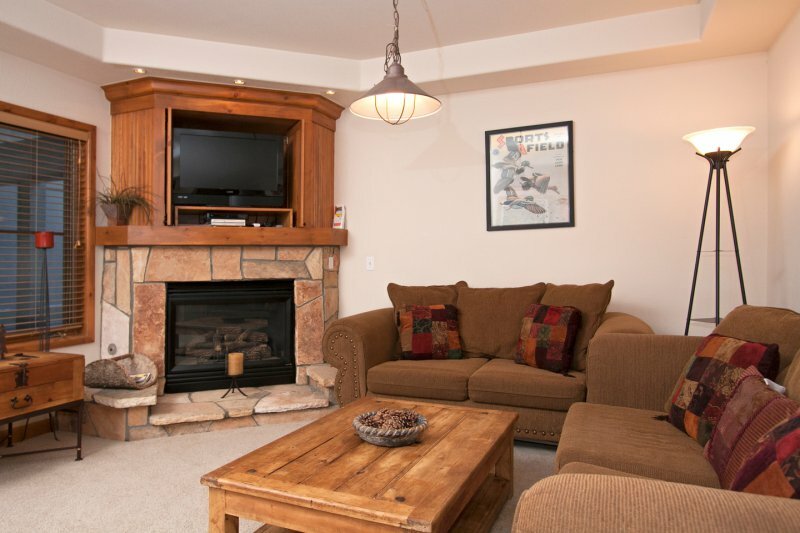 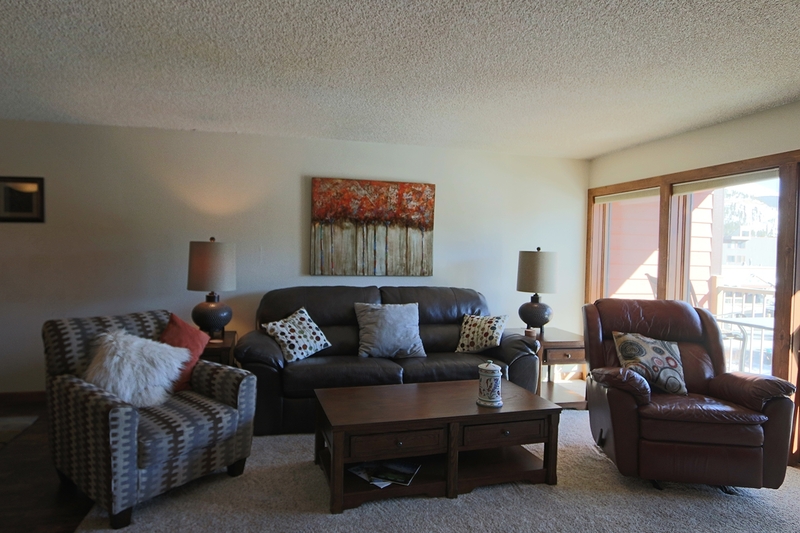 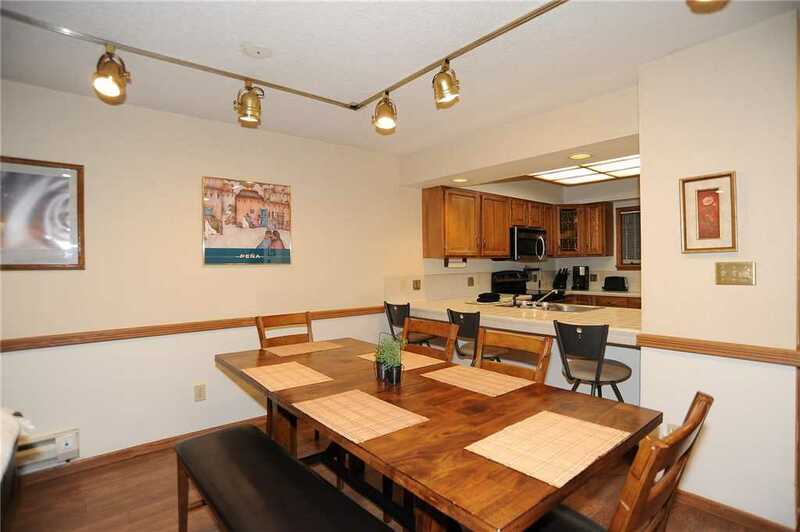 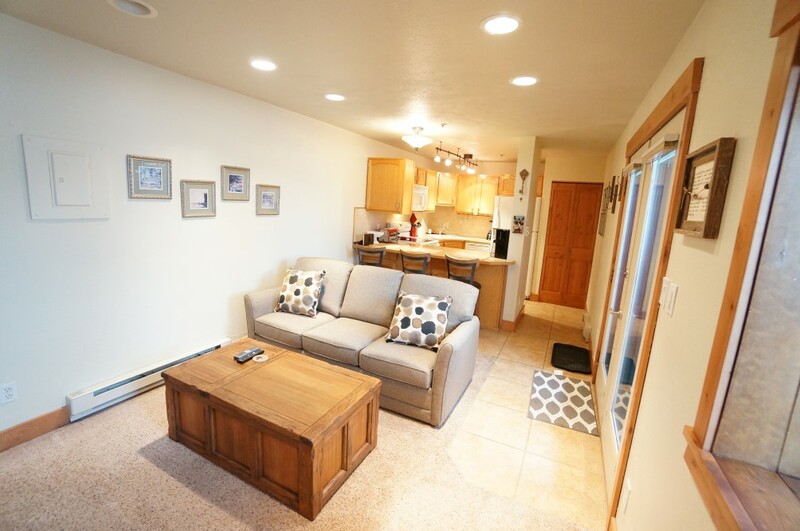 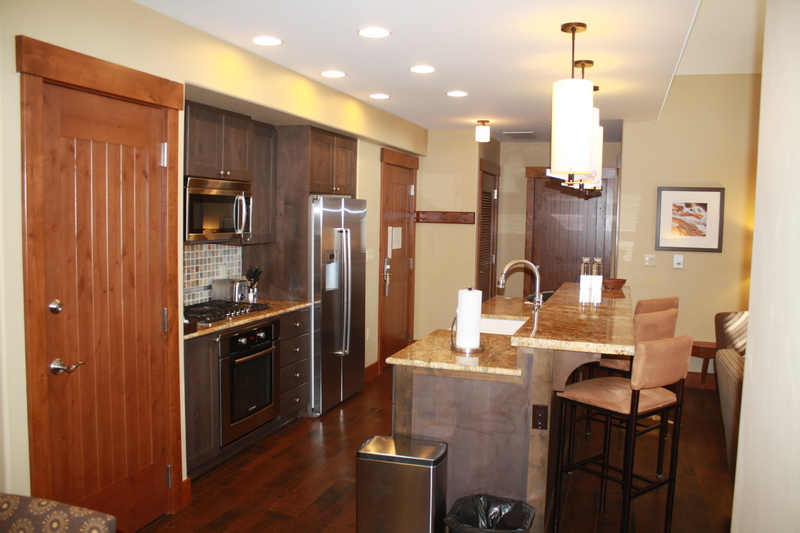 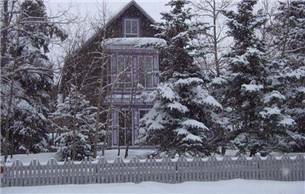 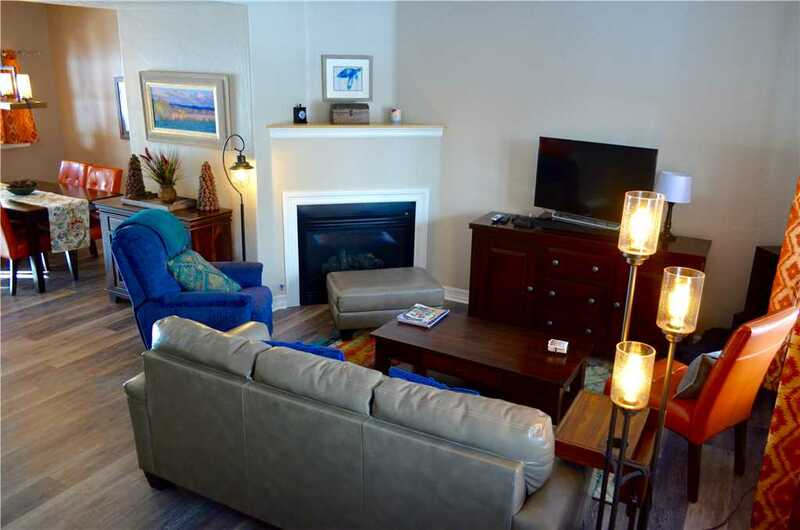 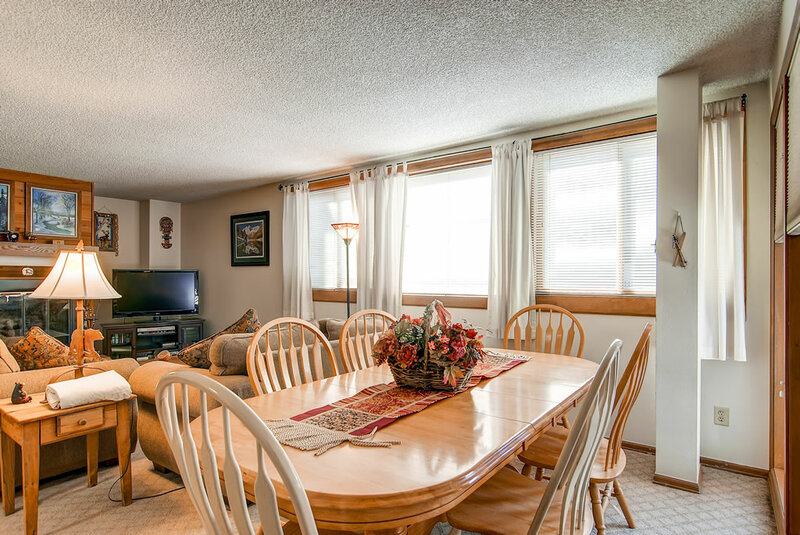 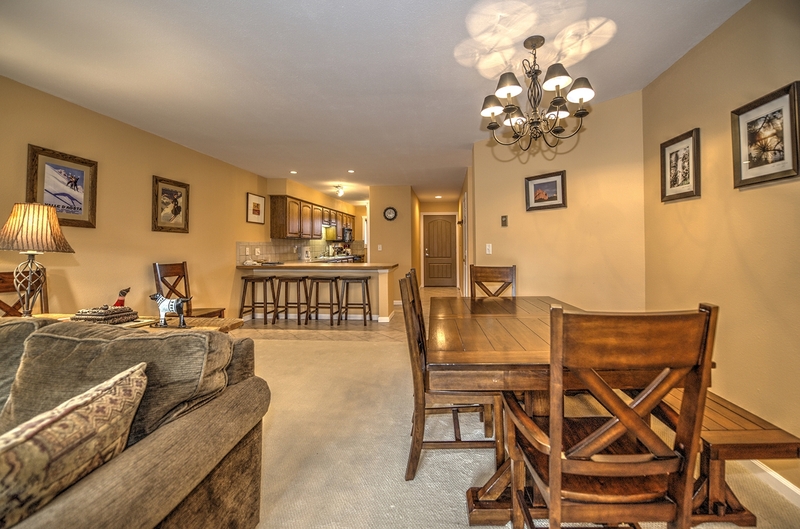 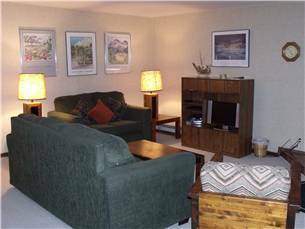 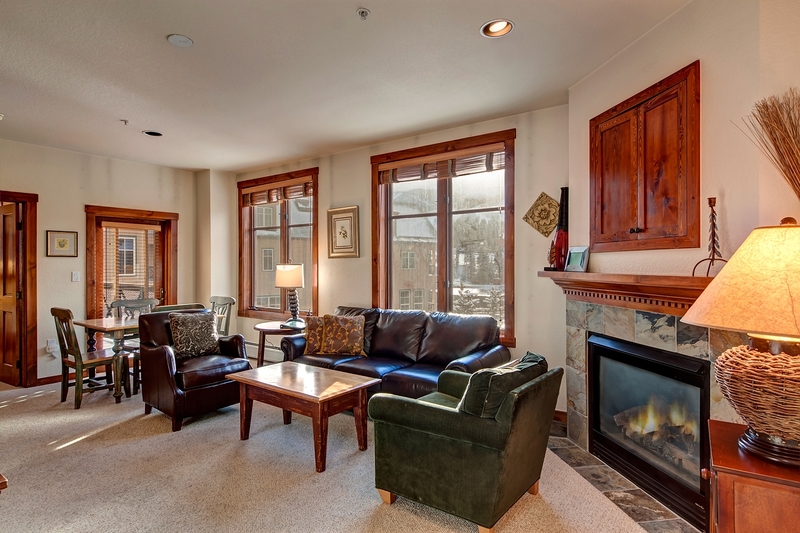 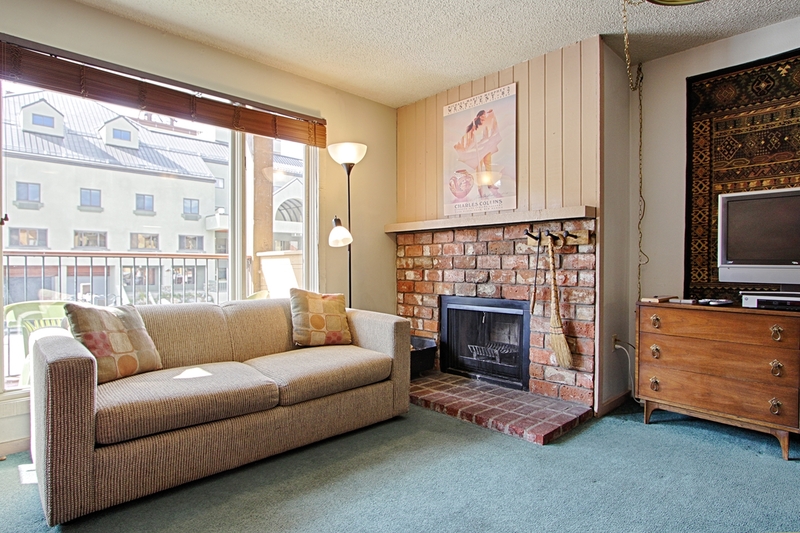 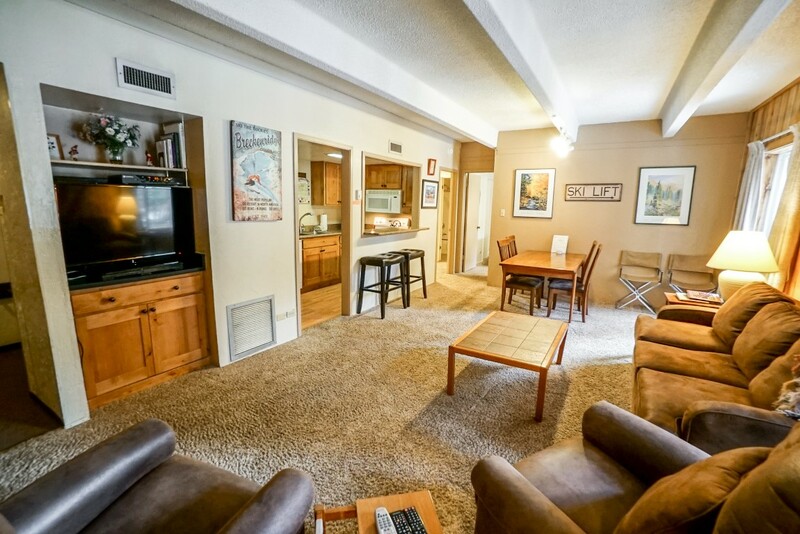 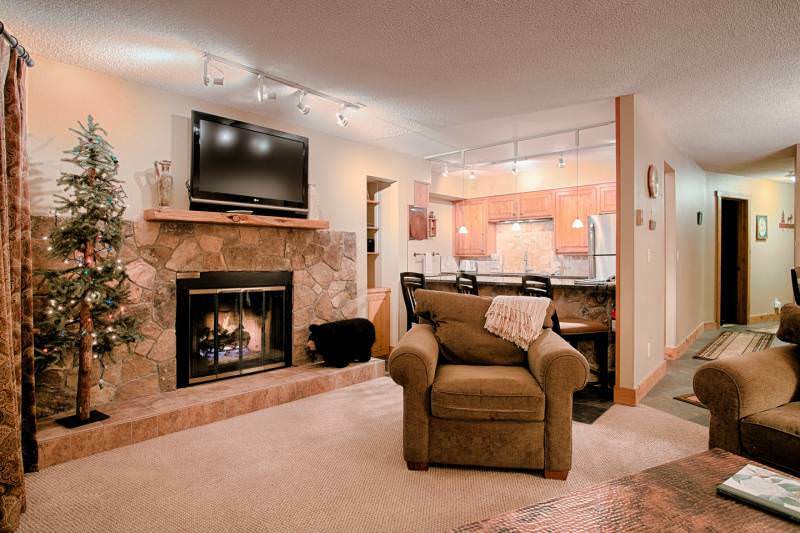 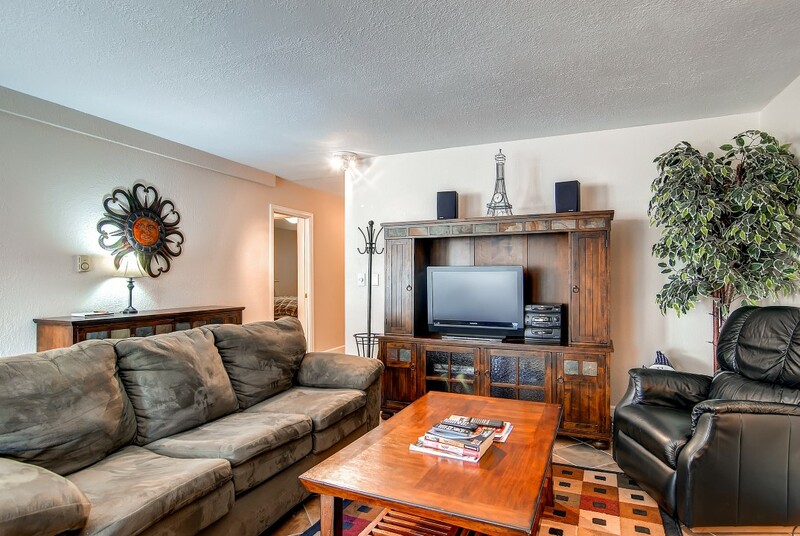 The townhome has a two car heated garage allowing you to stay warm upon your return. 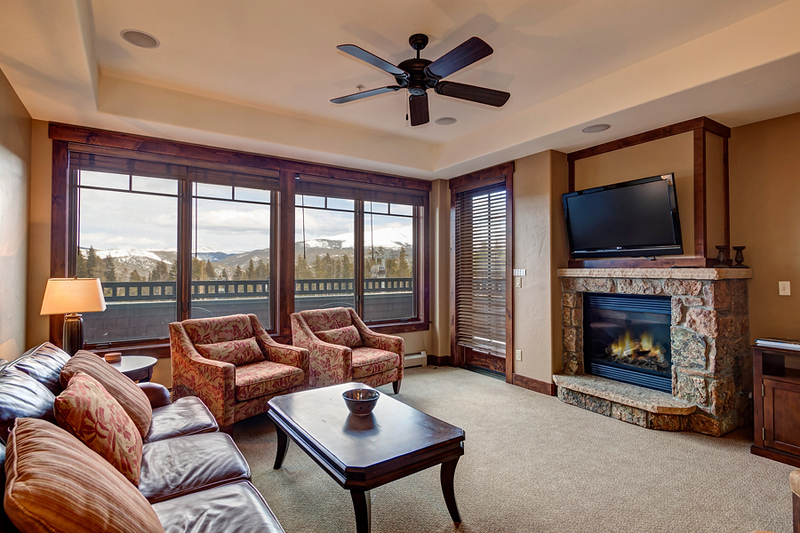 The radiant heating system under the wood and slate floors keeps your family cozy and warm during the winter months. 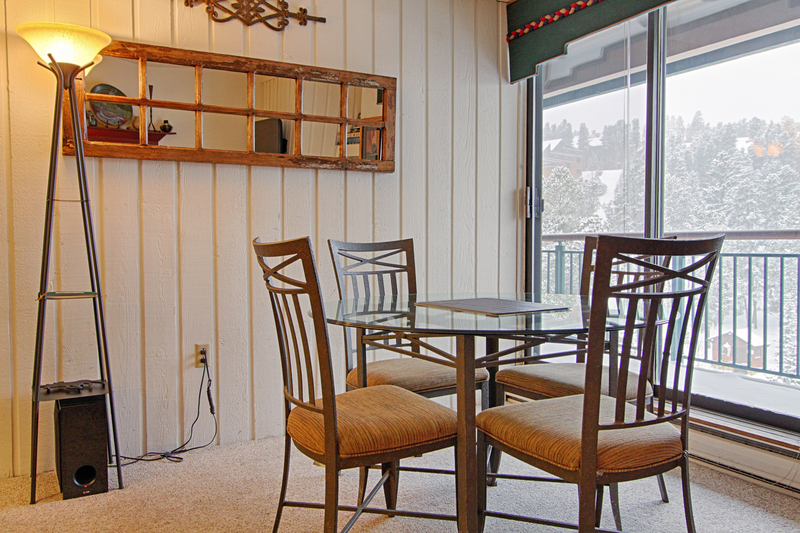 Enjoy using the outdoor propane gas grill located on the patio all year long. 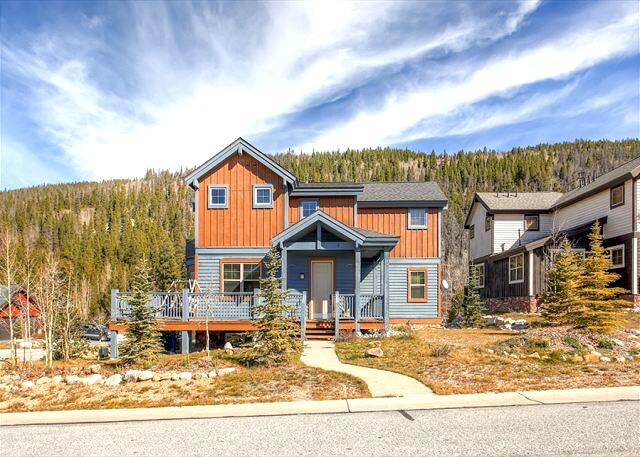 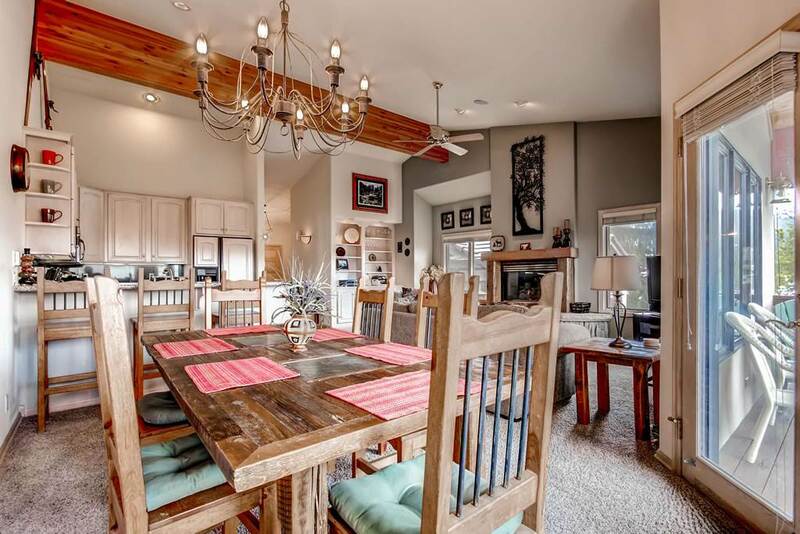 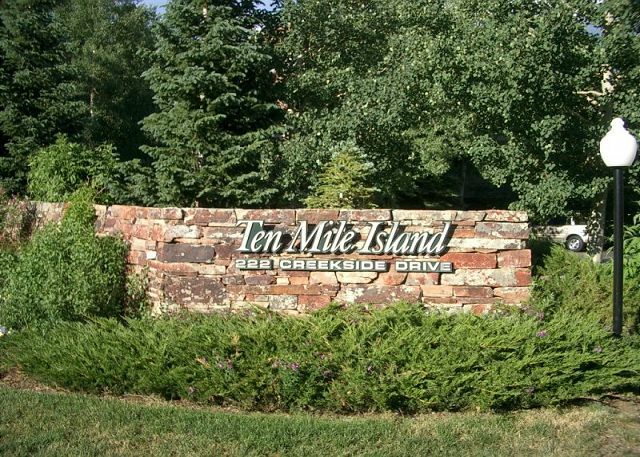 In the summer, use the paved bike/walking trail just minutes from this home that runs from Breckenridge to the town of Frisco and beyond. 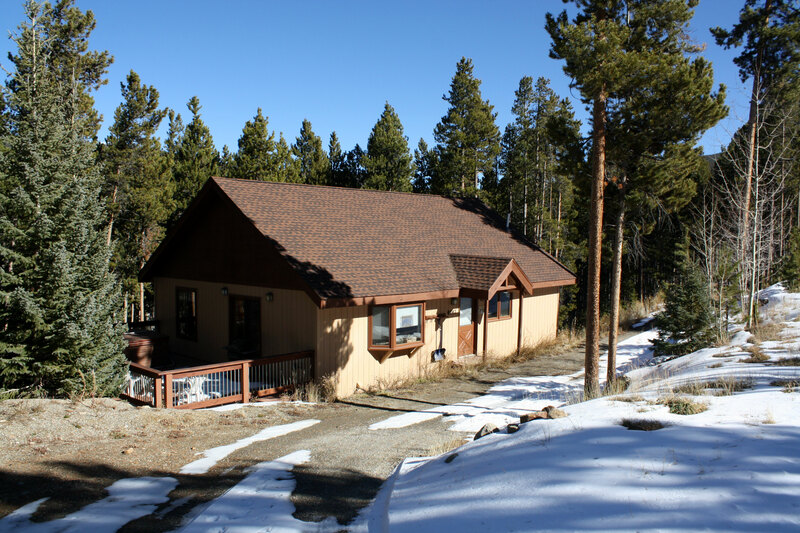 There is also a wide selection of hiking and biking trails that wind through our National Forest. 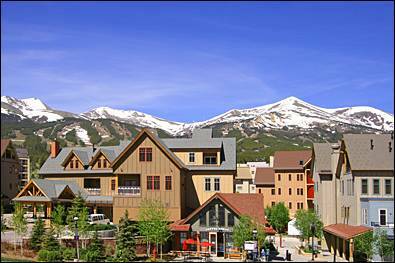 Free Private Shuttle: Take advantage of the free private shuttle service to the slopes or downtown Breckenridge that runs daily during the ski season. 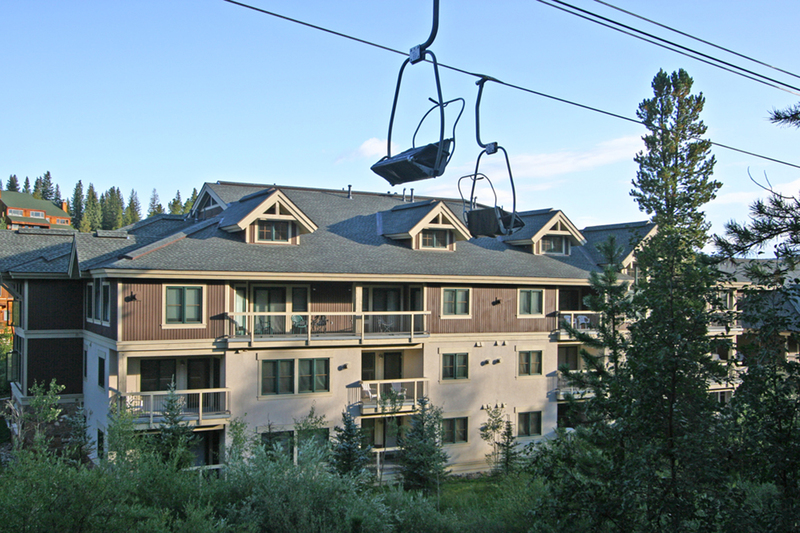 The service picks up every hour at Highland Greens during the morning and from the ski area in the afternoon. 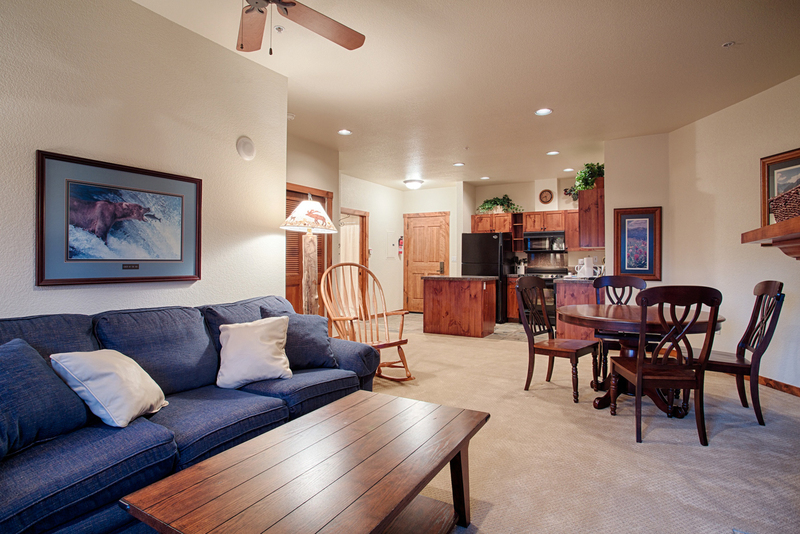 A reservation can be made to take the shuttle to town and return to the townhome in the evenings. 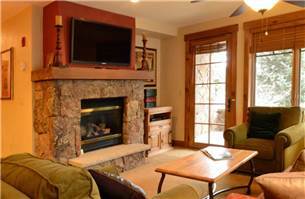 is available on Friday and Saturday evenings from 6:00 pm – 11:00 pm.